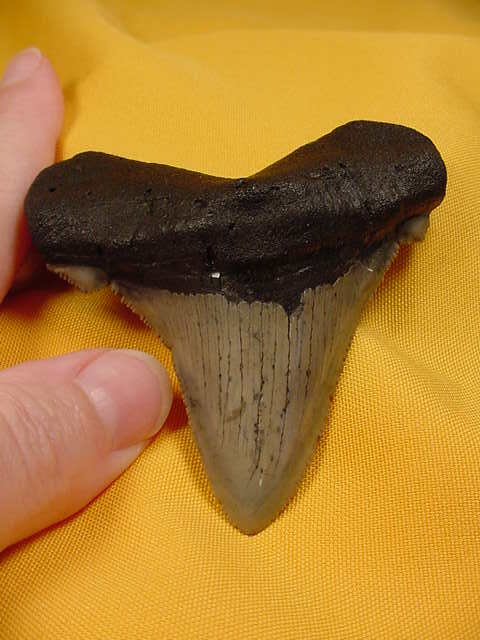 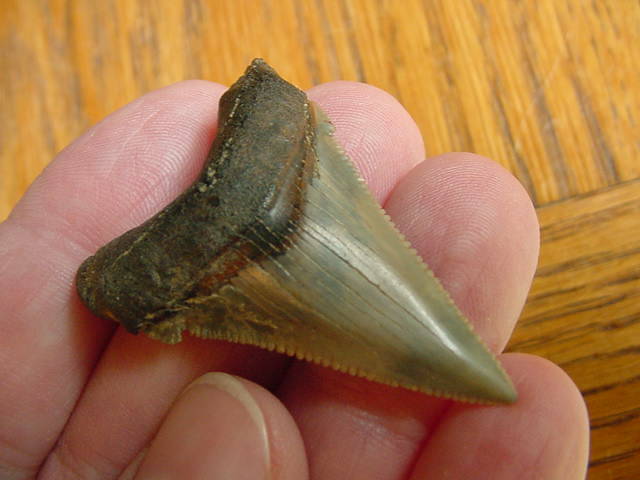 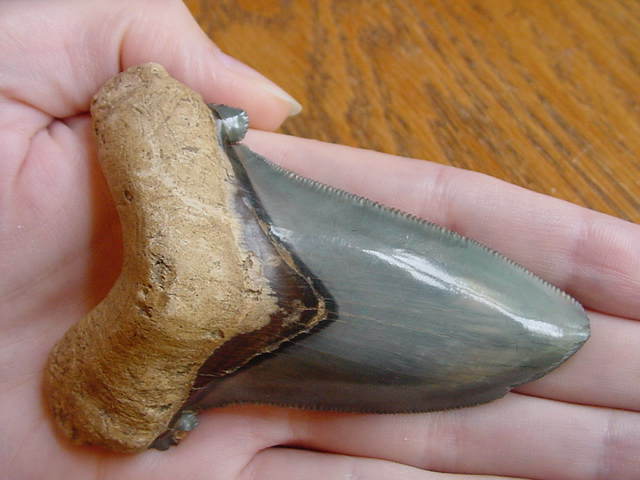 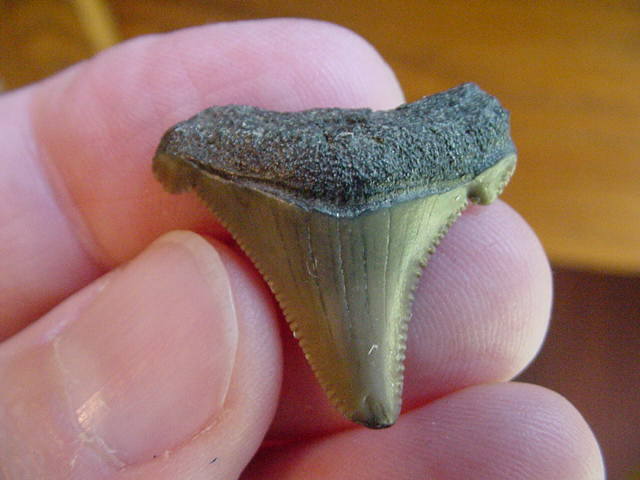 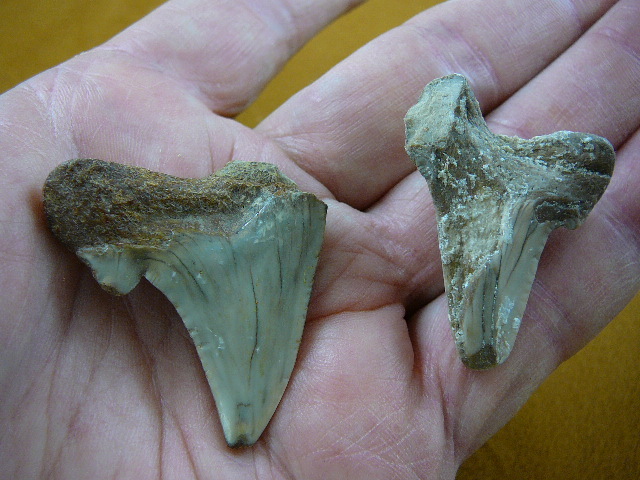 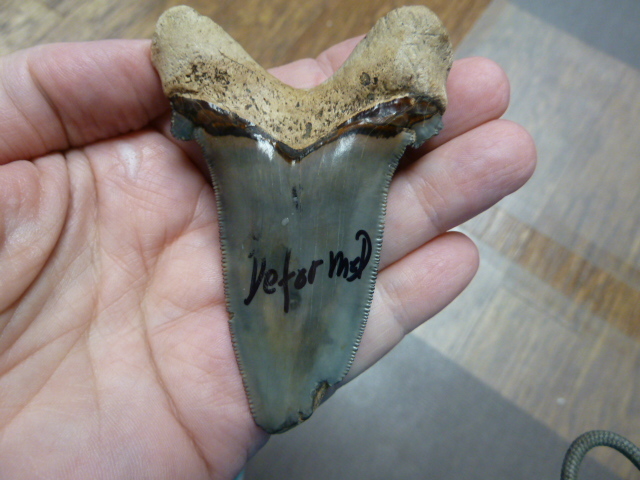 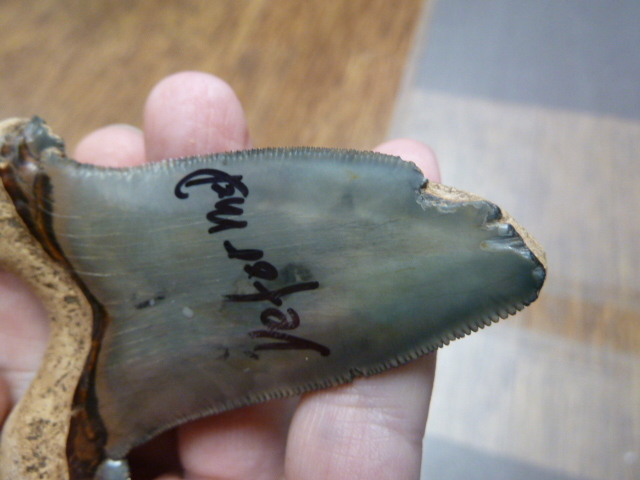 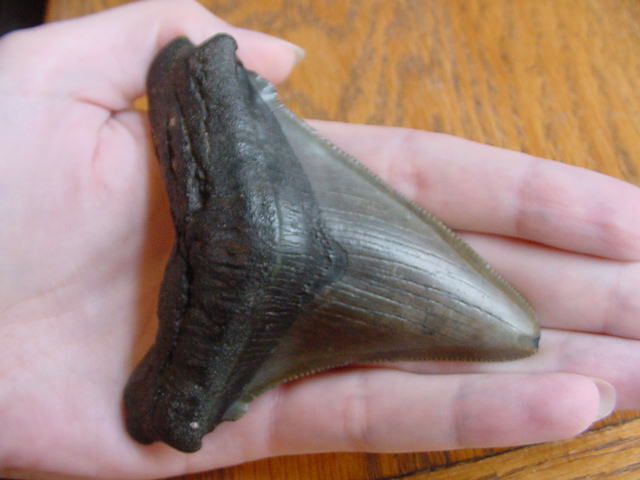 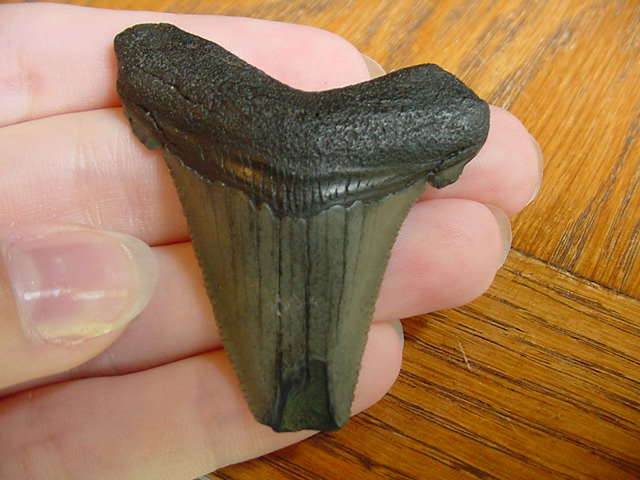 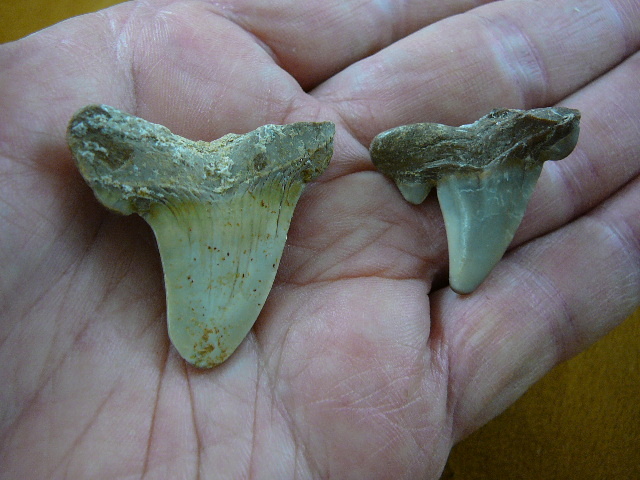 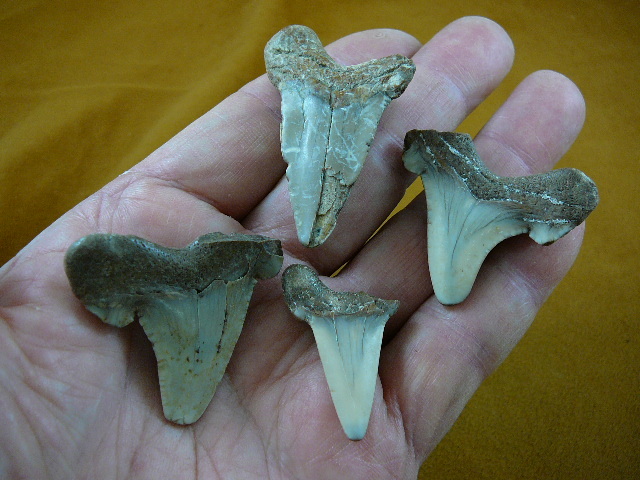 Auriculatus (Father of Megalodon) shark teeth are actually smaller than the megalodon; teeth are identified from the side "cusps" you will notice on either side near the gum line; up to 50 million years old. 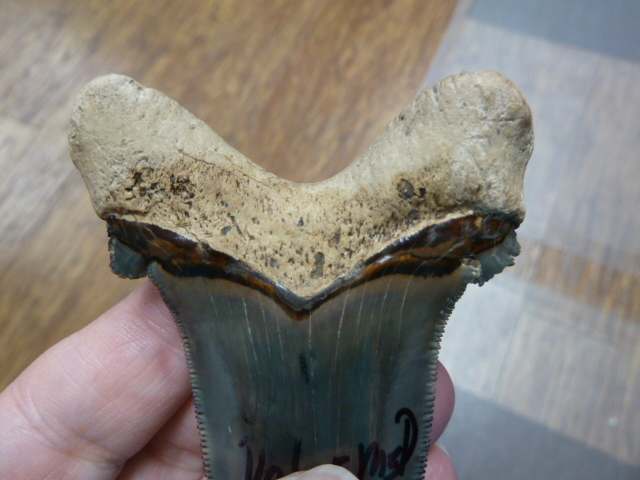 "Deformed" in felt tip marker on back will scrub off. 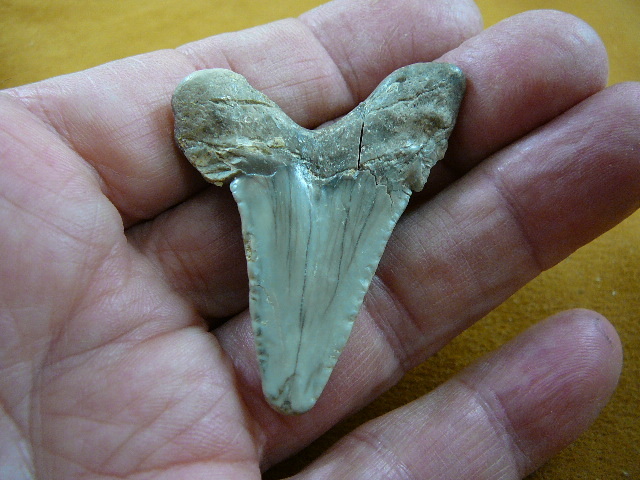 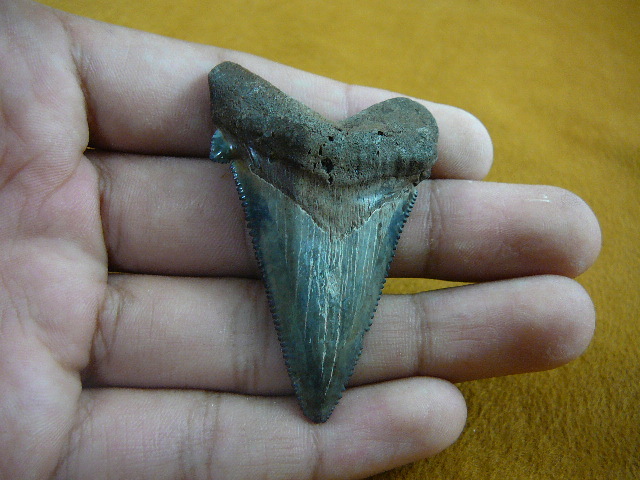 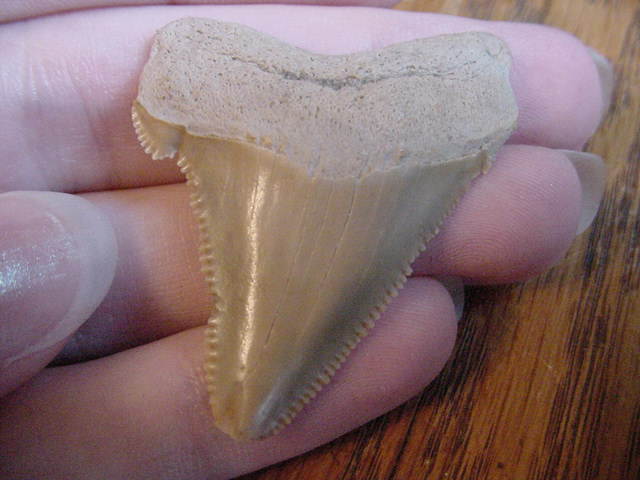 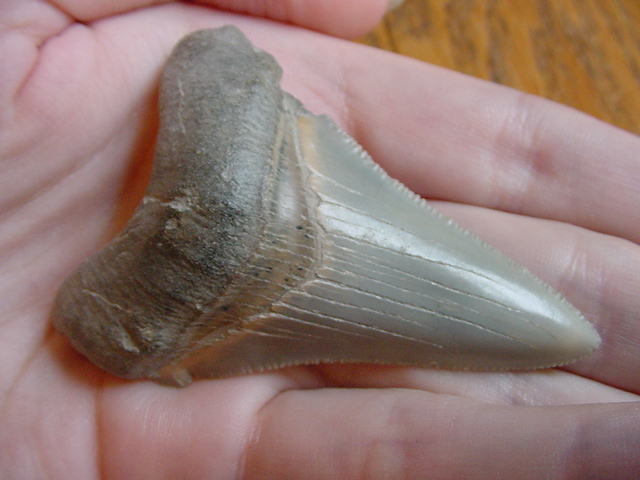 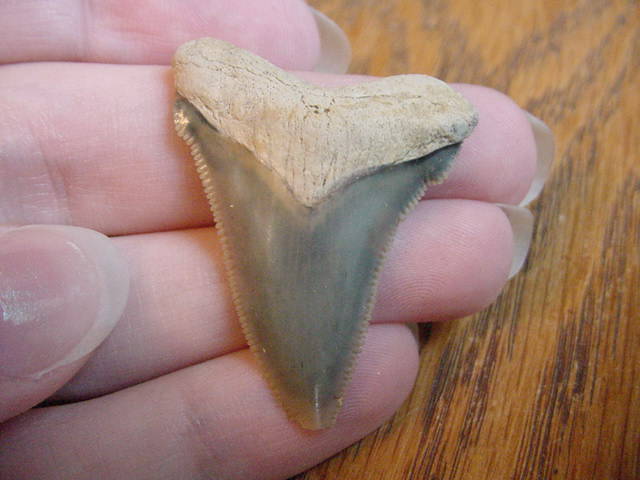 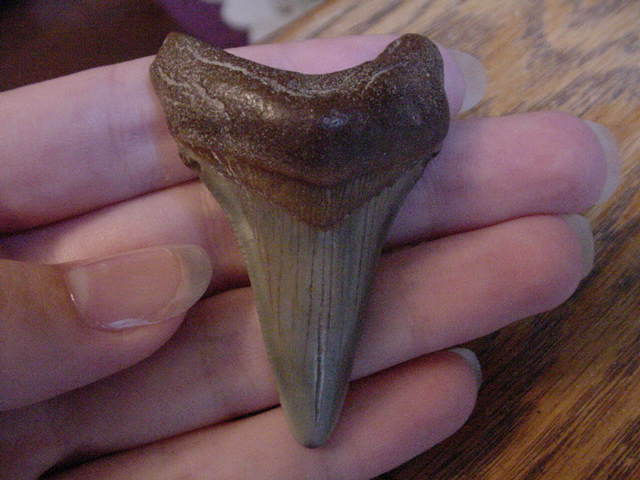 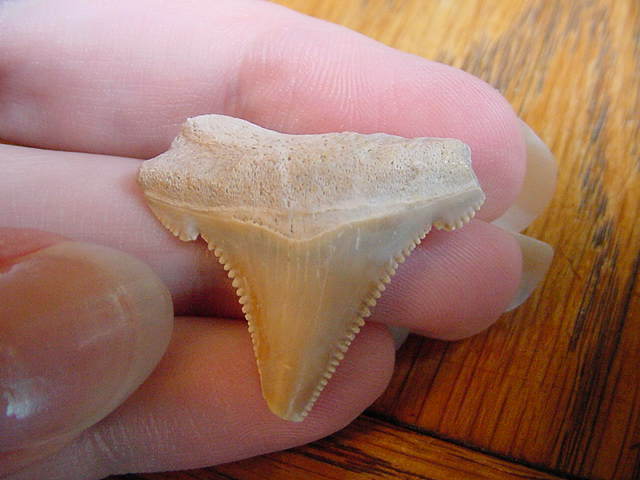 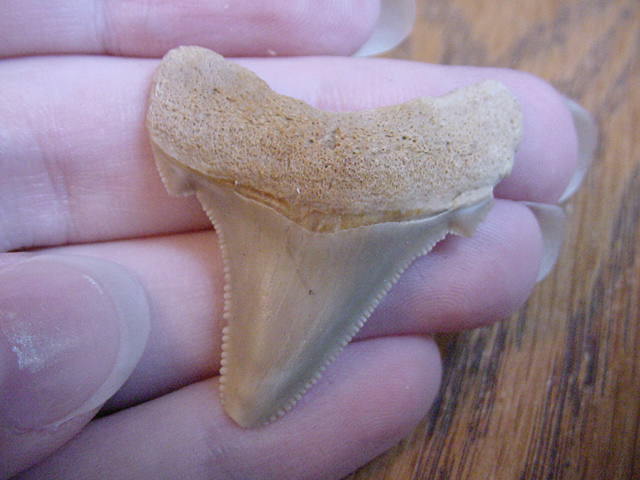 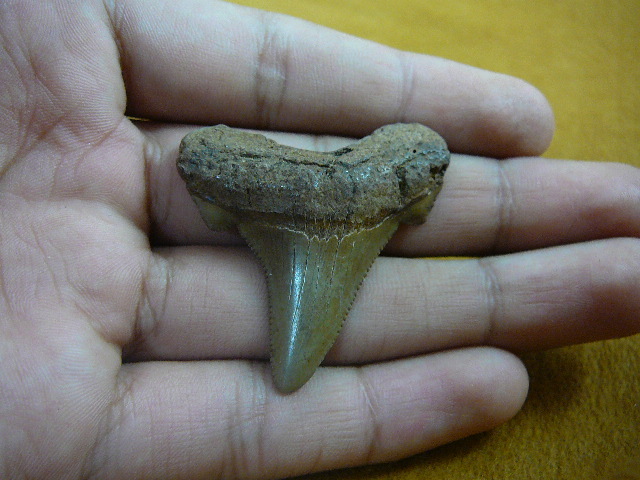 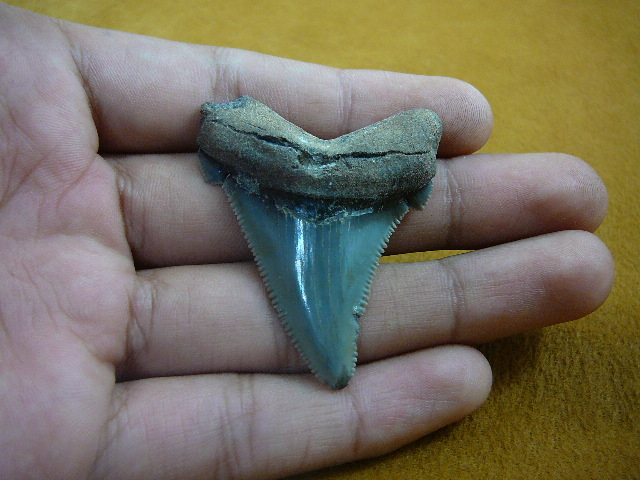 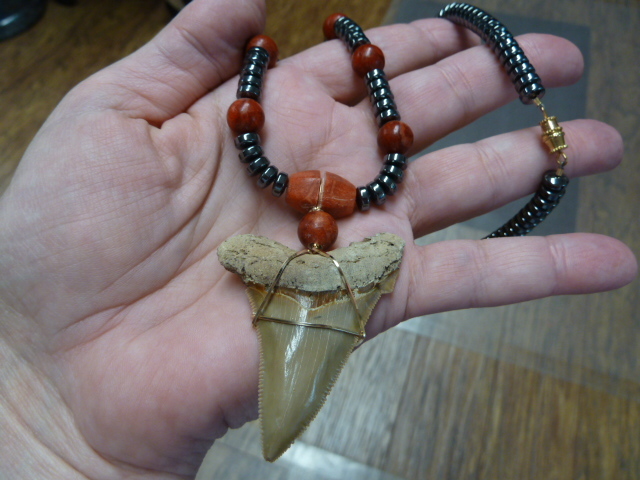 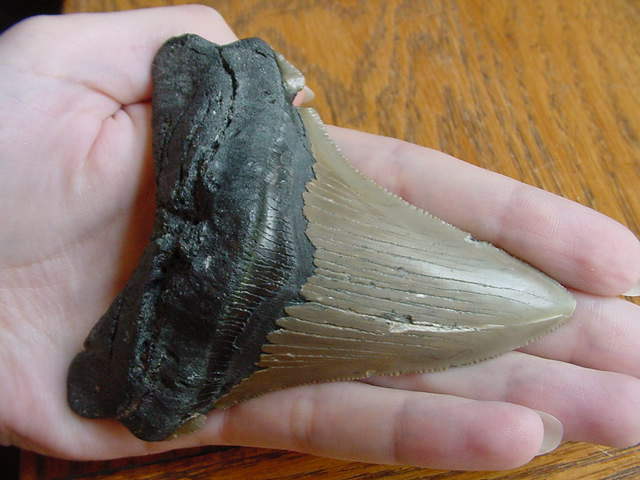 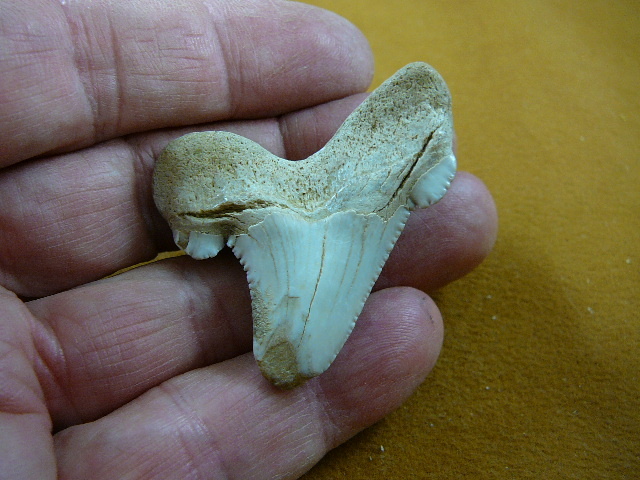 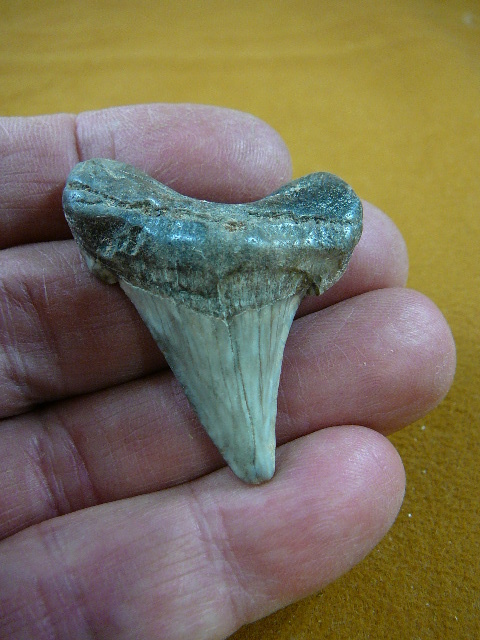 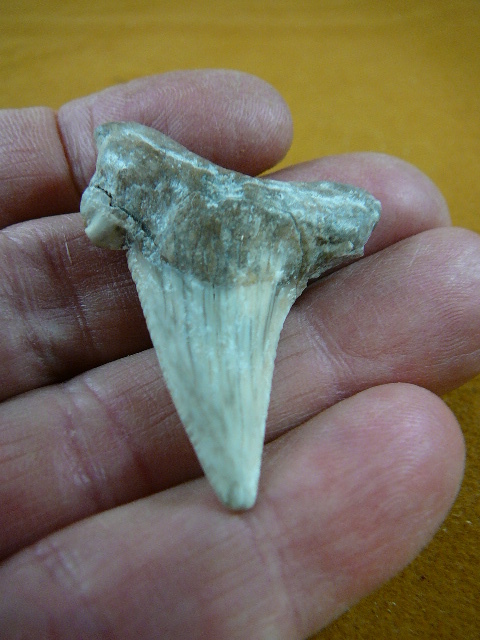 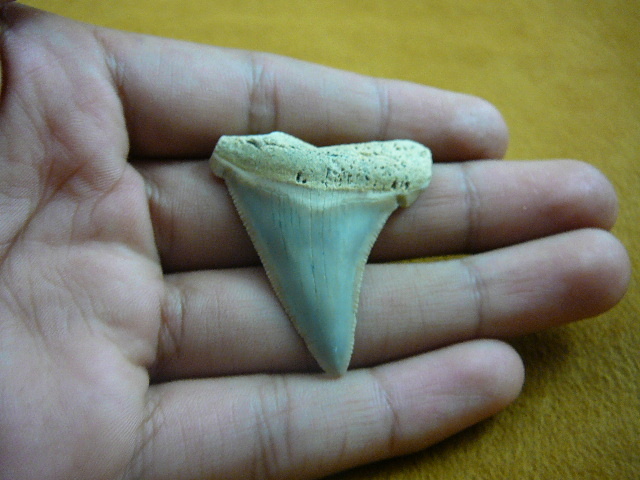 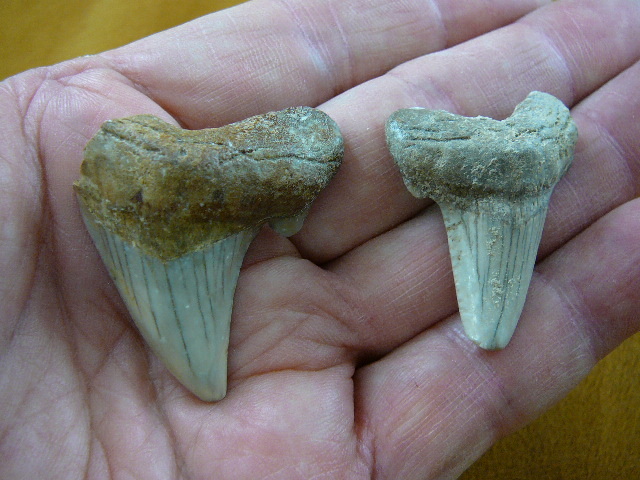 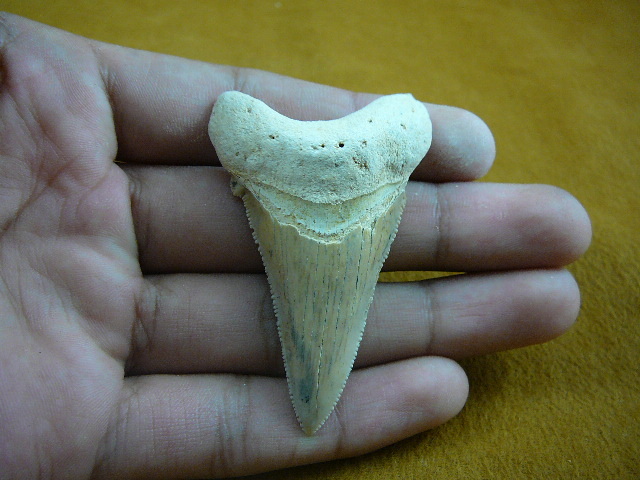 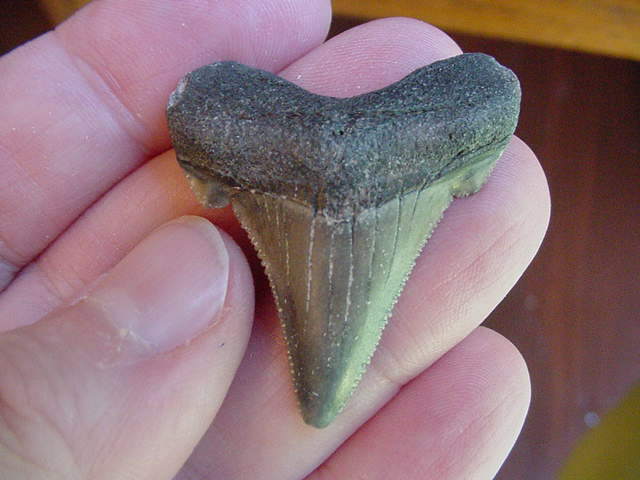 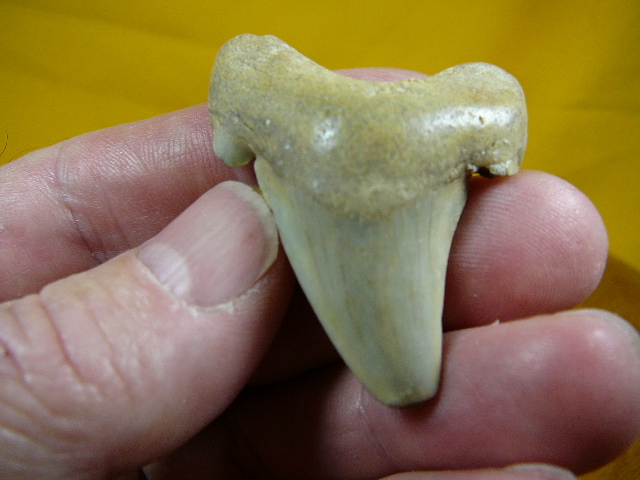 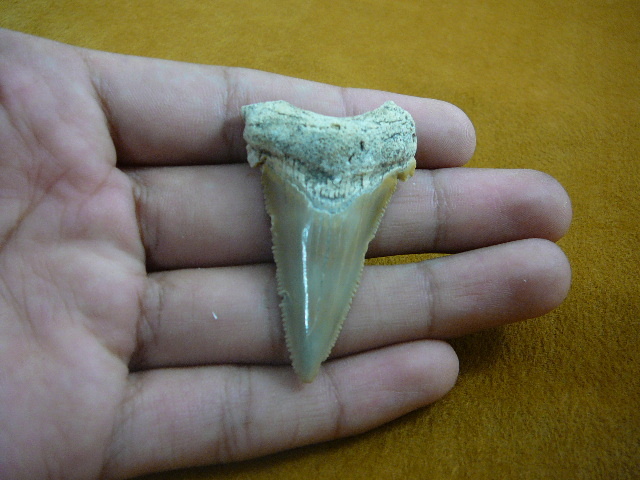 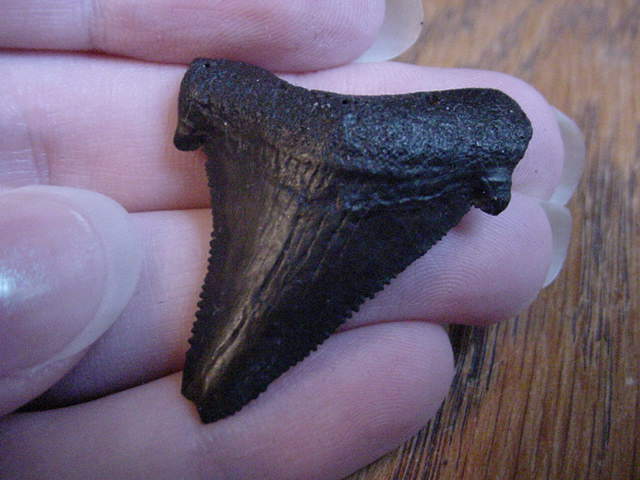 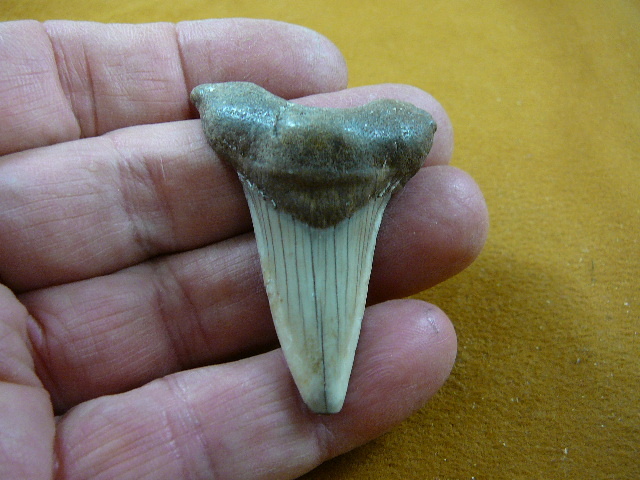 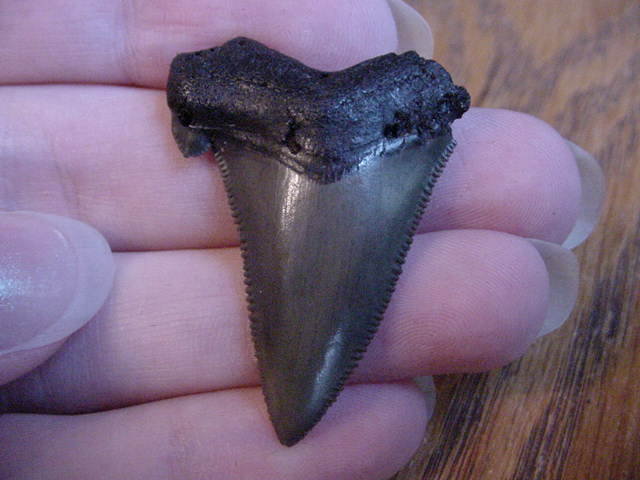 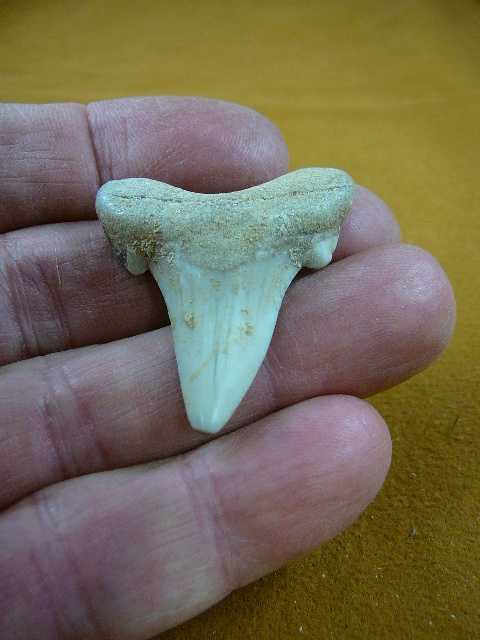 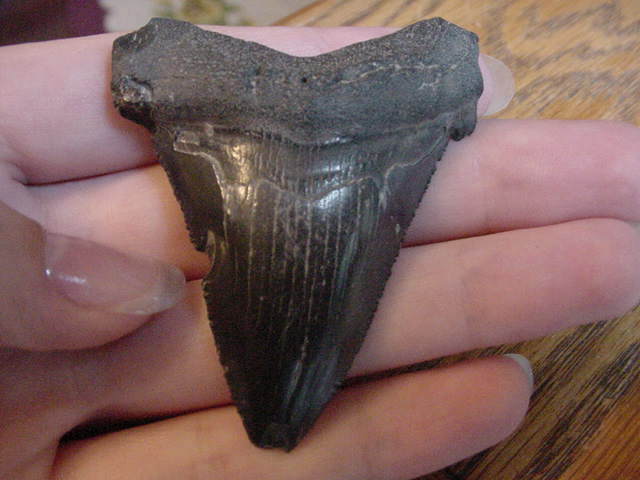 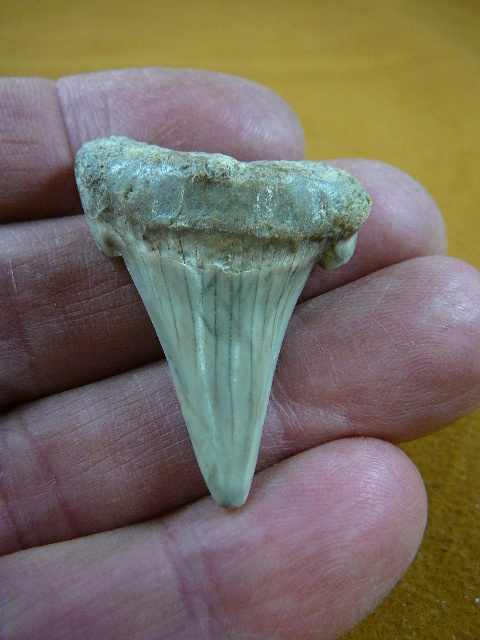 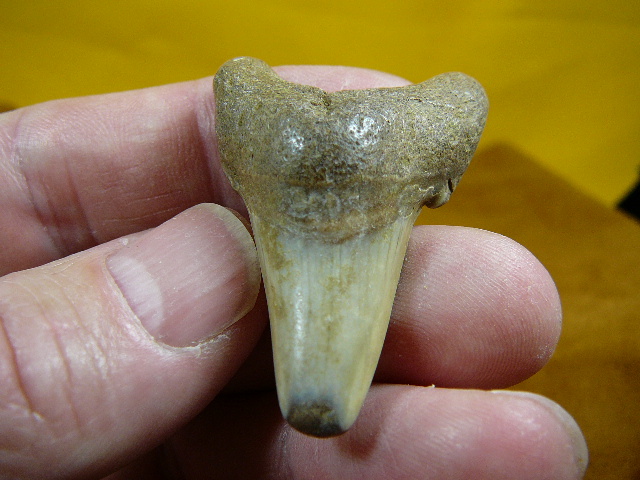 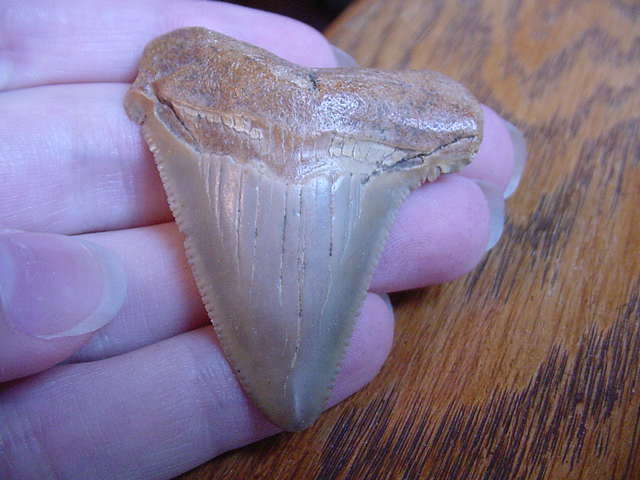 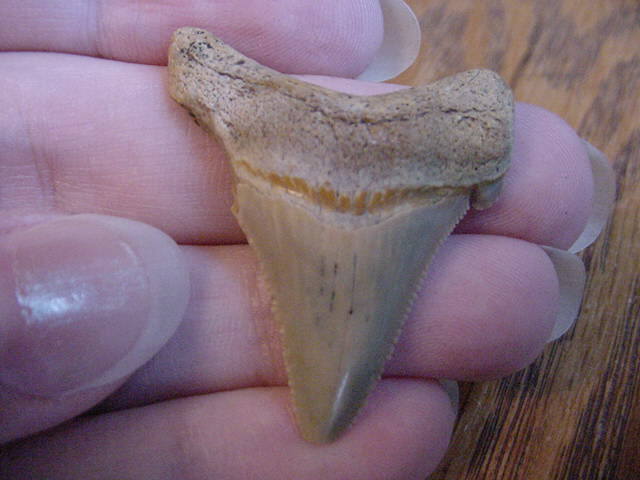 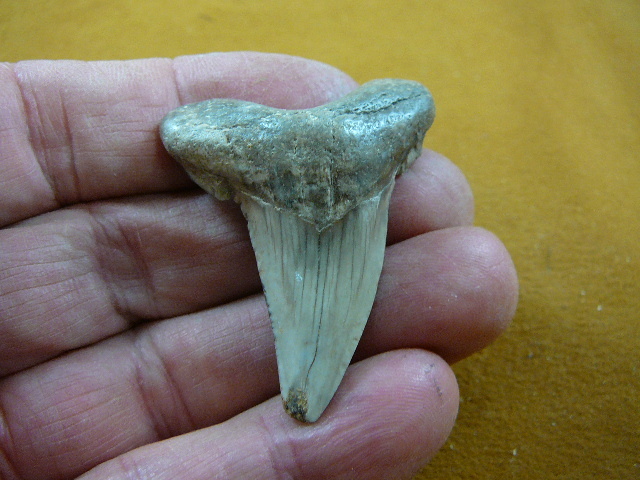 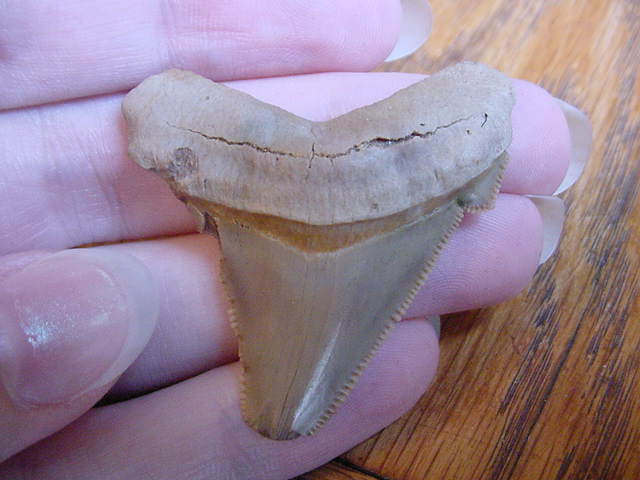 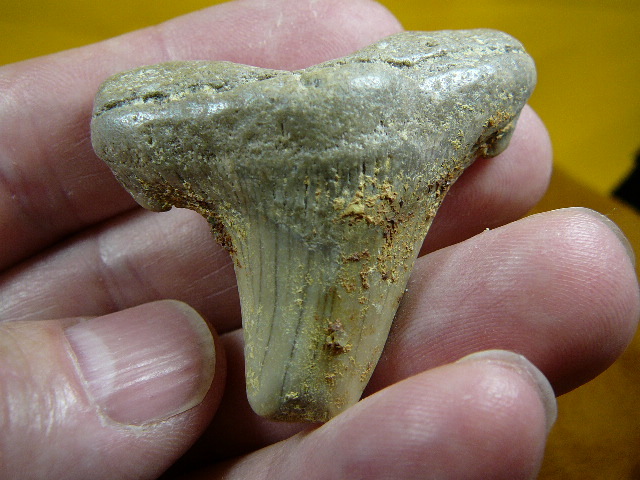 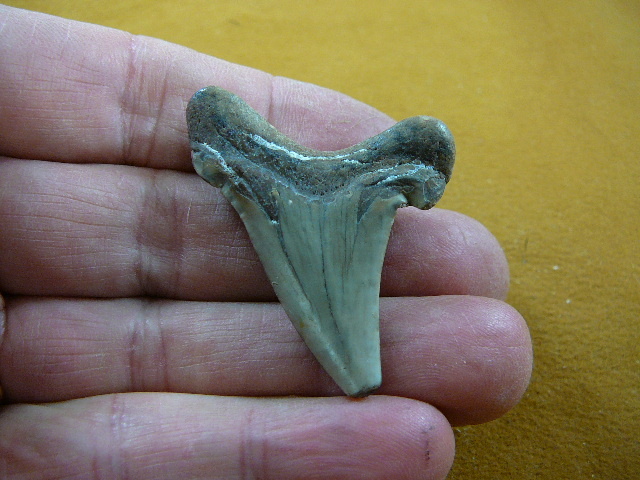 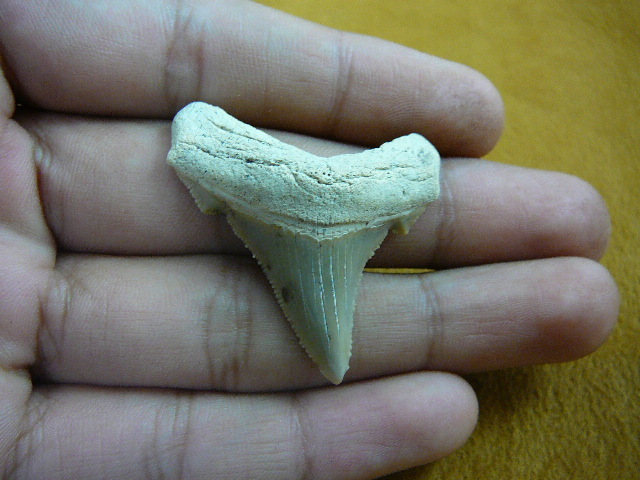 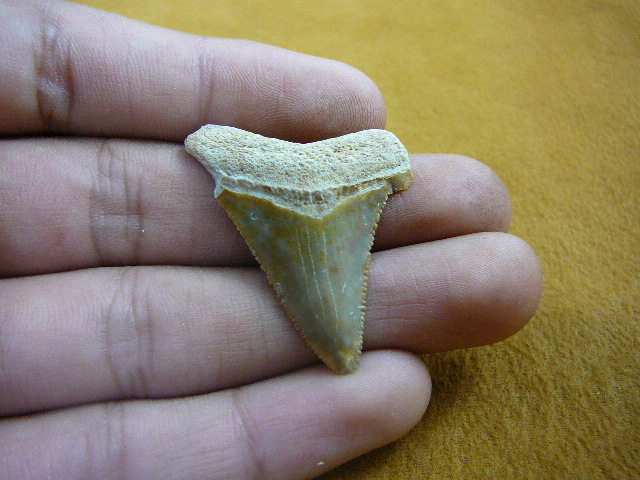 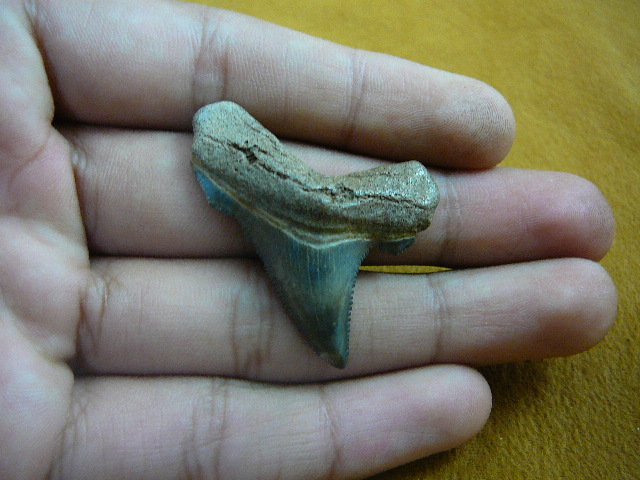 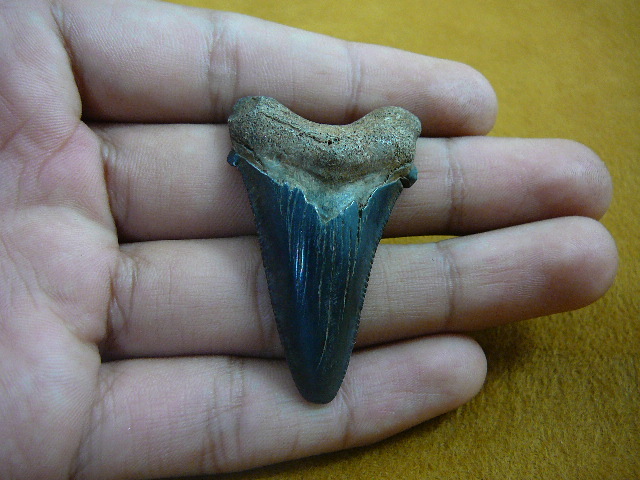 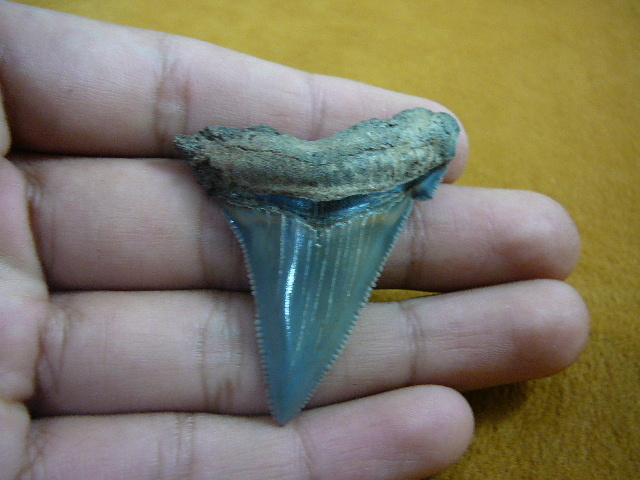 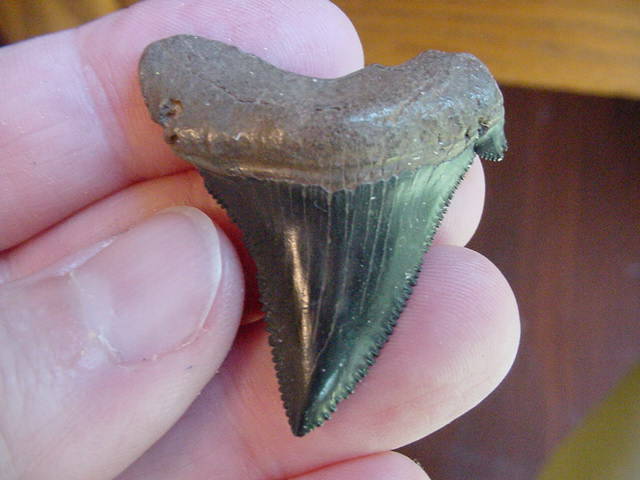 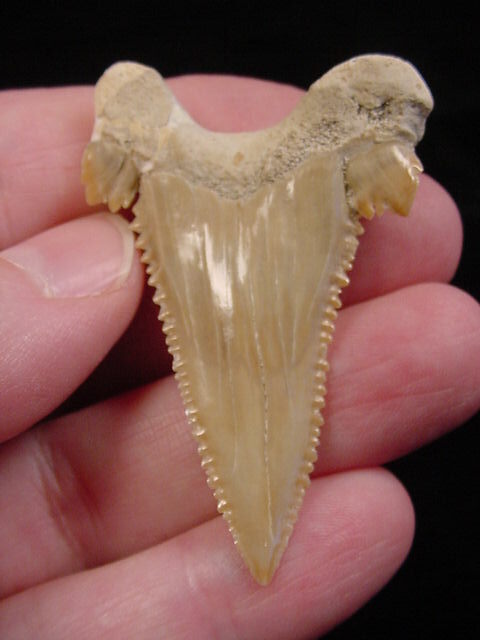 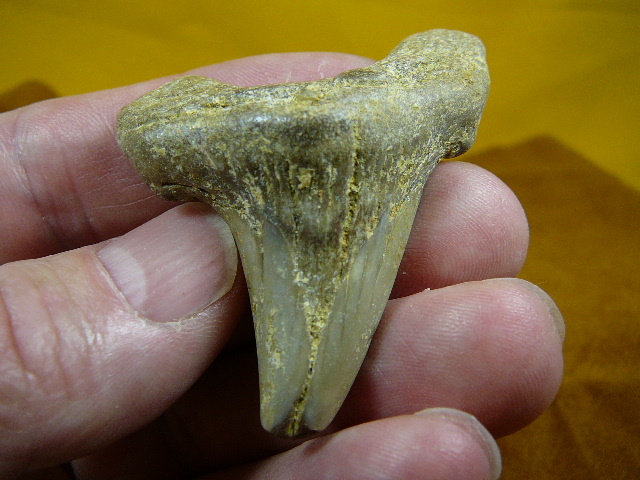 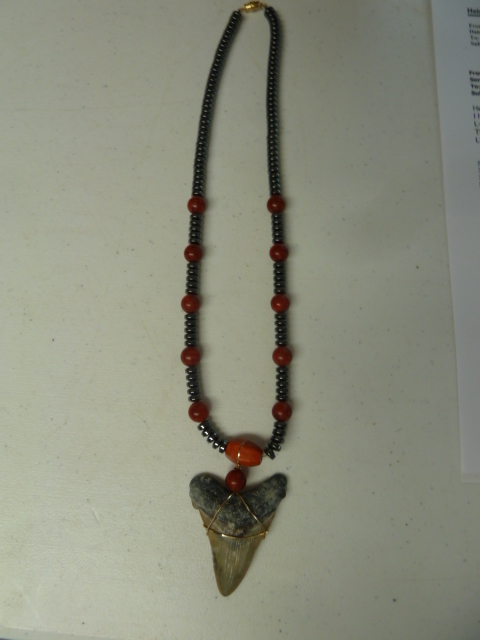 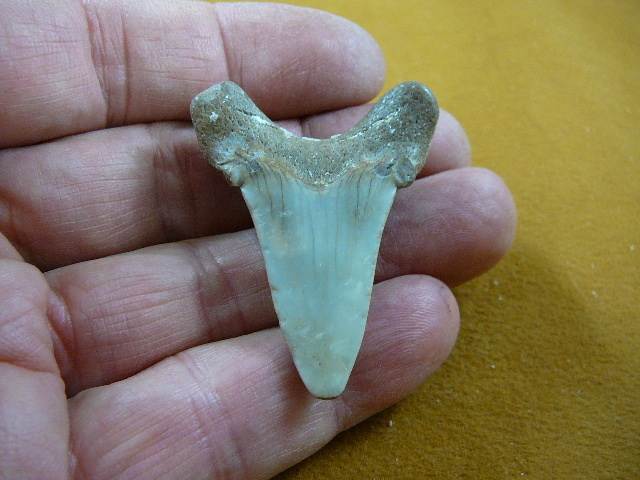 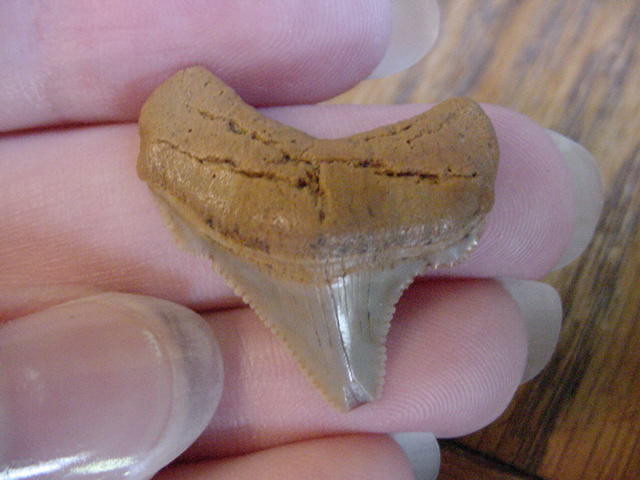 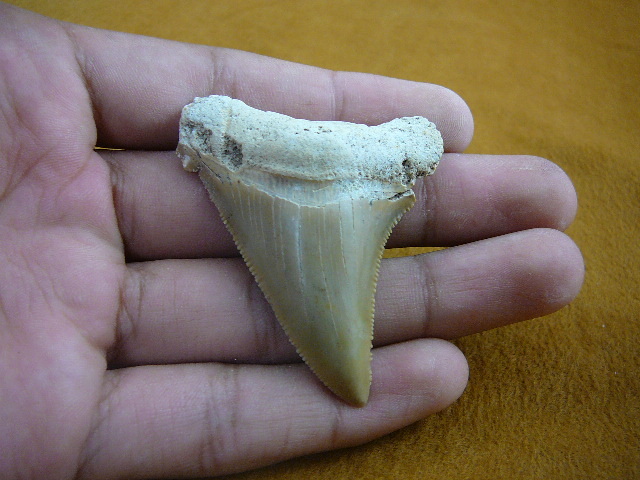 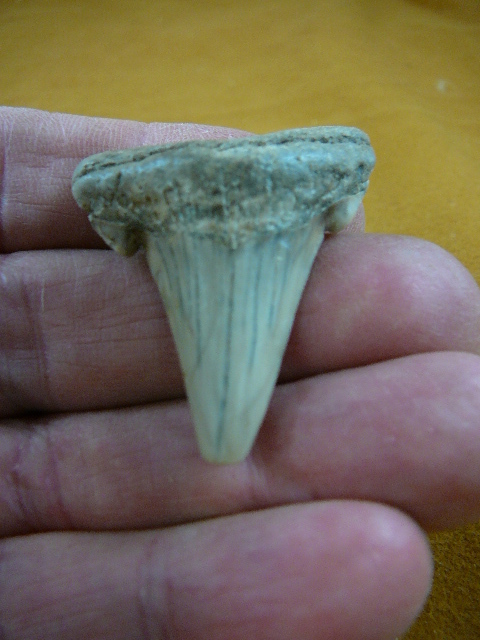 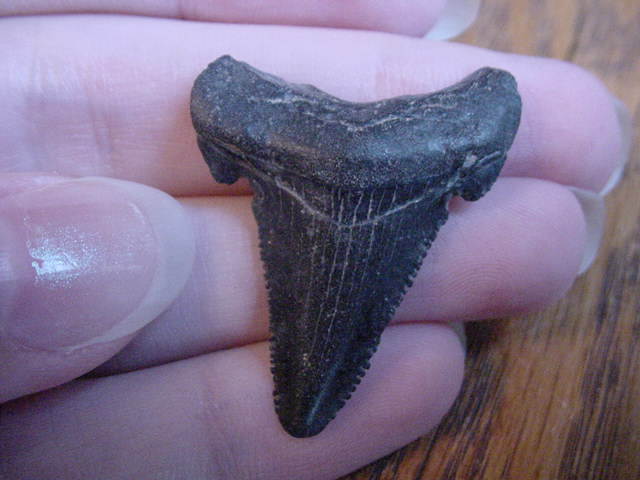 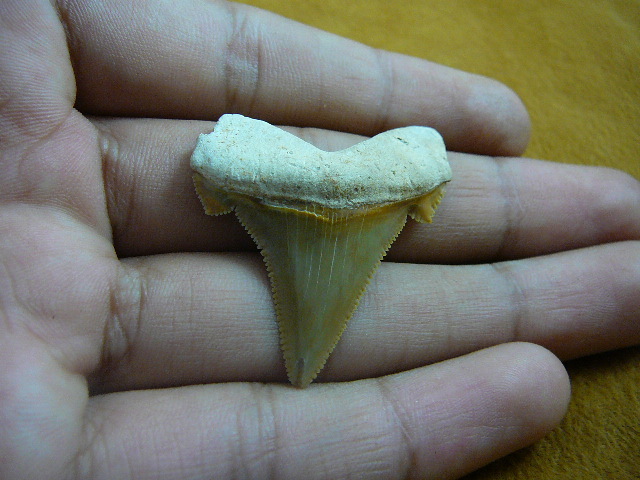 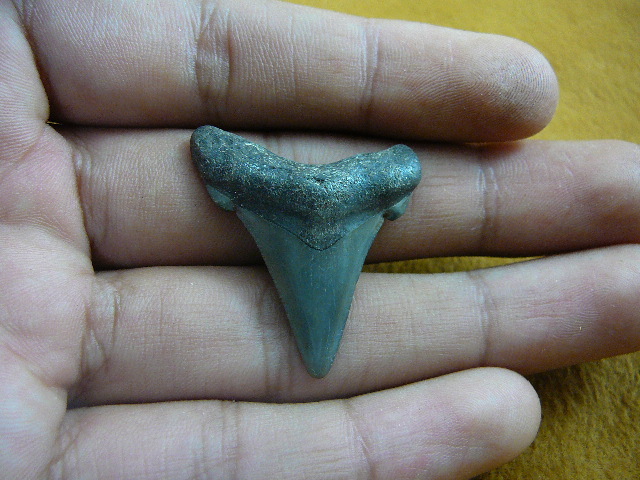 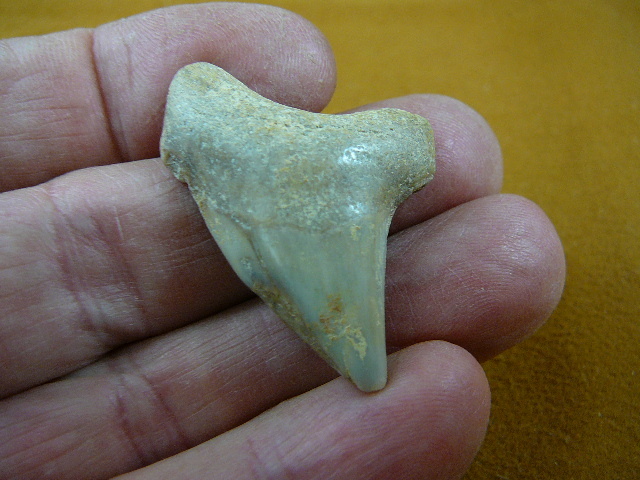 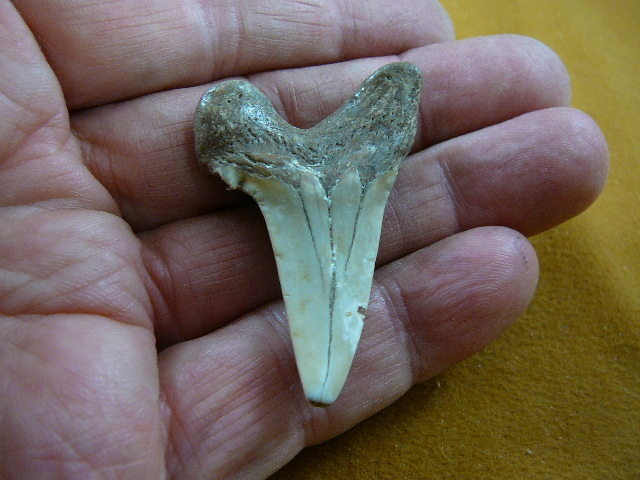 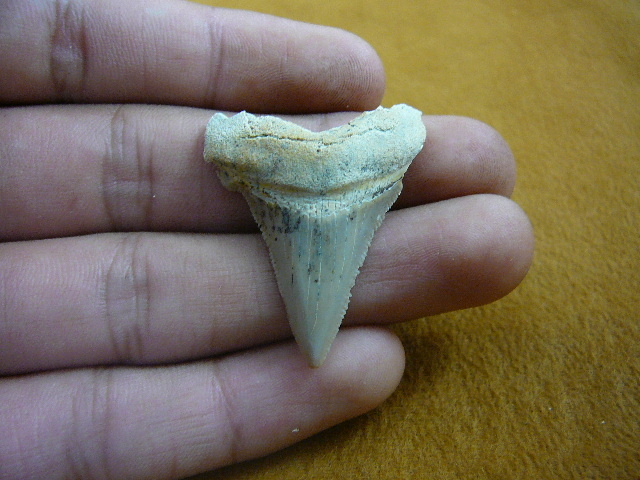 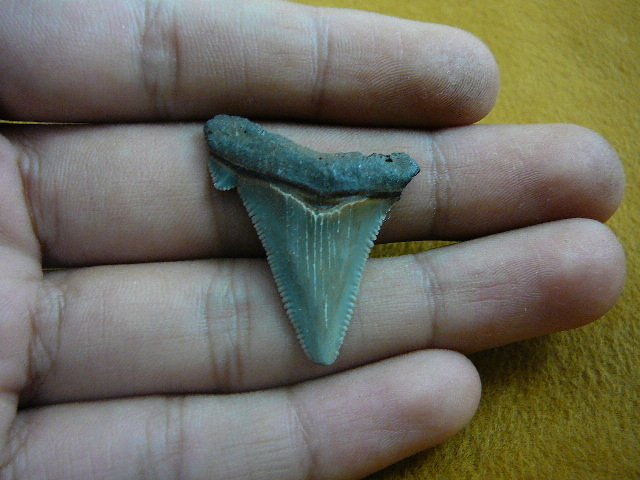 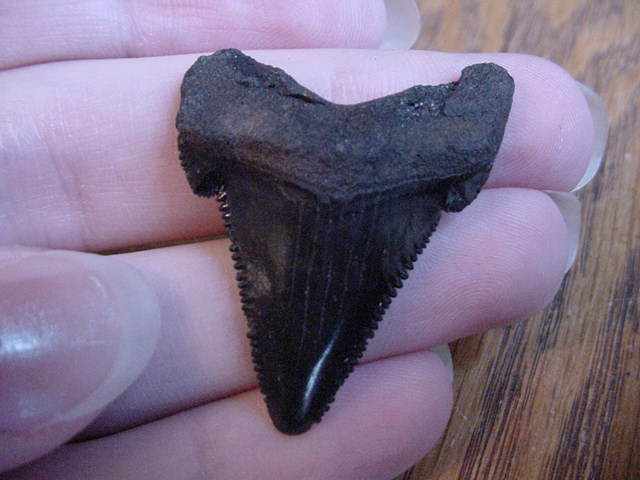 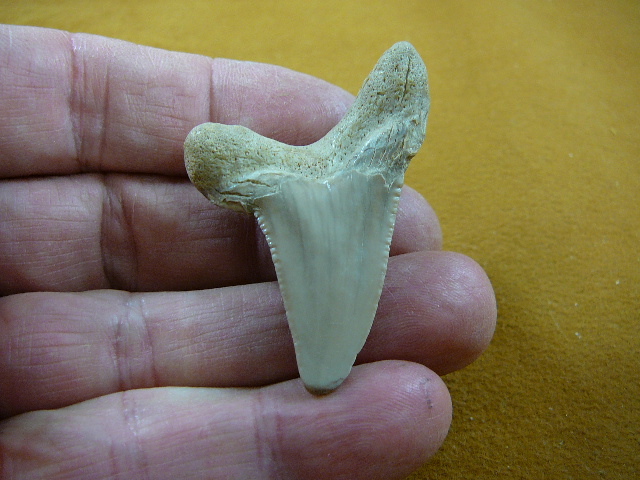 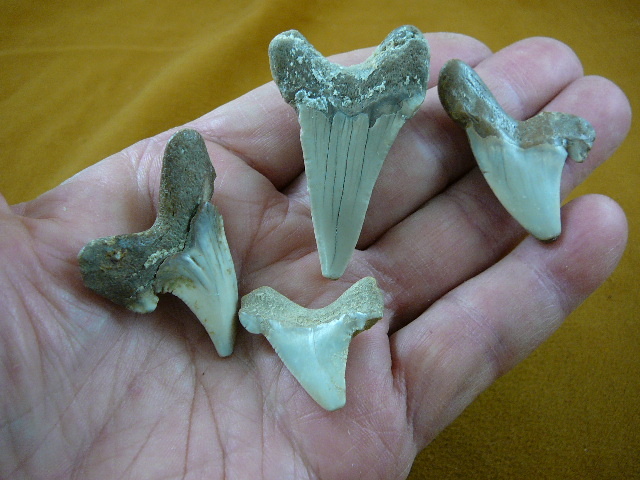 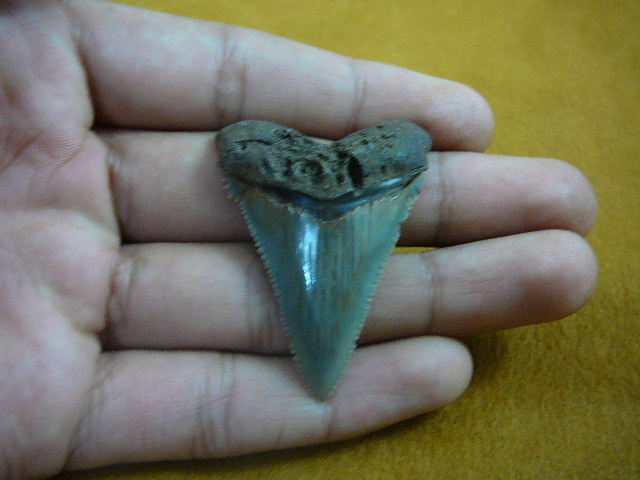 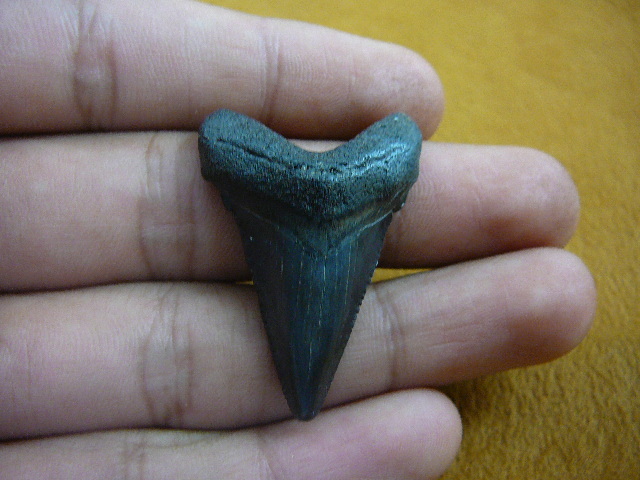 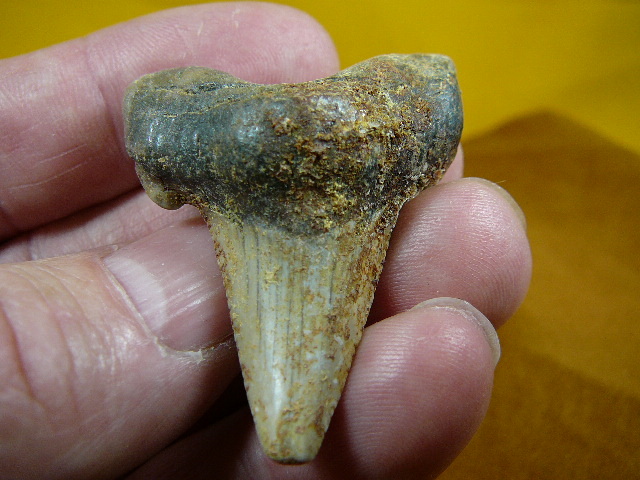 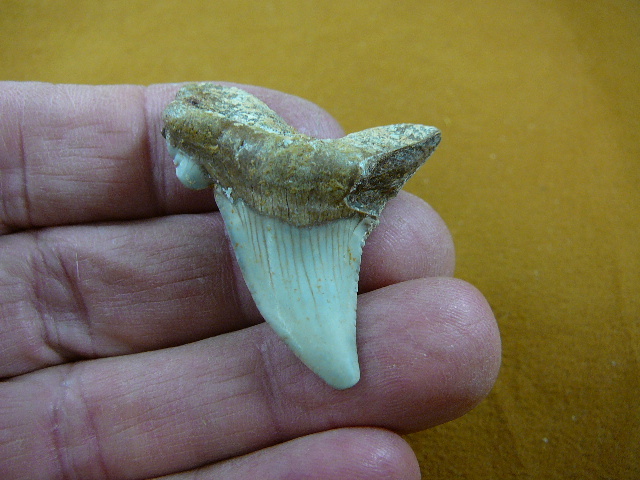 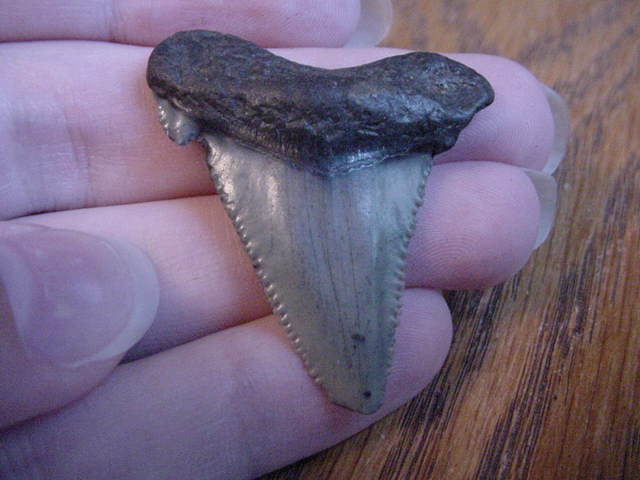 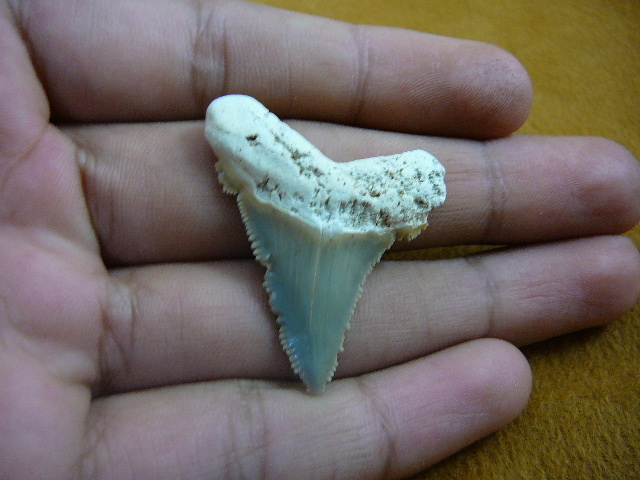 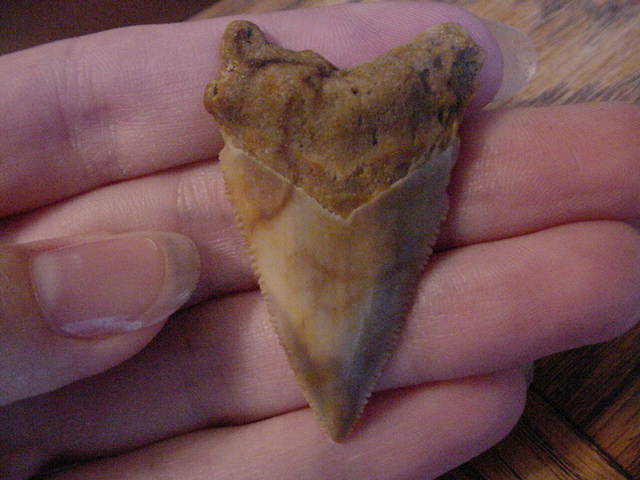 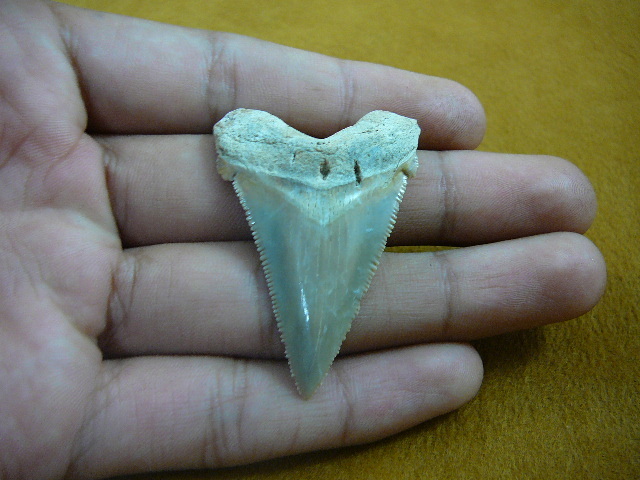 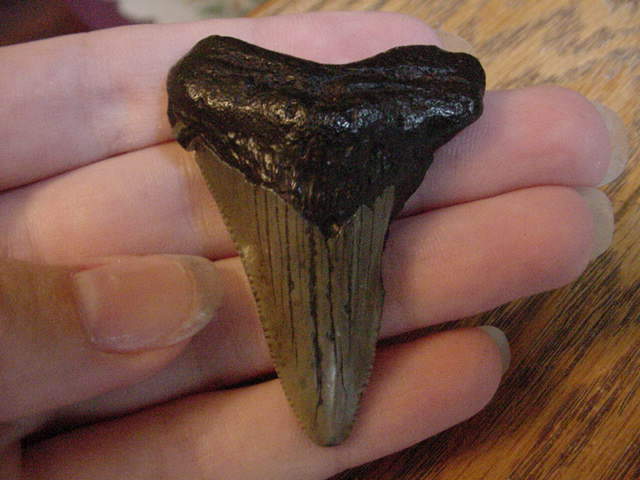 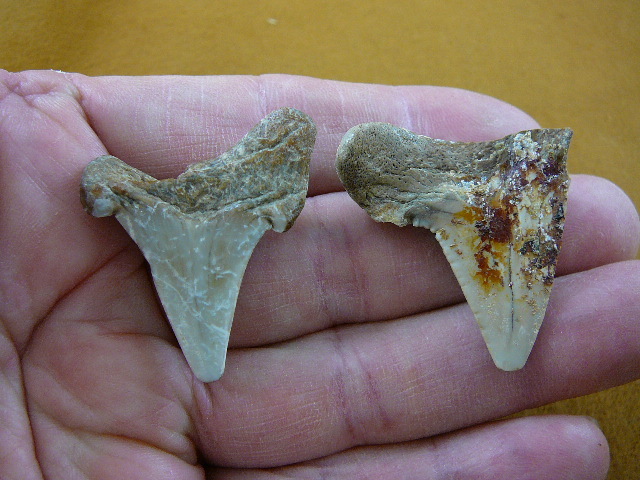 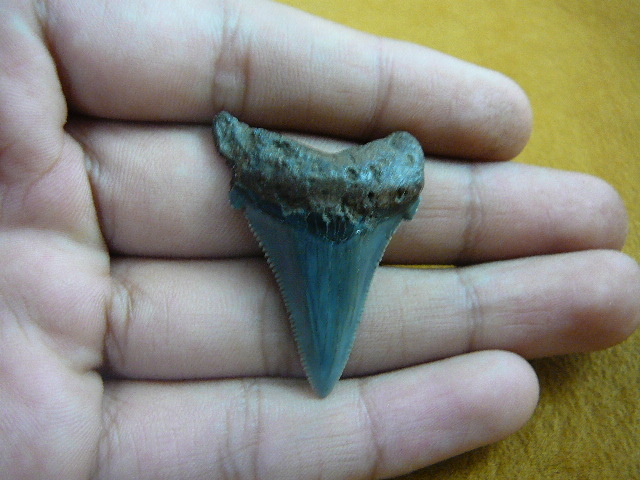 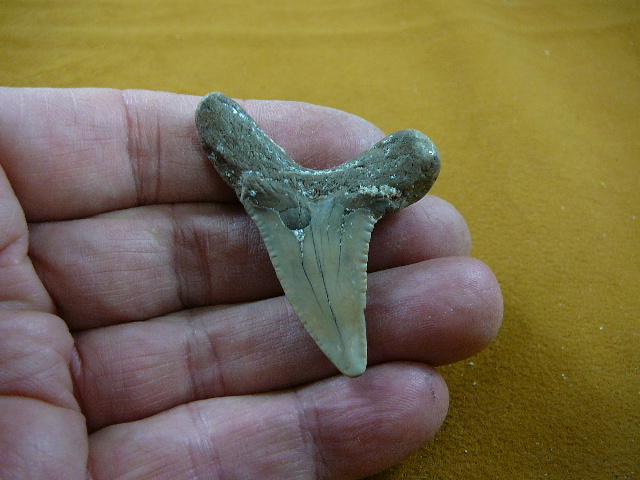 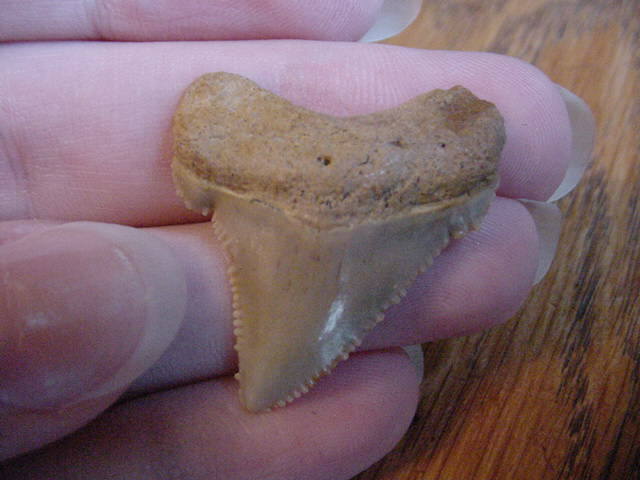 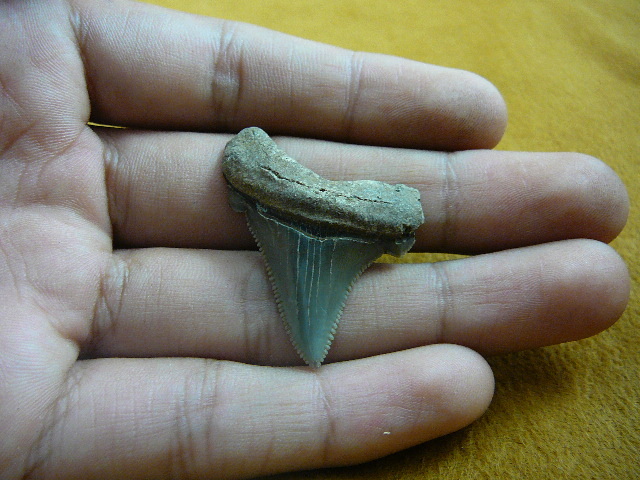 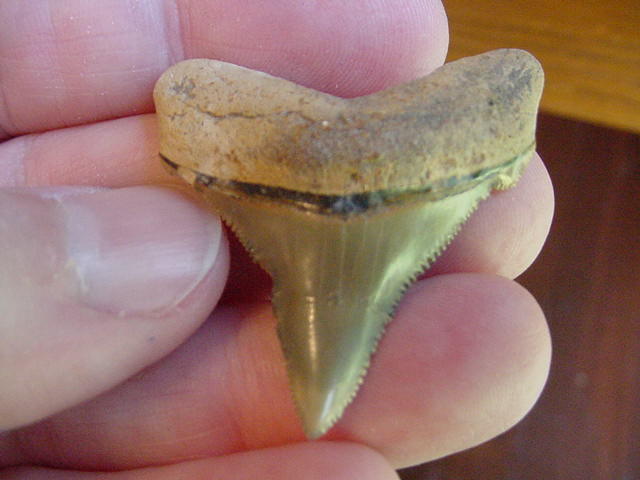 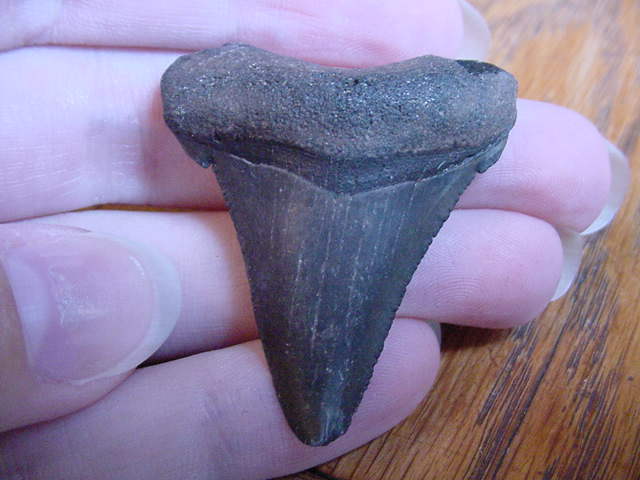 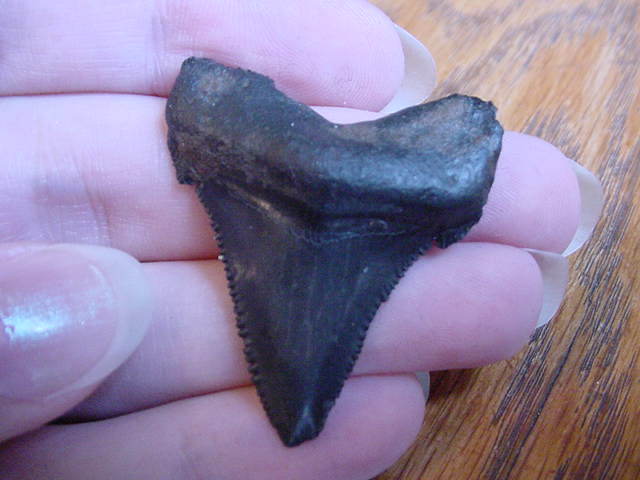 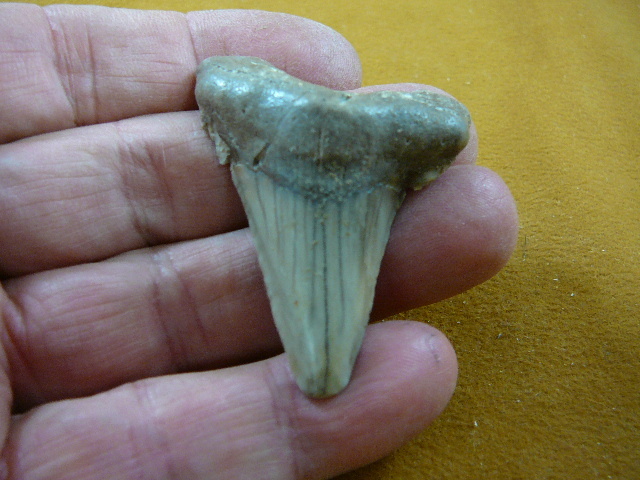 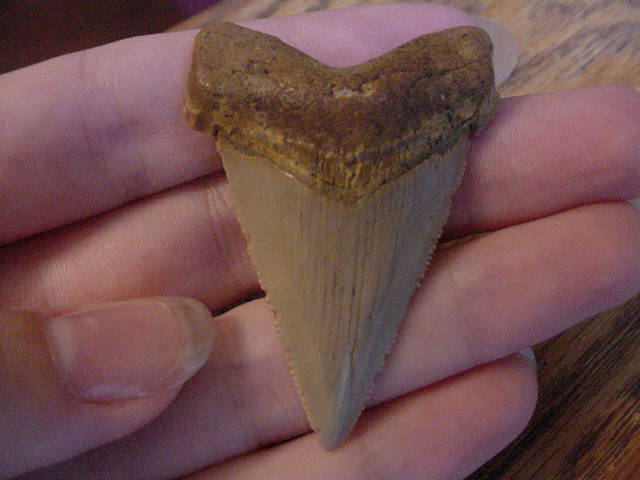 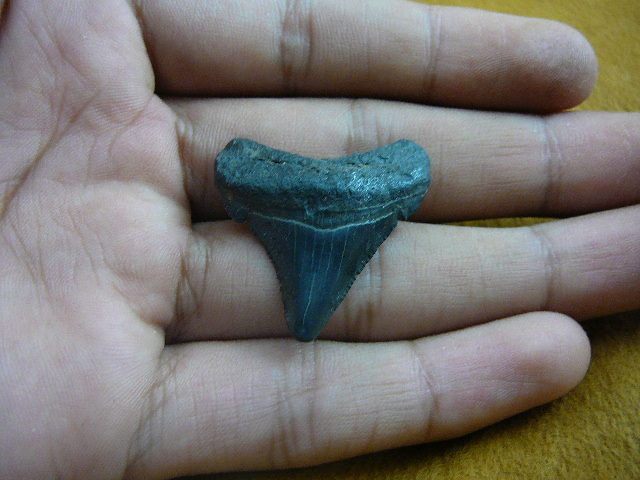 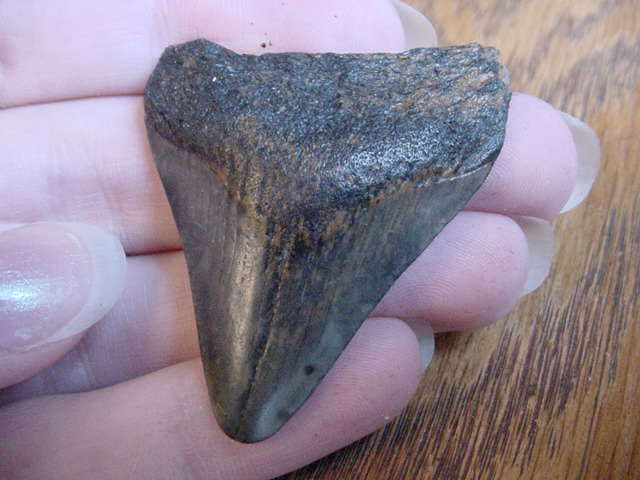 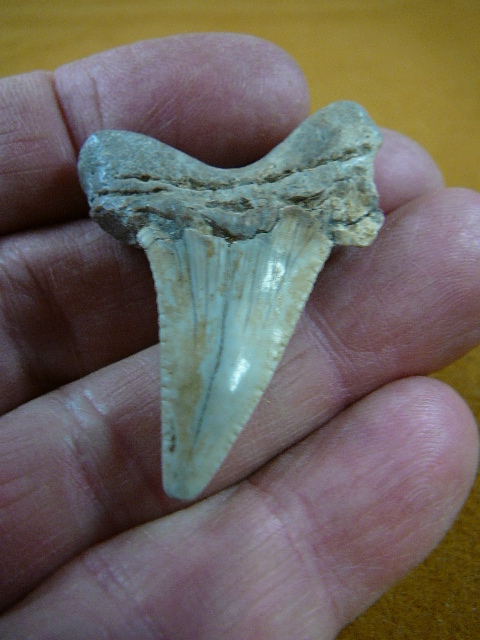 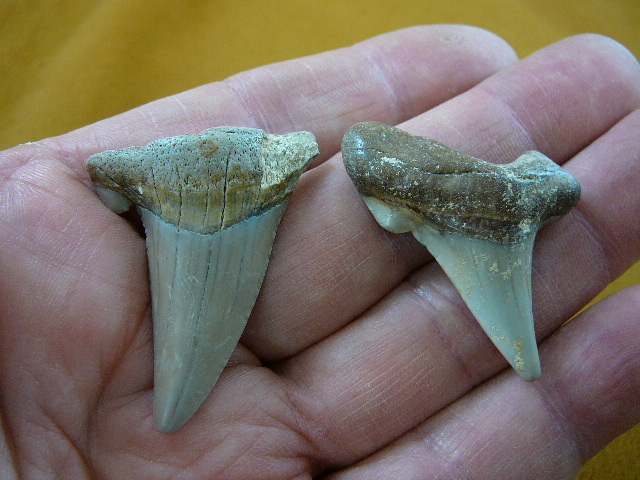 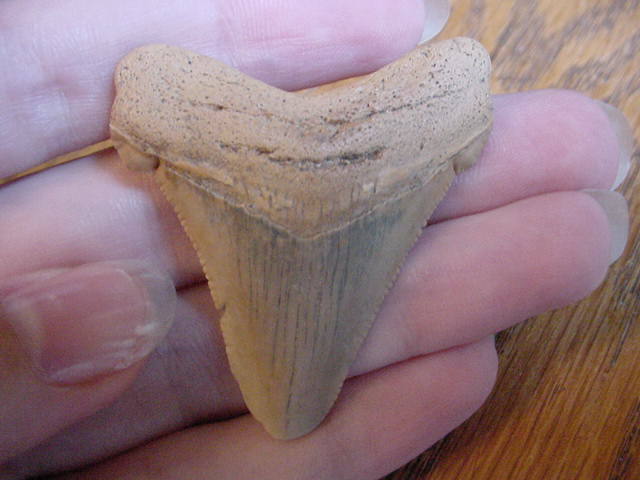 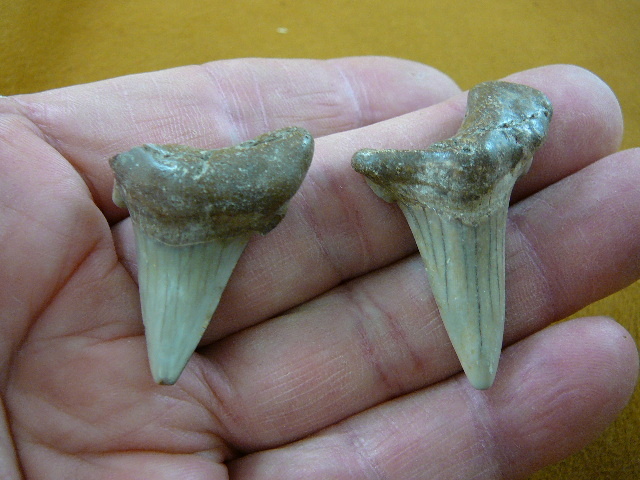 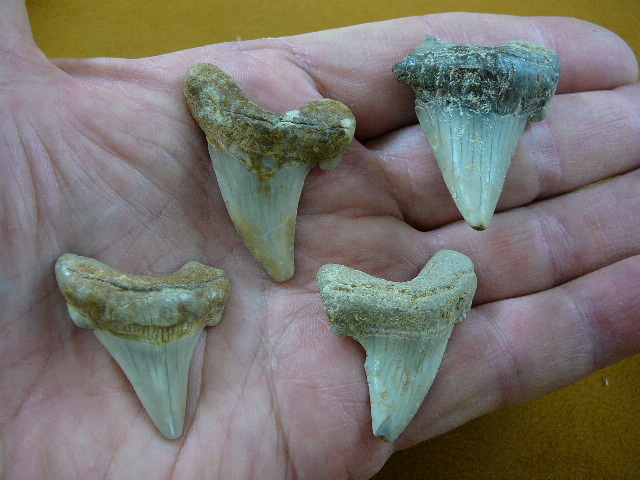 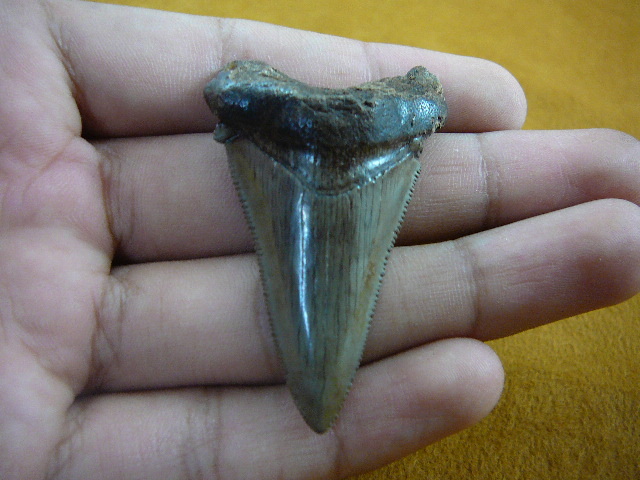 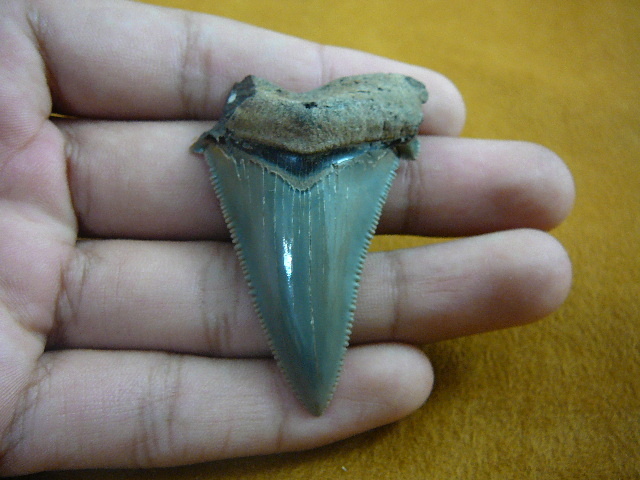 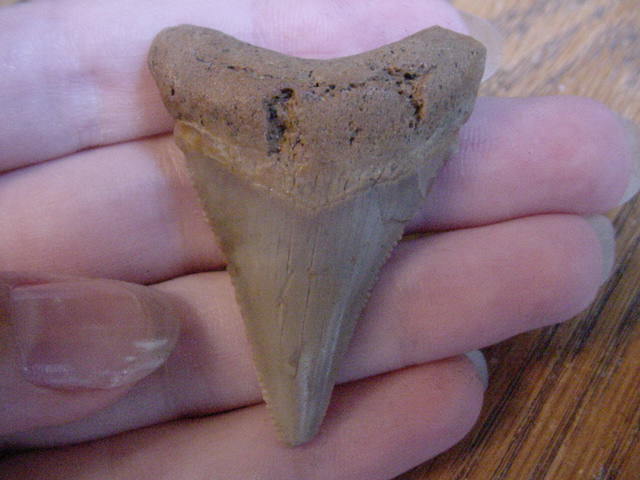 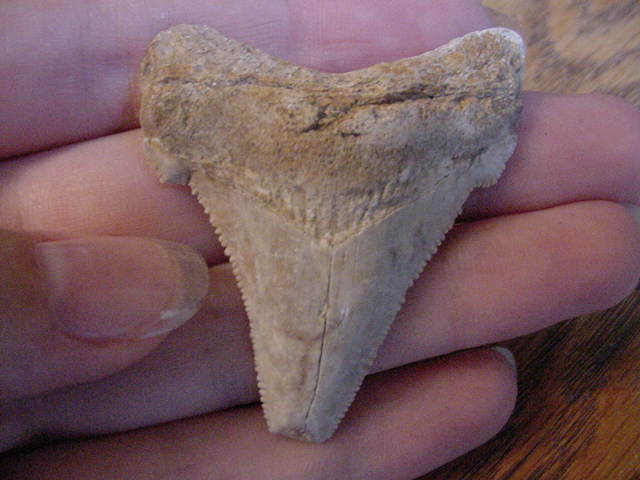 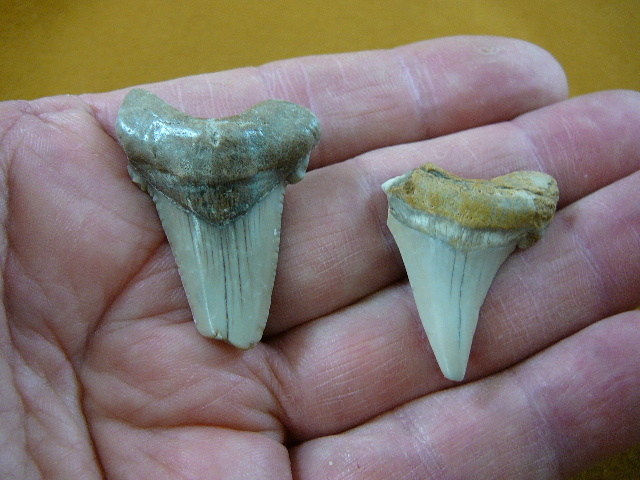 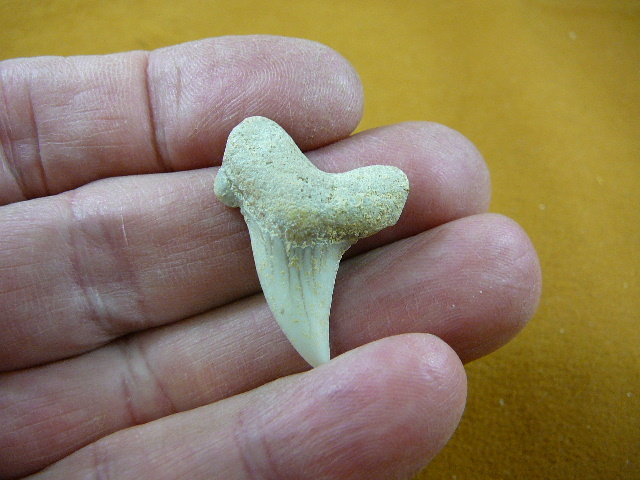 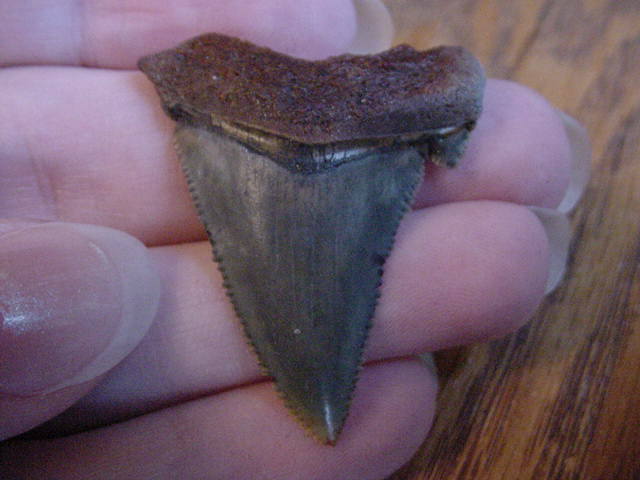 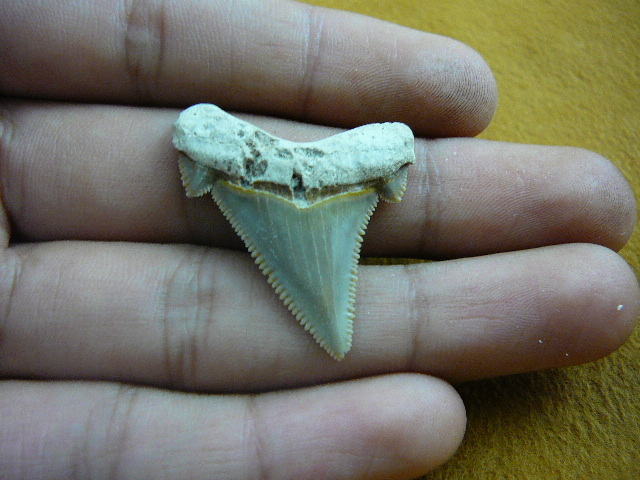 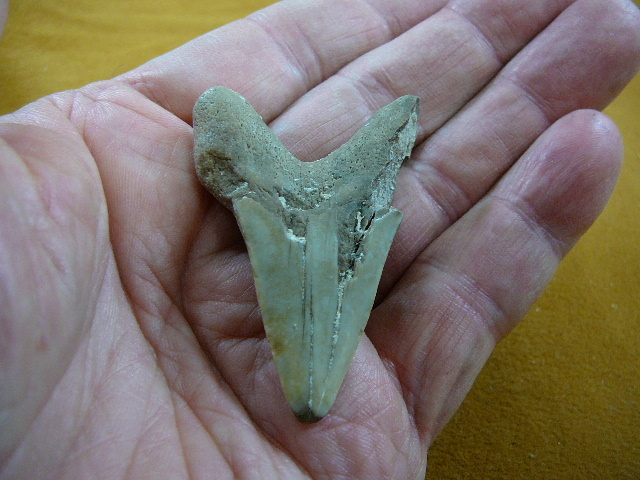 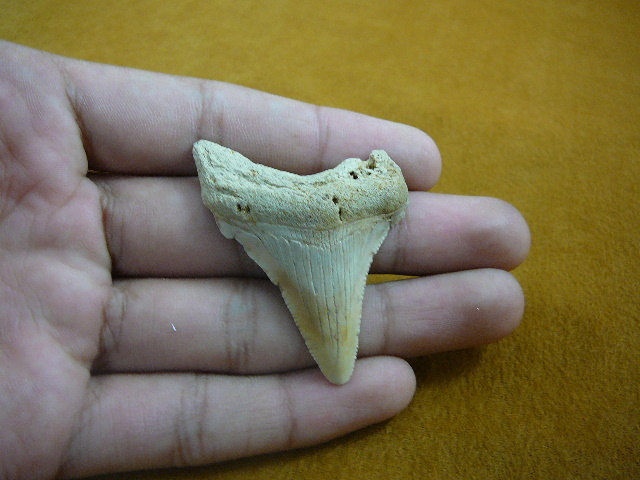 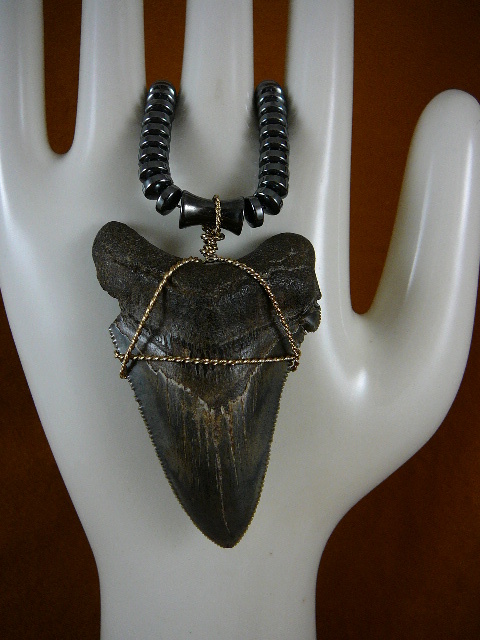 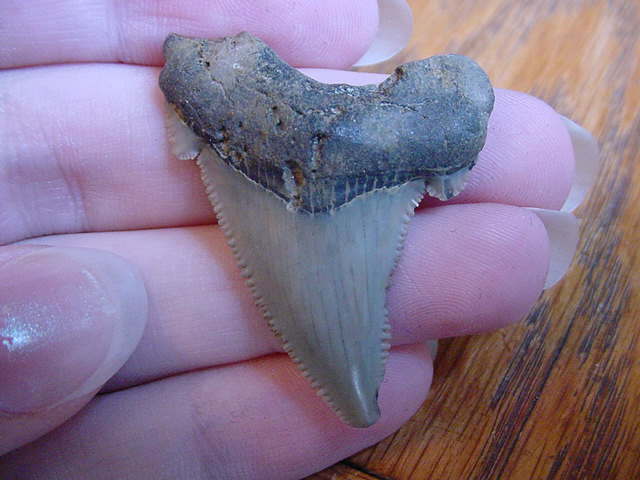 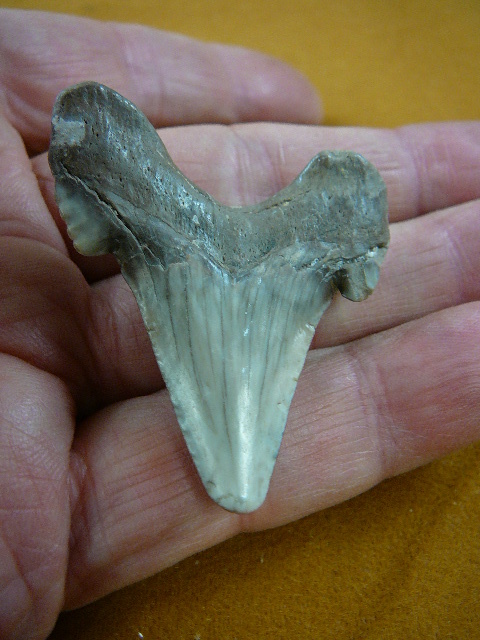 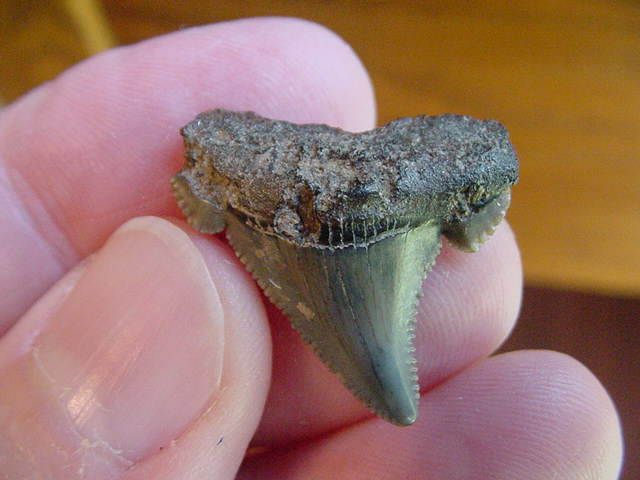 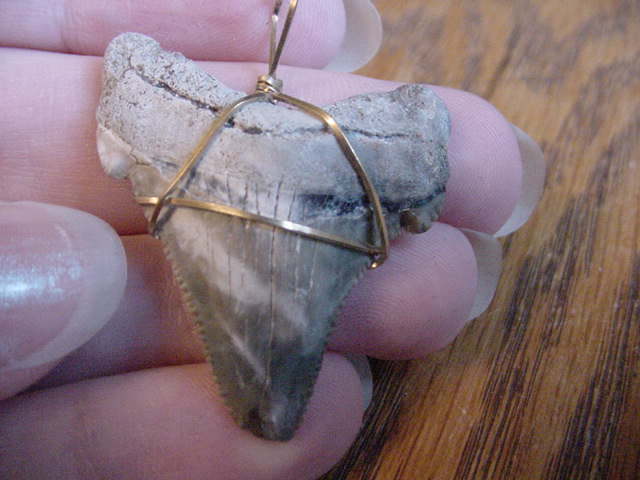 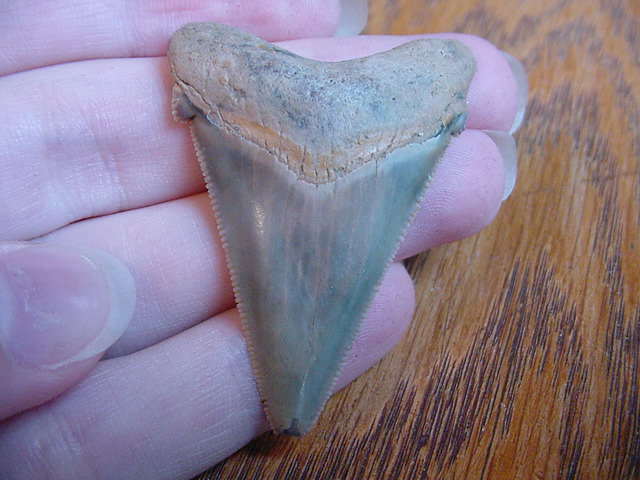 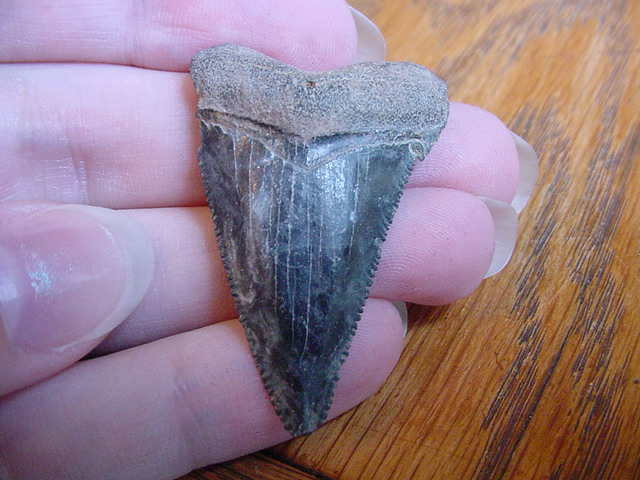 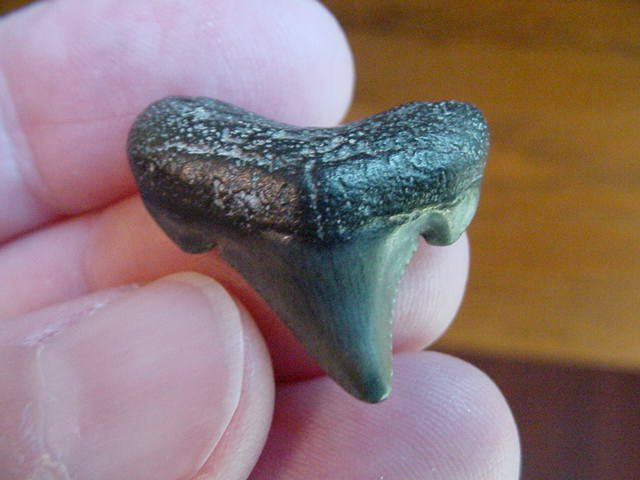 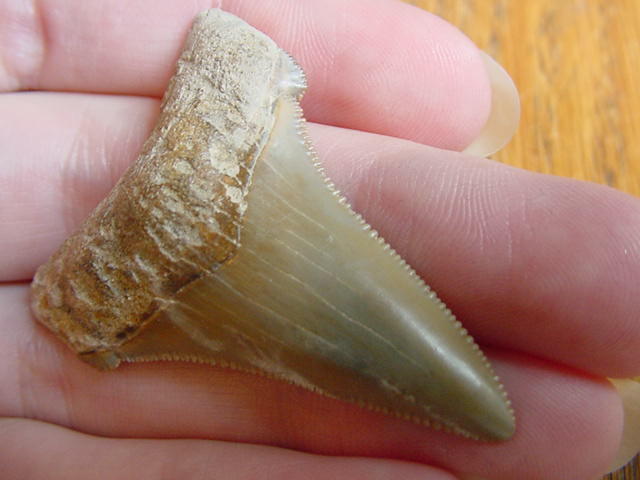 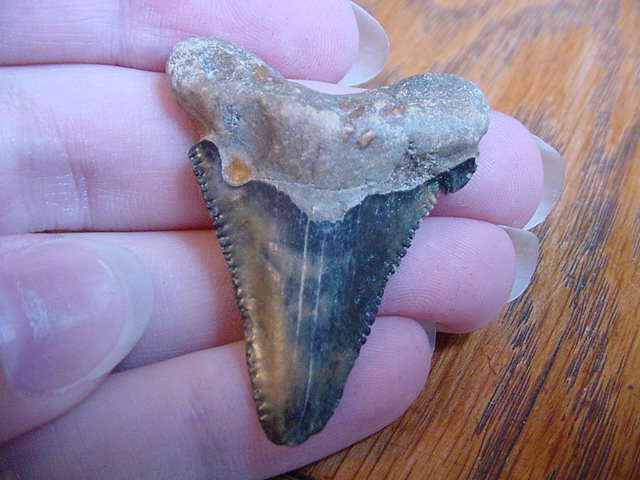 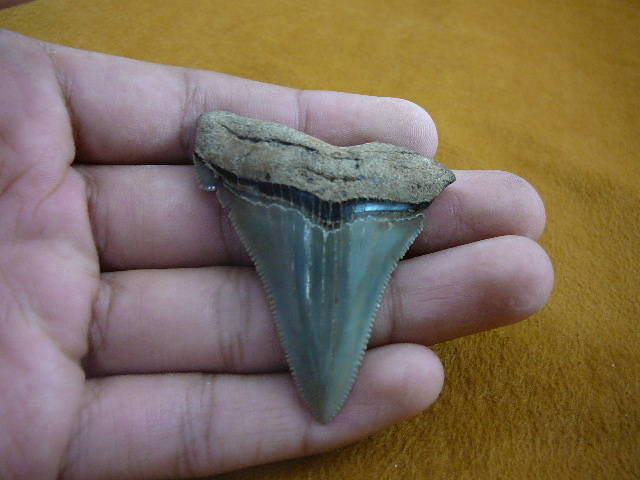 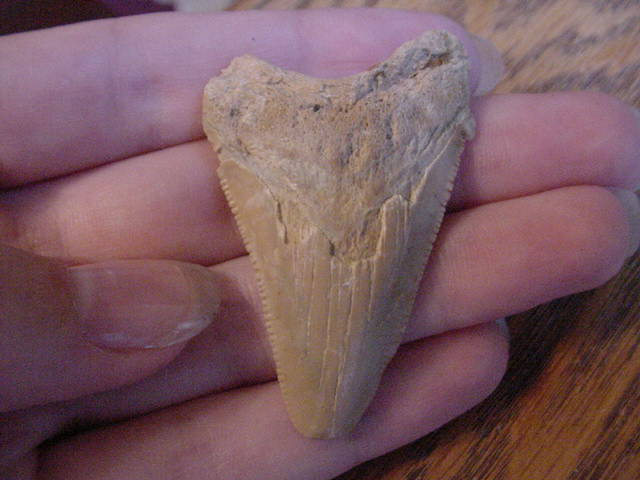 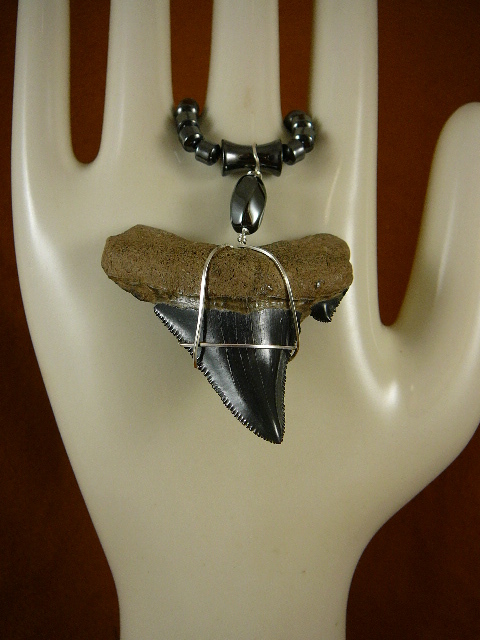 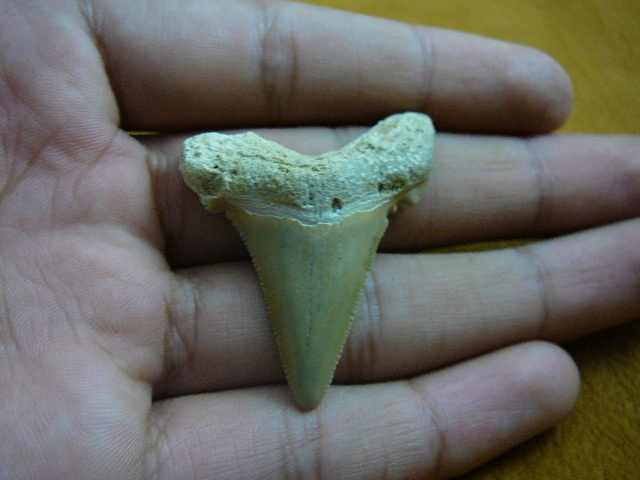 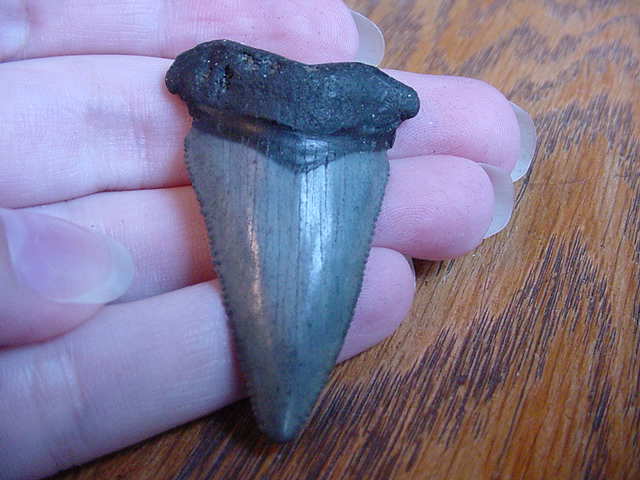 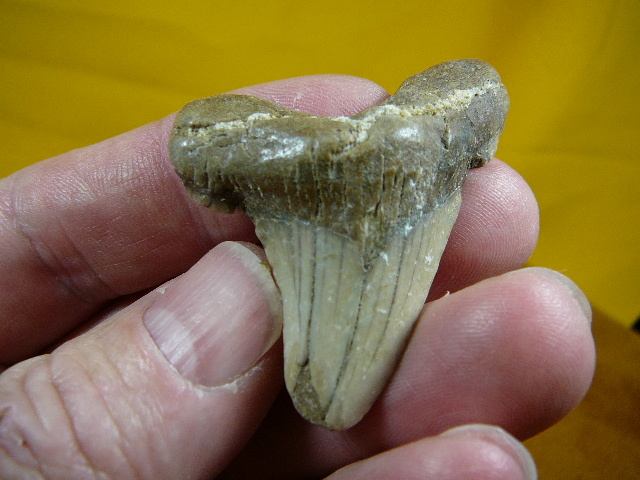 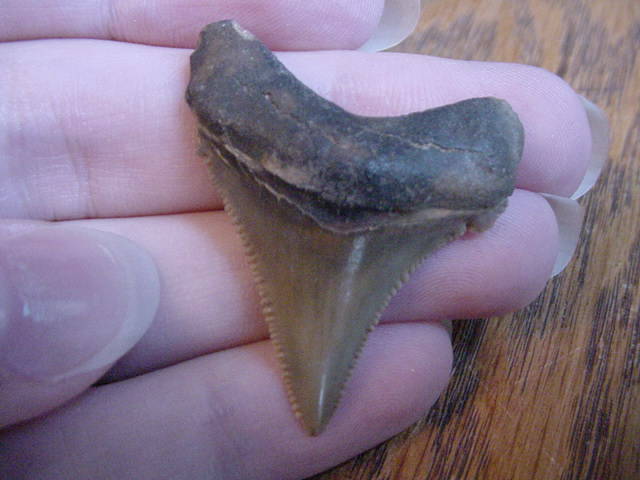 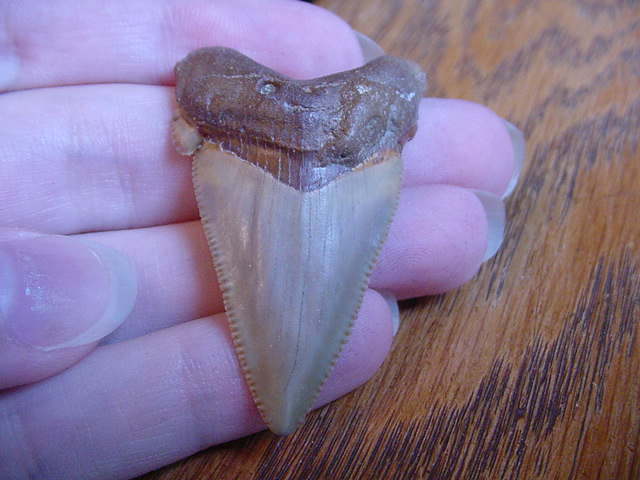 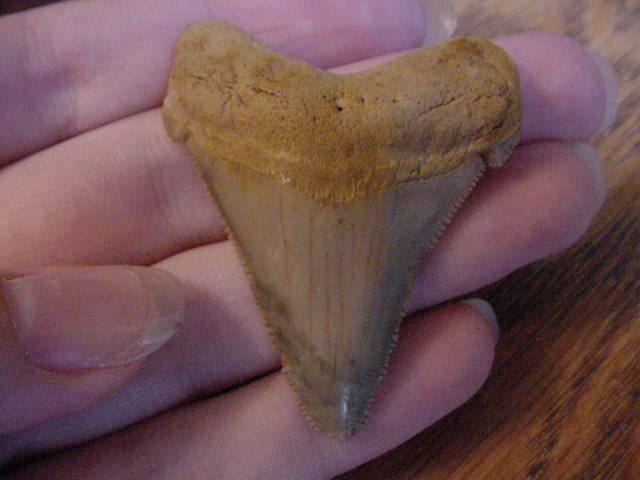 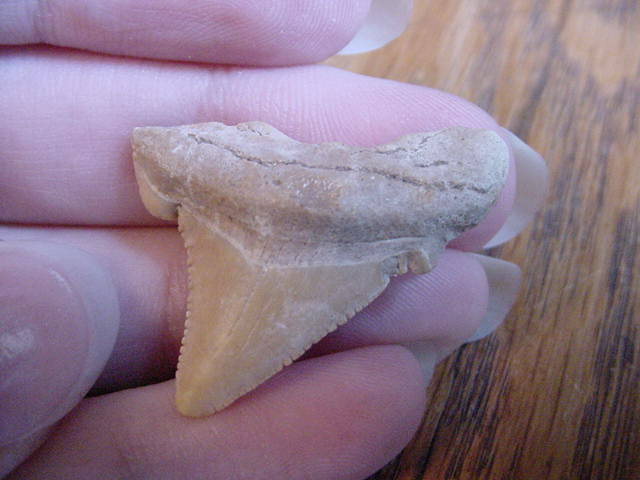 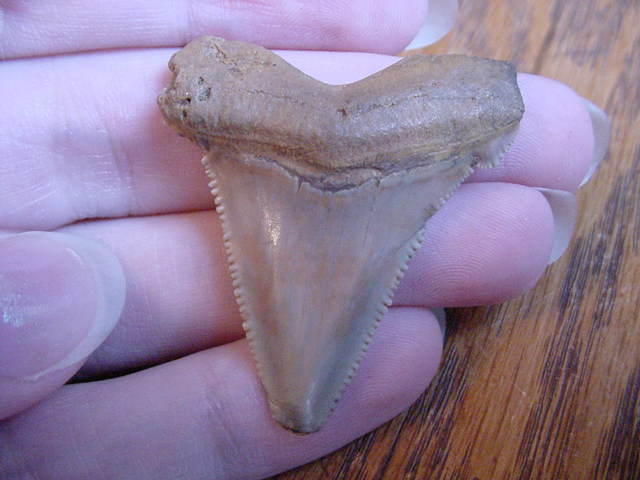 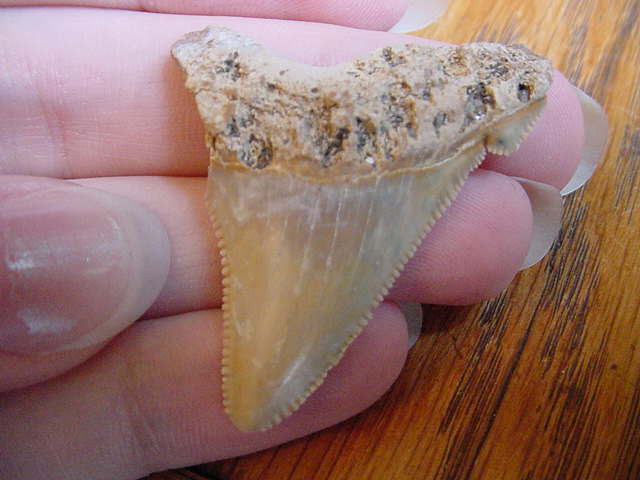 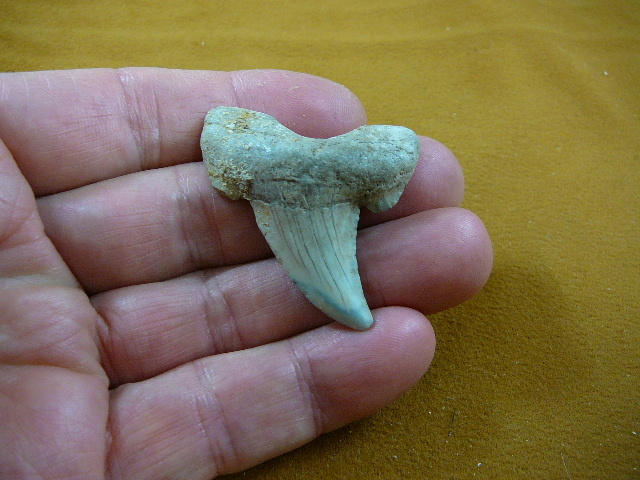 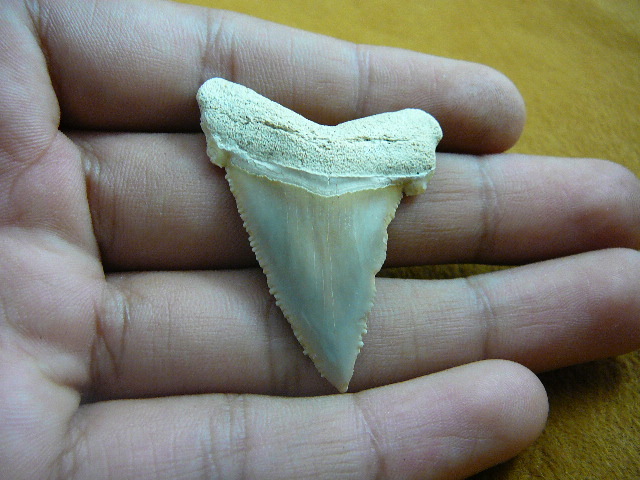 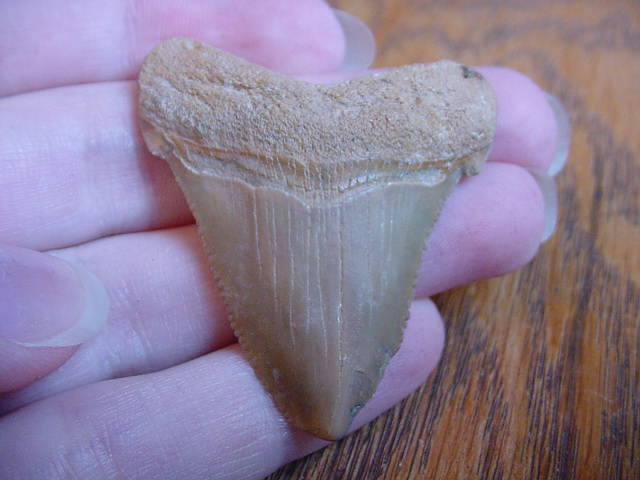 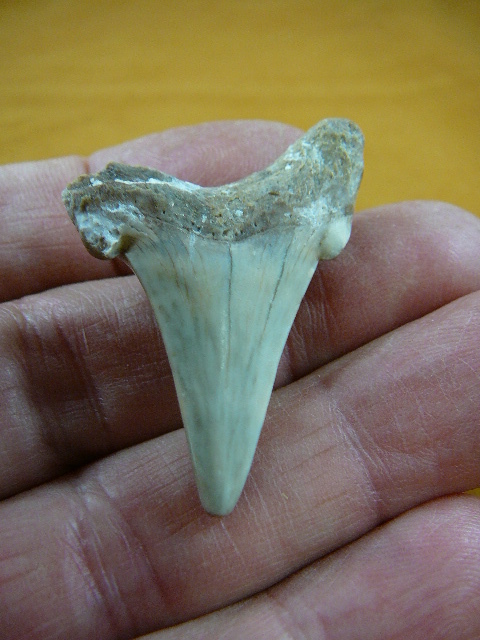 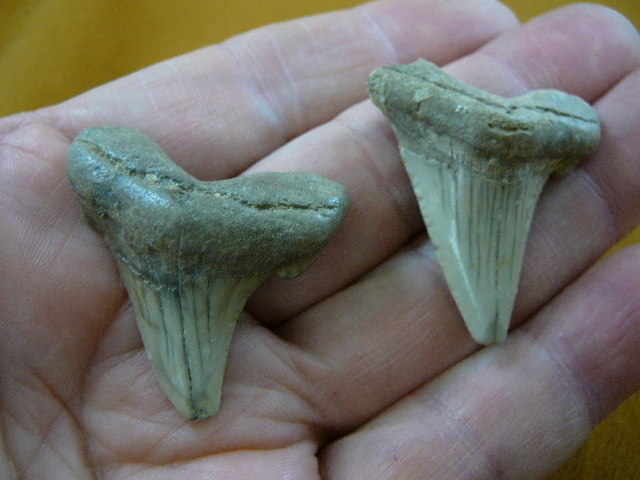 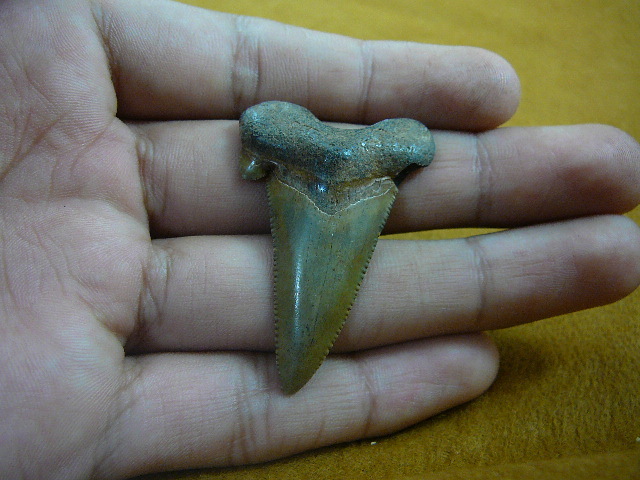 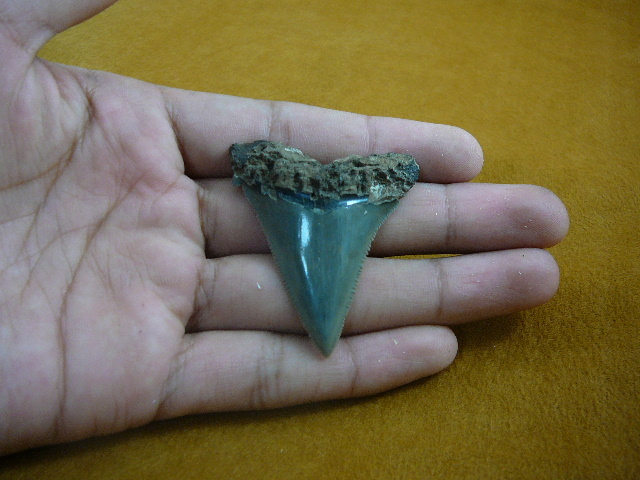 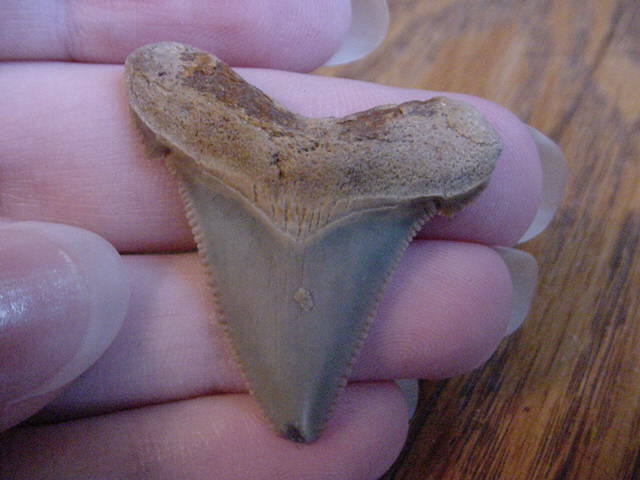 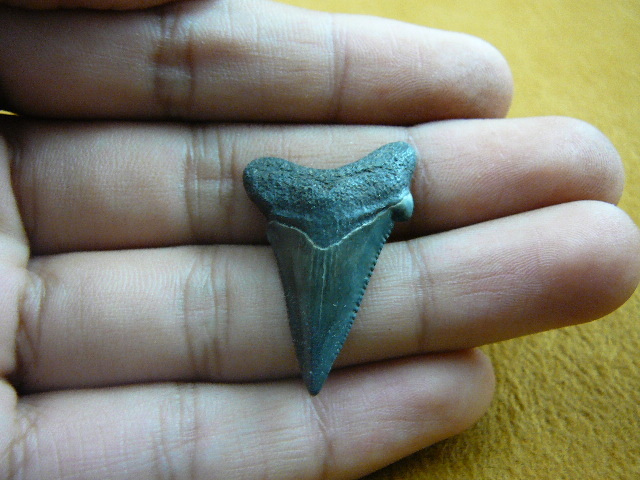 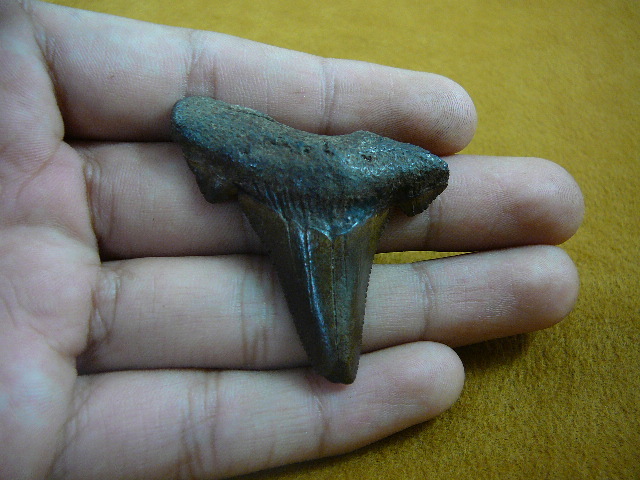 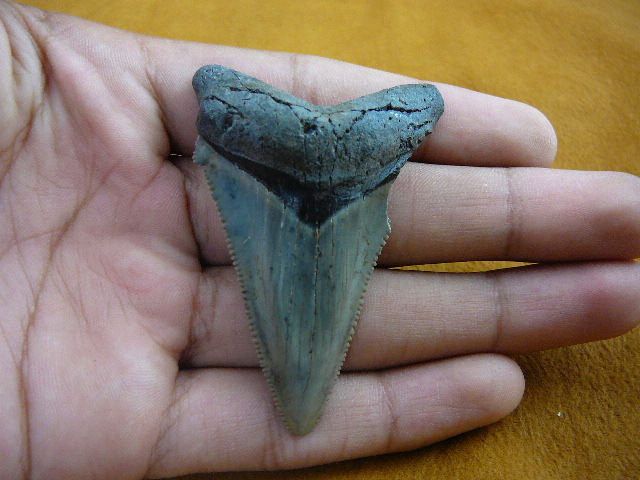 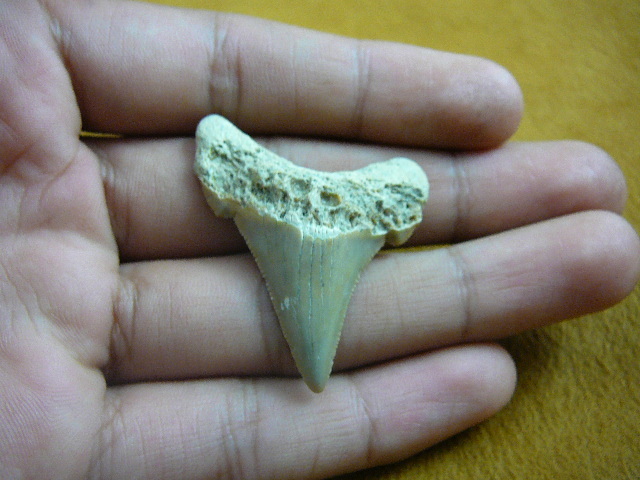 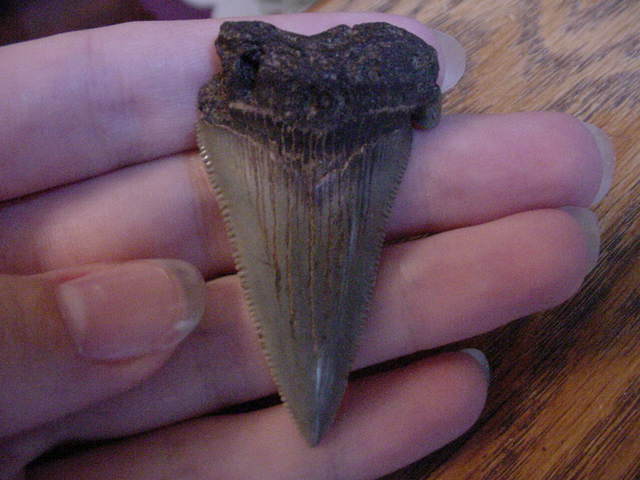 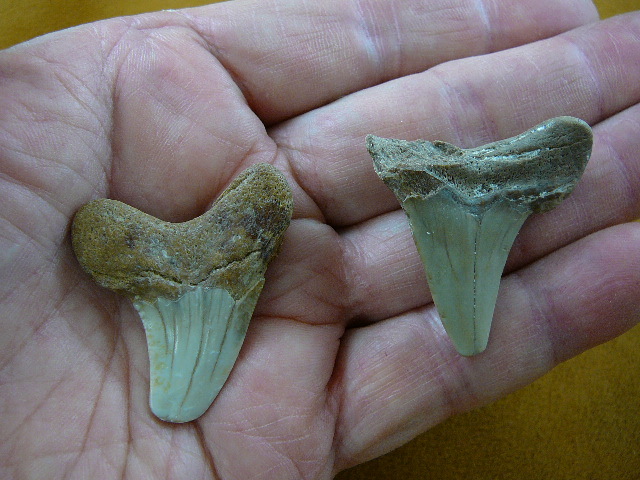 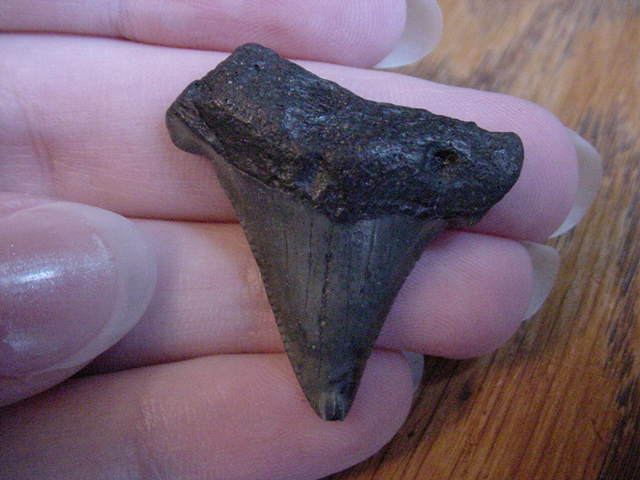 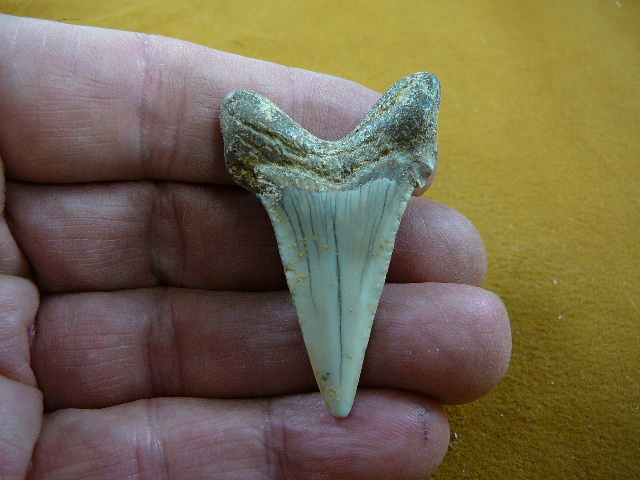 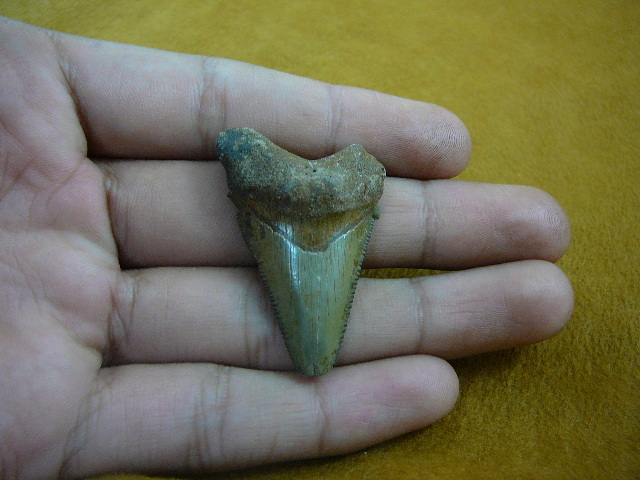 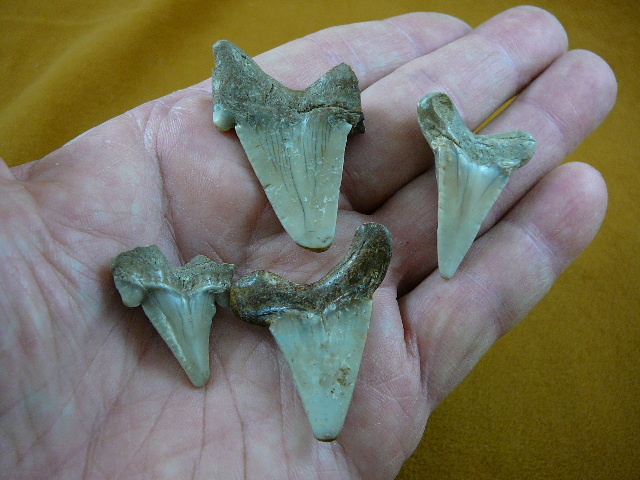 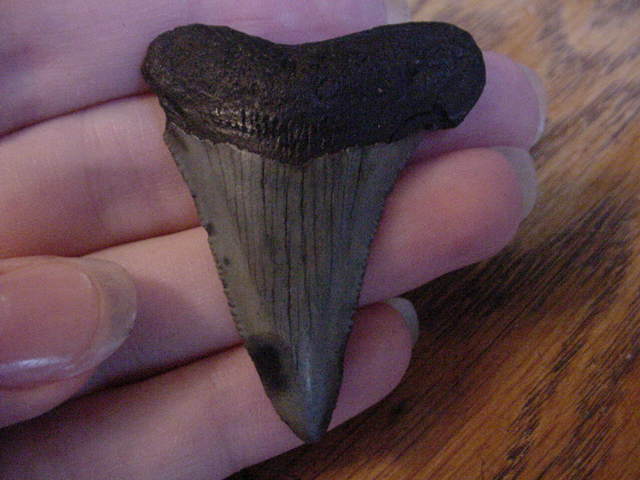 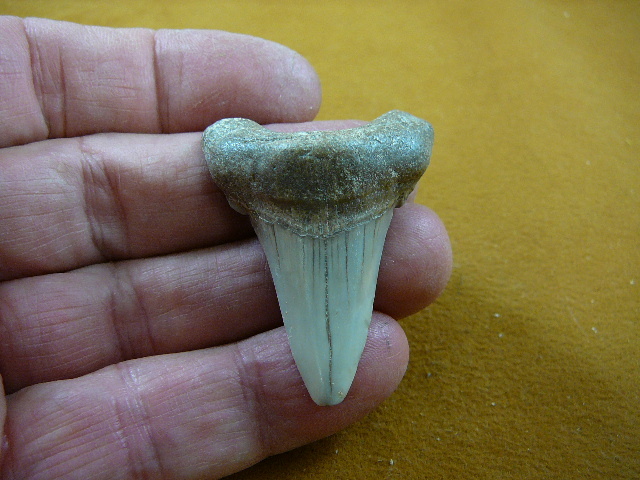 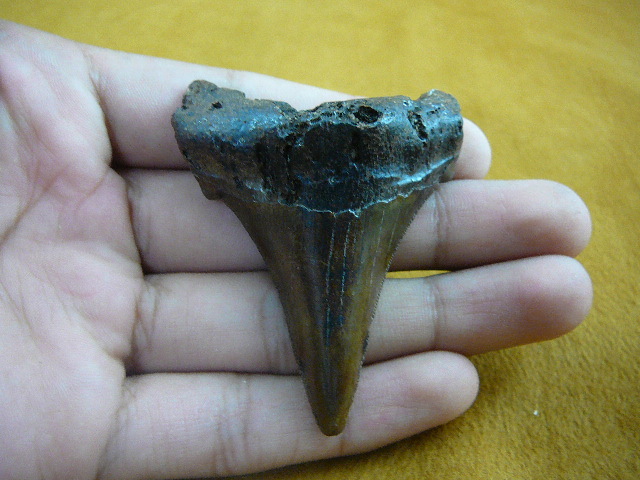 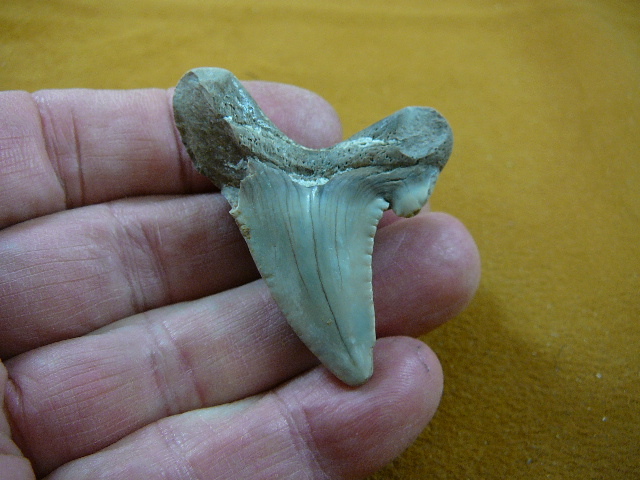 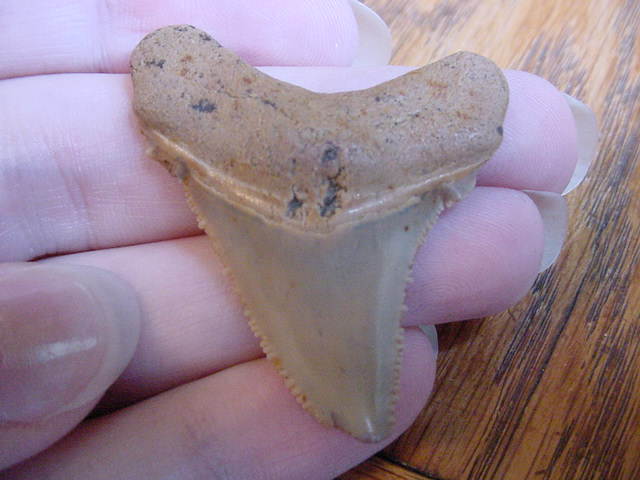 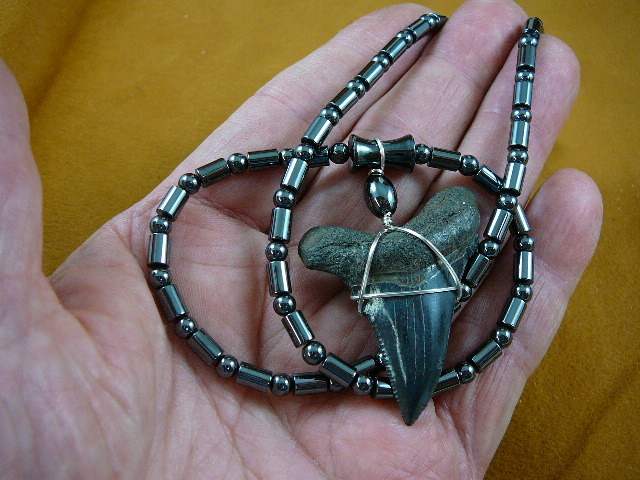 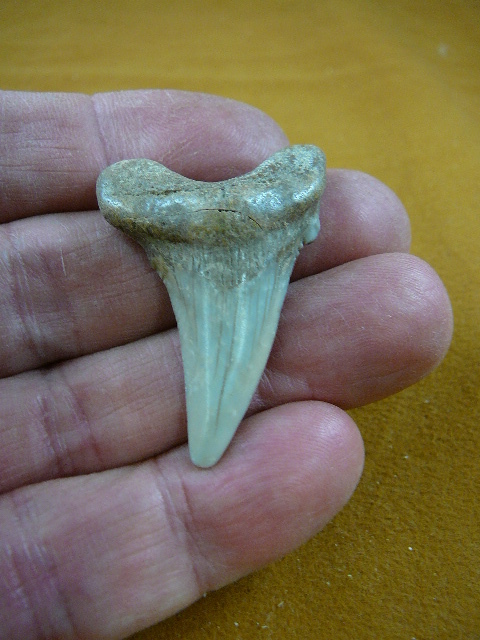 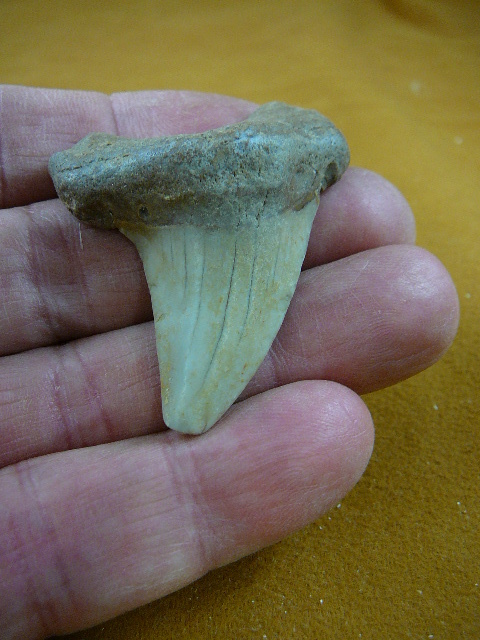 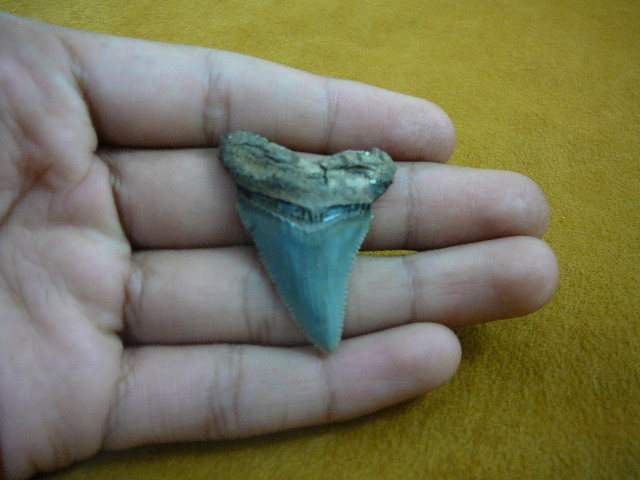 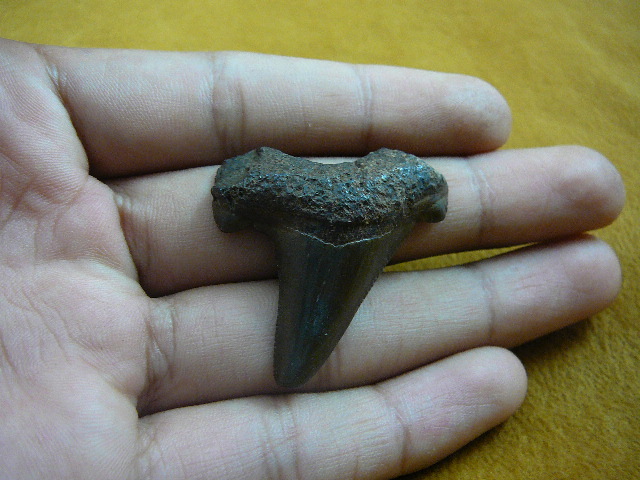 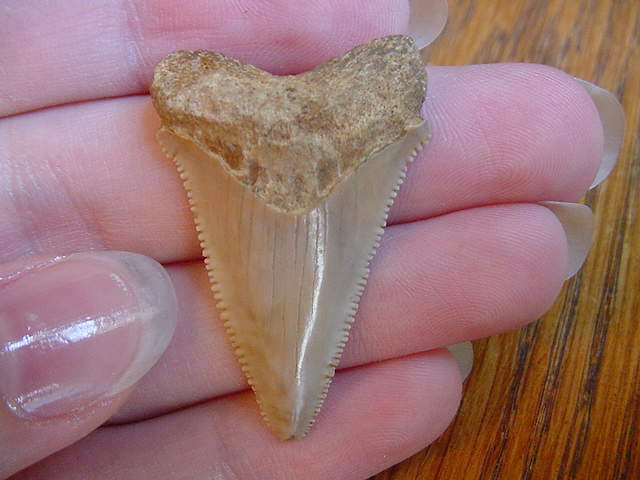 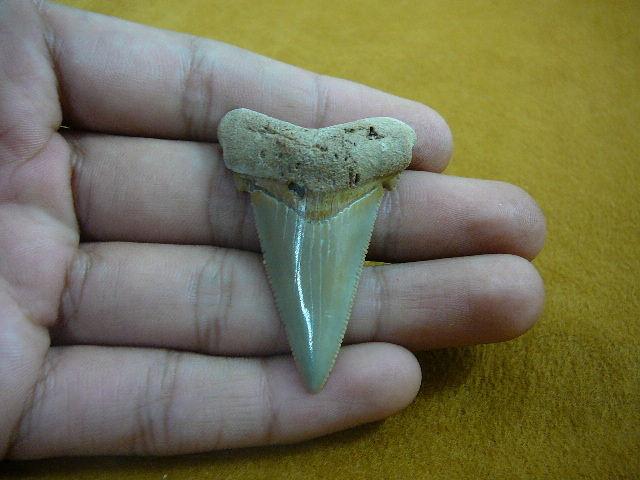 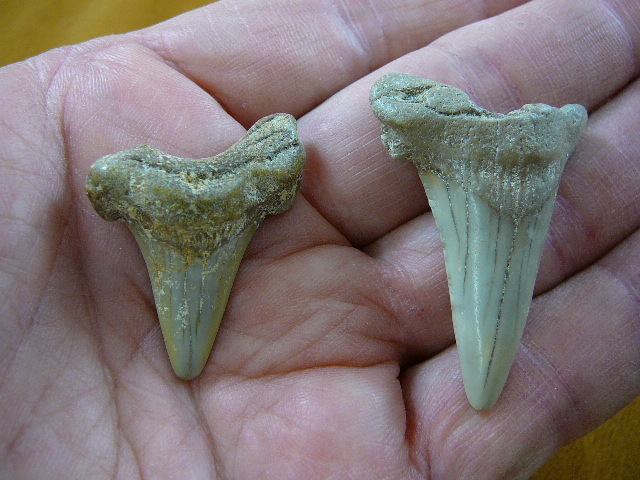 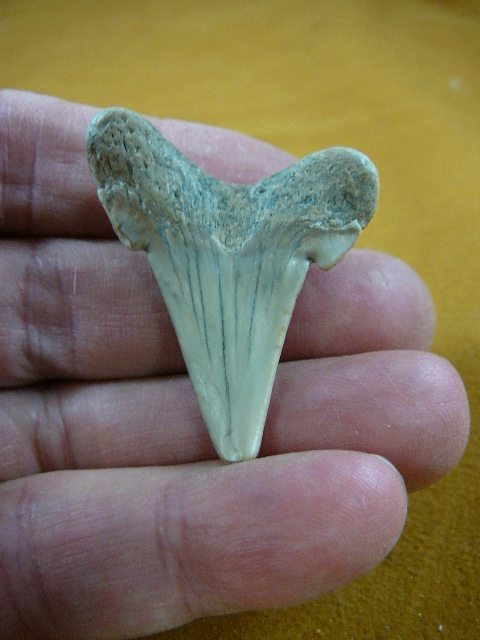 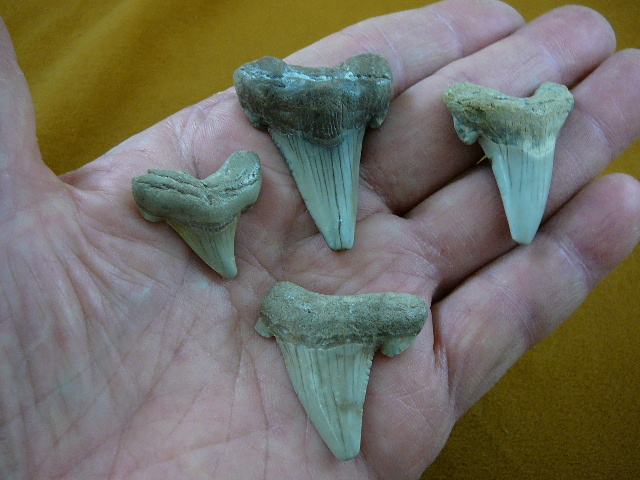 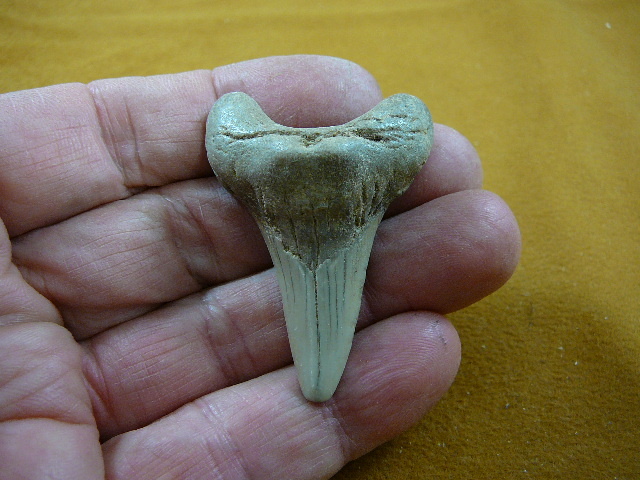 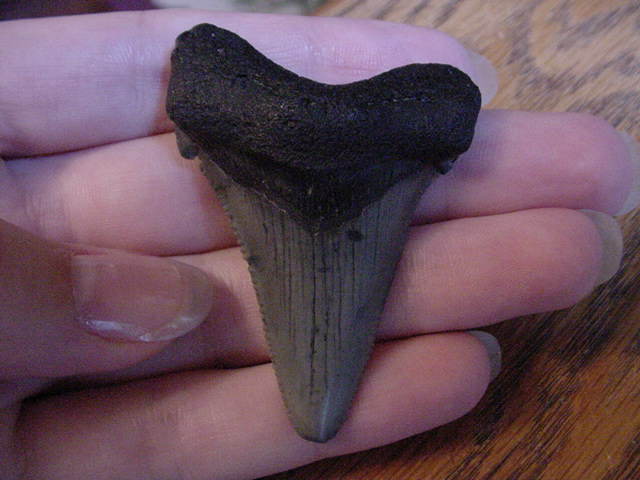 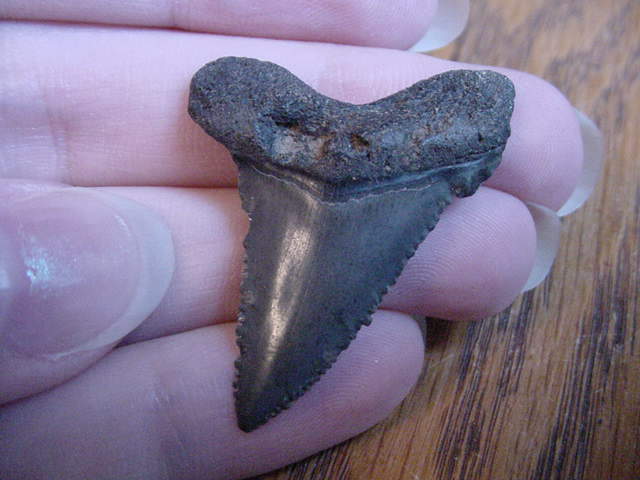 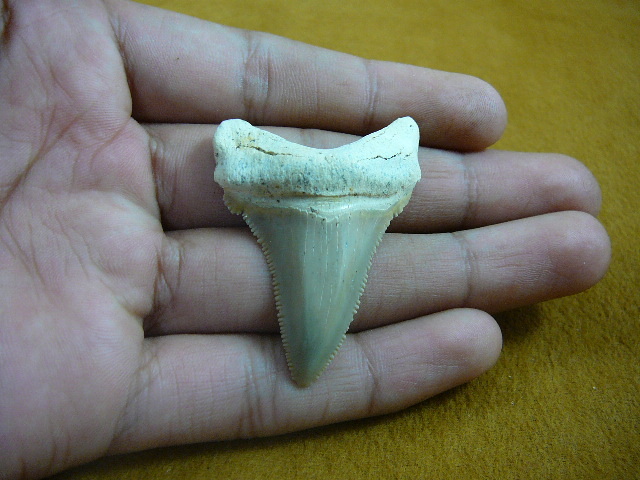 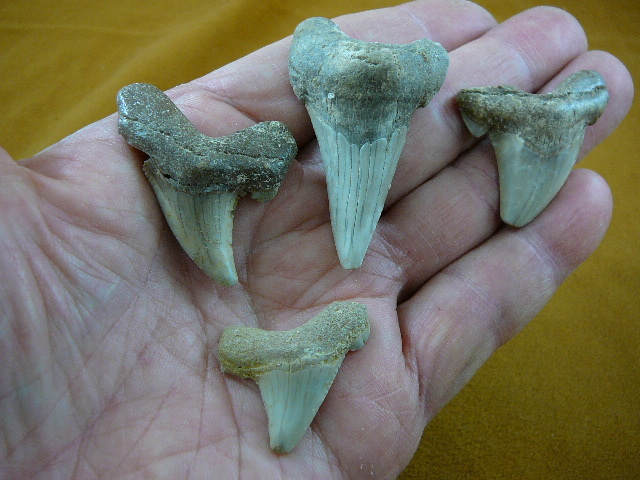 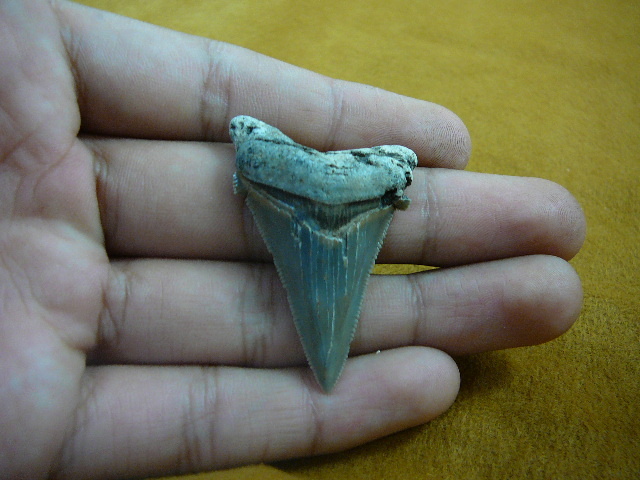 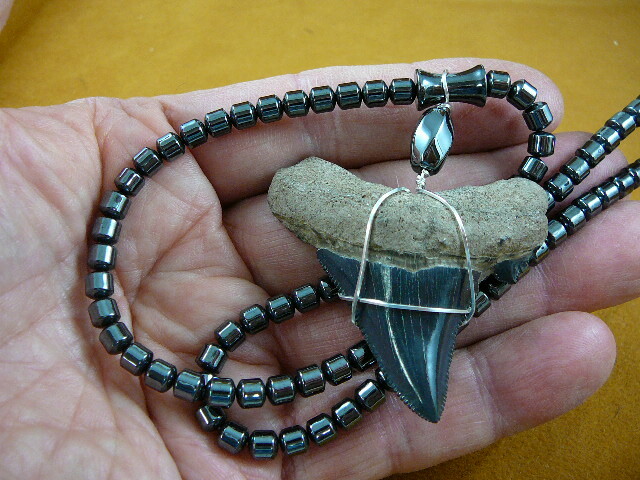 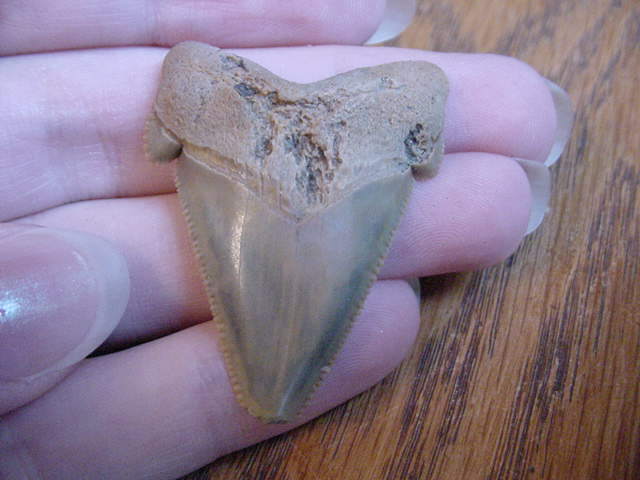 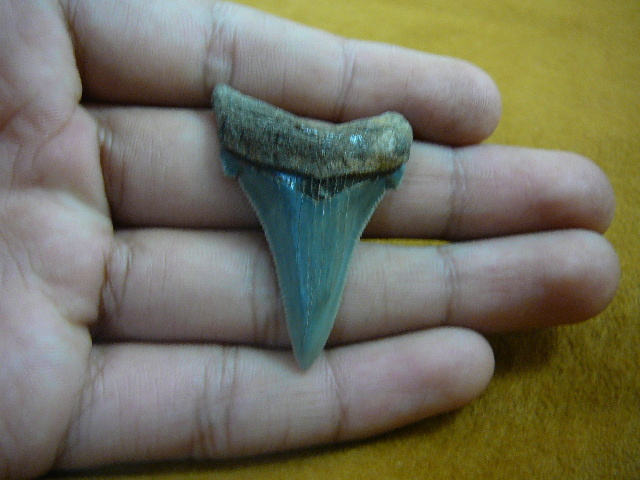 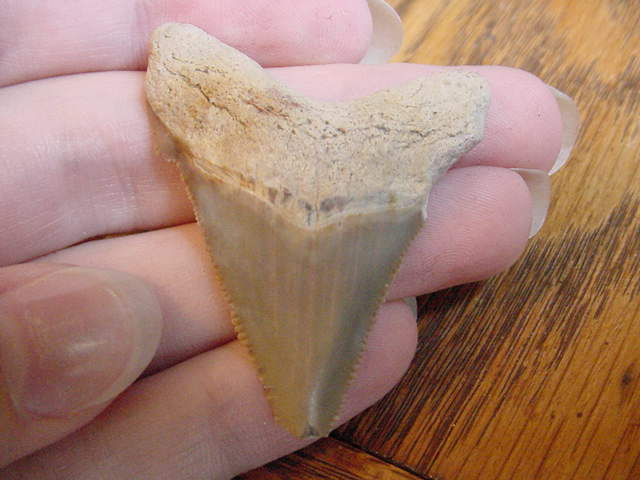 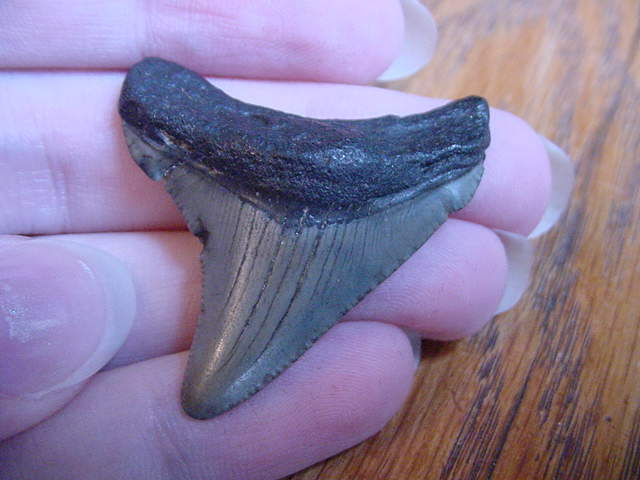 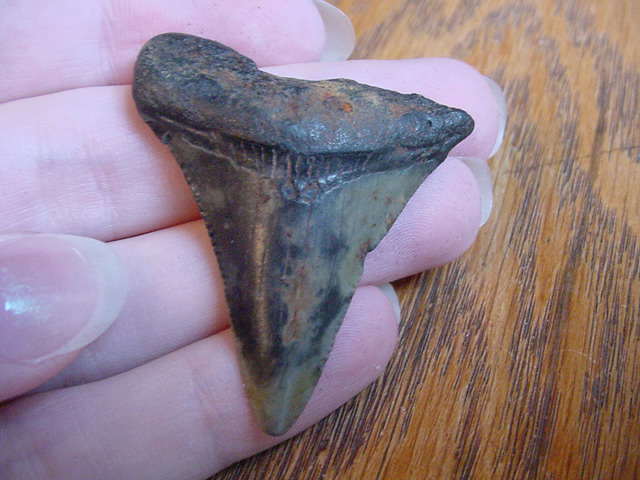 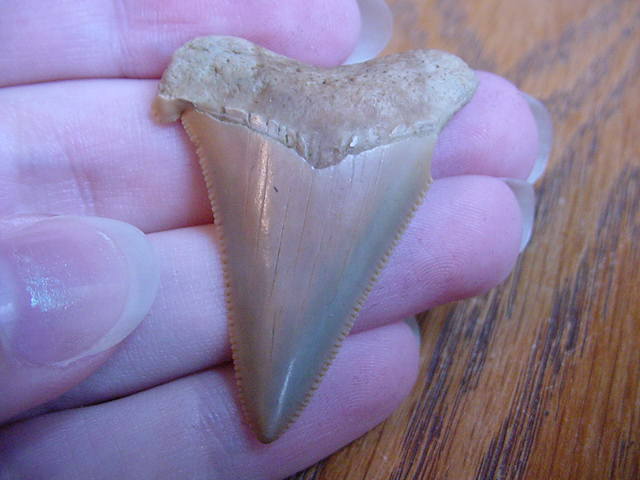 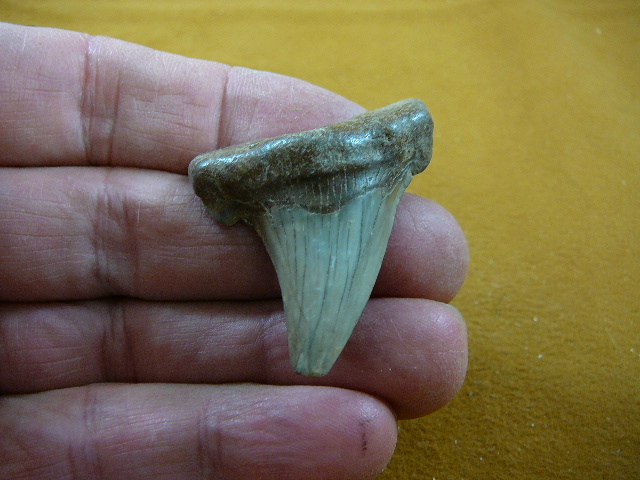 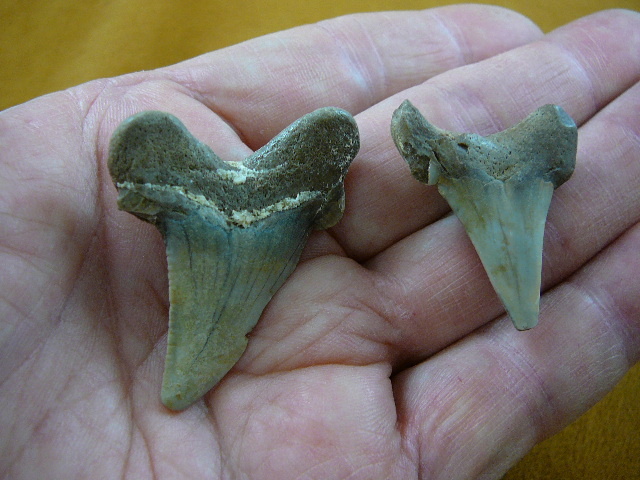 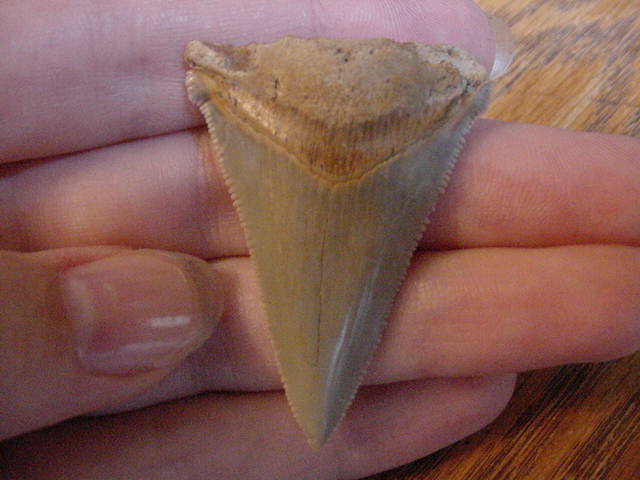 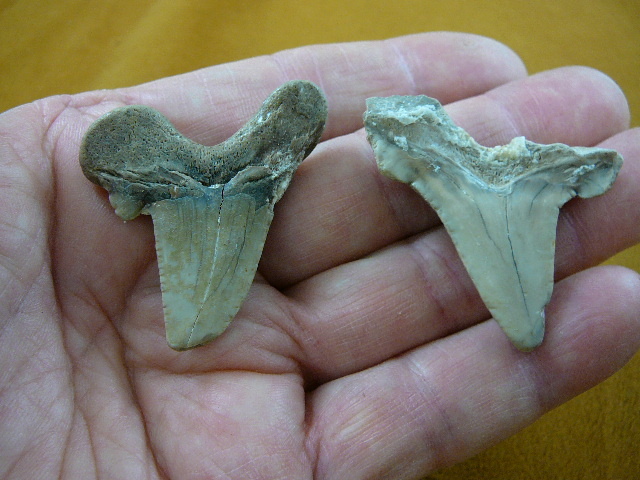 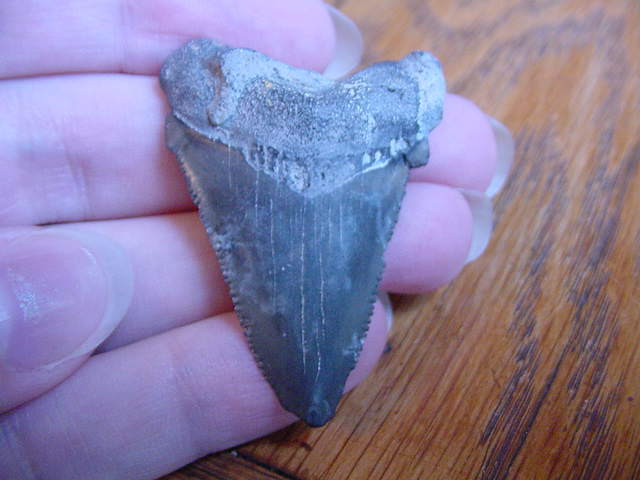 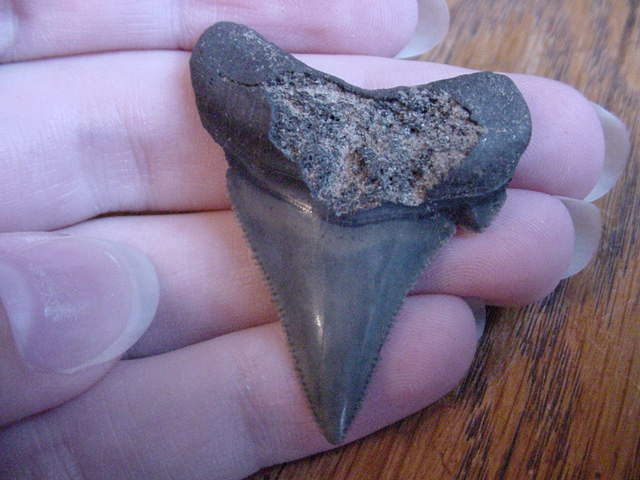 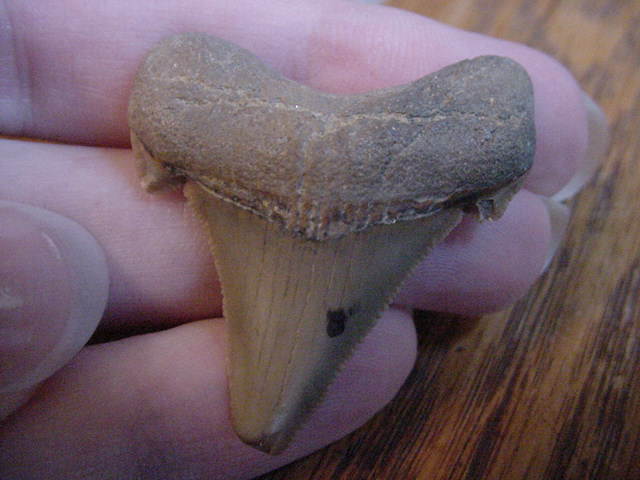 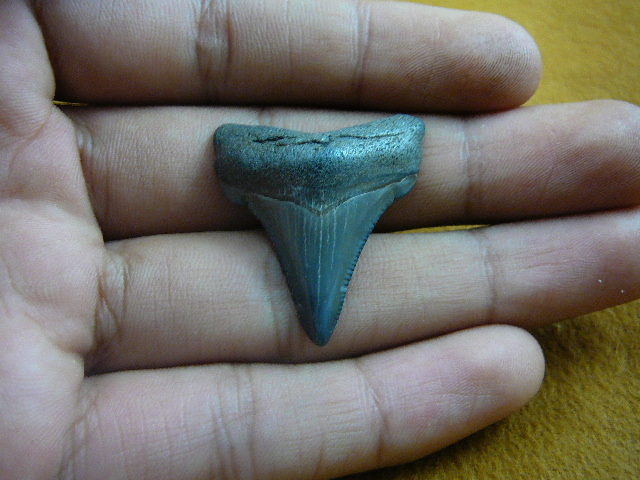 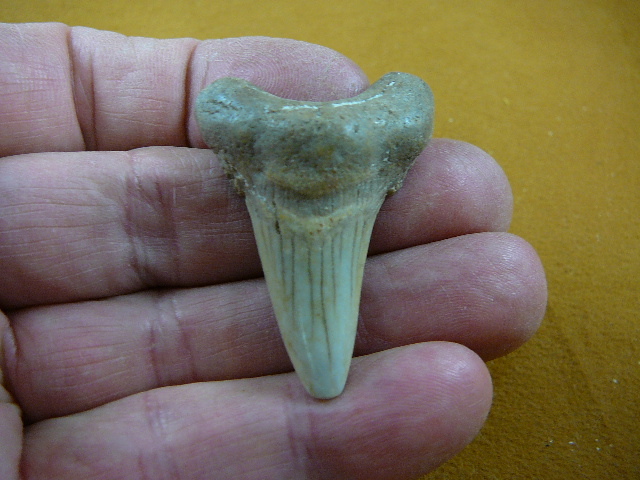 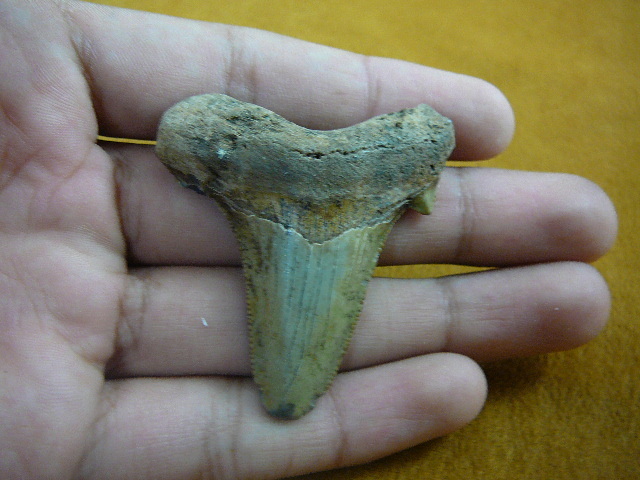 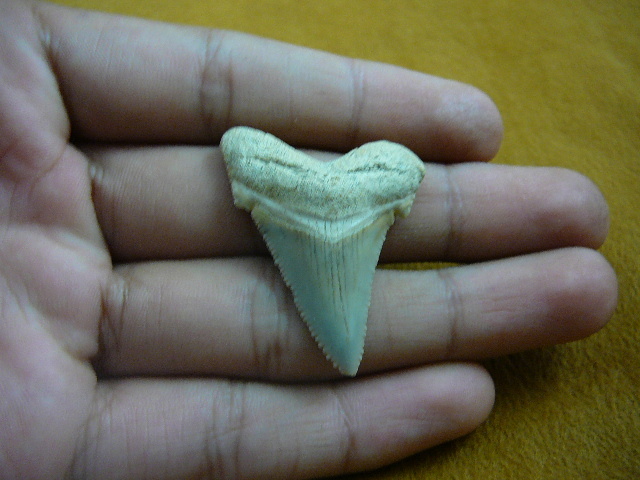 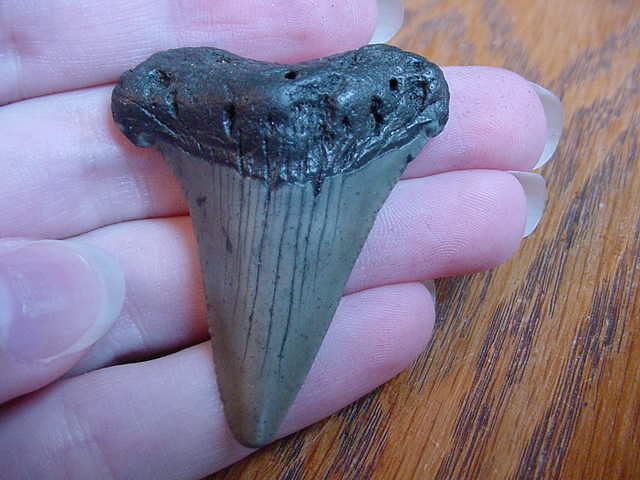 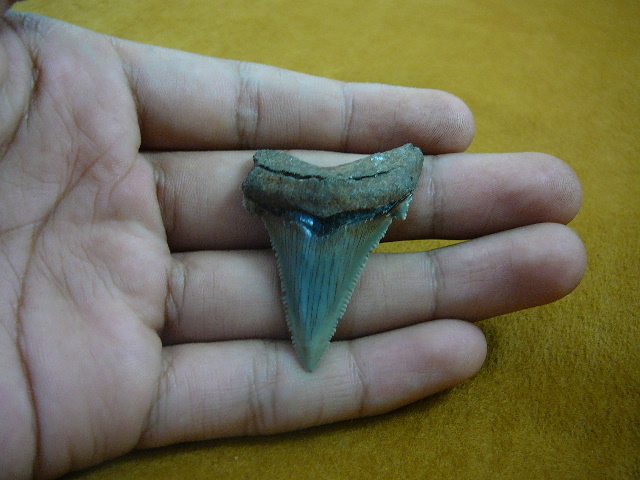 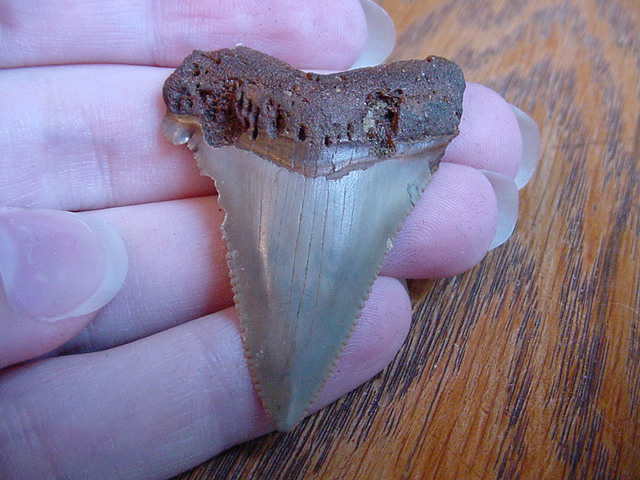 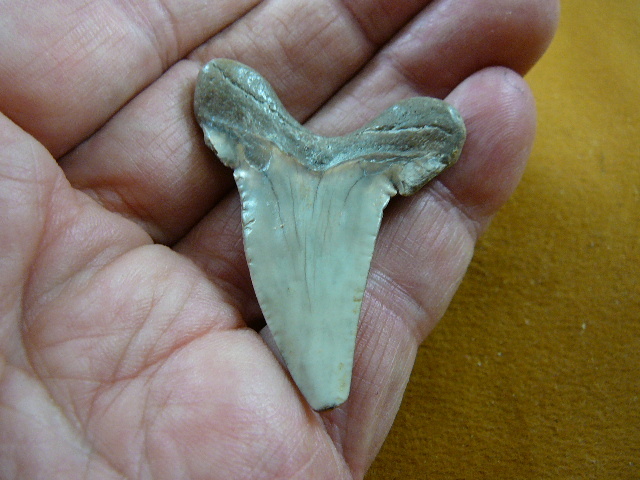 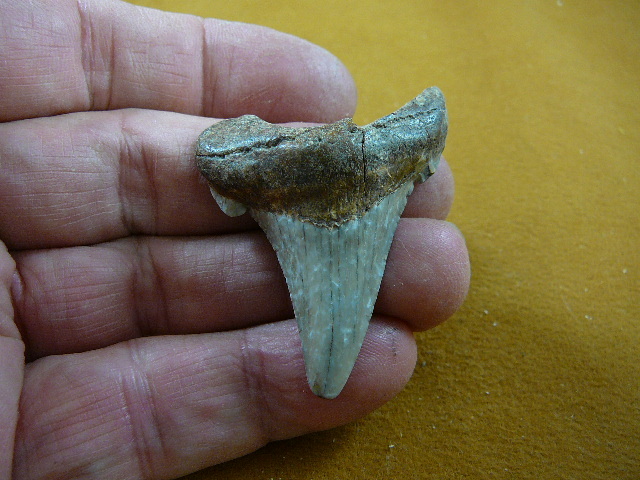 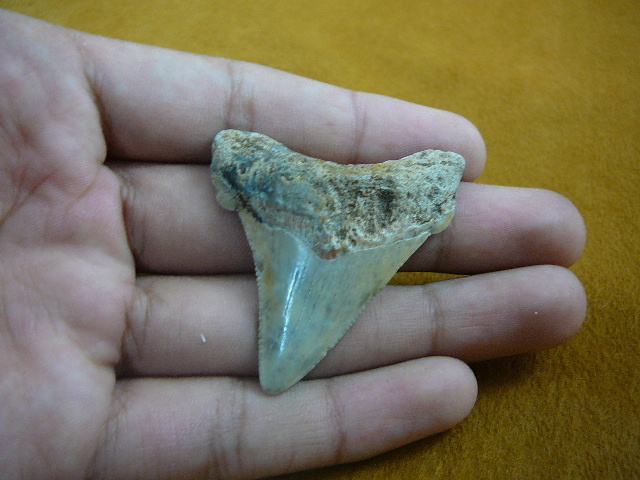 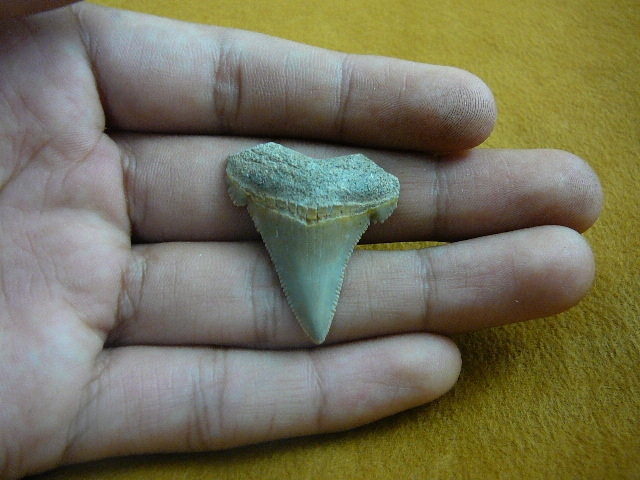 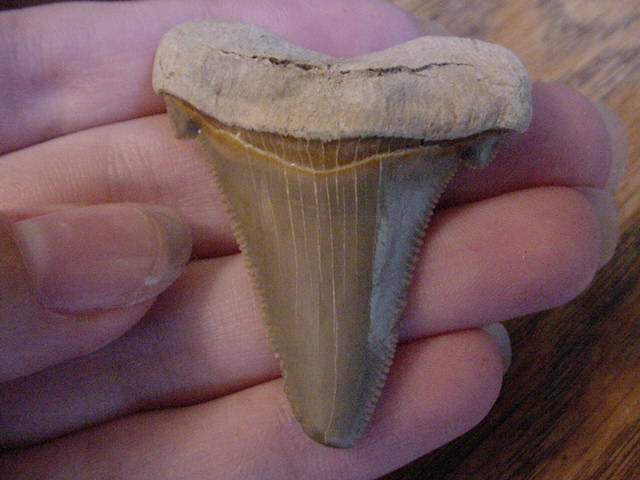 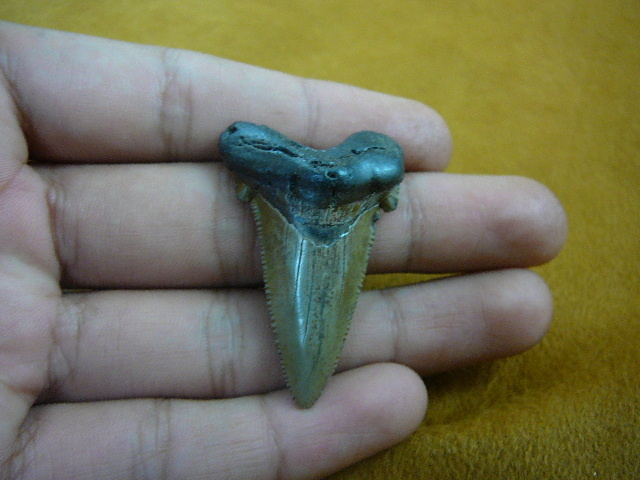 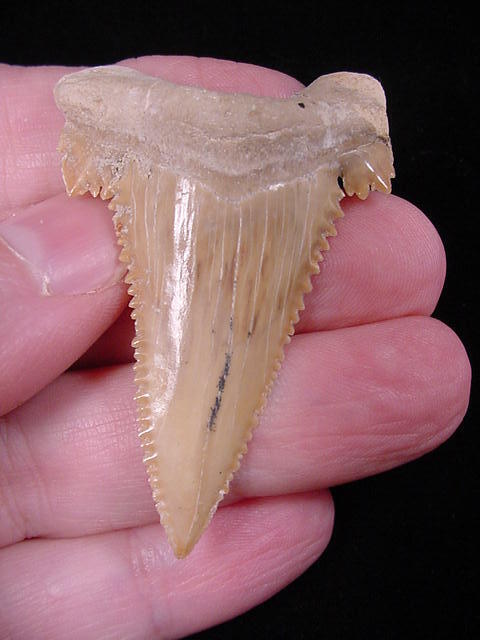 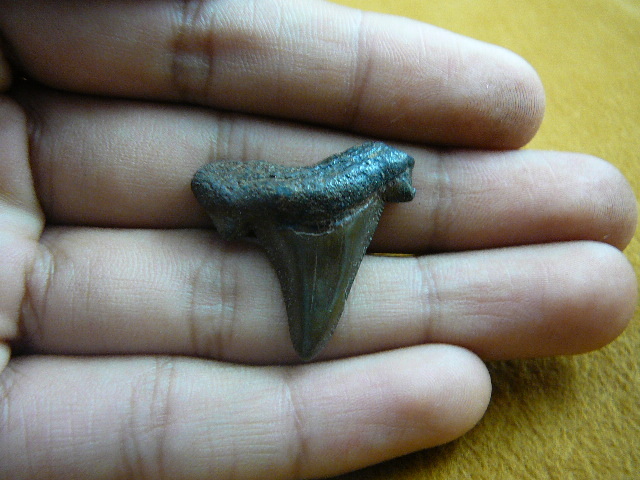 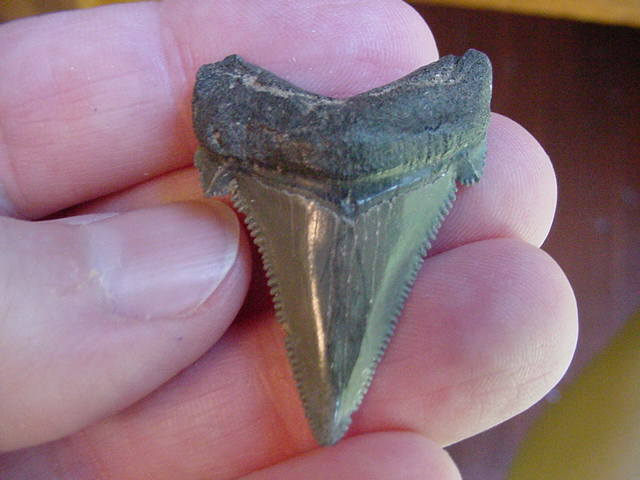 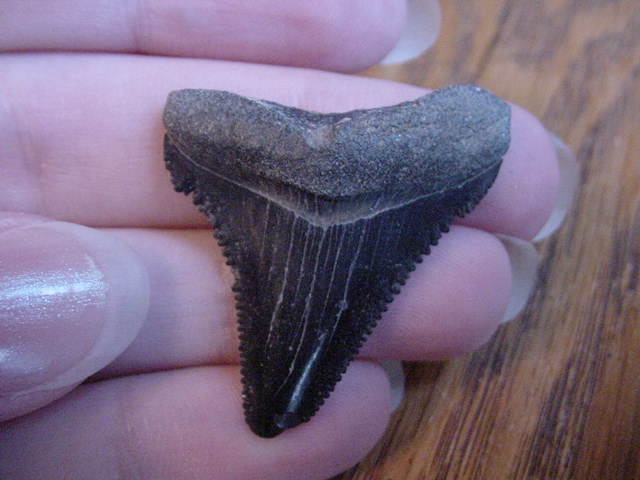 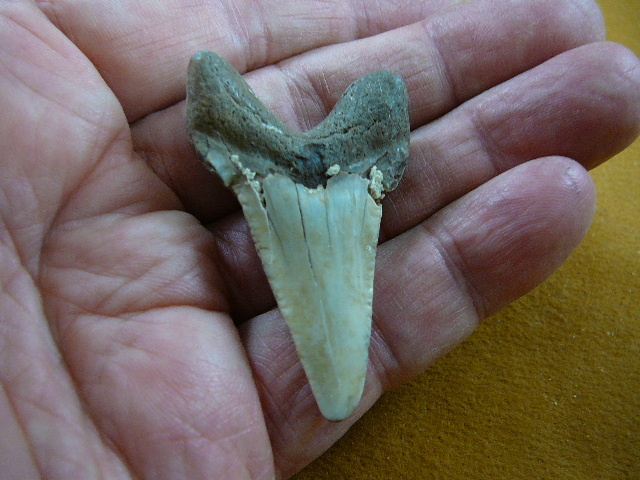 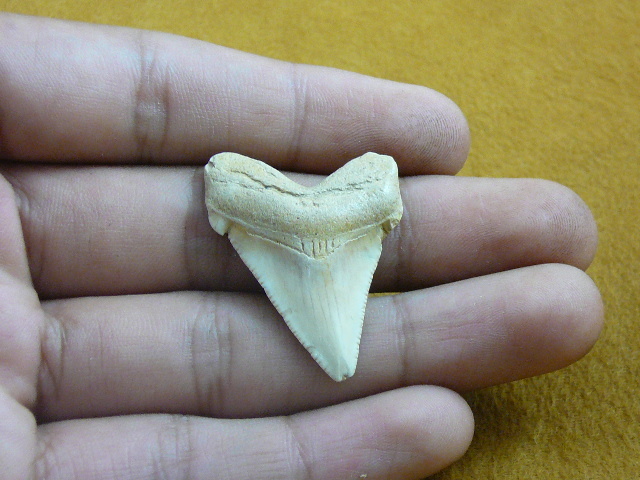 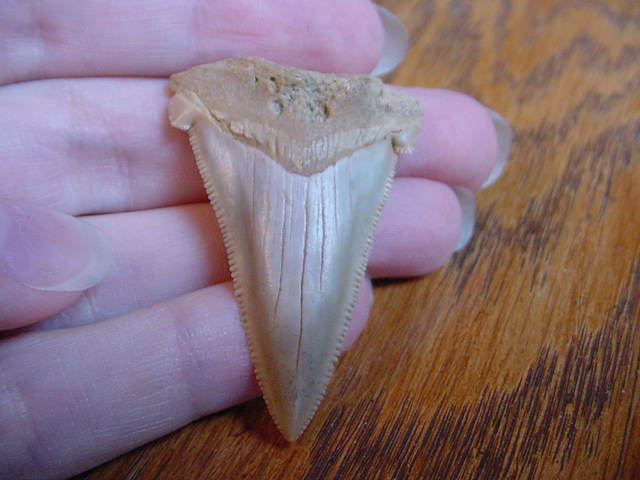 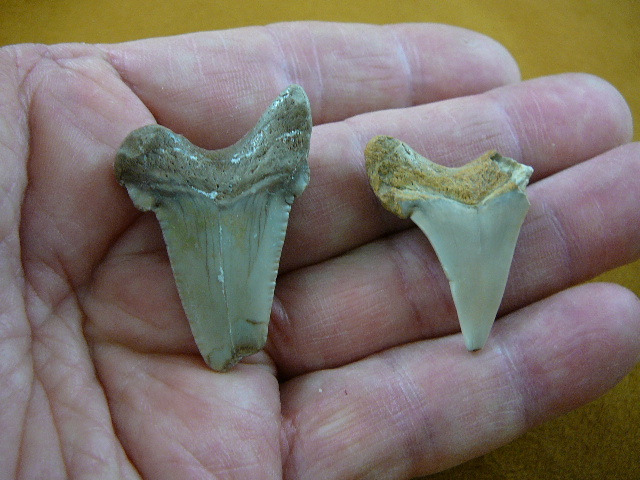 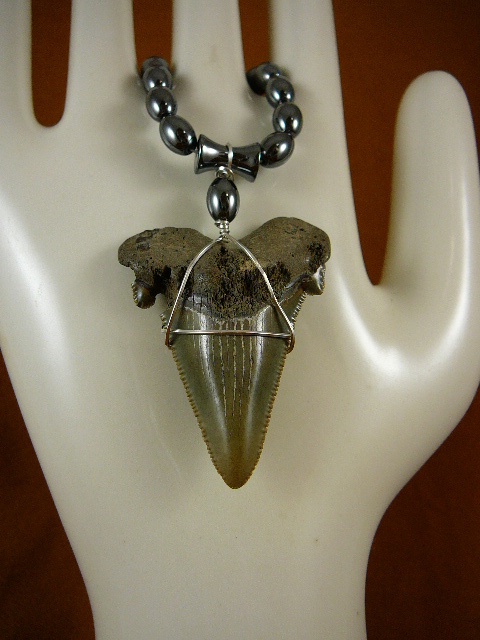 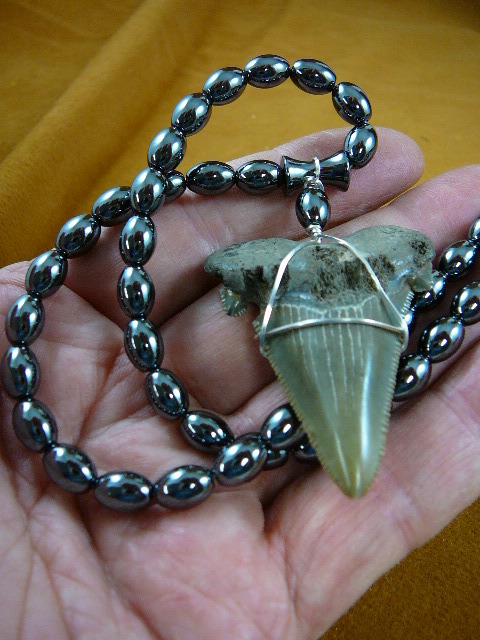 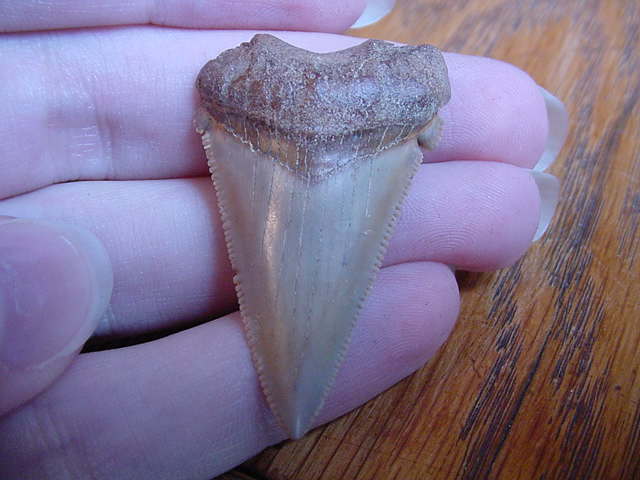 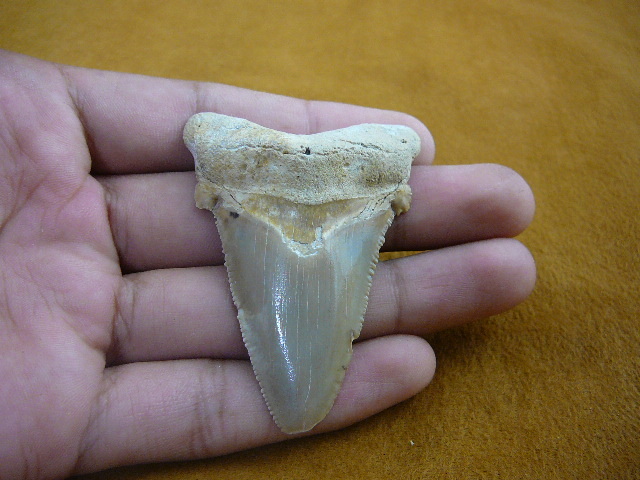 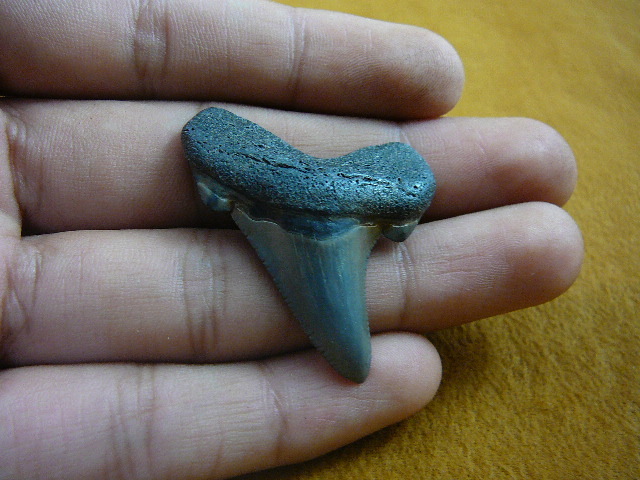 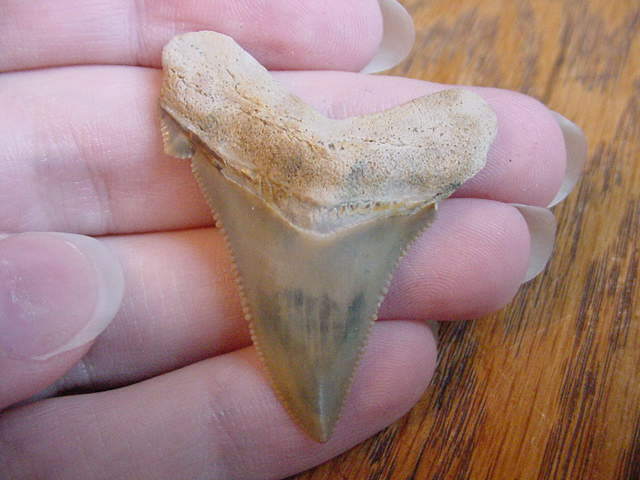 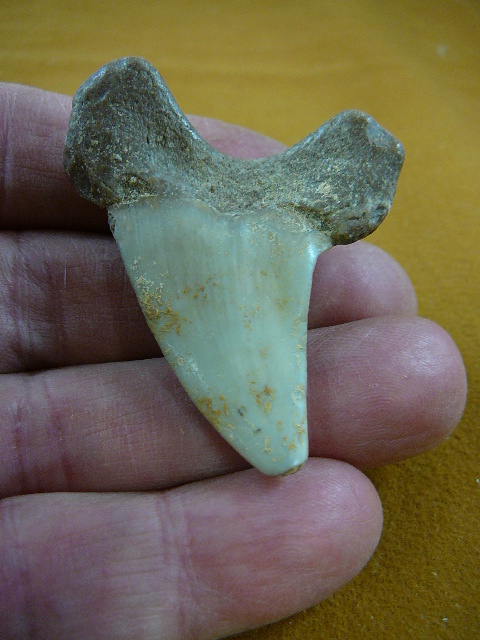 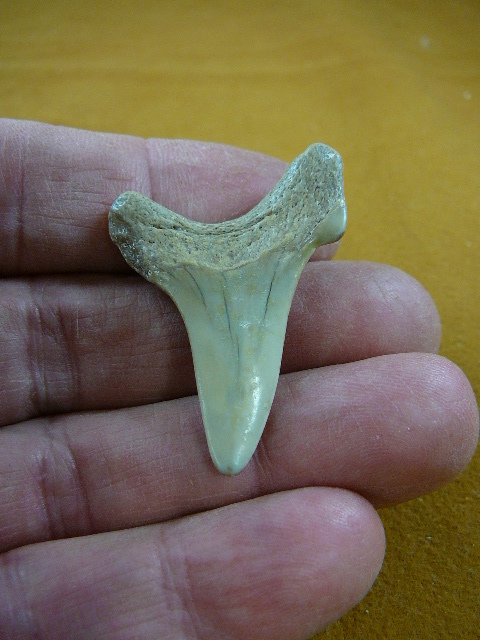 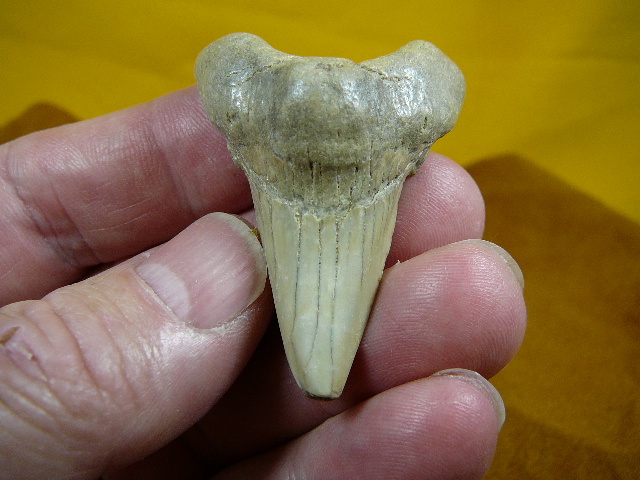 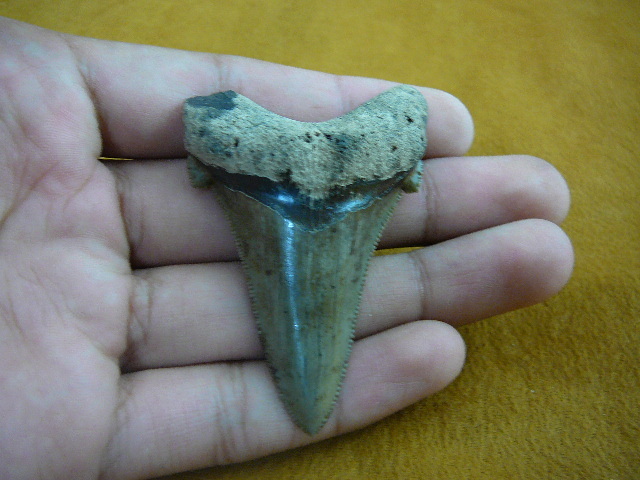 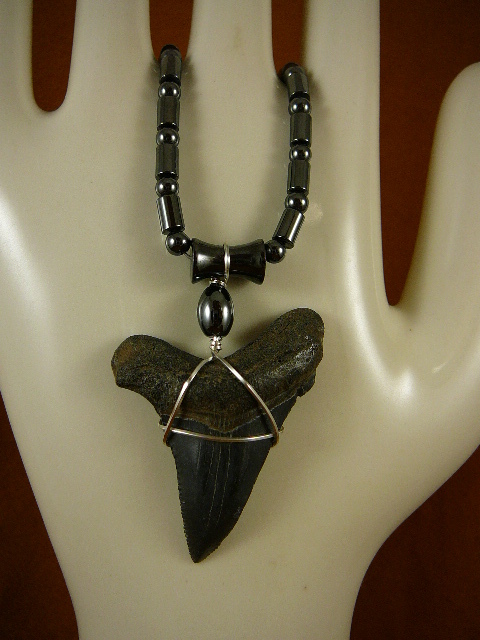 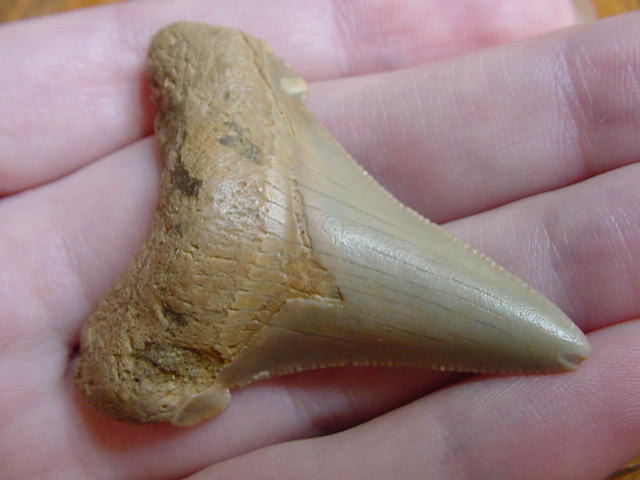 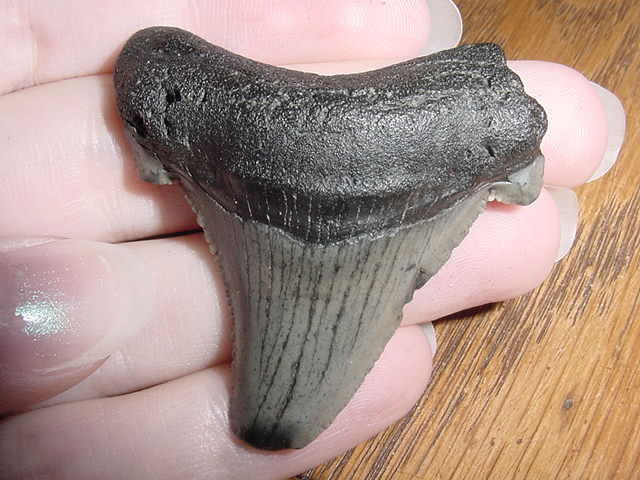 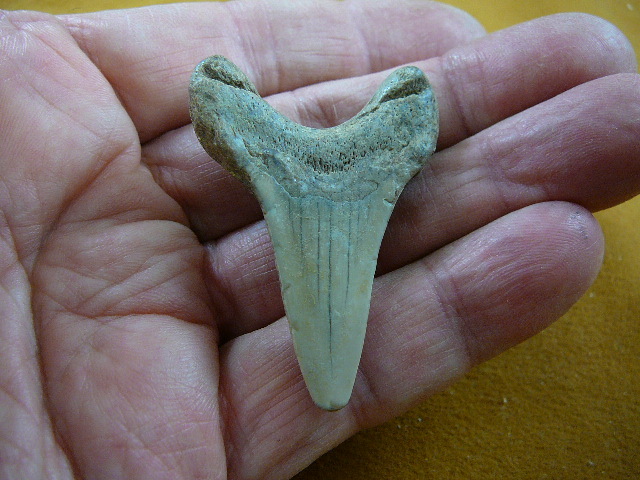 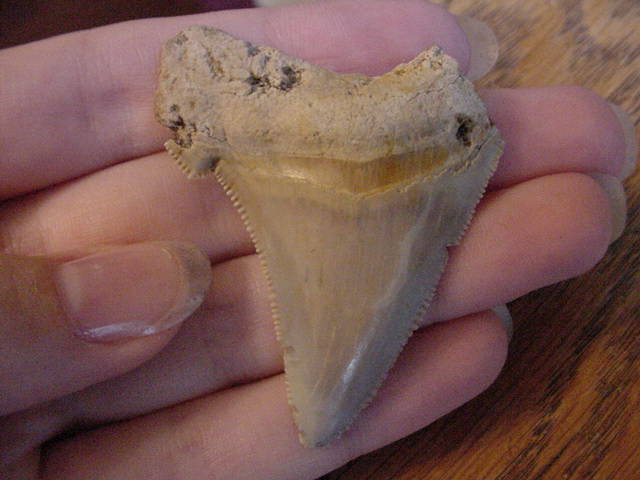 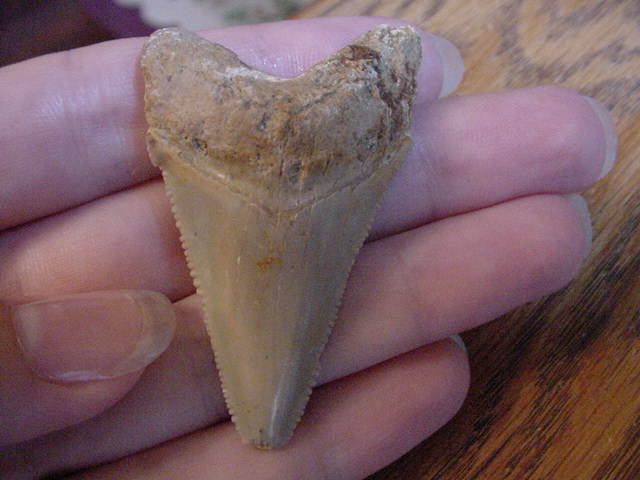 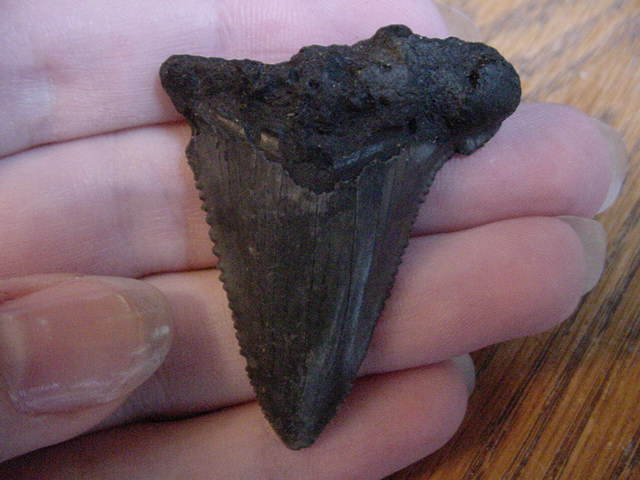 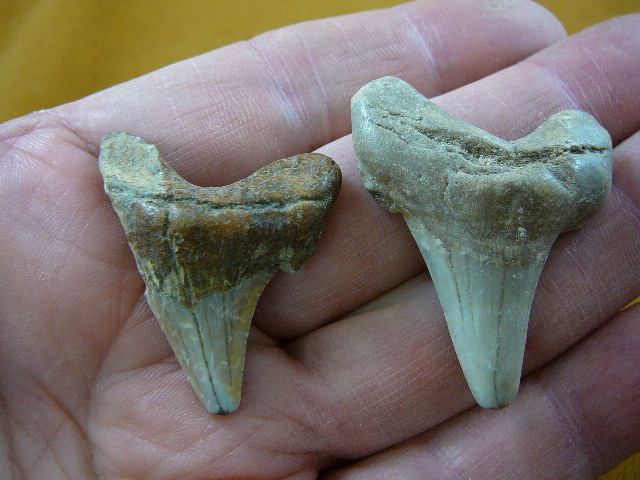 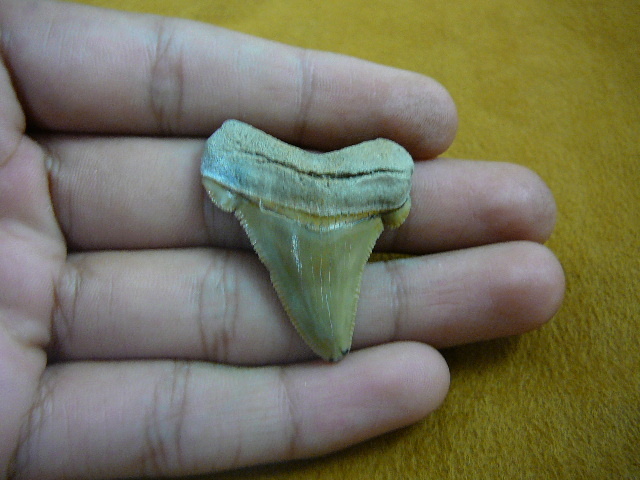 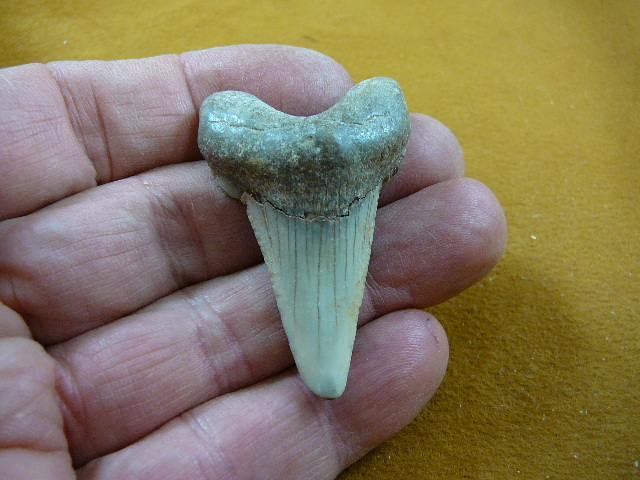 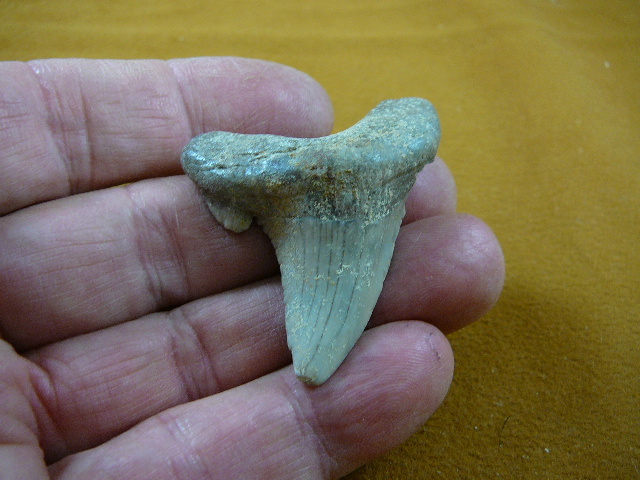 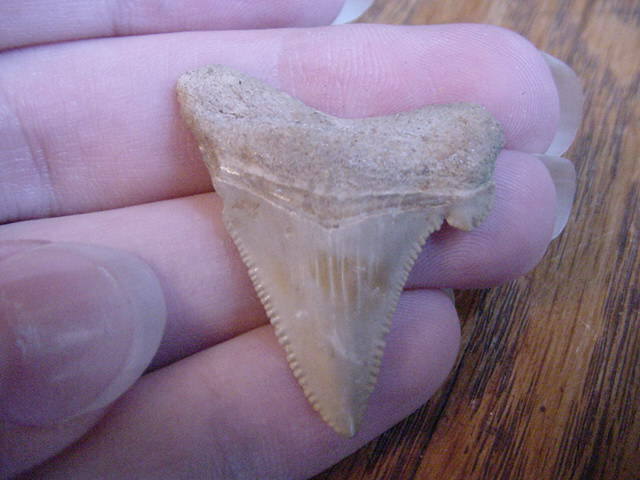 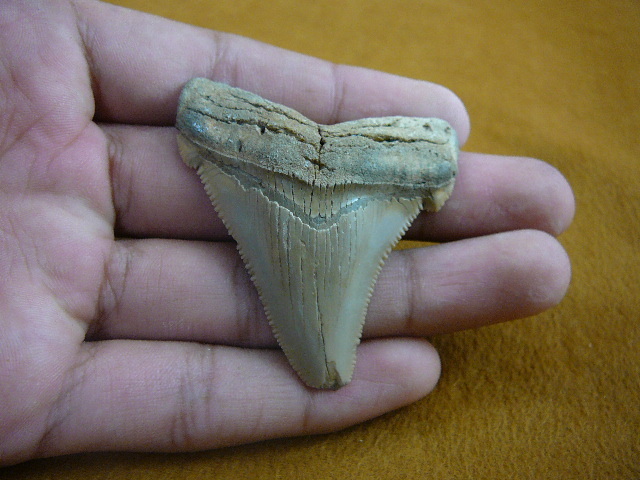 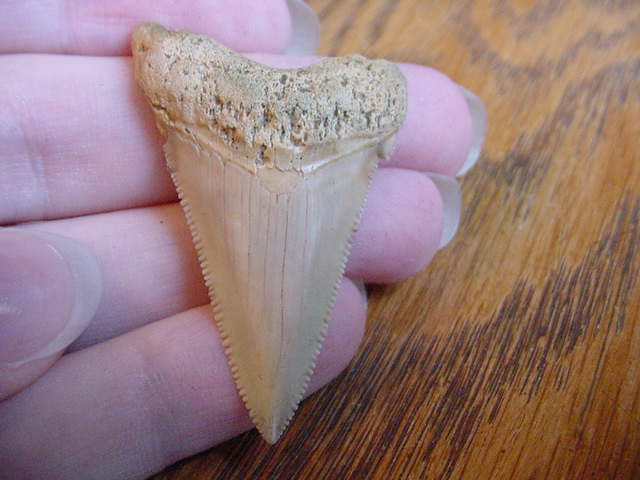 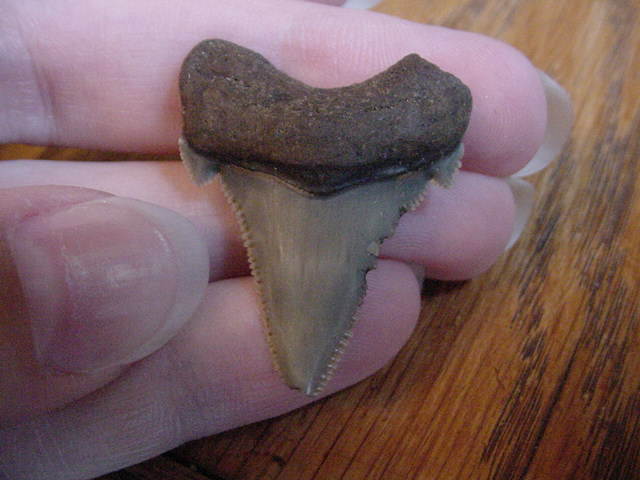 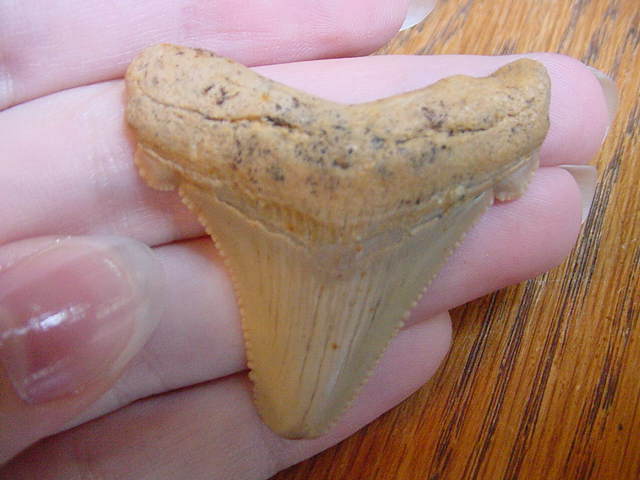 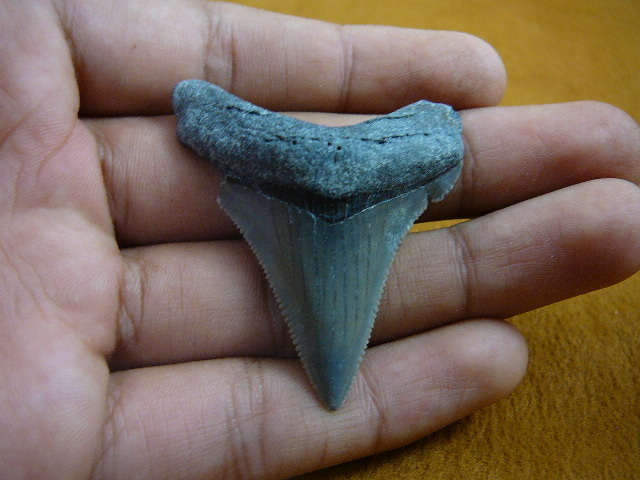 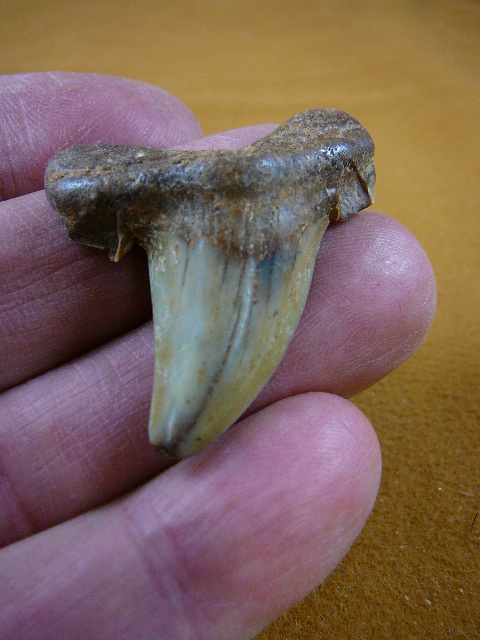 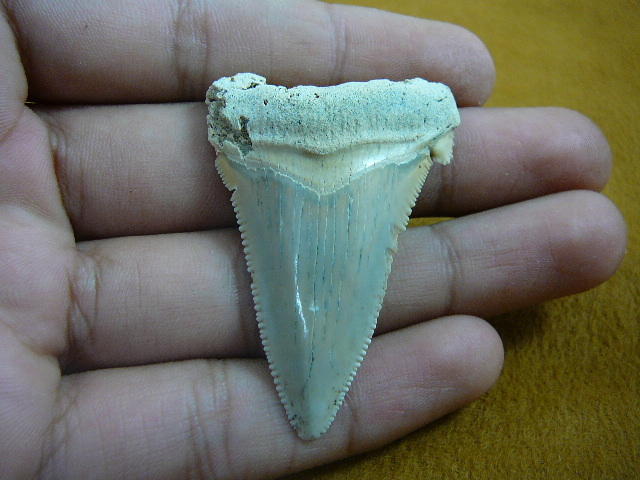 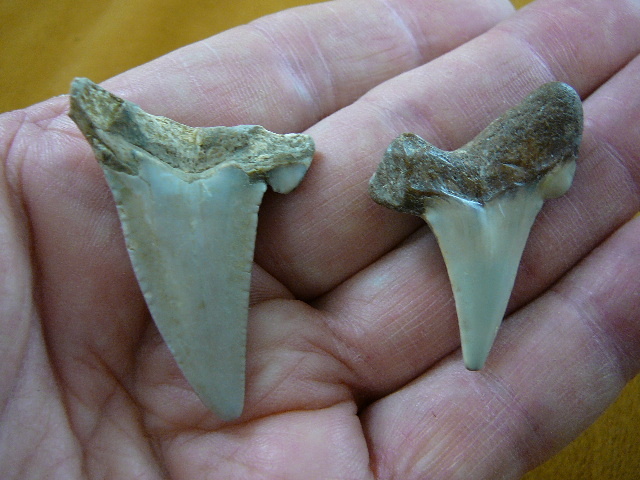 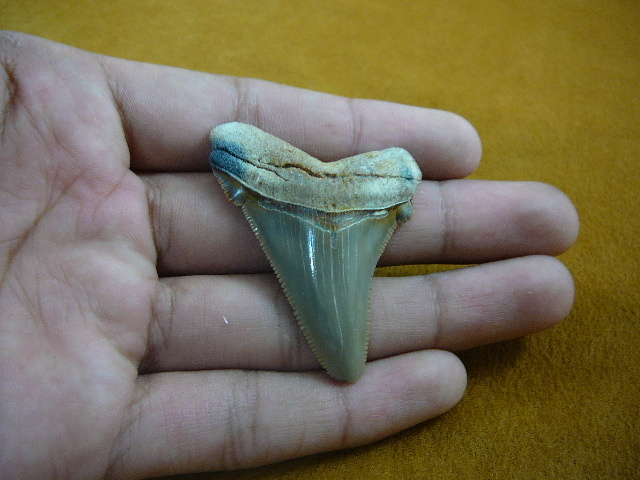 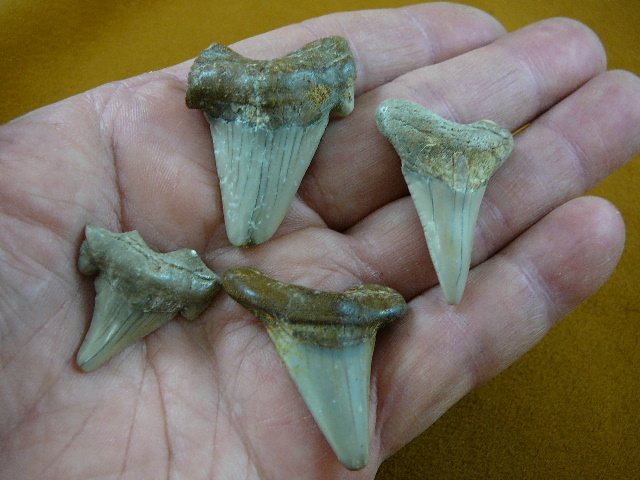 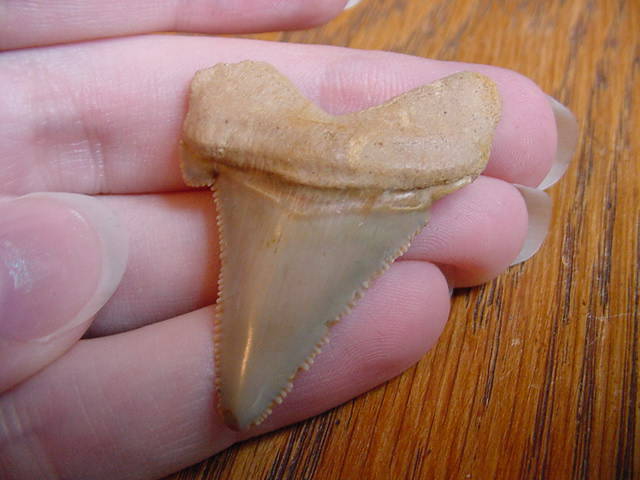 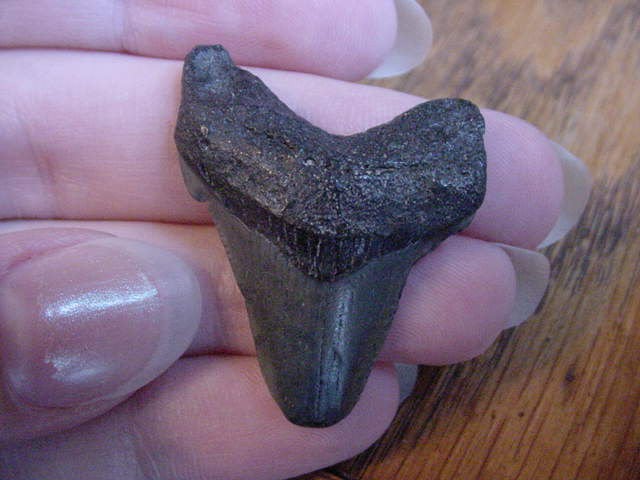 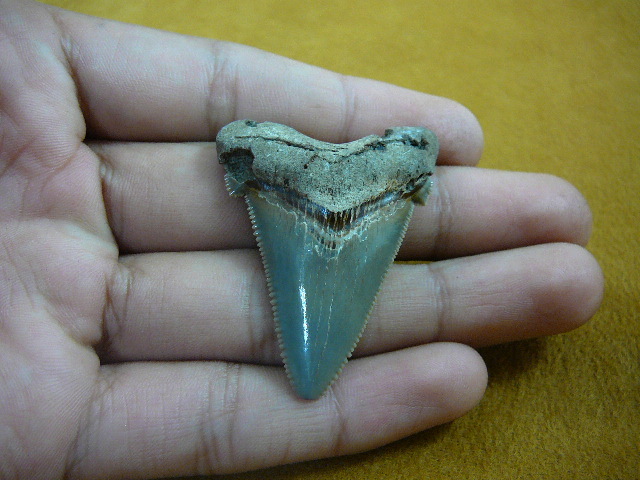 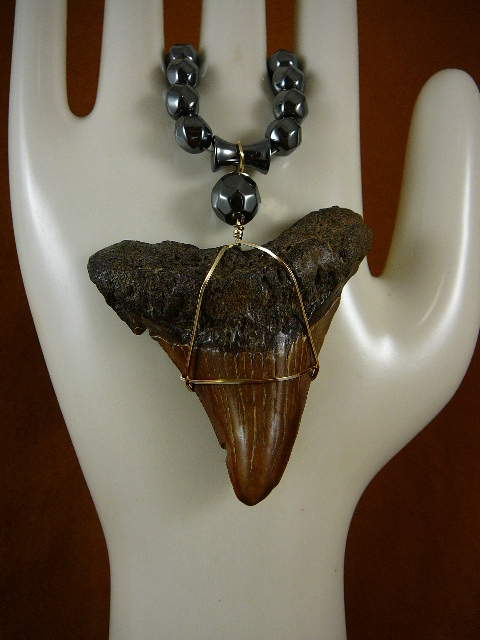 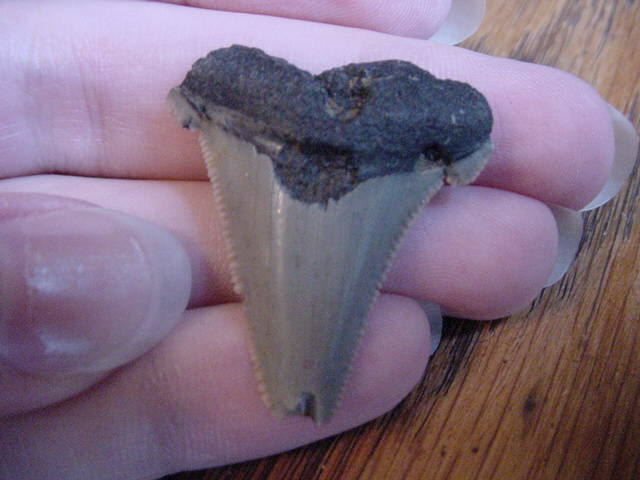 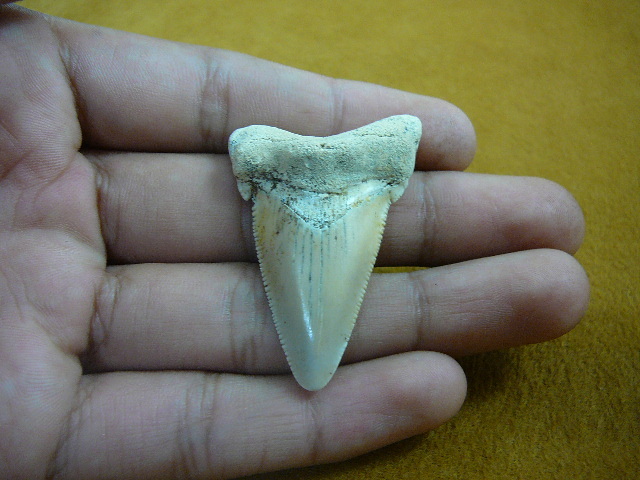 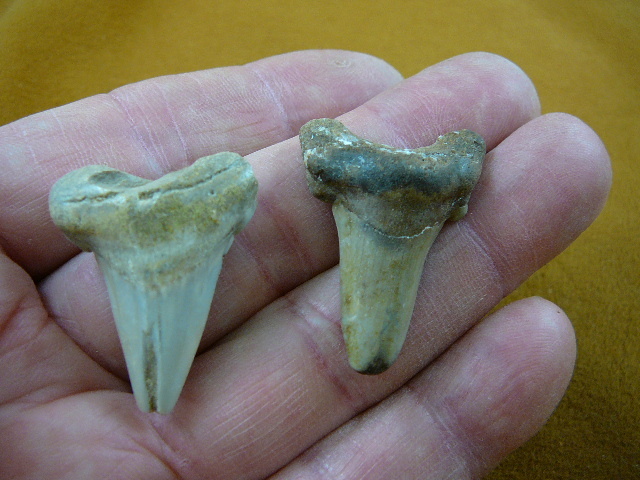 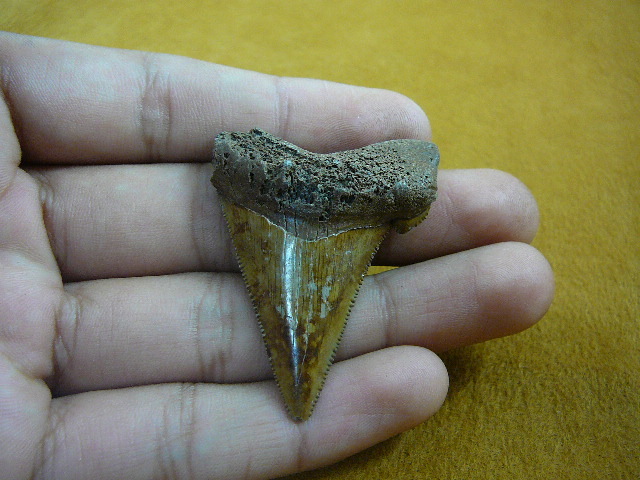 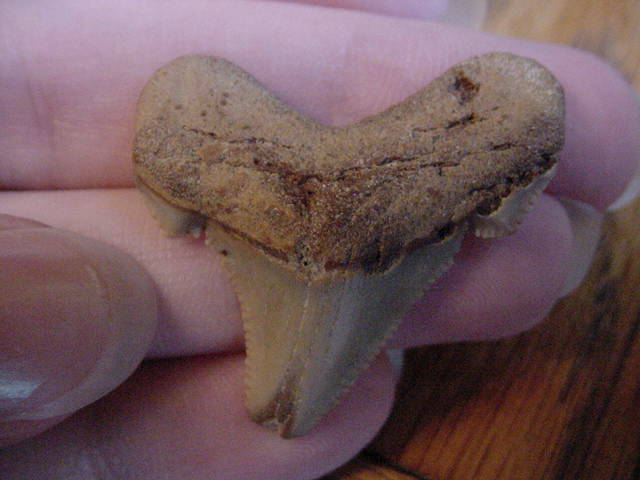 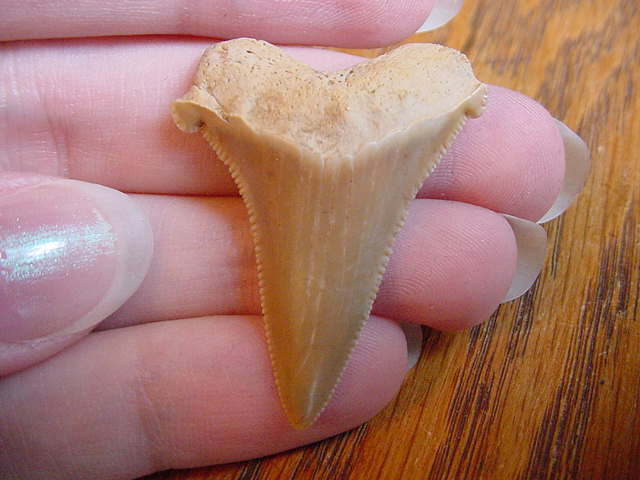 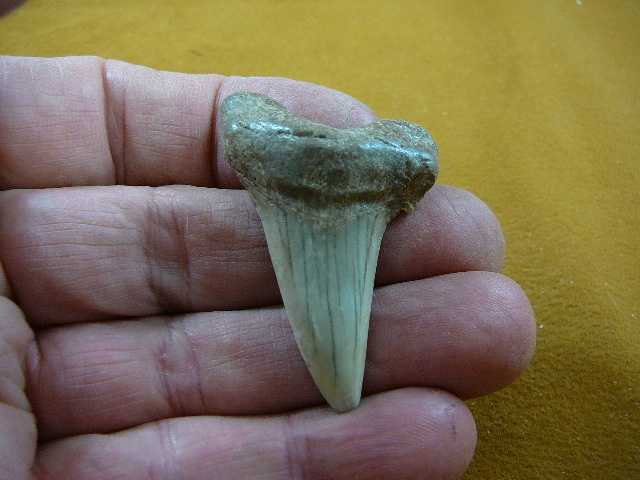 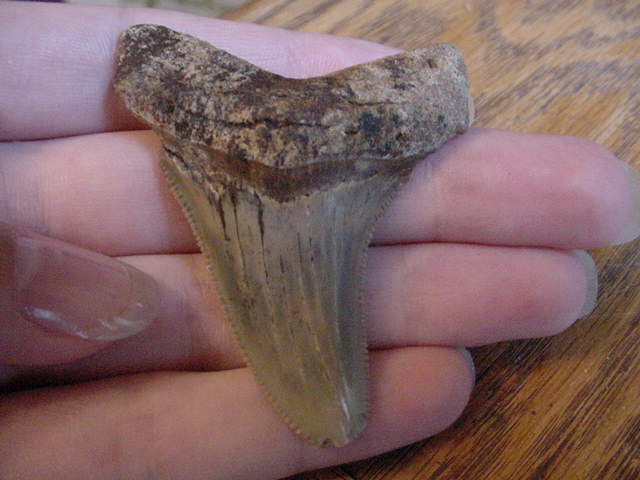 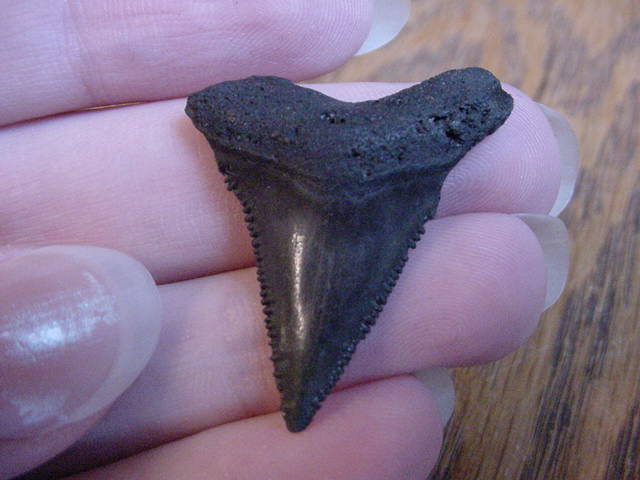 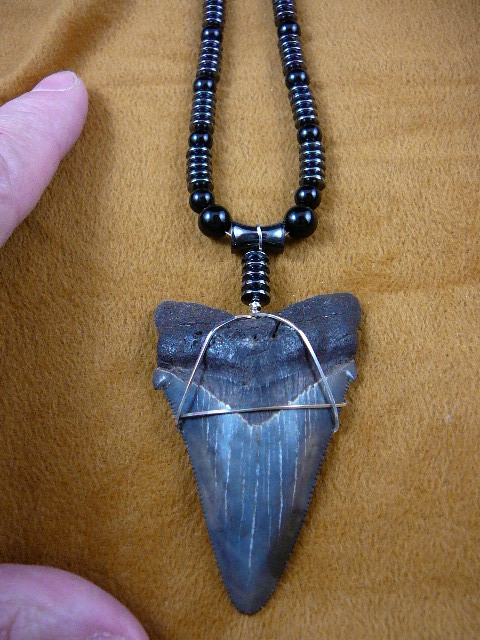 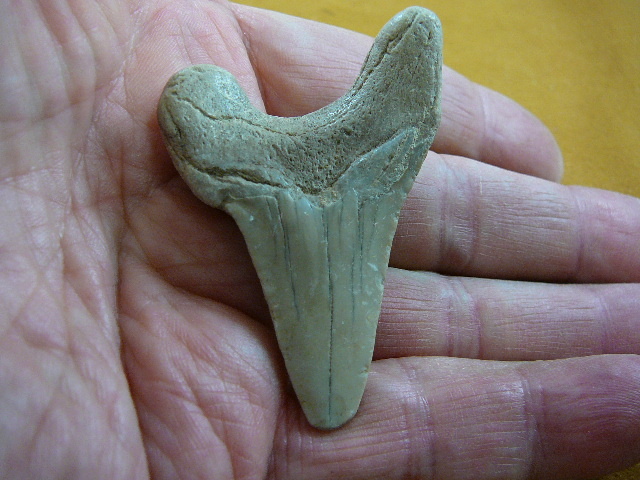 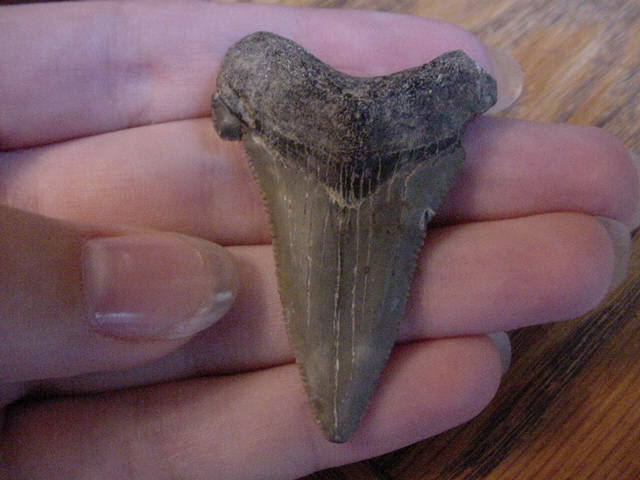 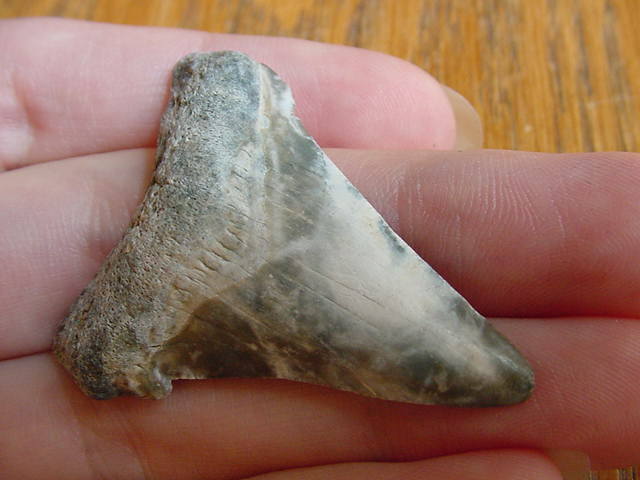 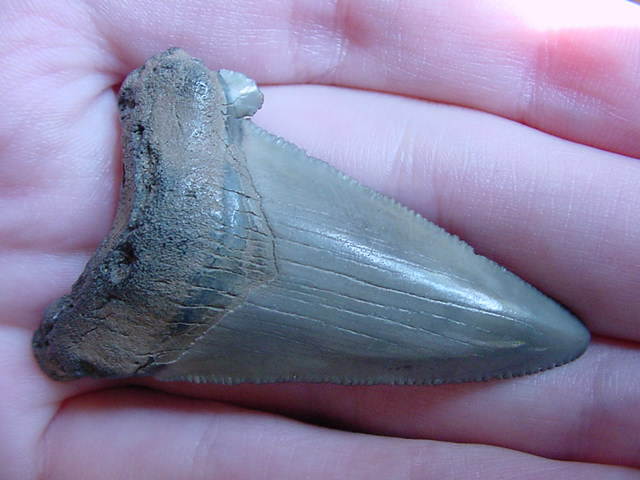 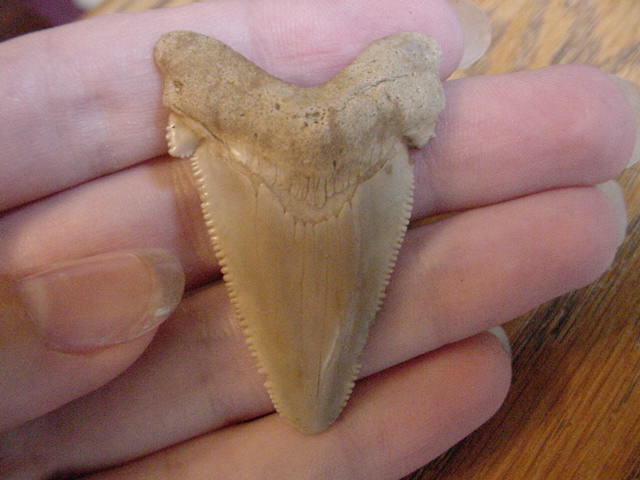 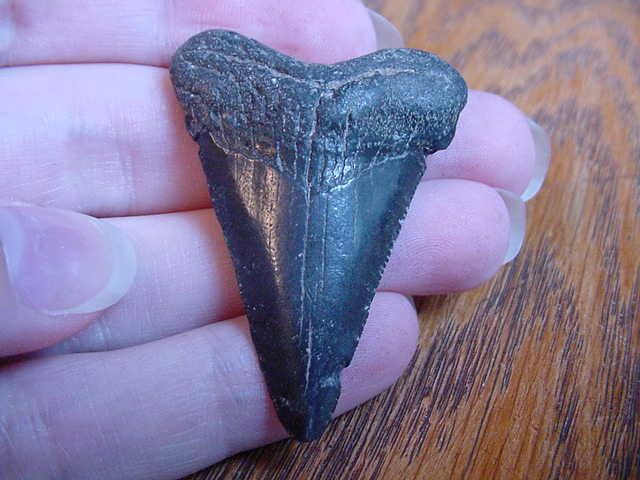 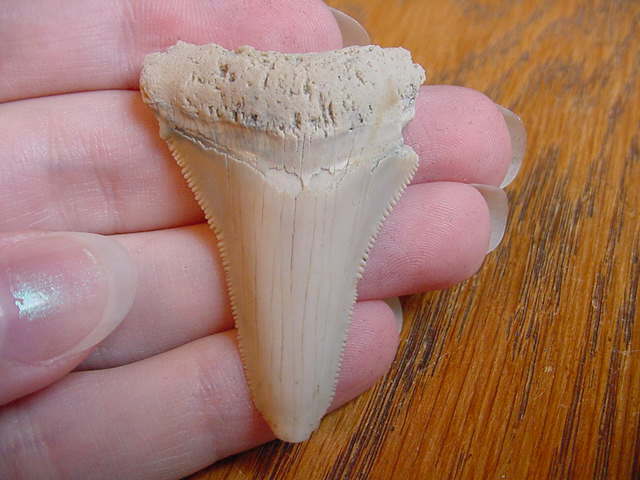 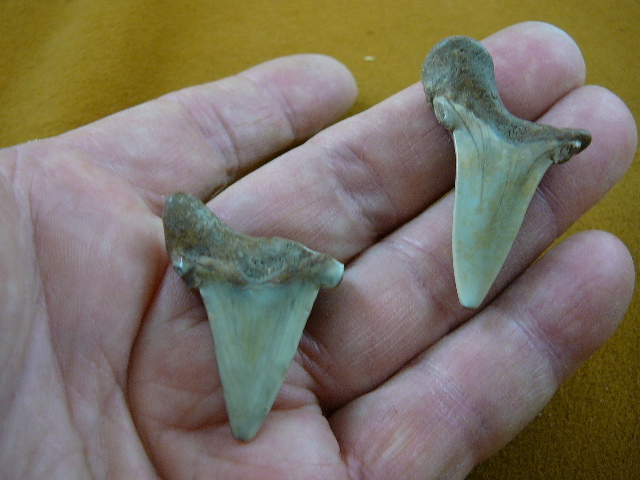 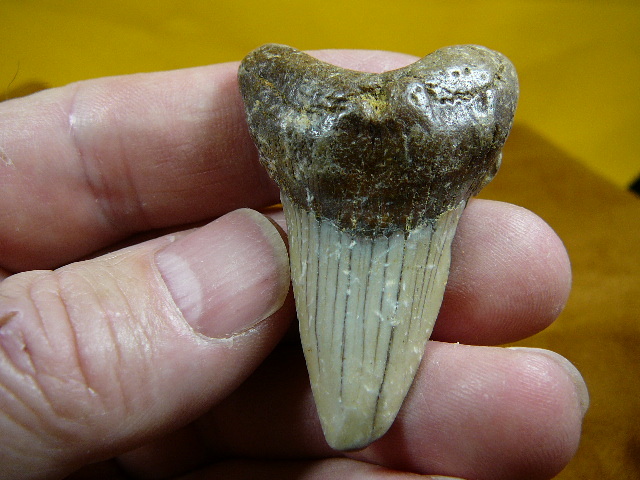 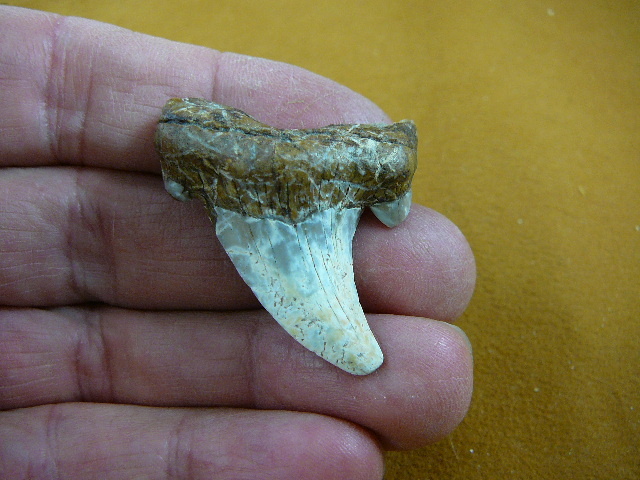 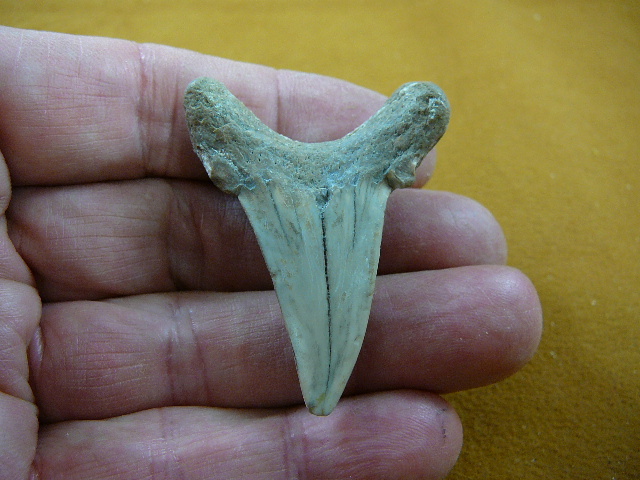 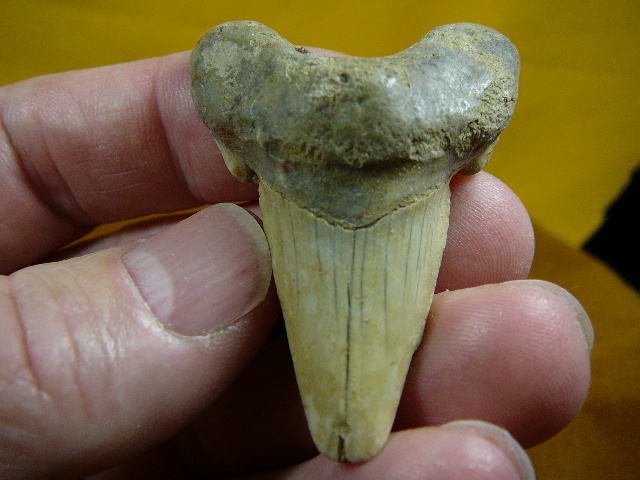 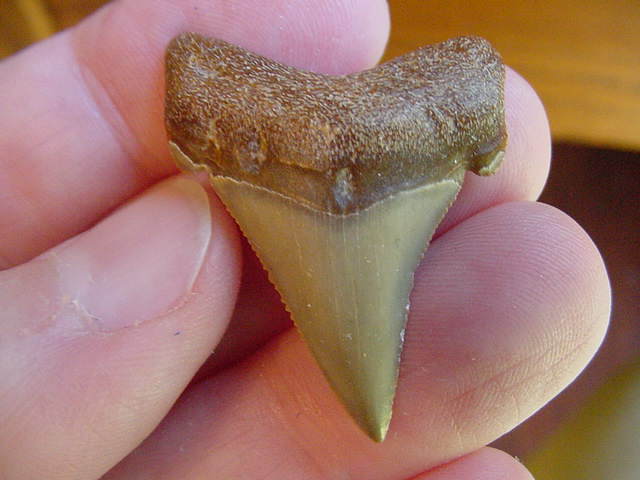 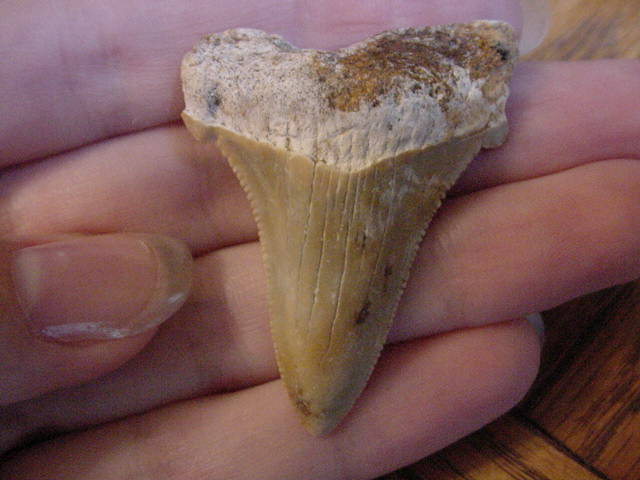 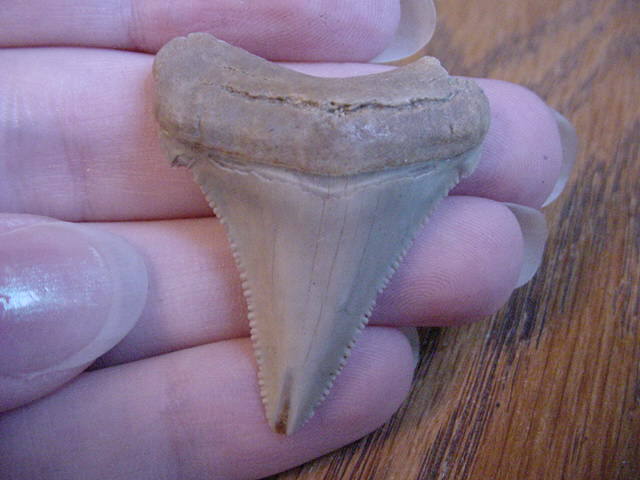 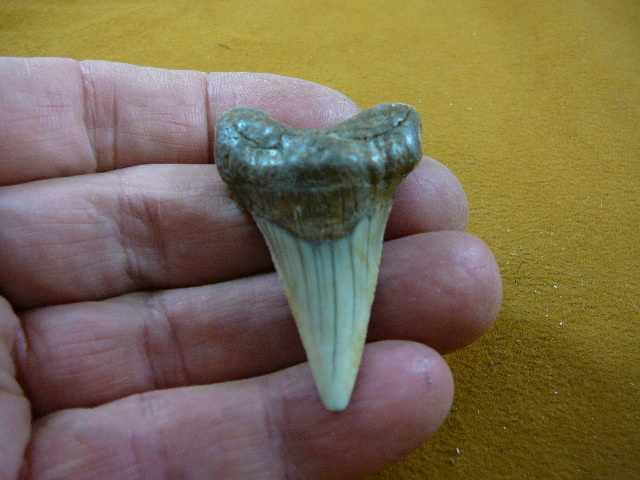 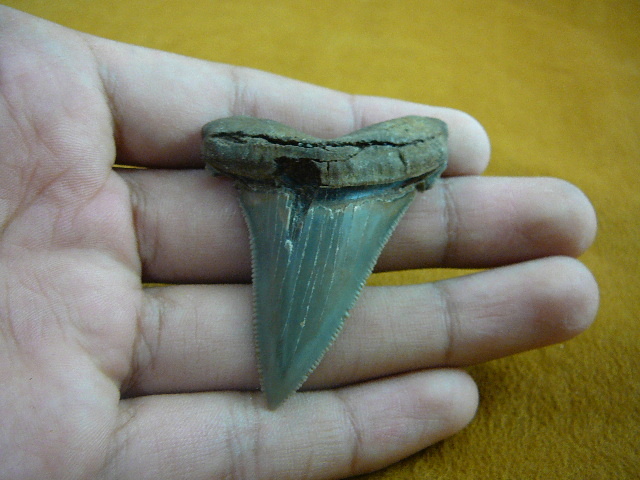 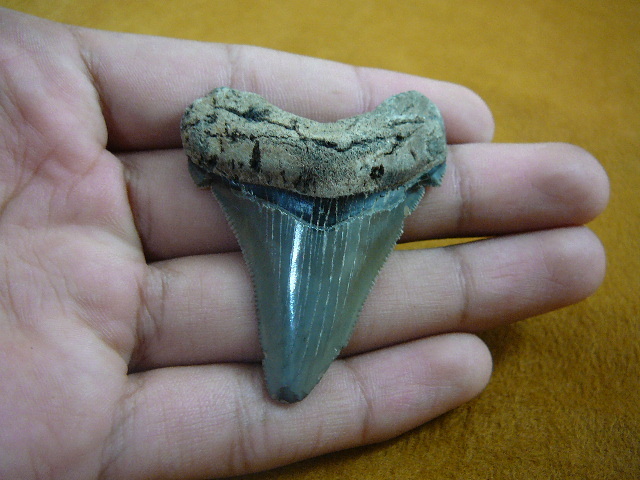 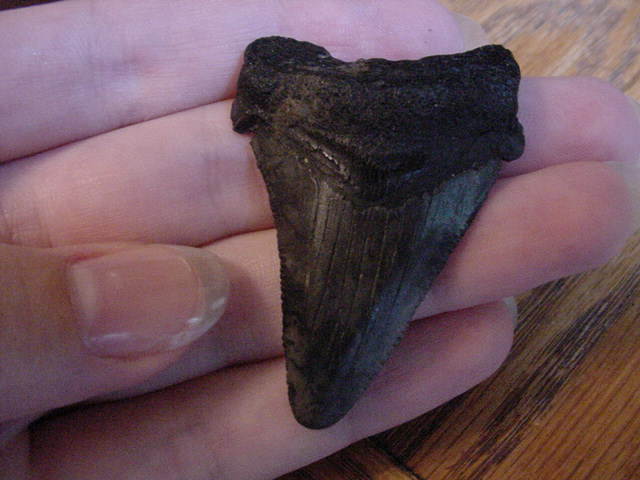 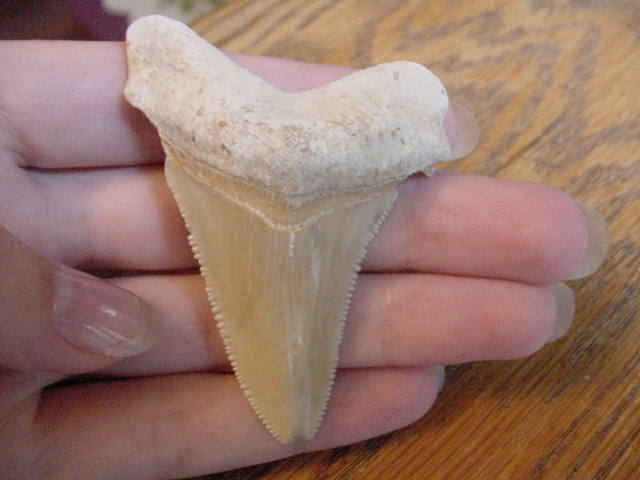 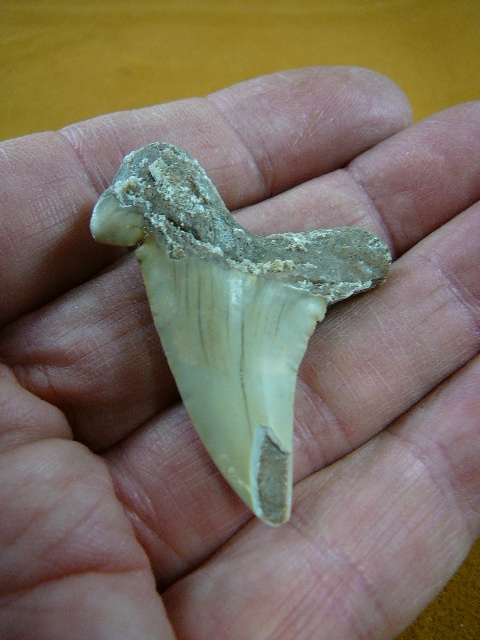 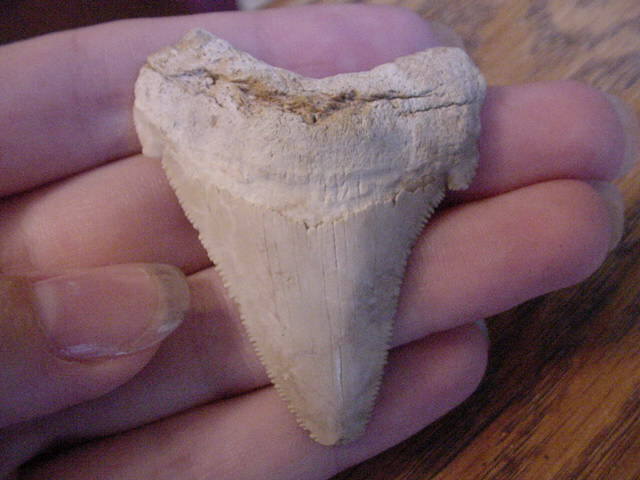 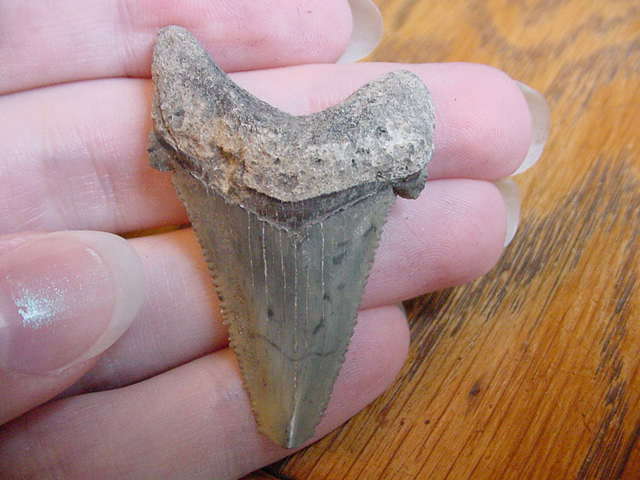 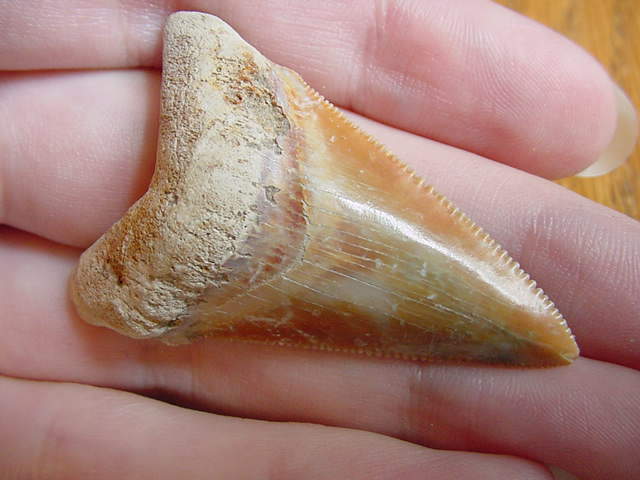 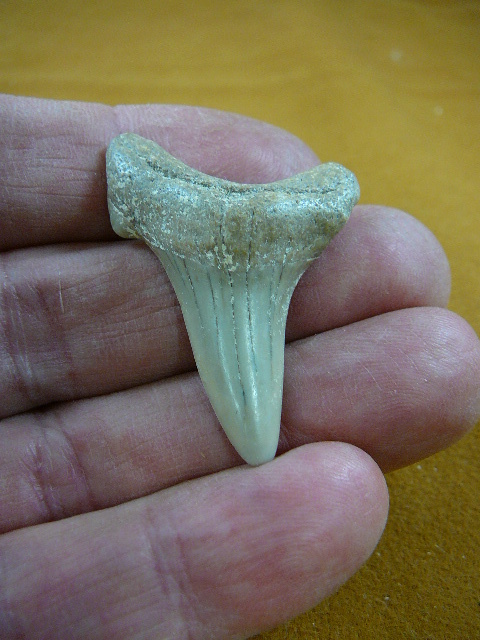 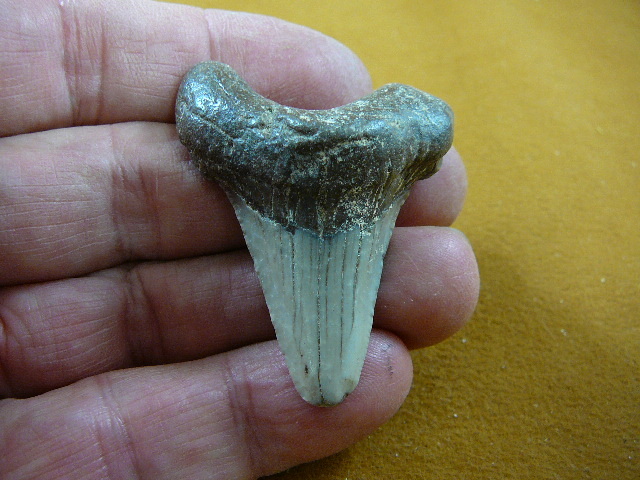 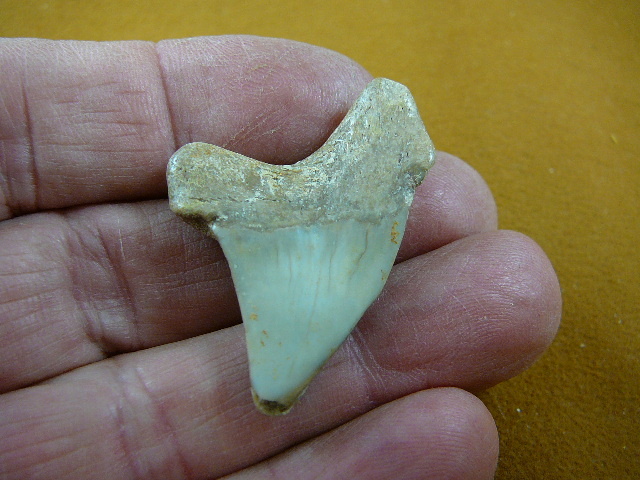 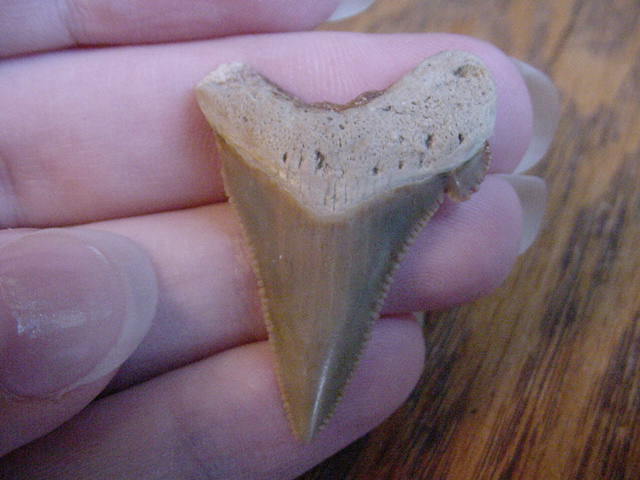 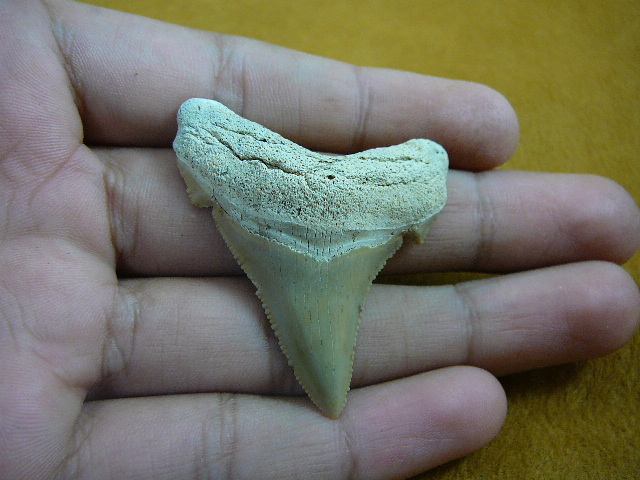 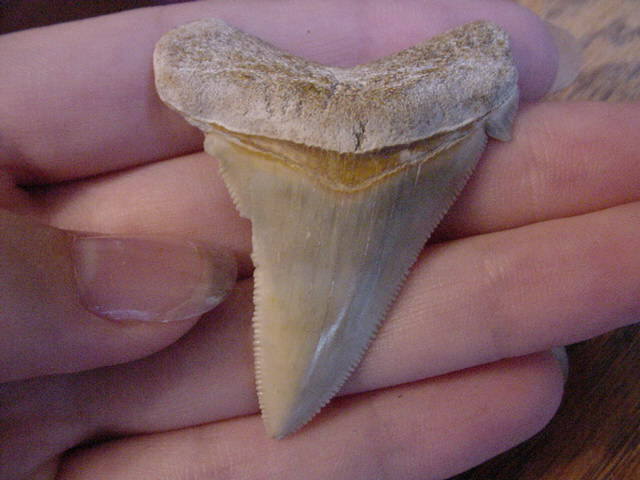 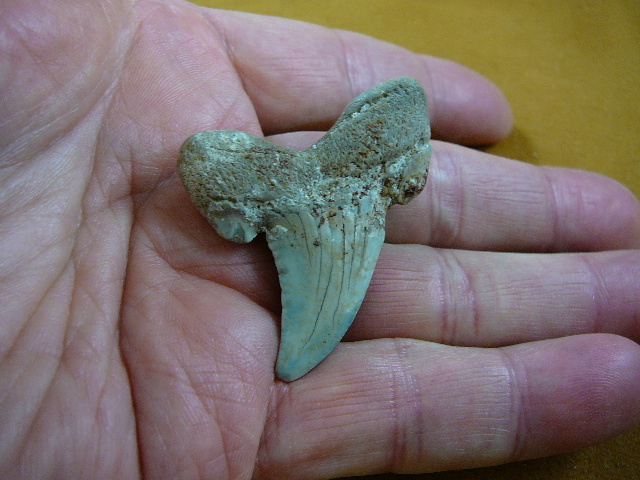 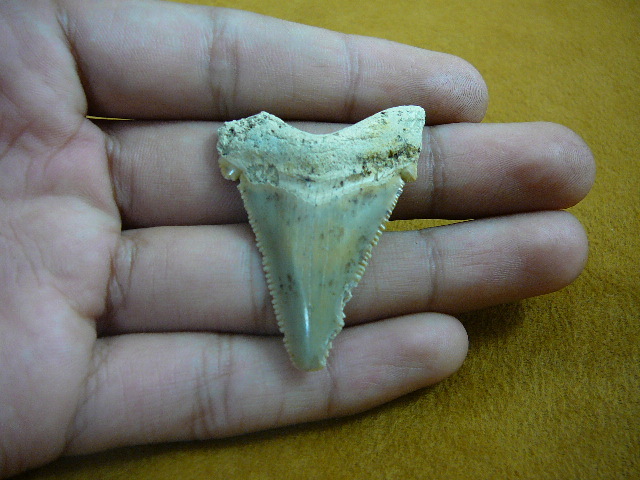 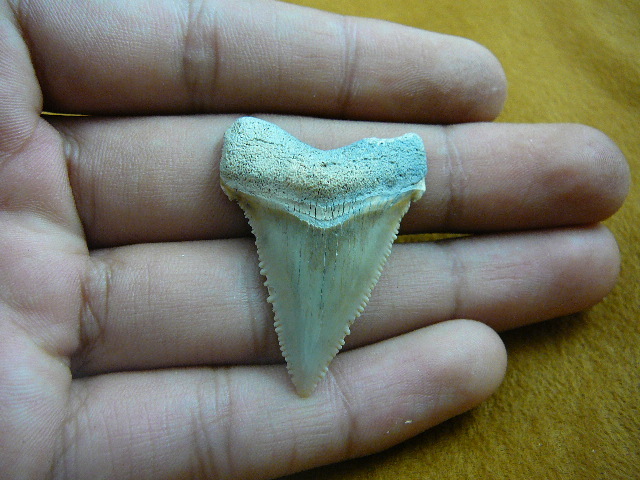 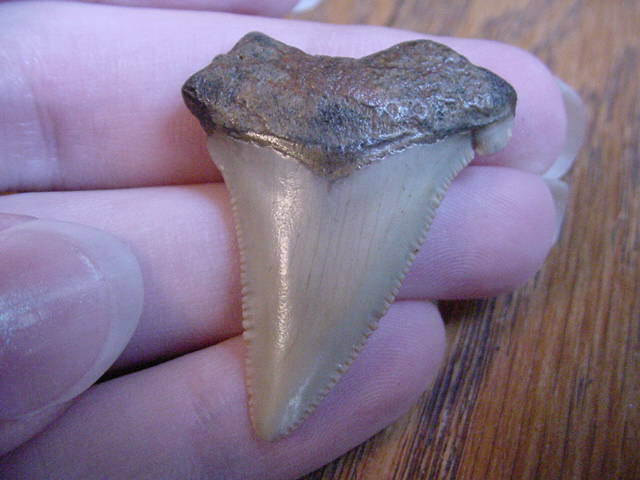 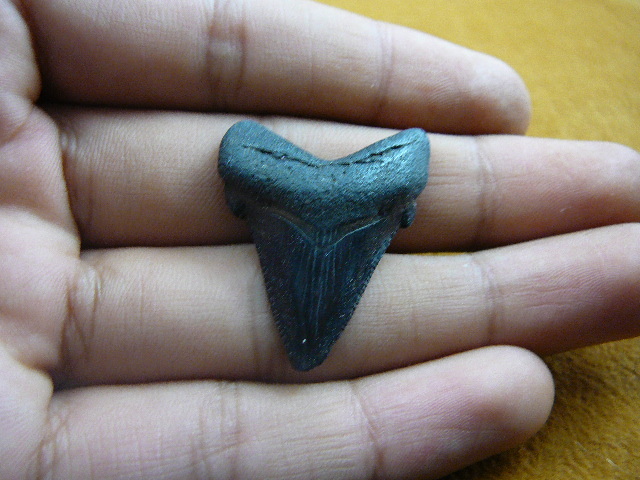 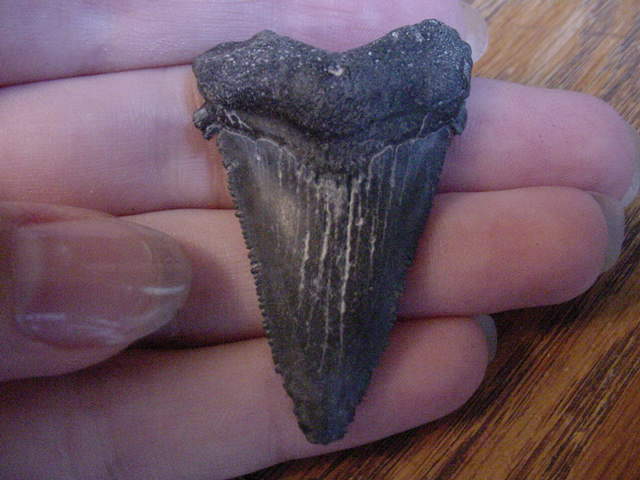 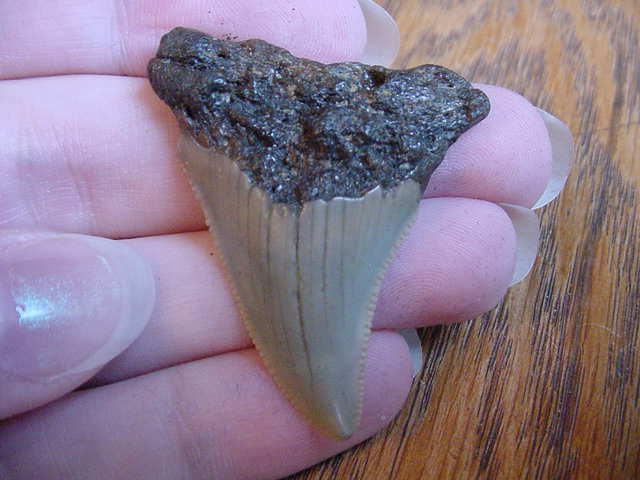 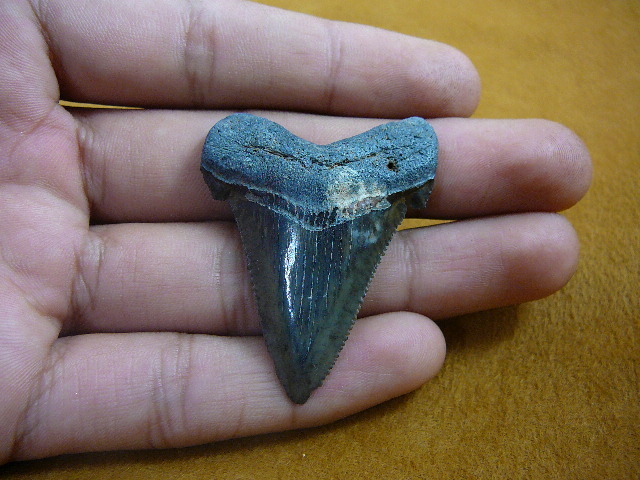 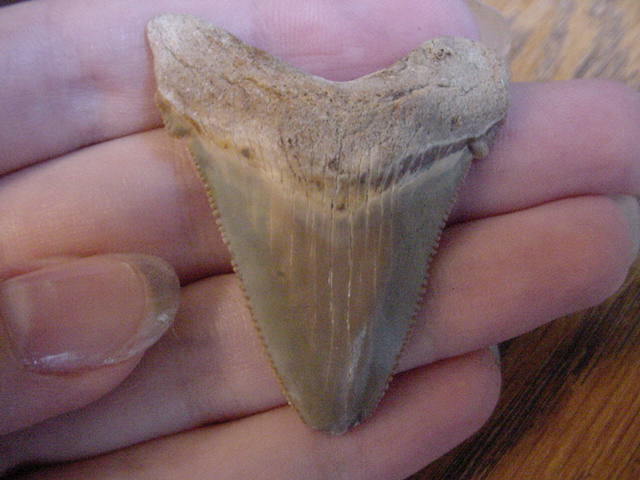 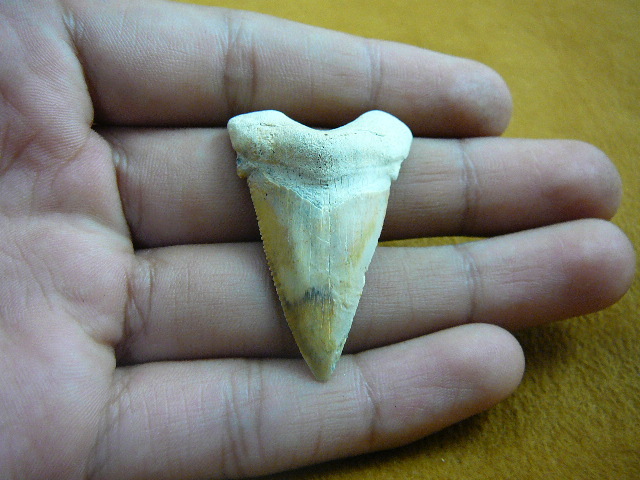 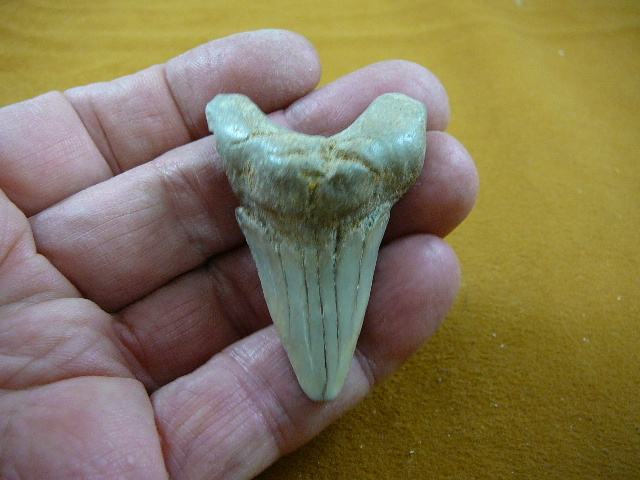 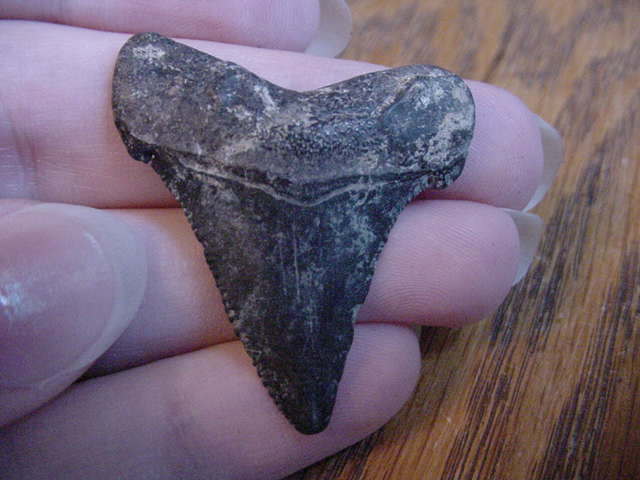 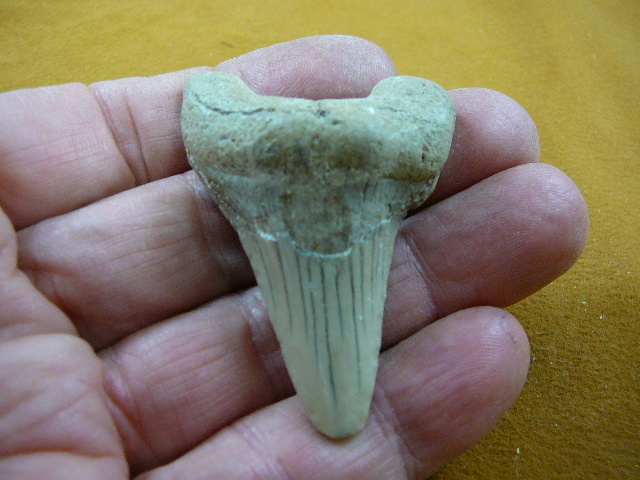 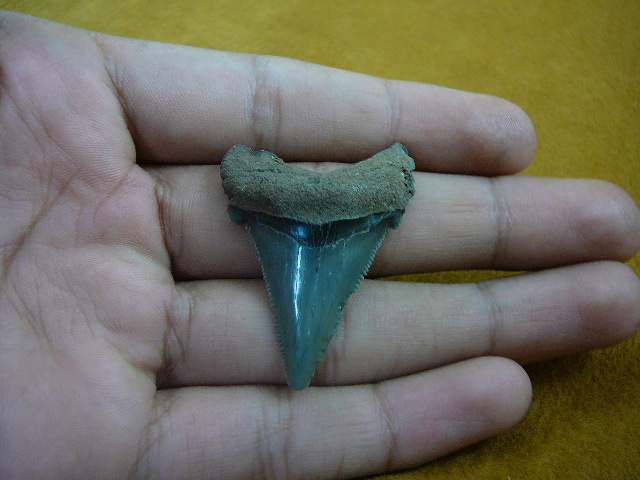 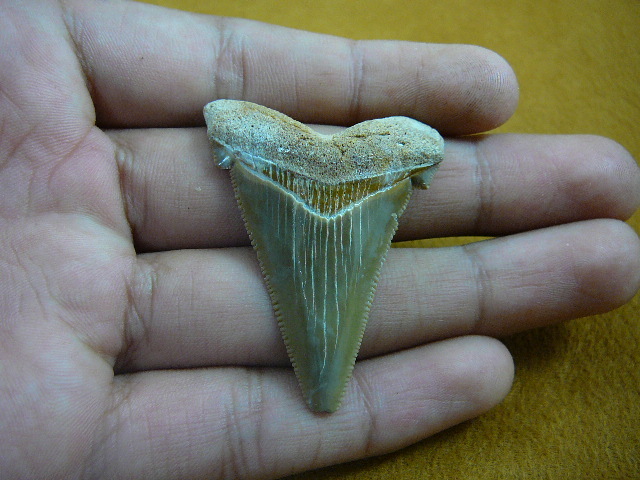 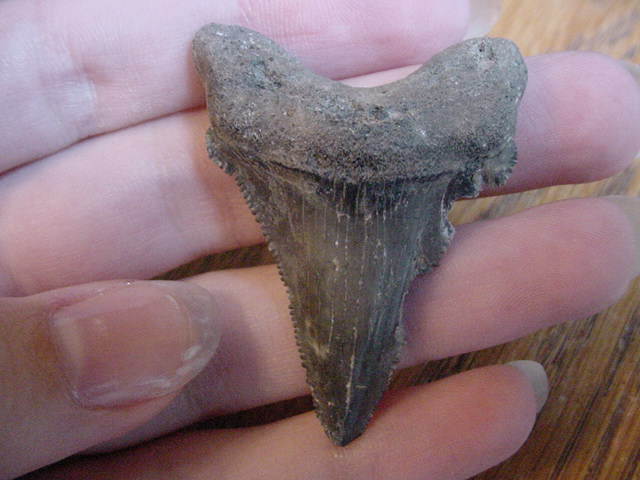 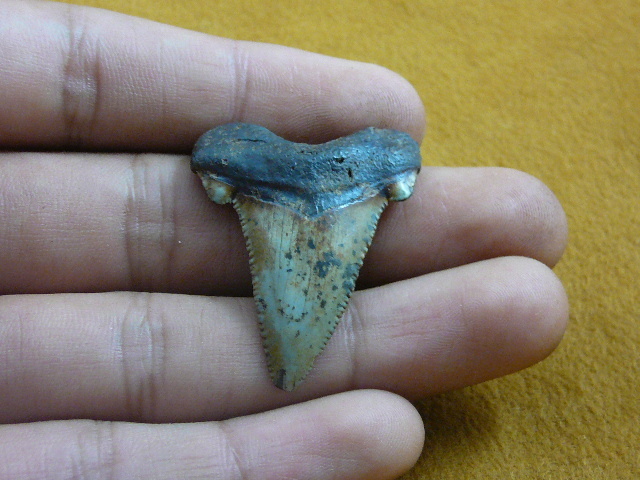 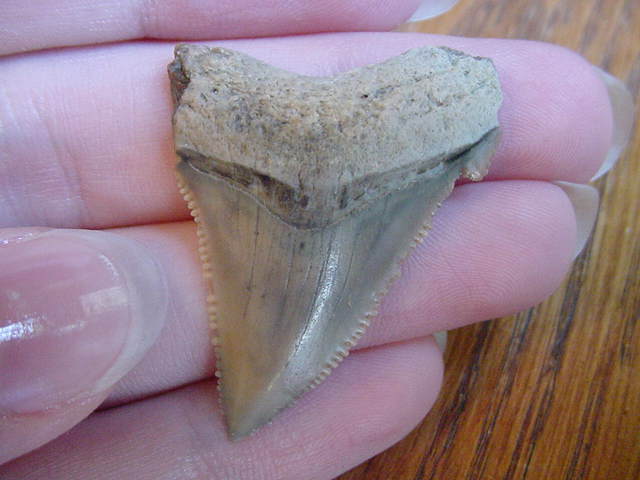 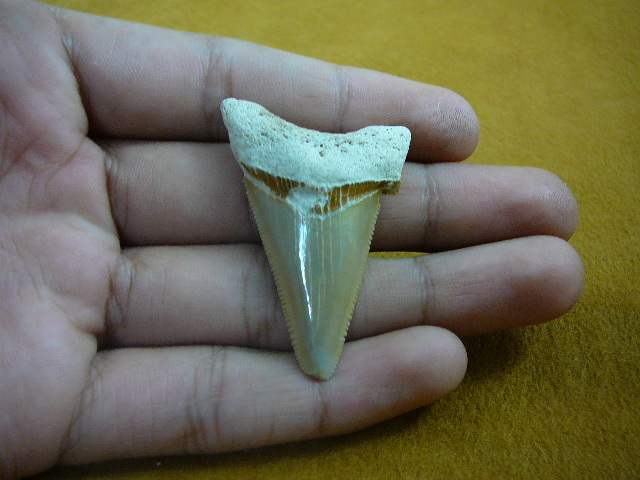 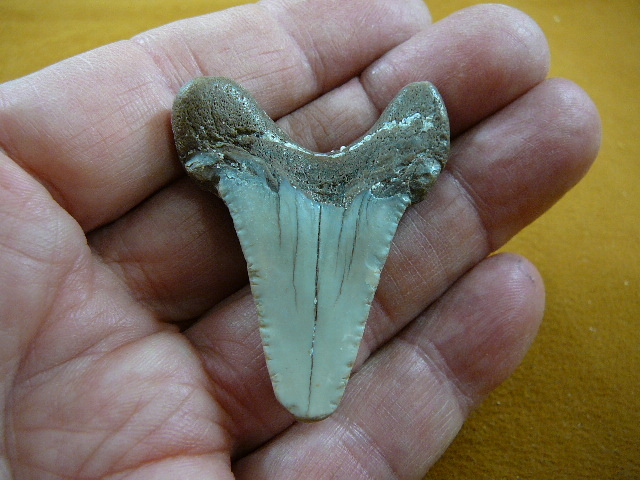 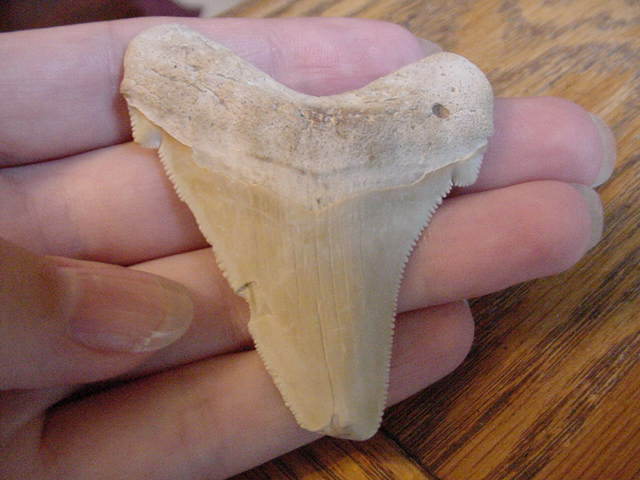 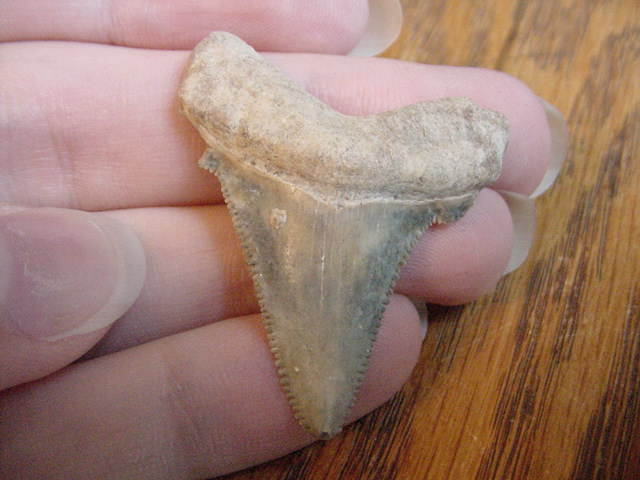 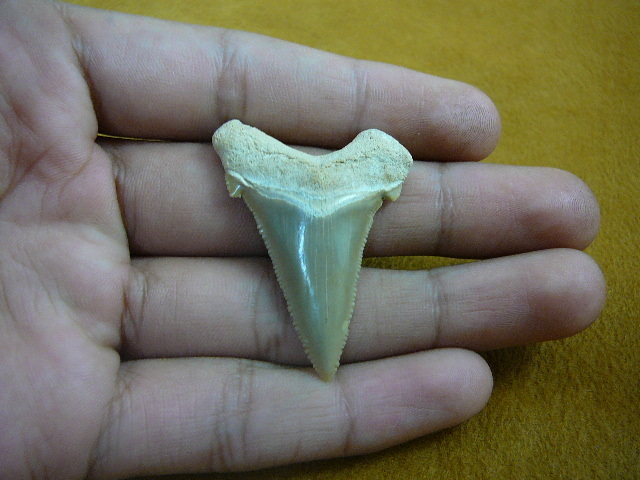 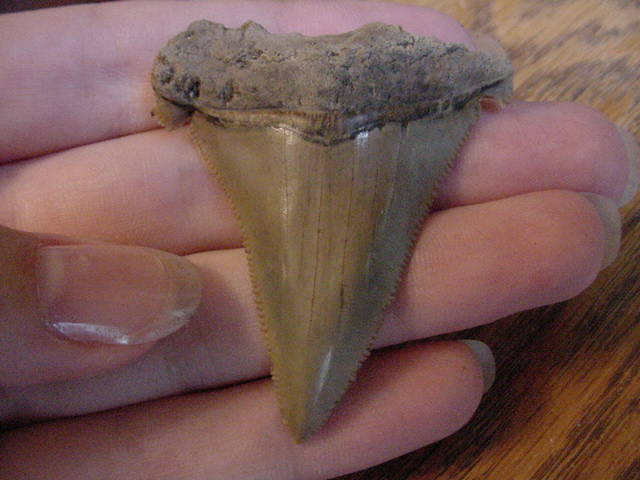 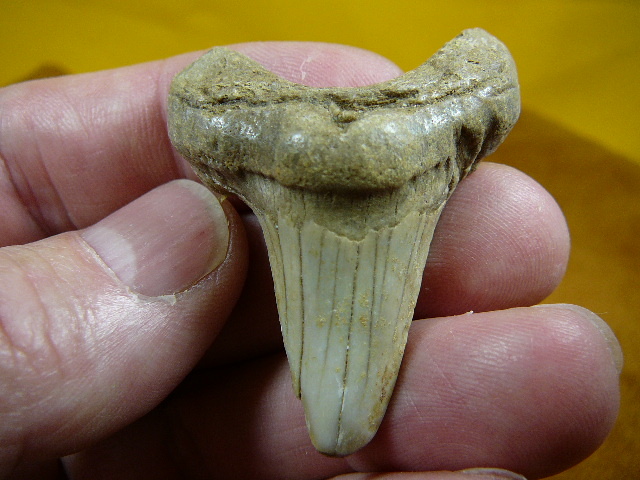 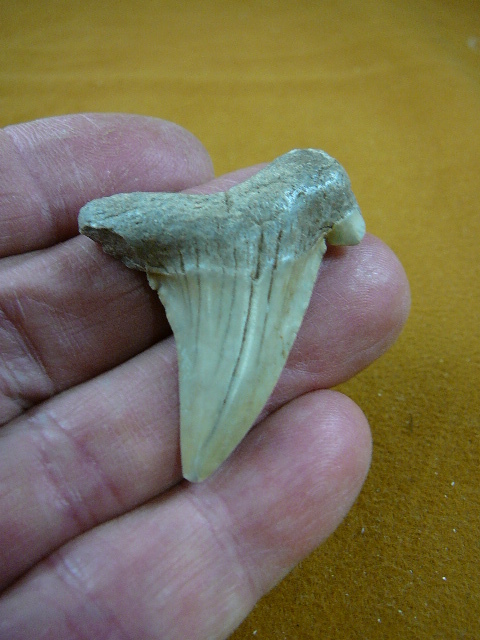 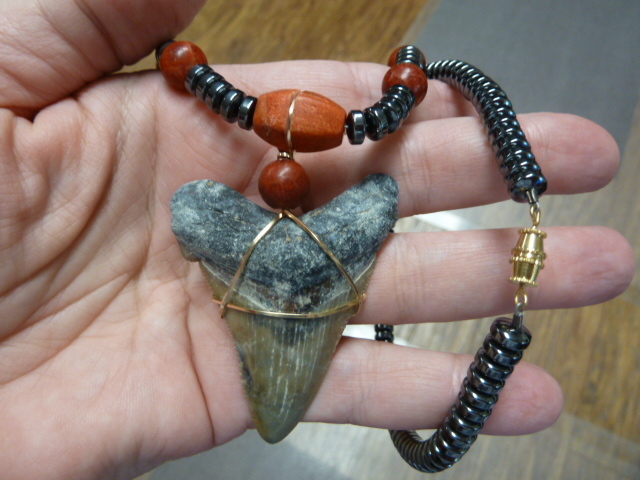 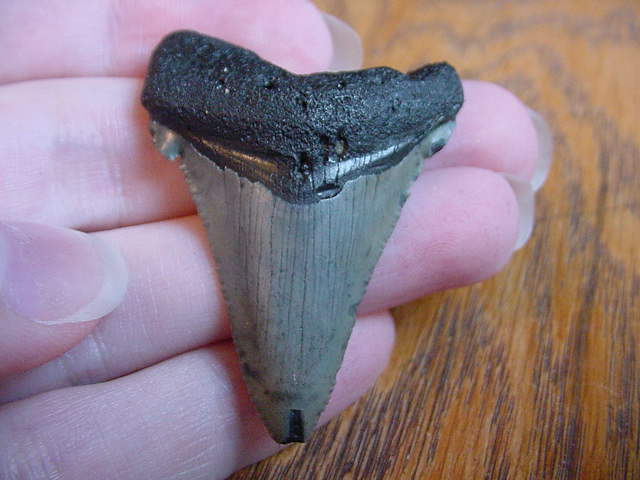 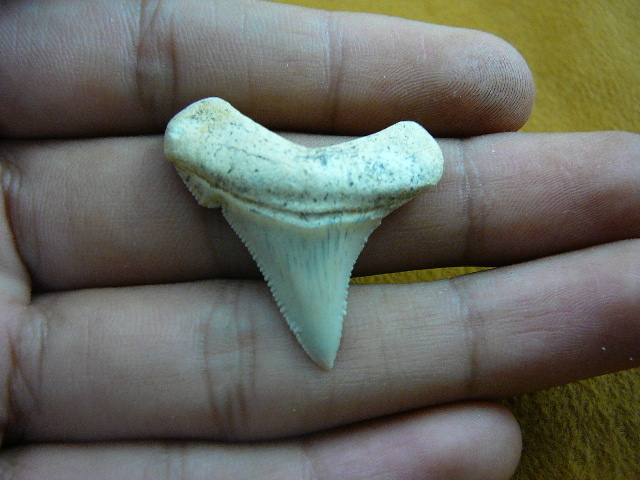 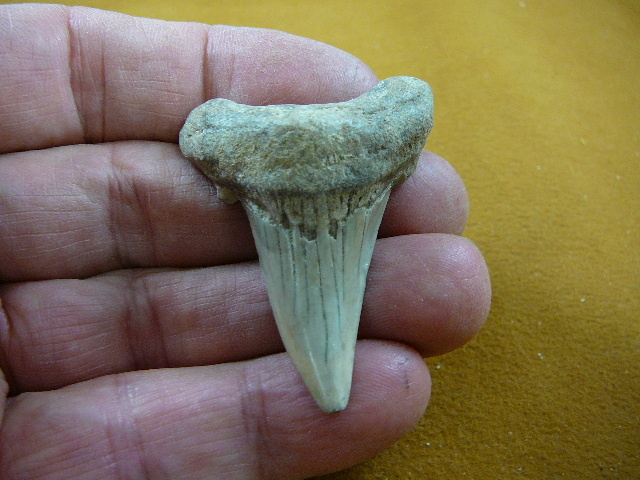 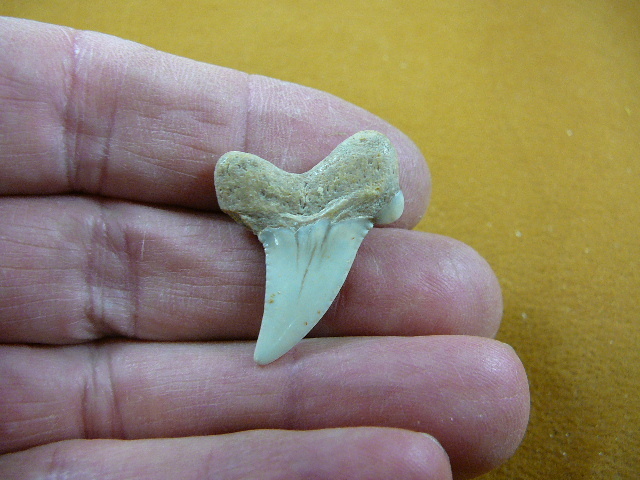 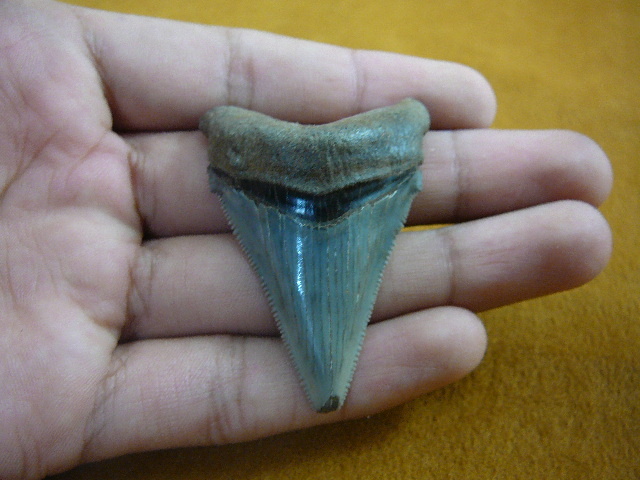 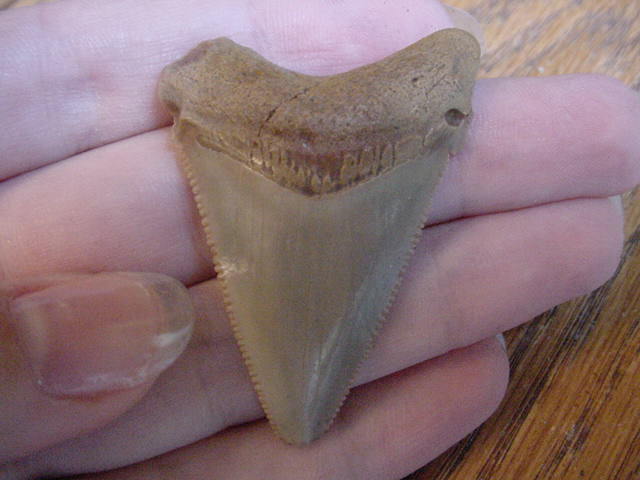 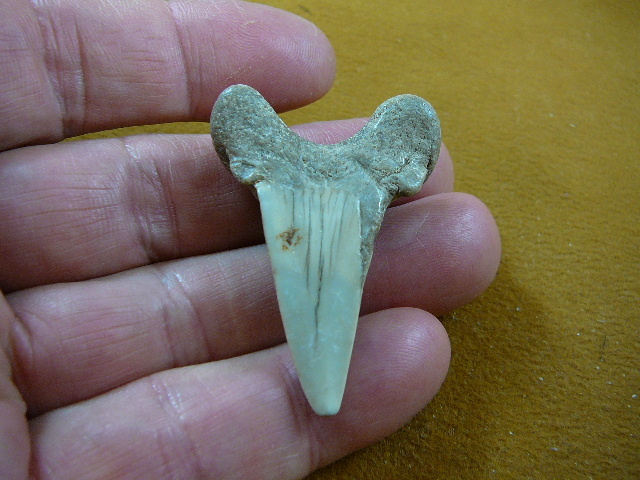 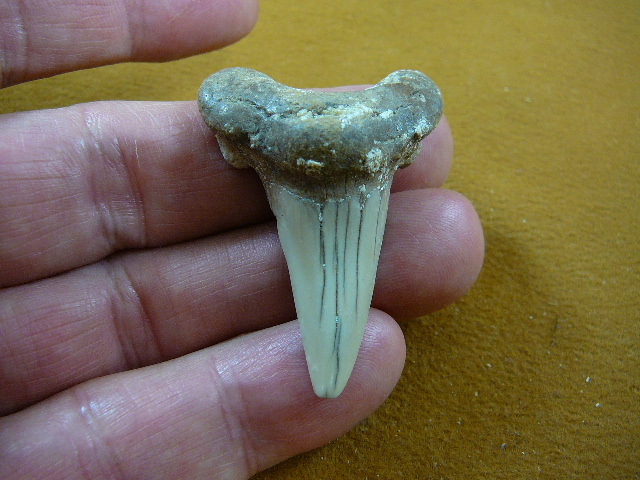 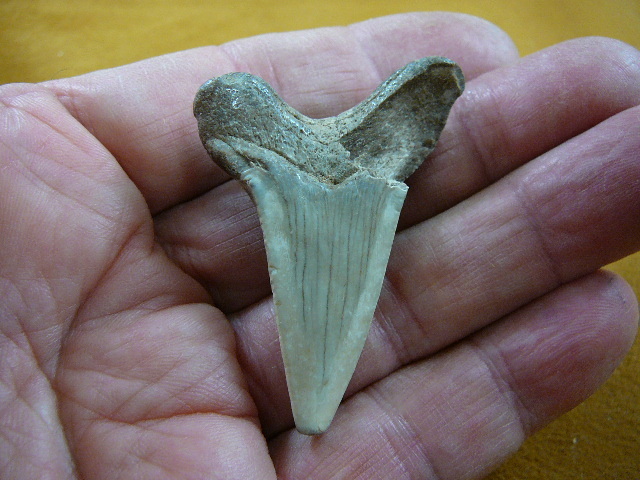 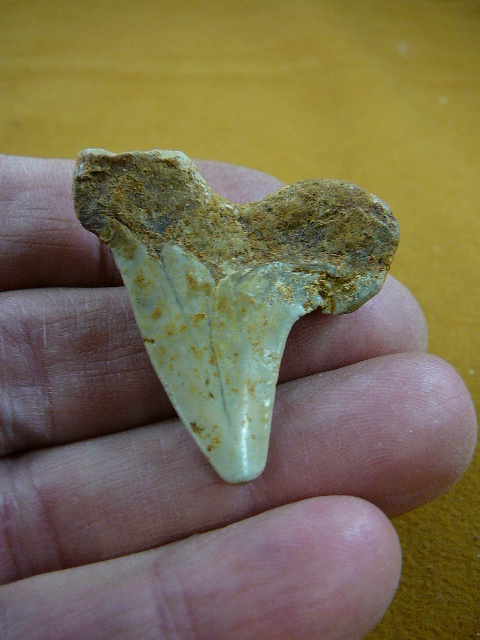 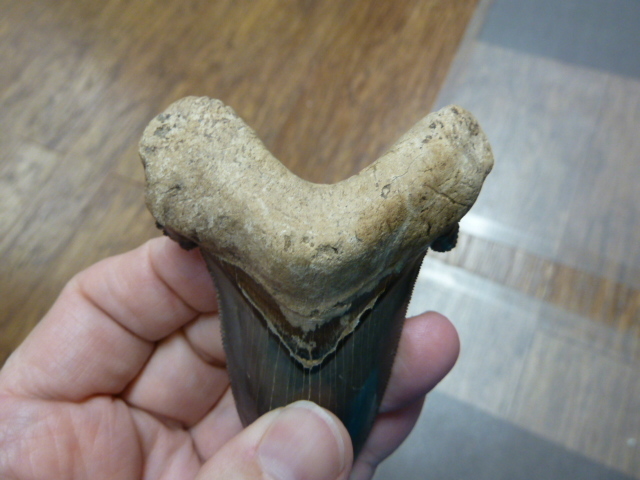 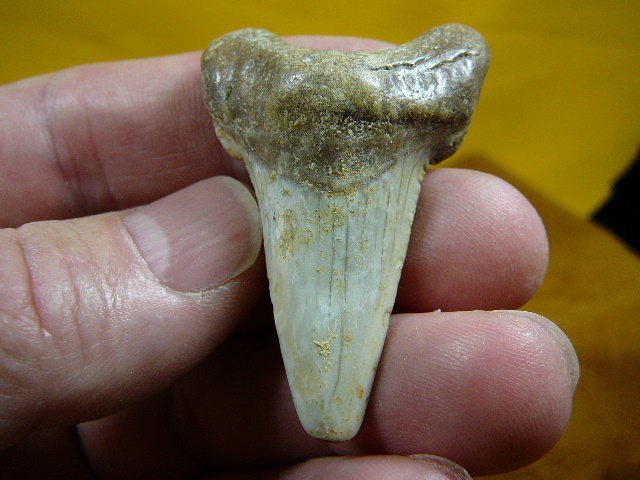 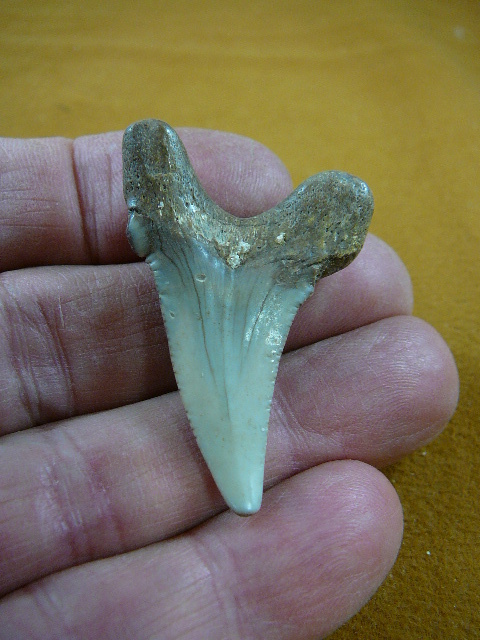 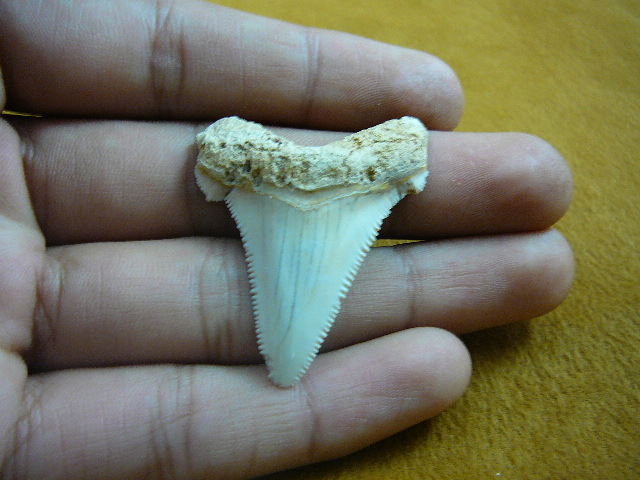 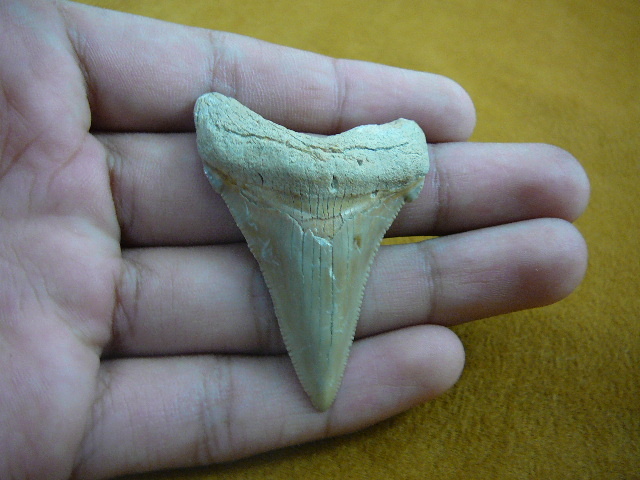 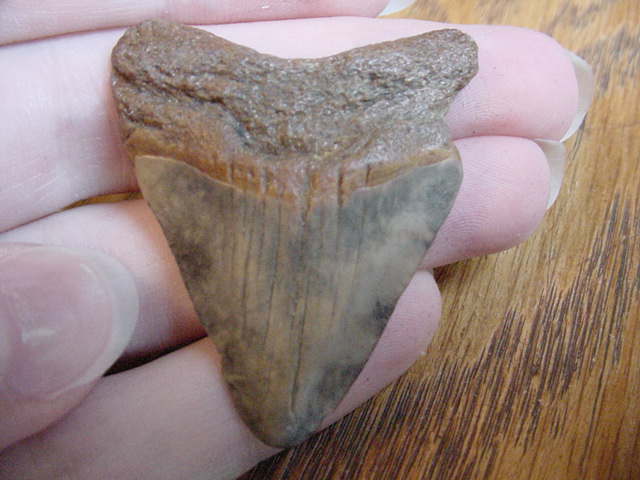 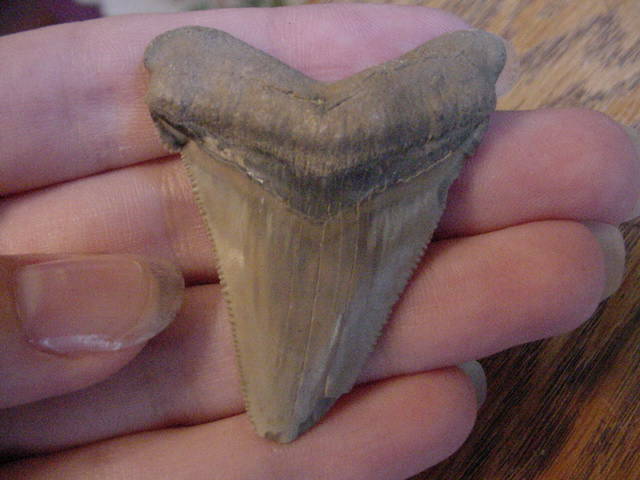 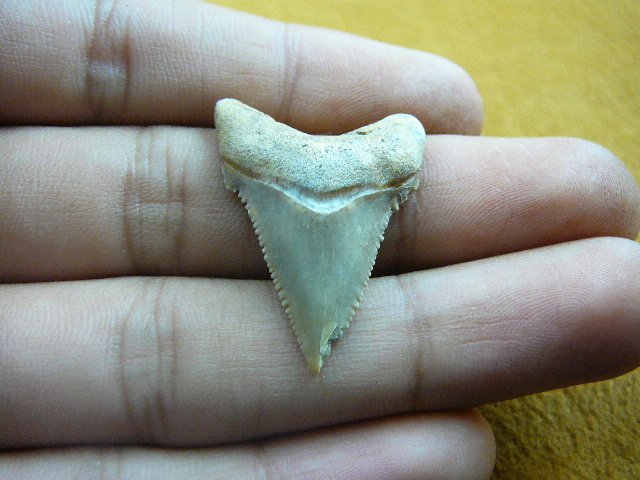 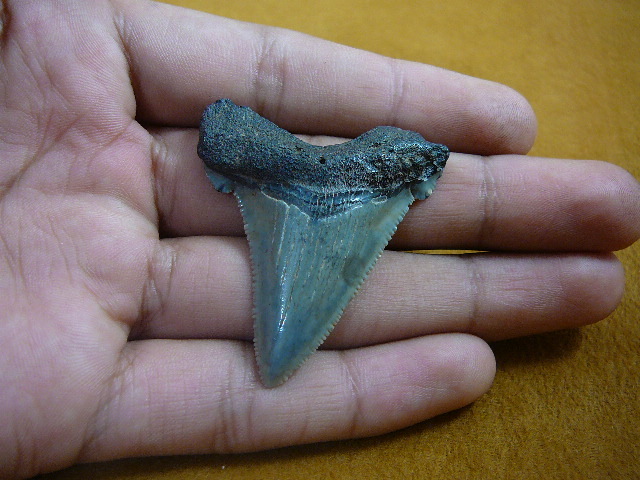 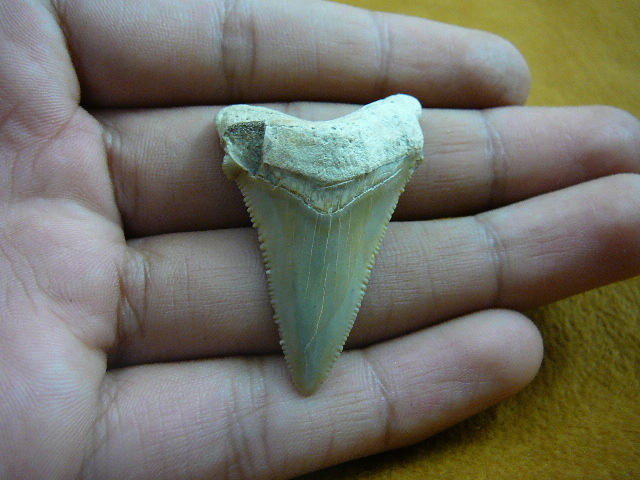 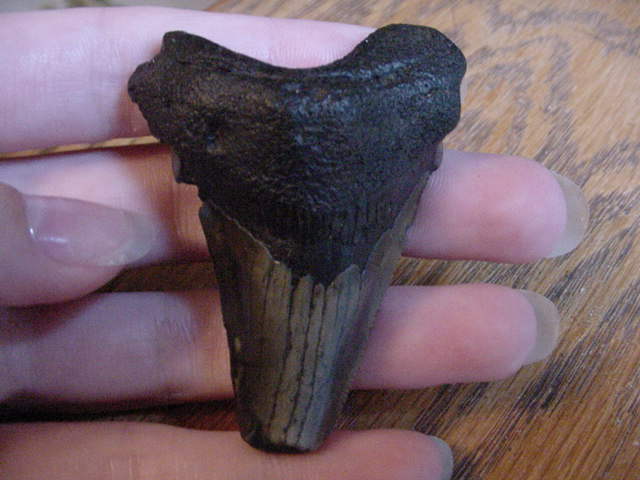 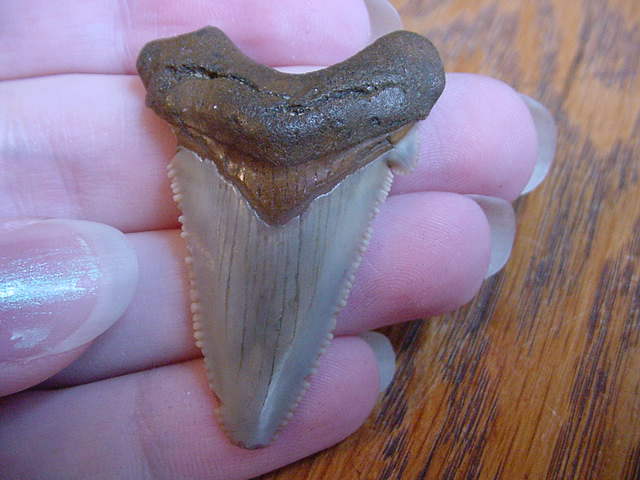 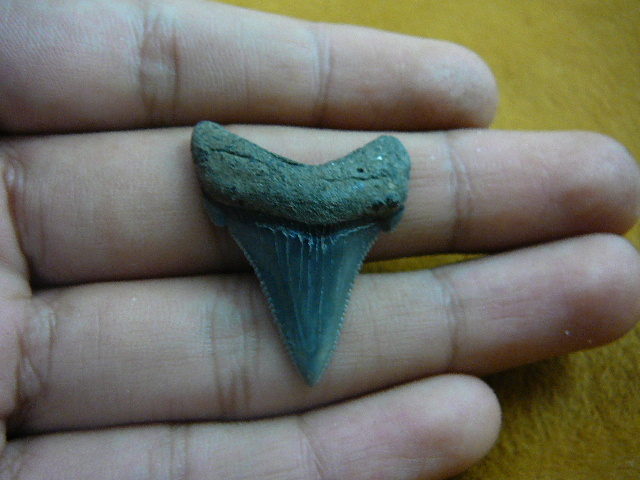 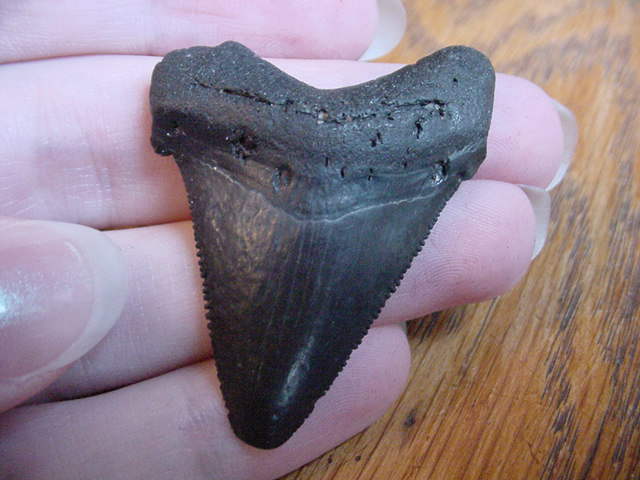 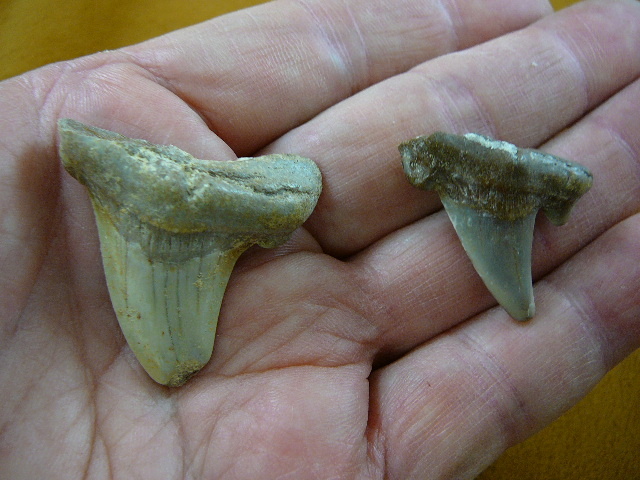 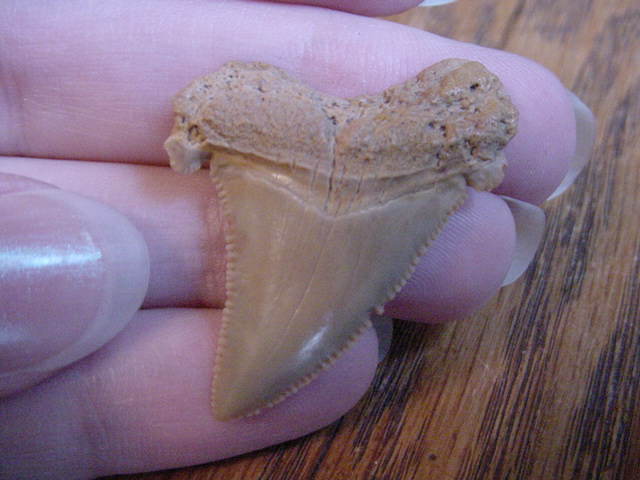 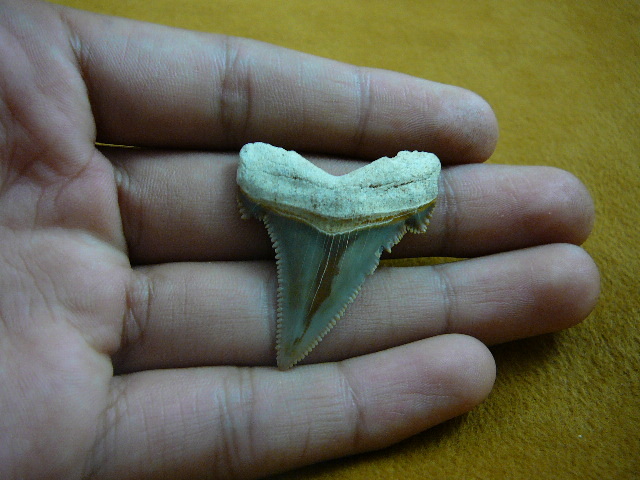 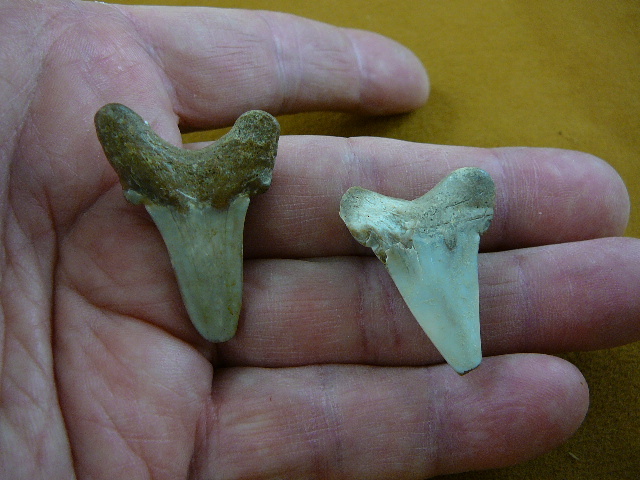 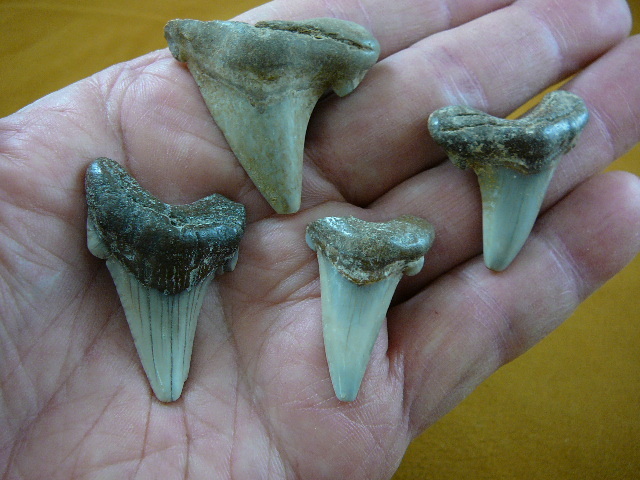 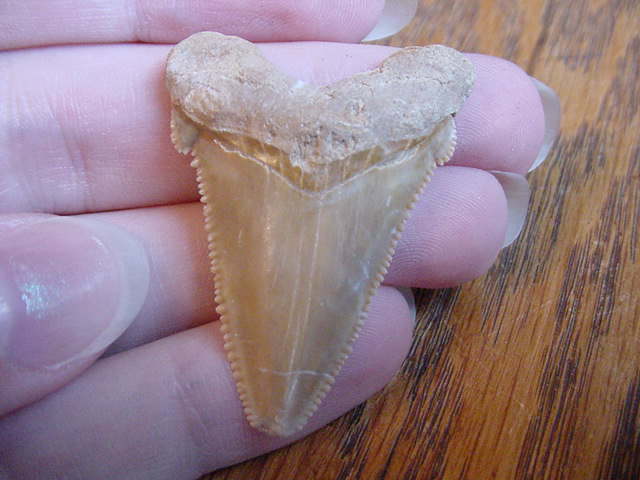 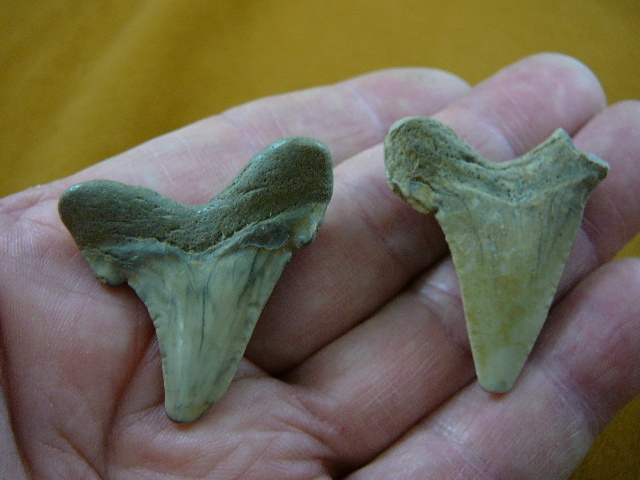 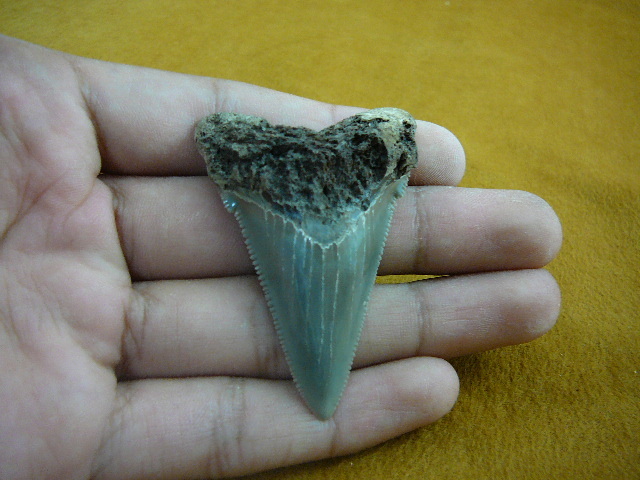 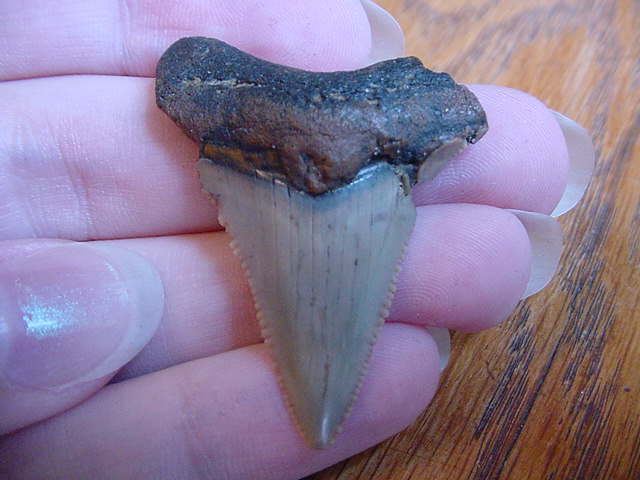 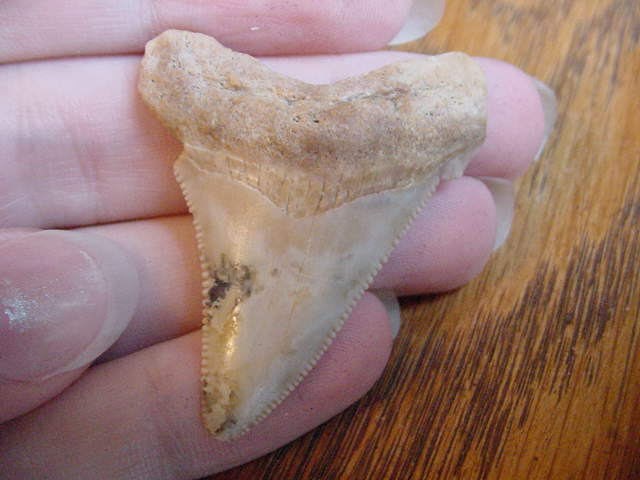 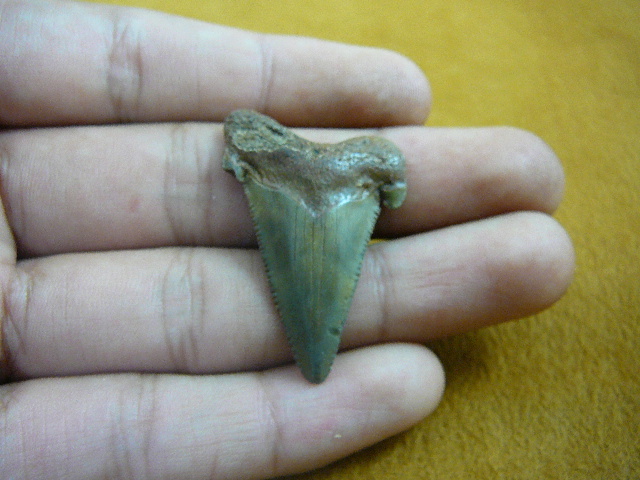 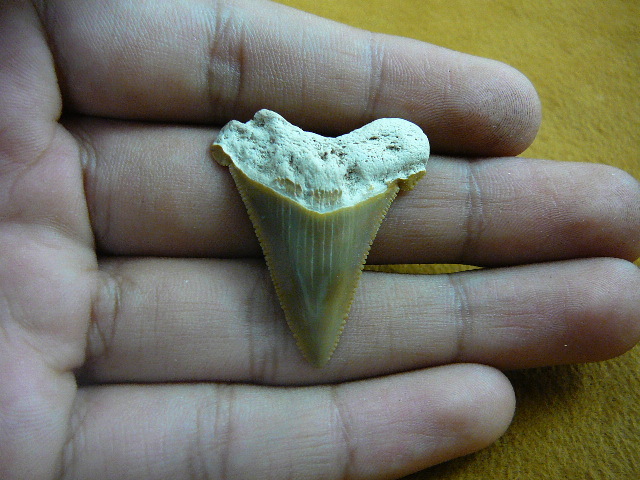 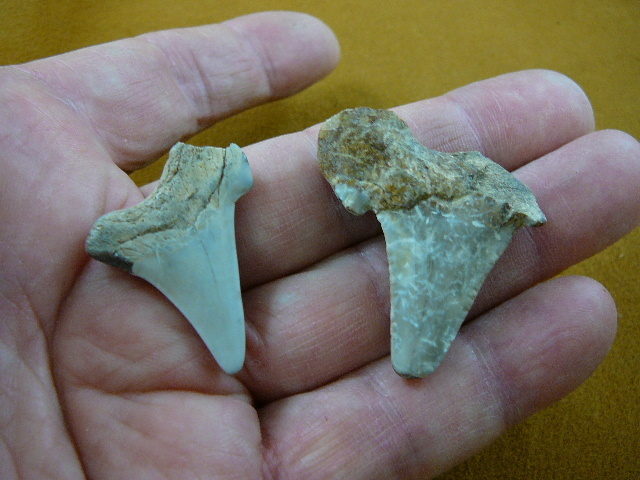 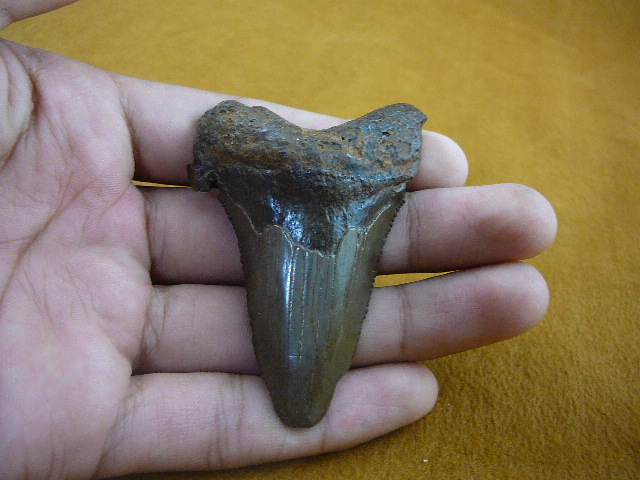 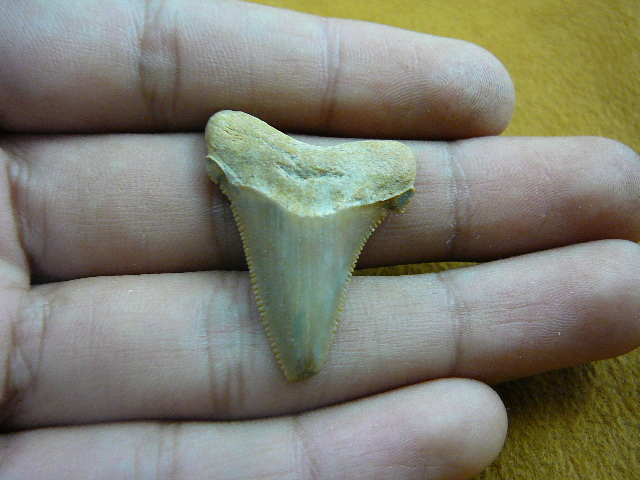 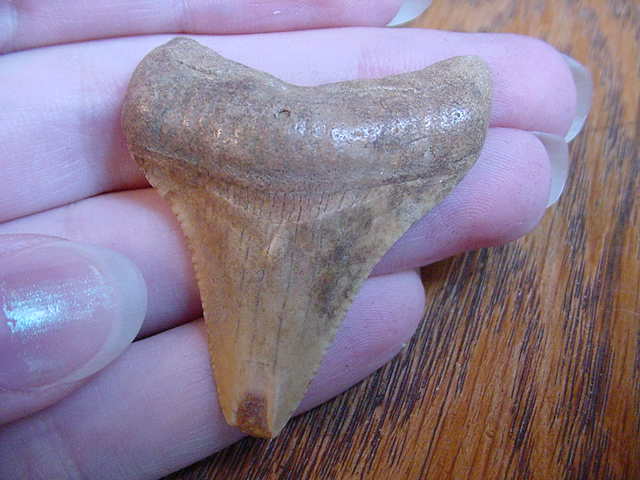 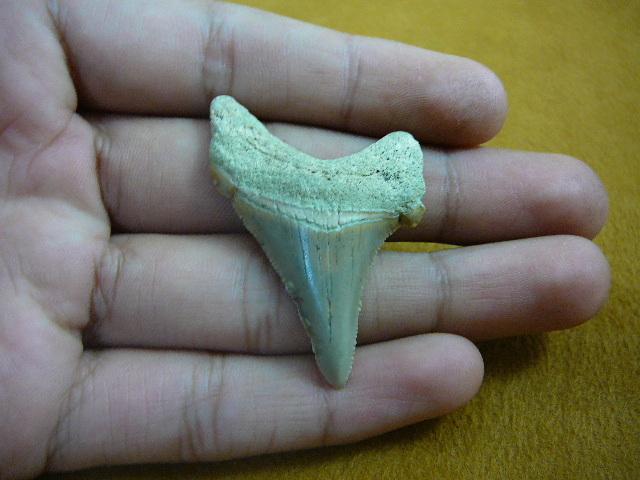 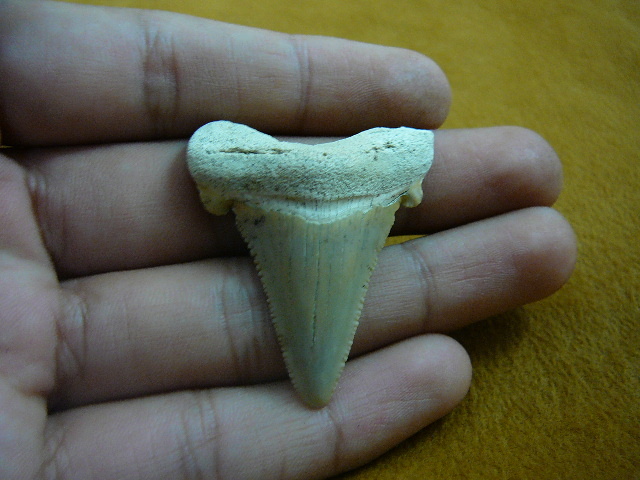 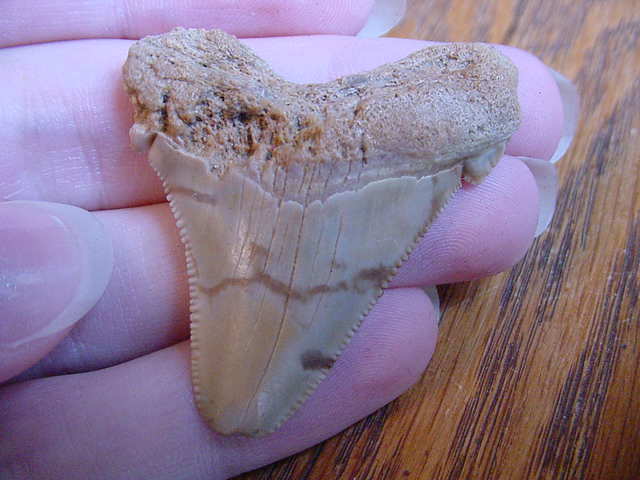 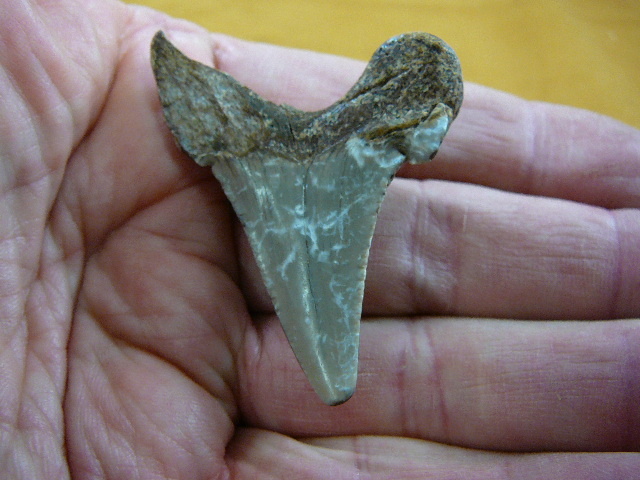 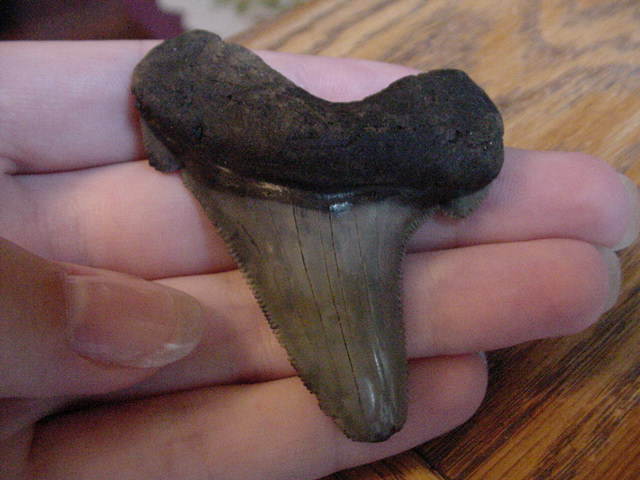 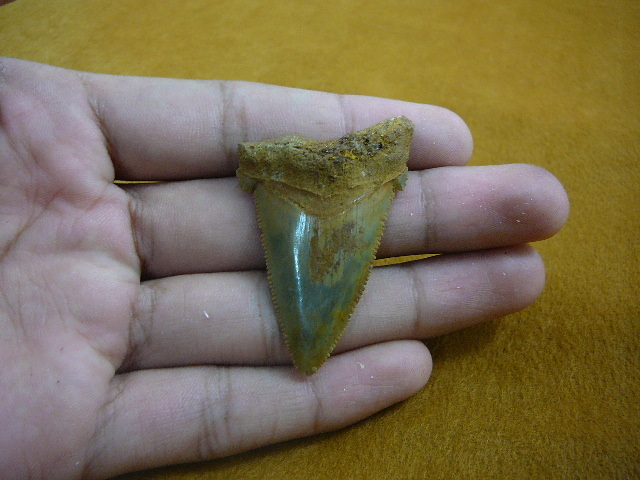 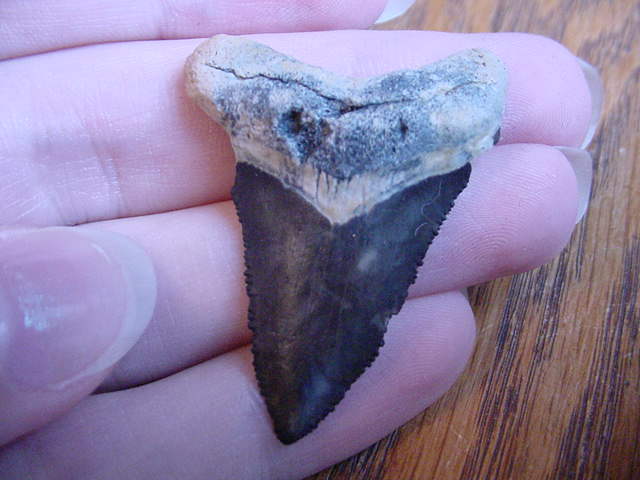 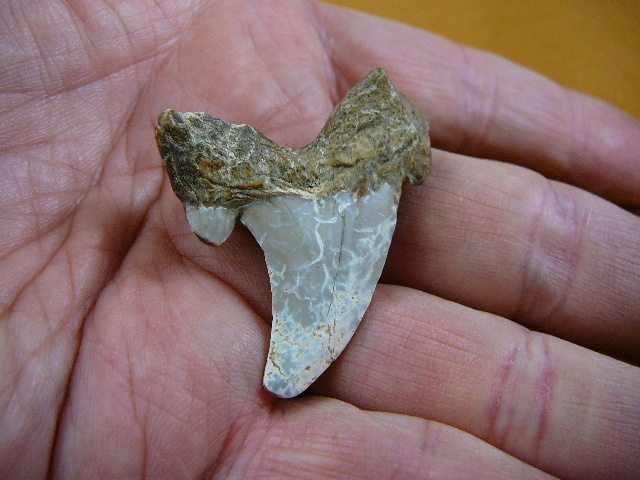 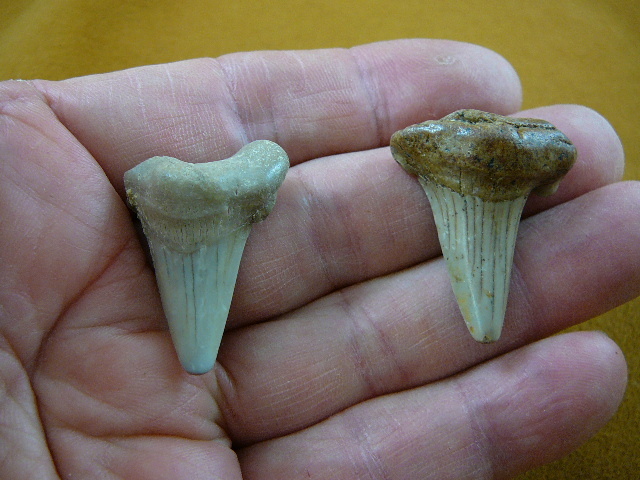 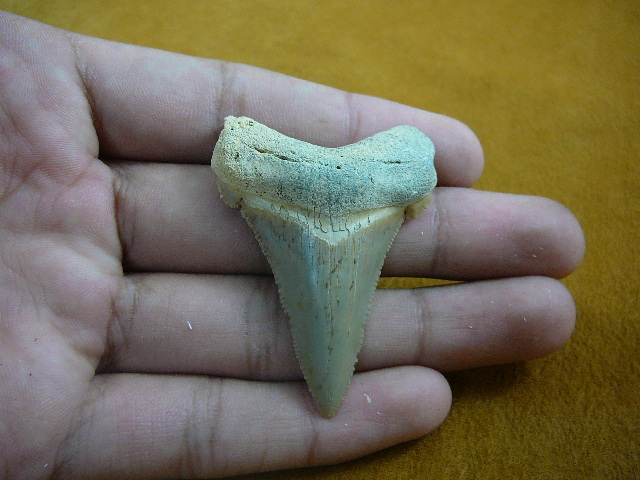 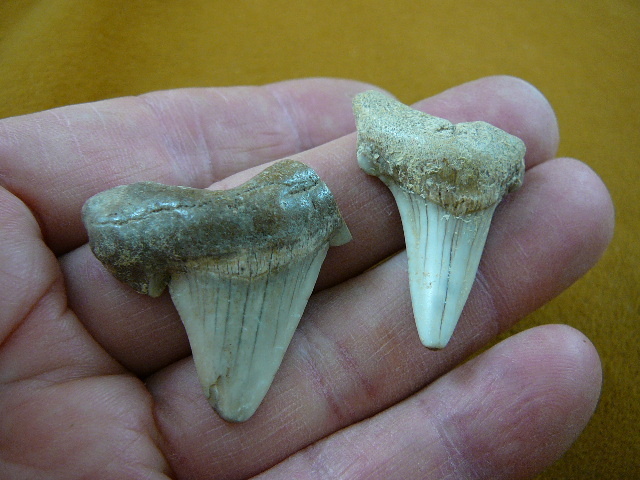 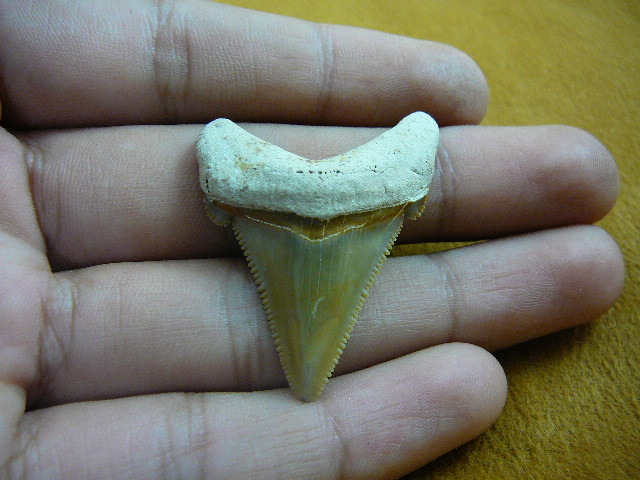 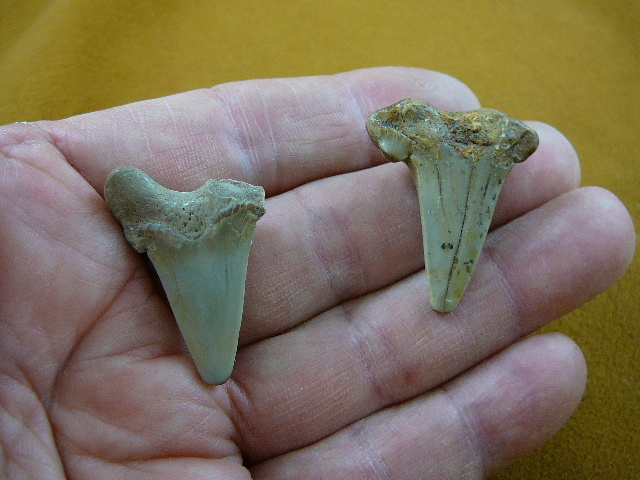 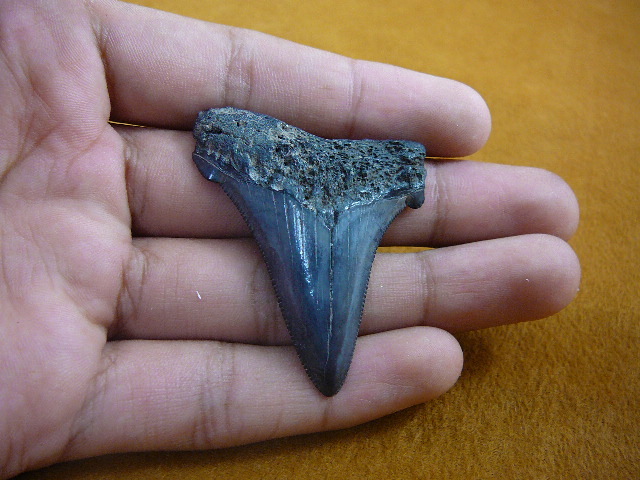 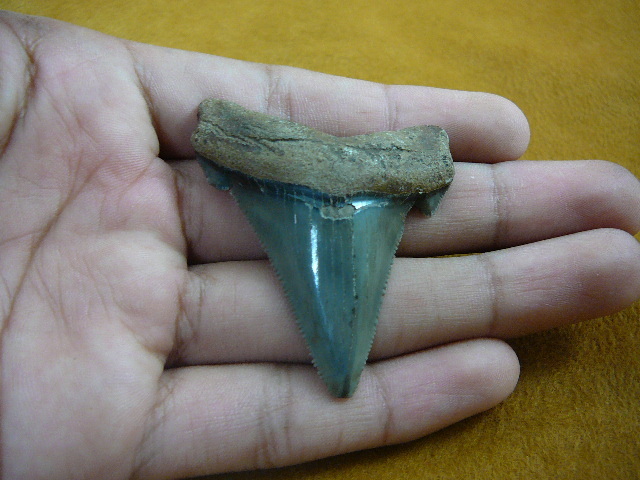 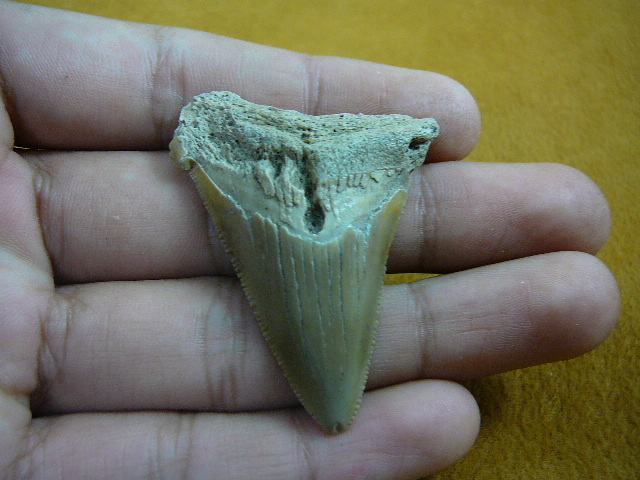 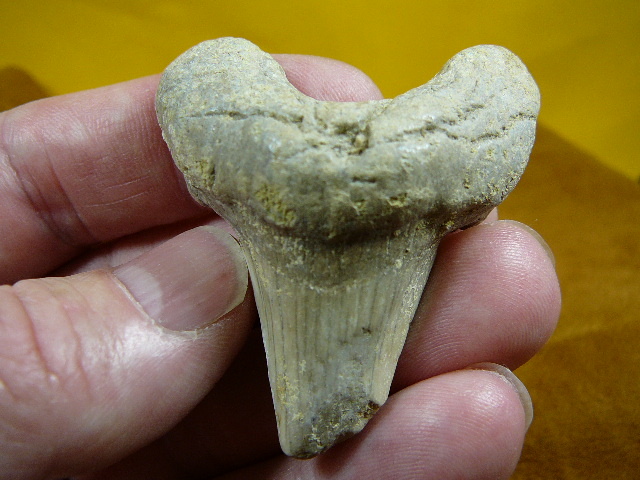 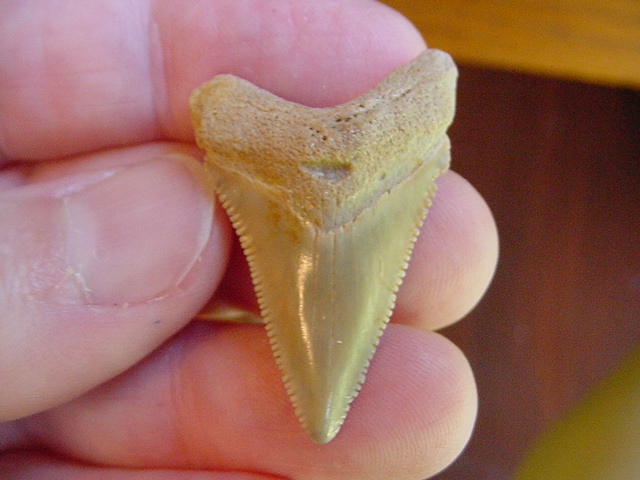 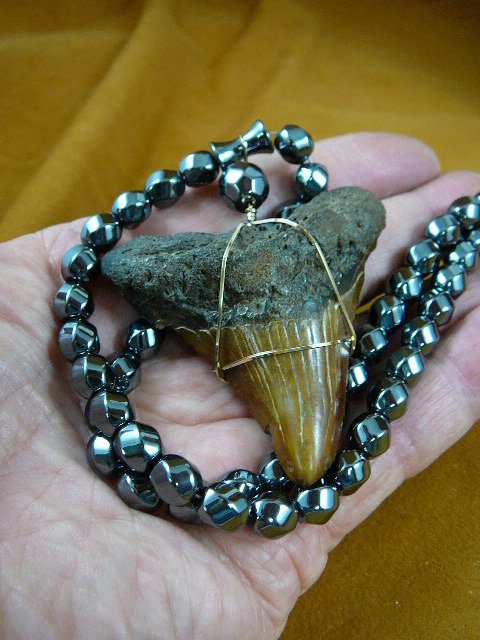 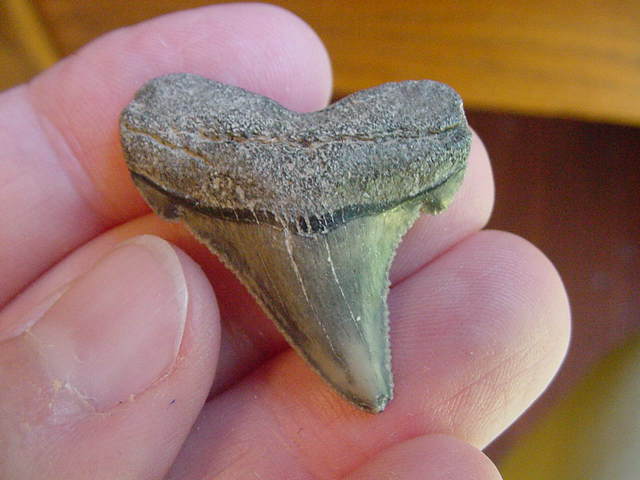 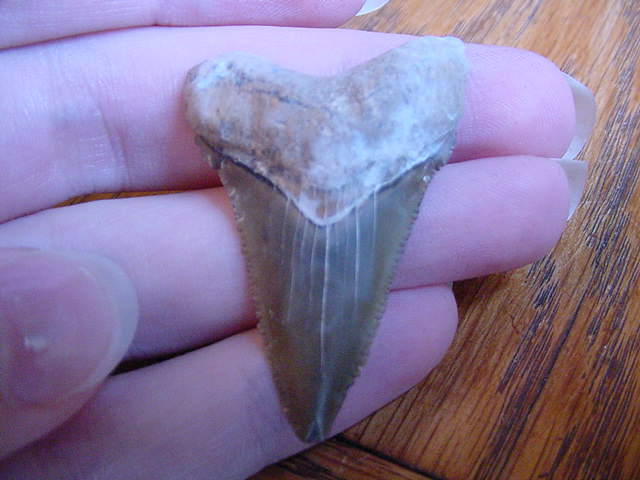 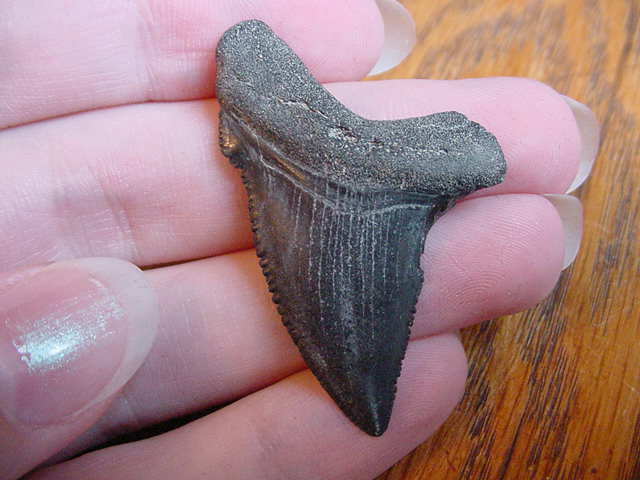 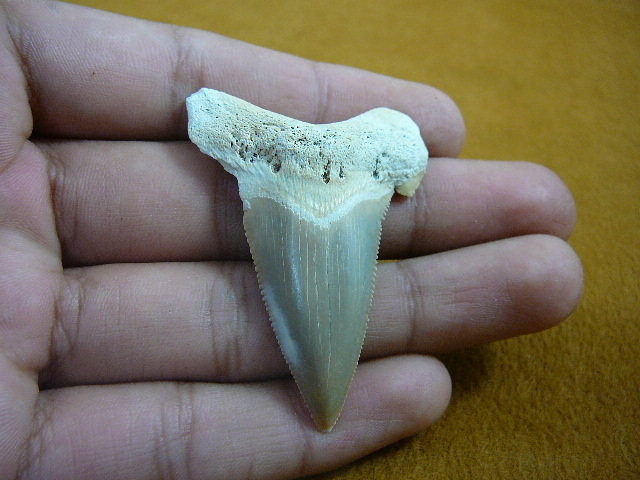 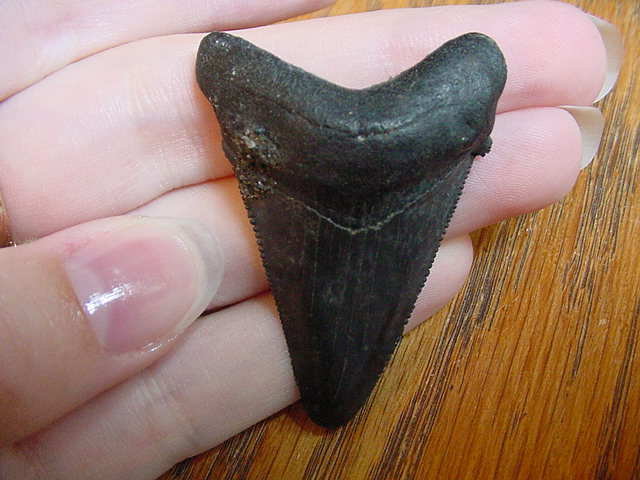 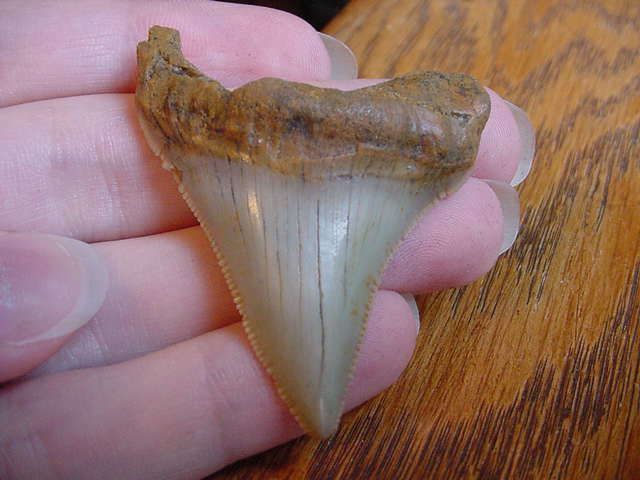 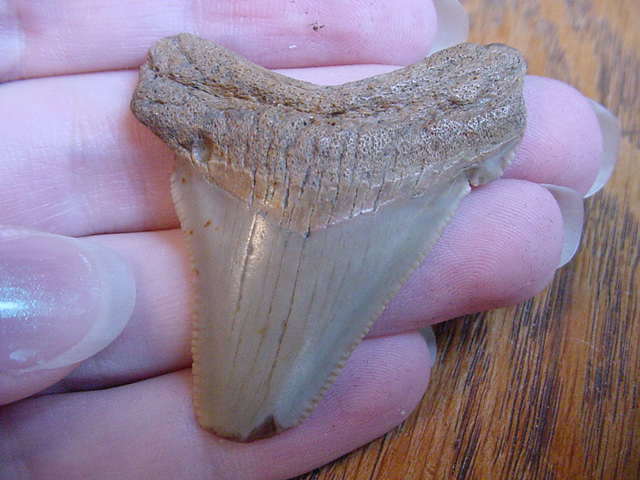 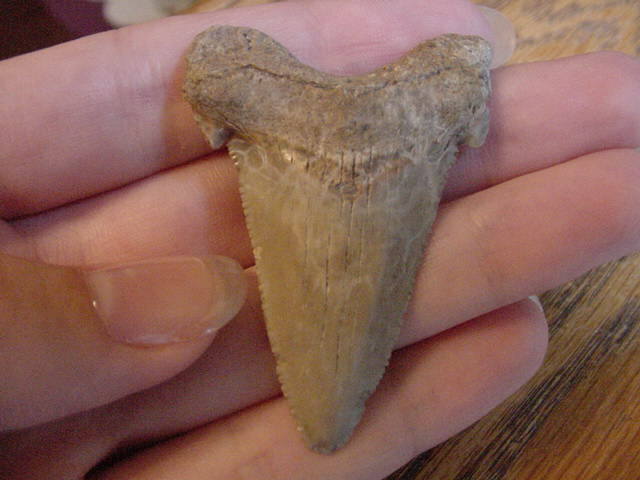 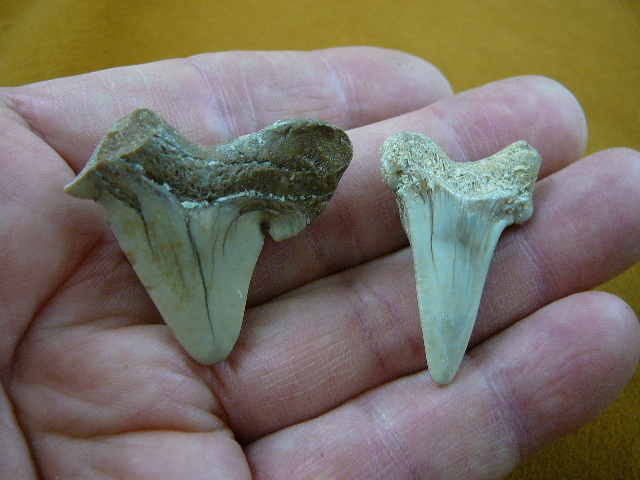 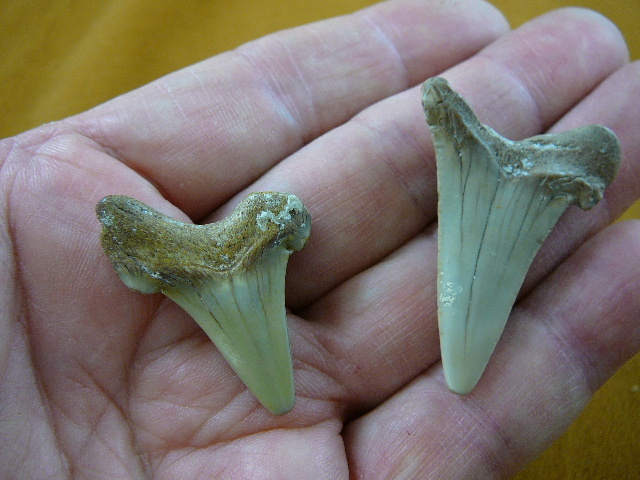 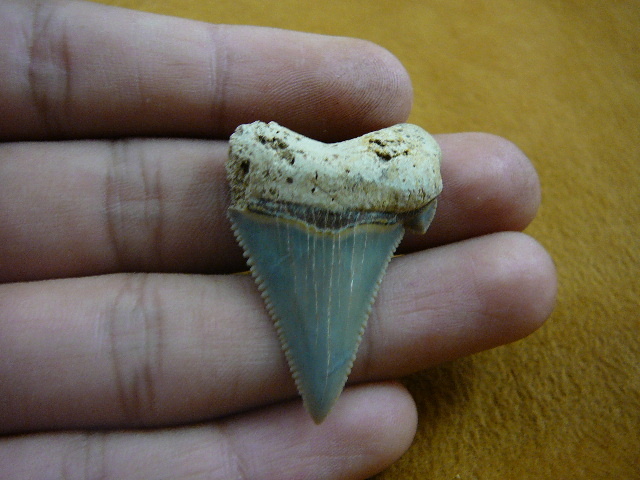 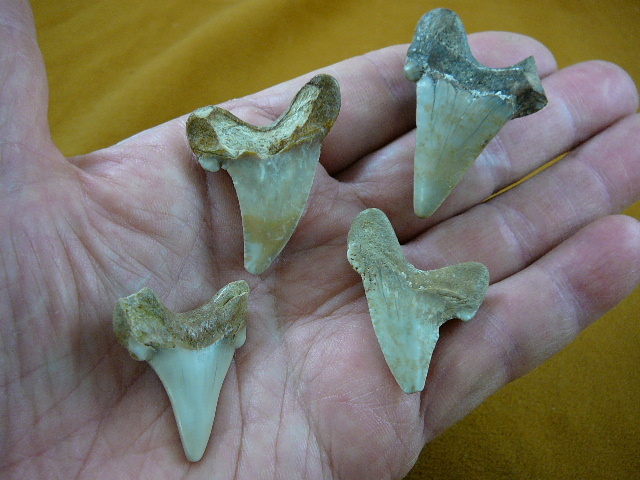 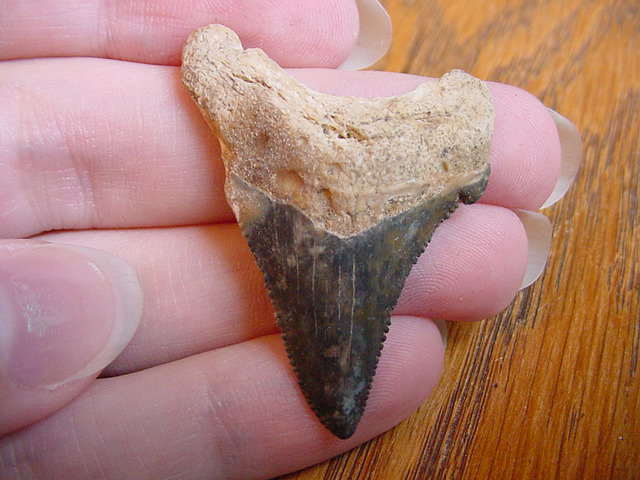 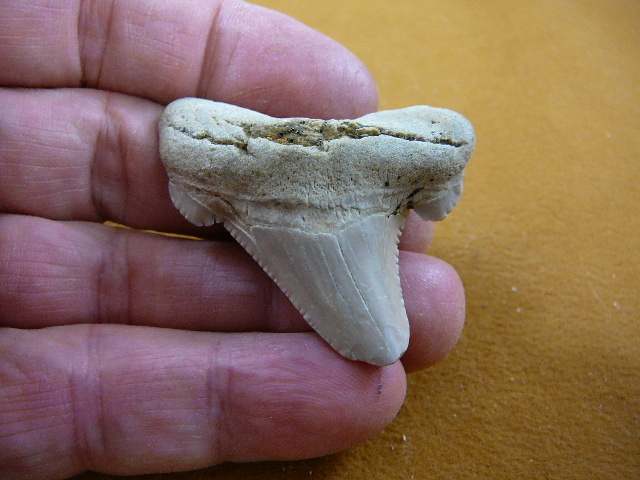 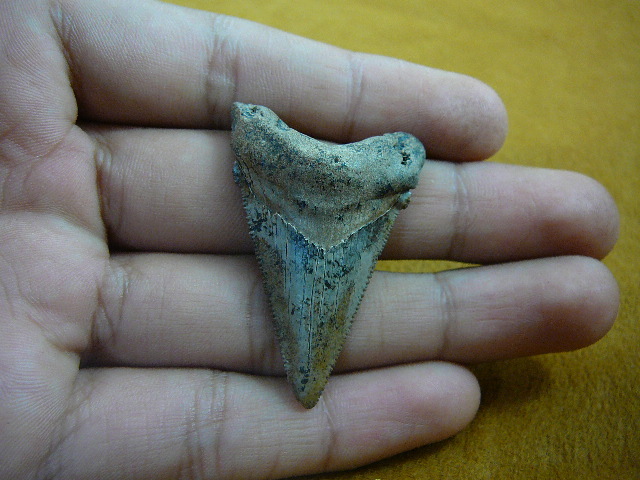 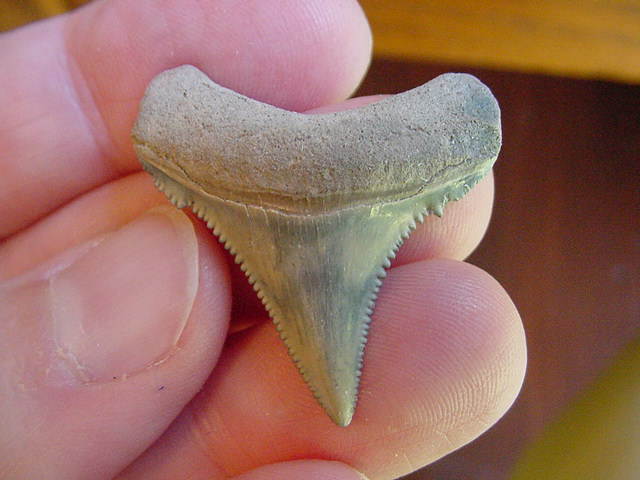 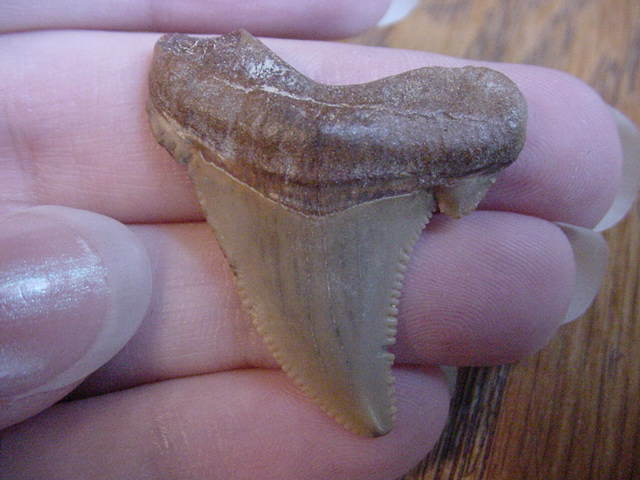 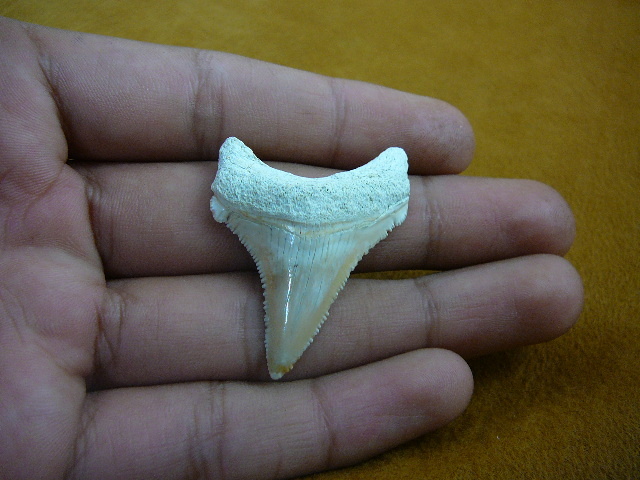 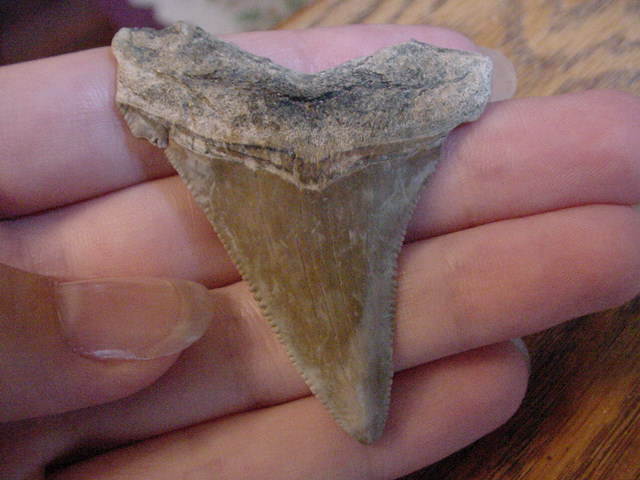 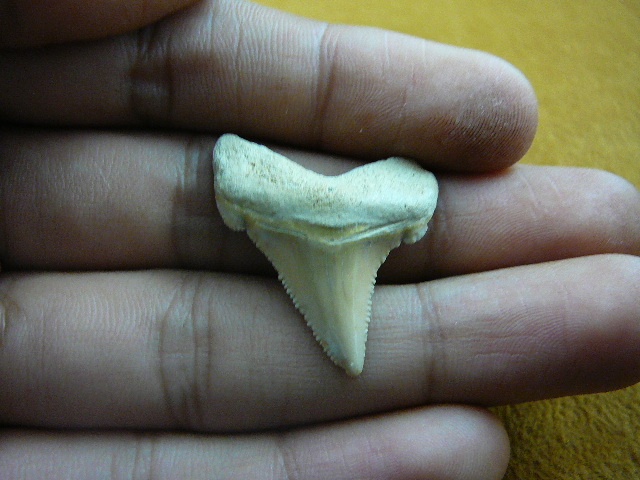 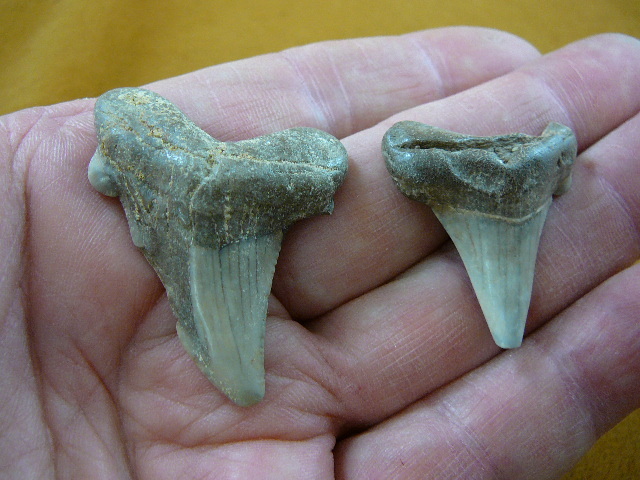 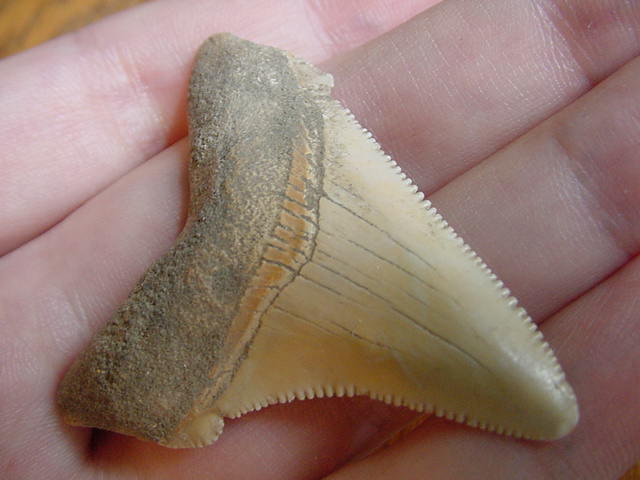 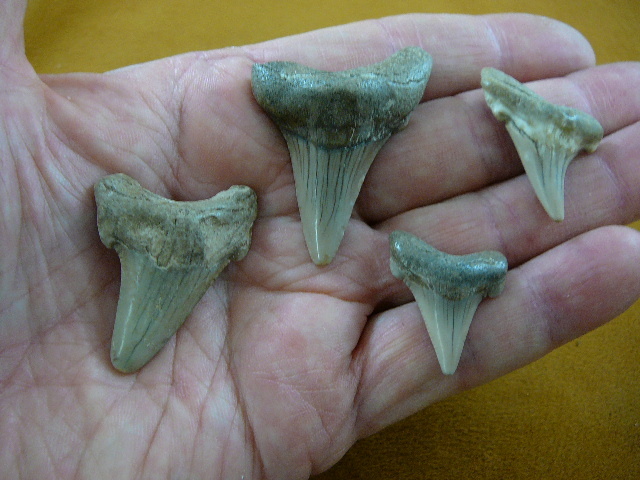 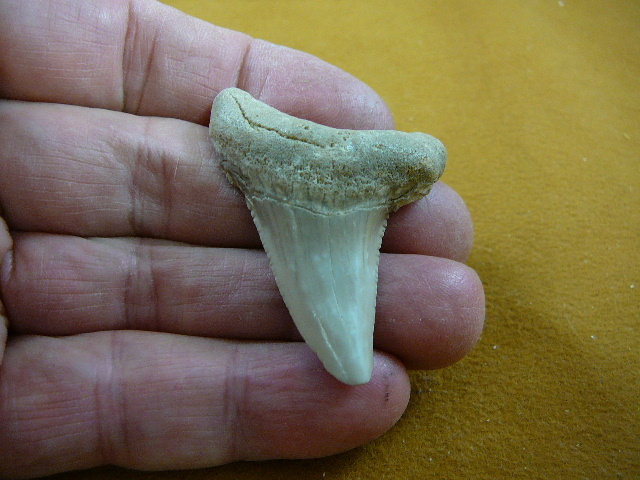 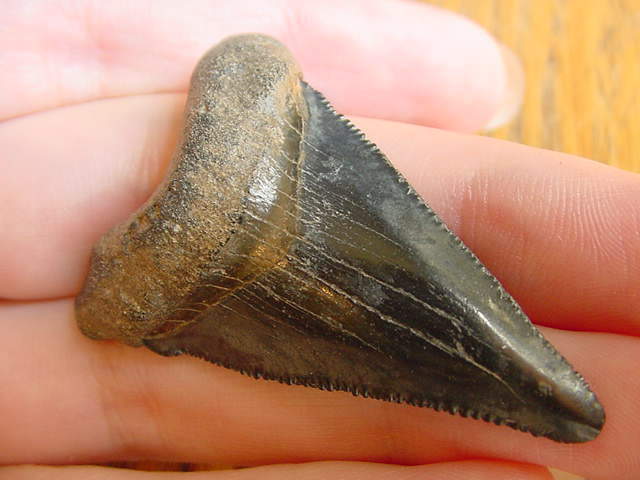 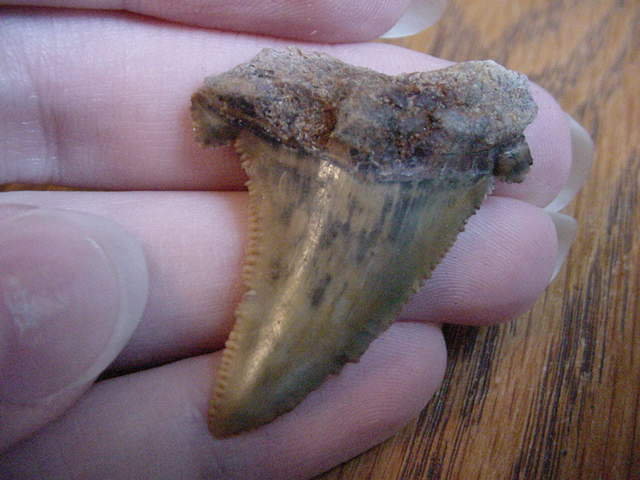 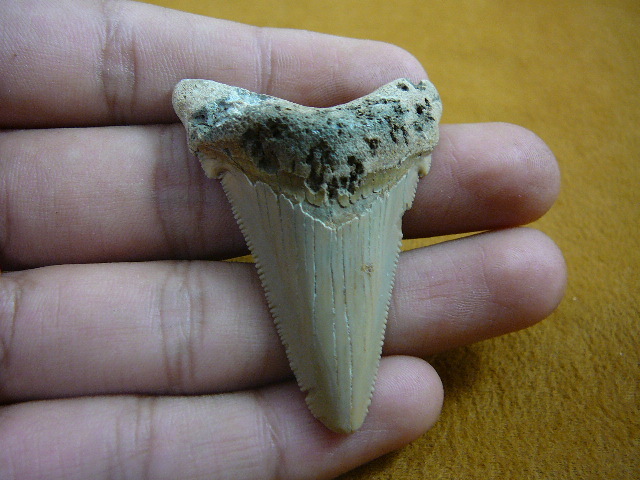 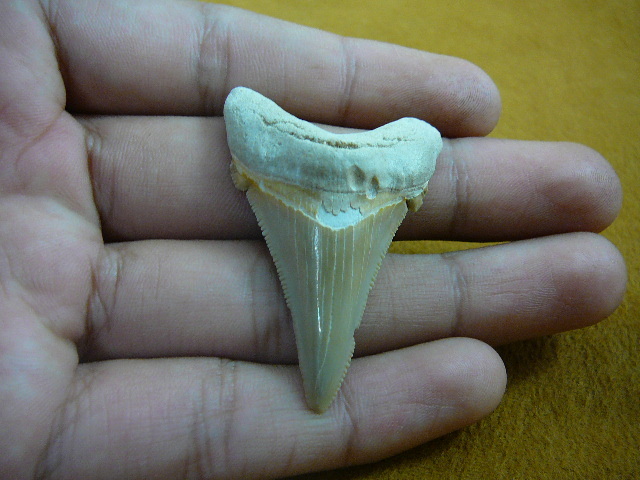 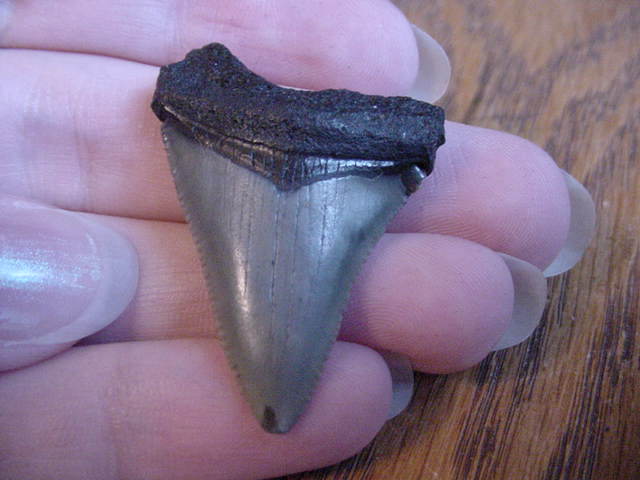 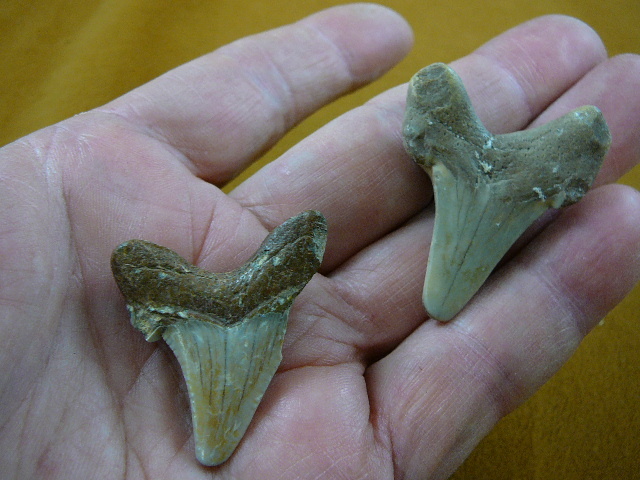 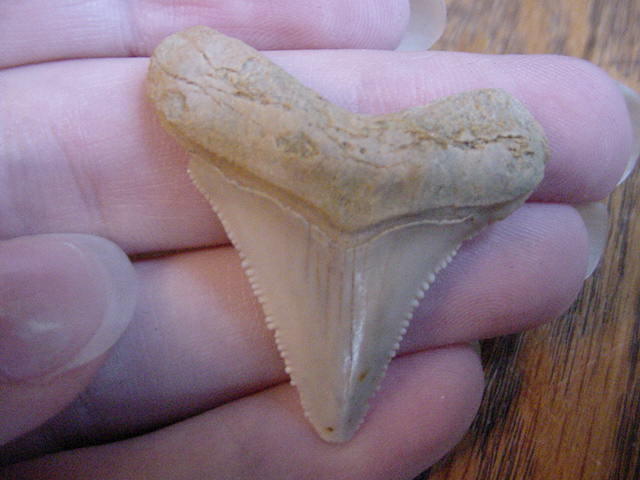 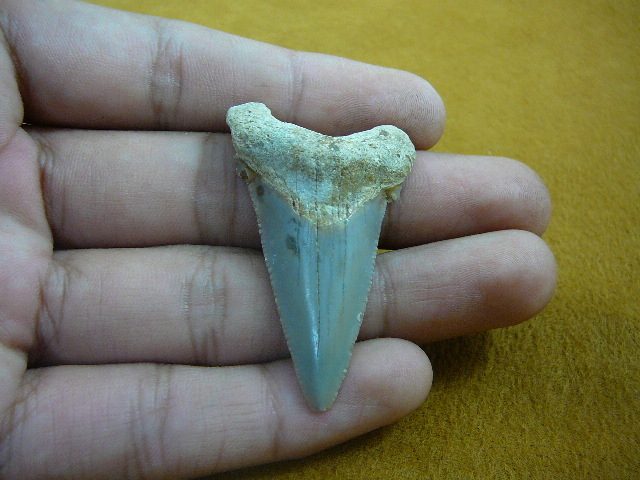 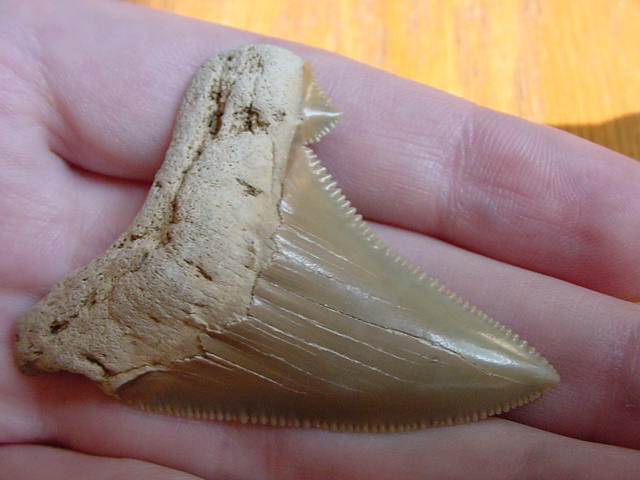 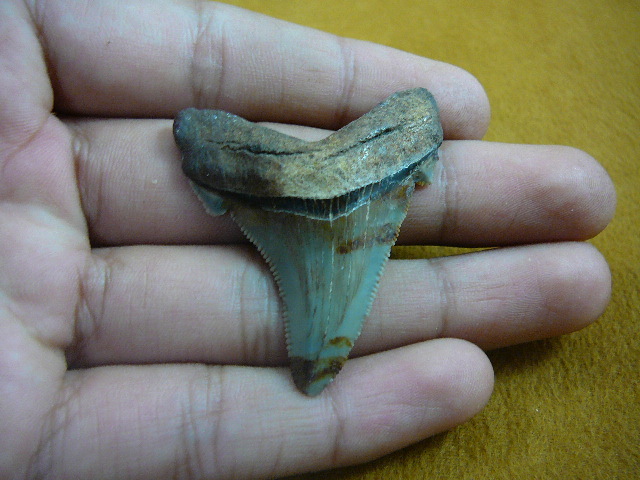 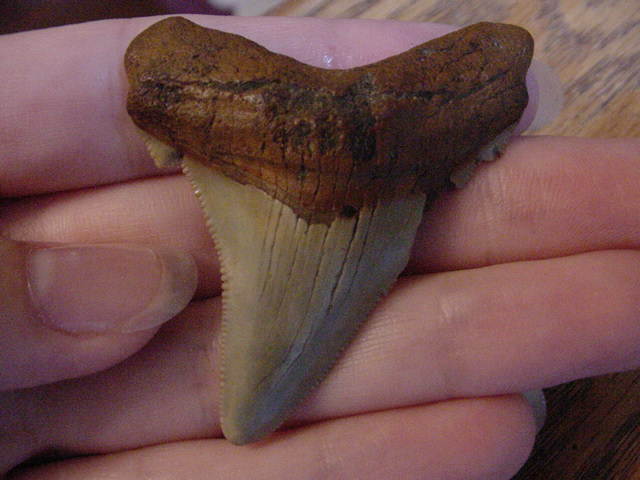 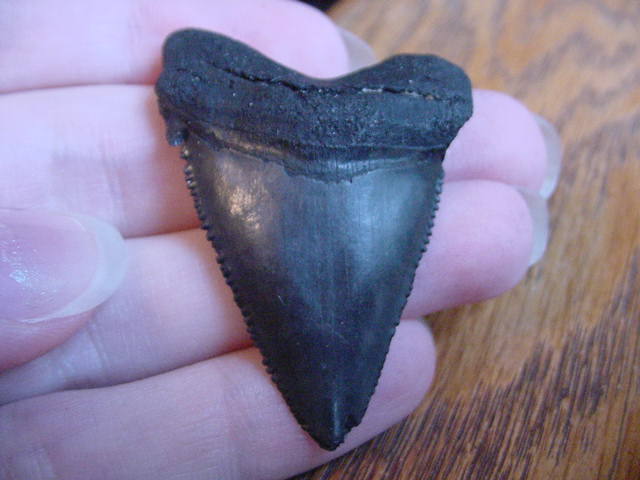 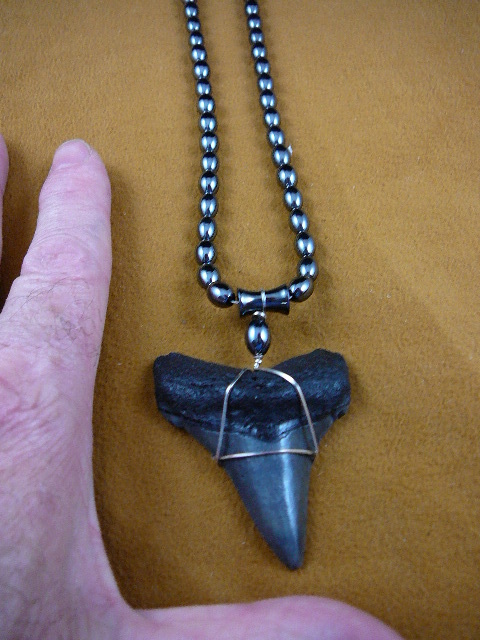 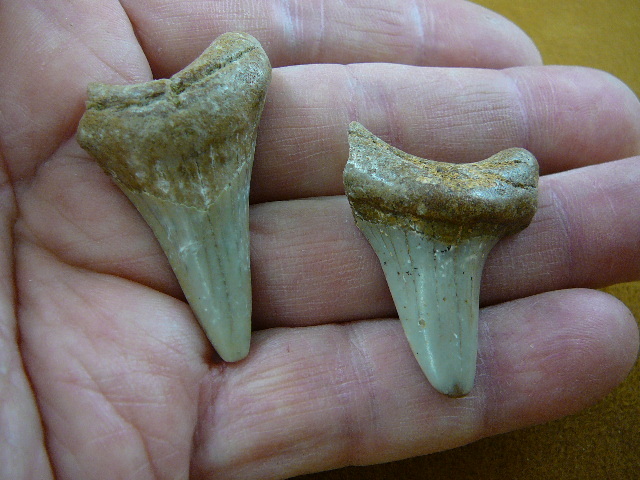 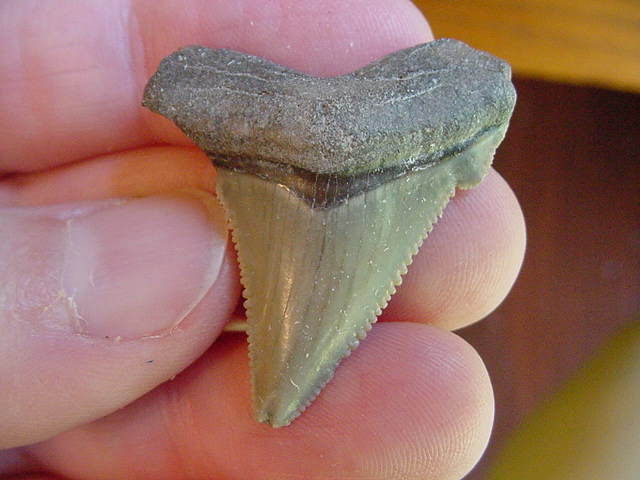 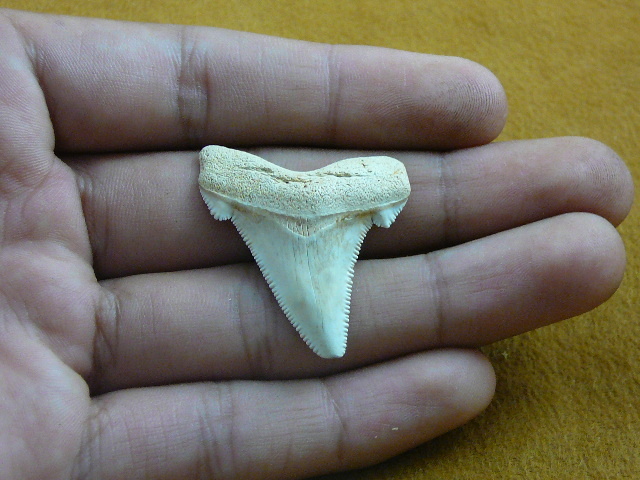 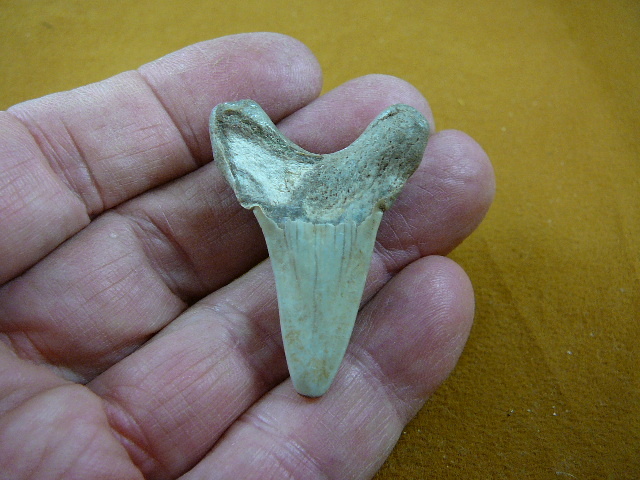 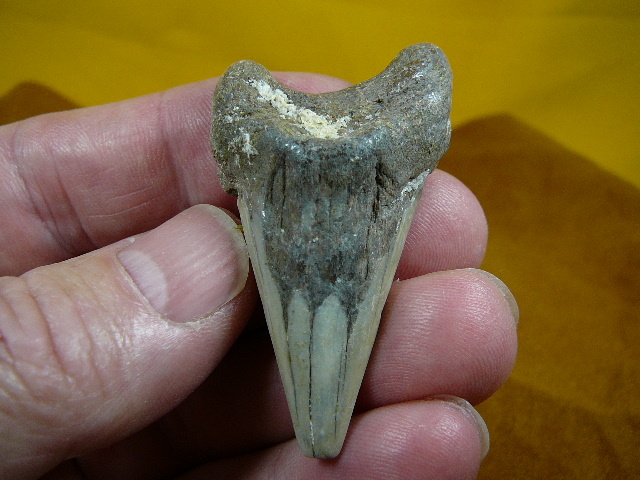 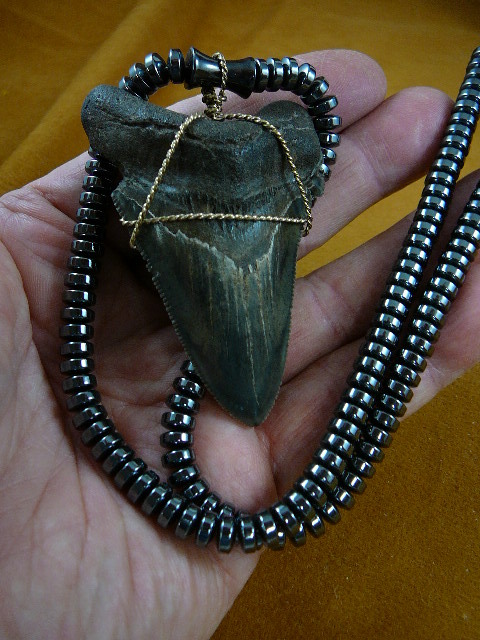 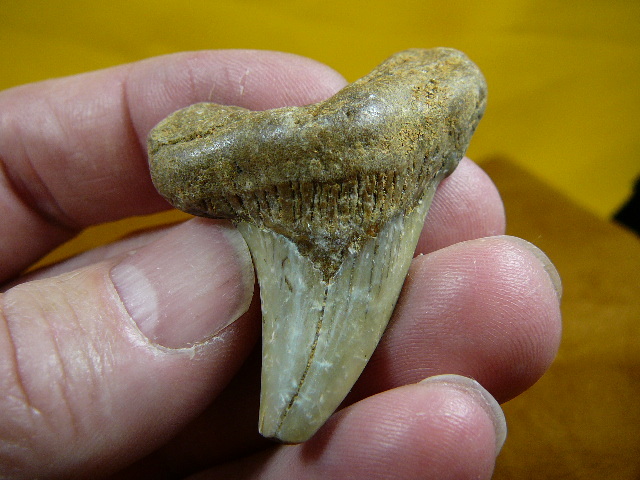 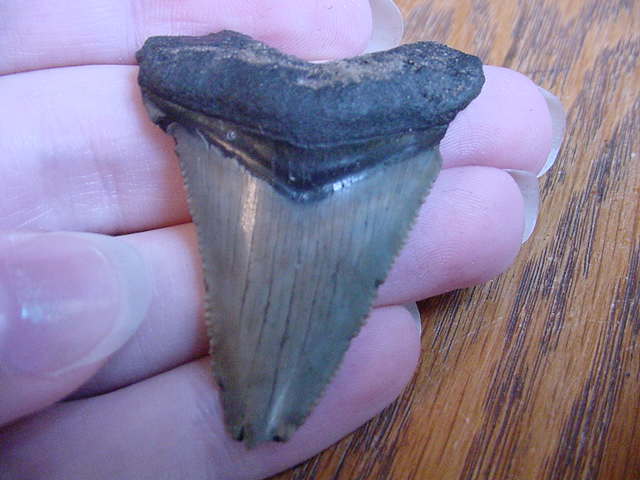 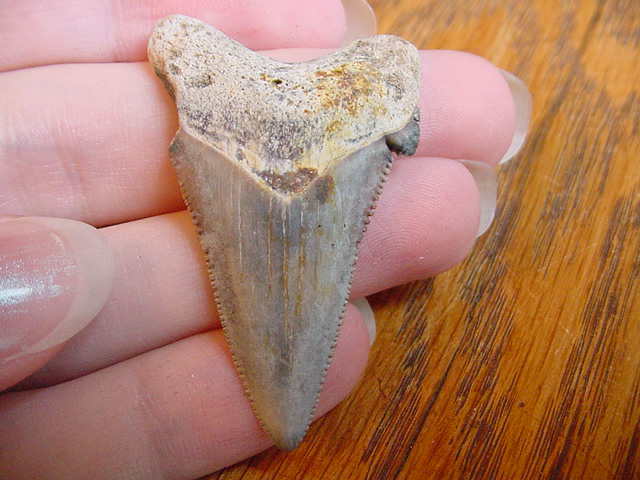 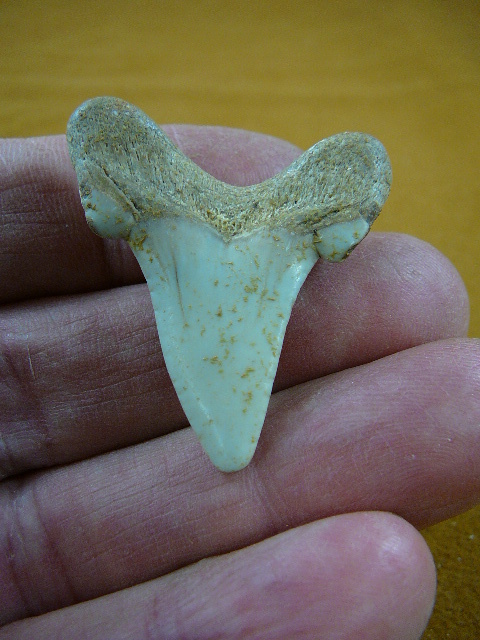 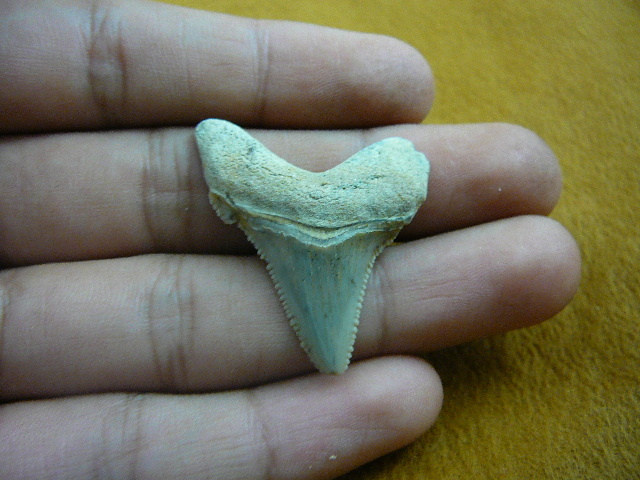 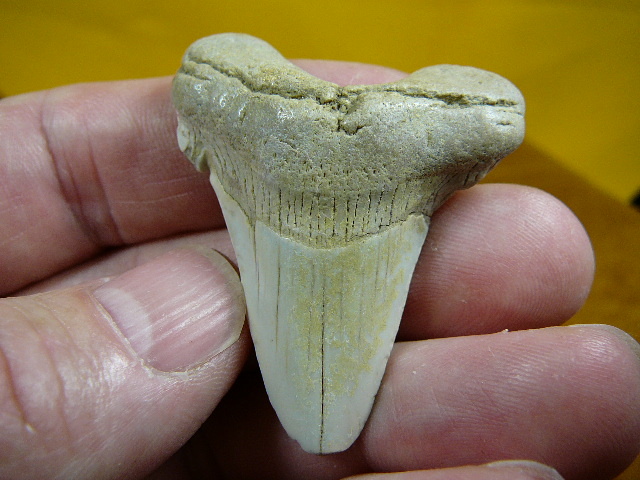 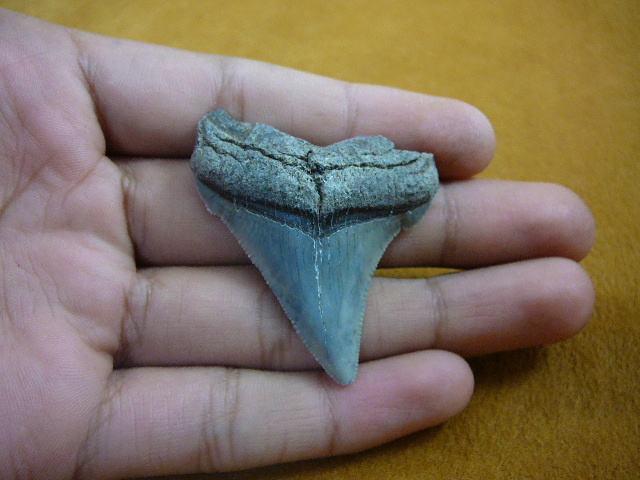 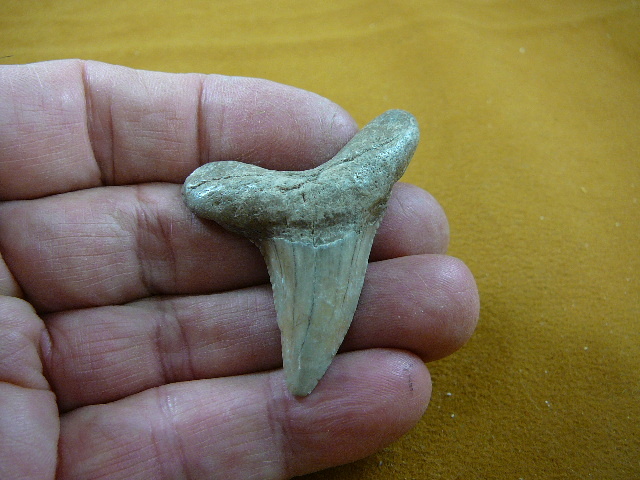 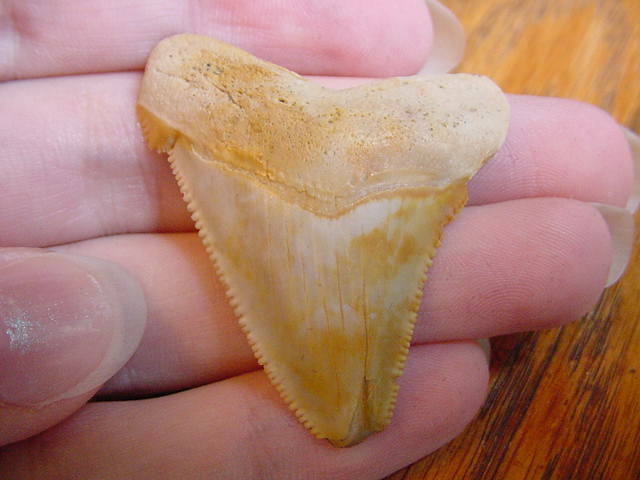 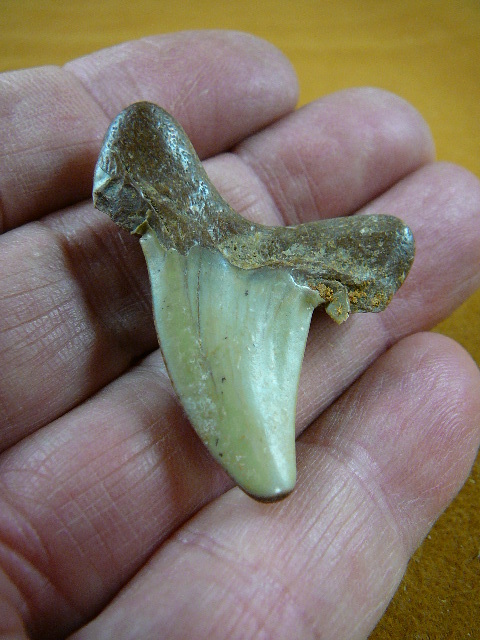 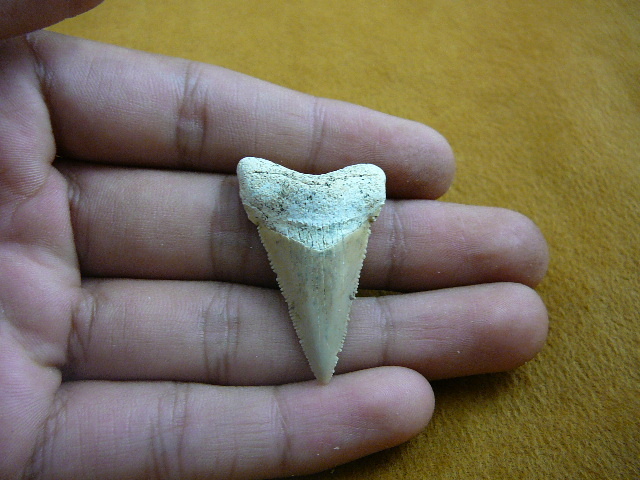 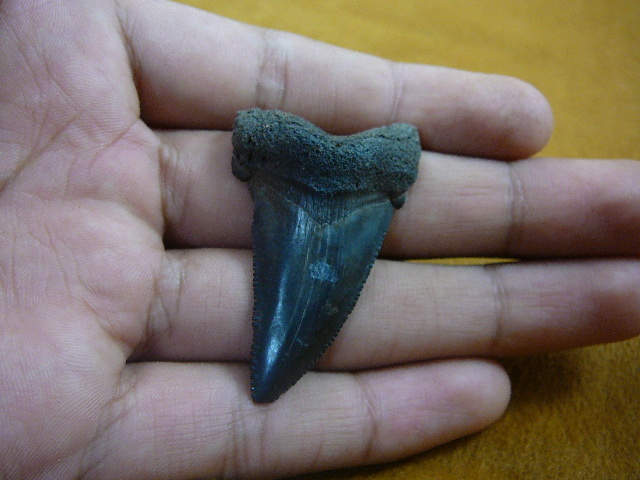 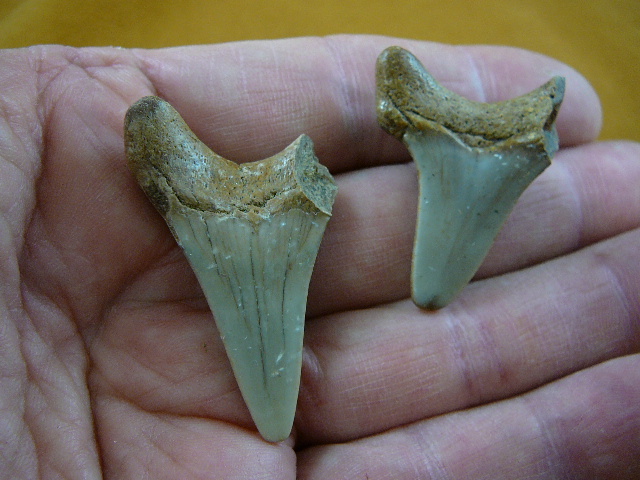 Carcharocles Auriculatus (Father of Megalodon), dated to the Middle Eocene epoch. 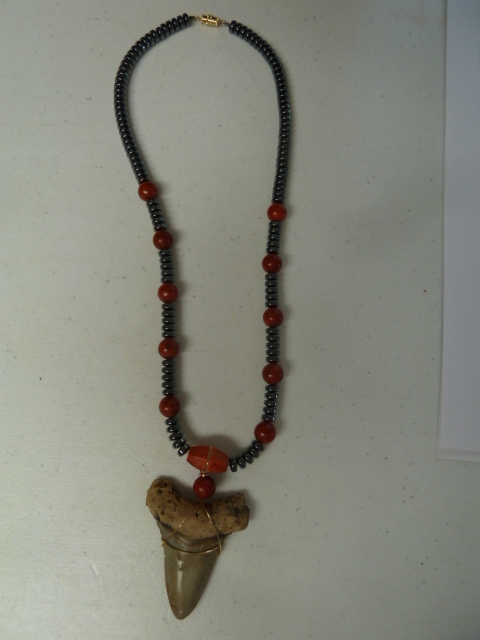 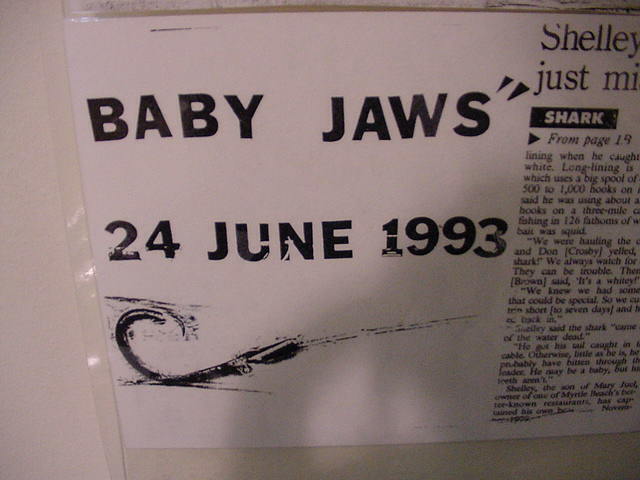 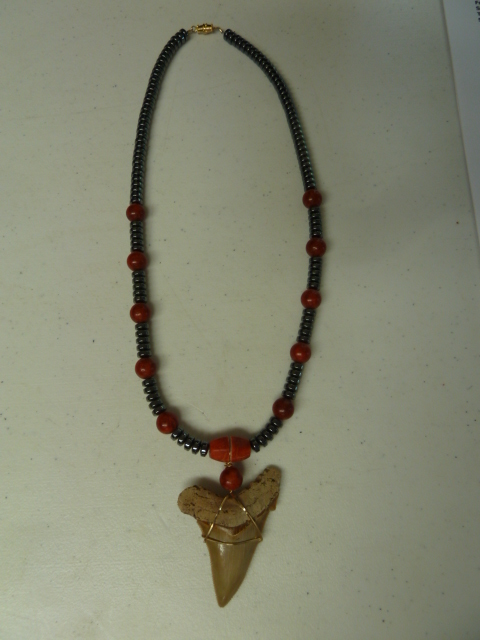 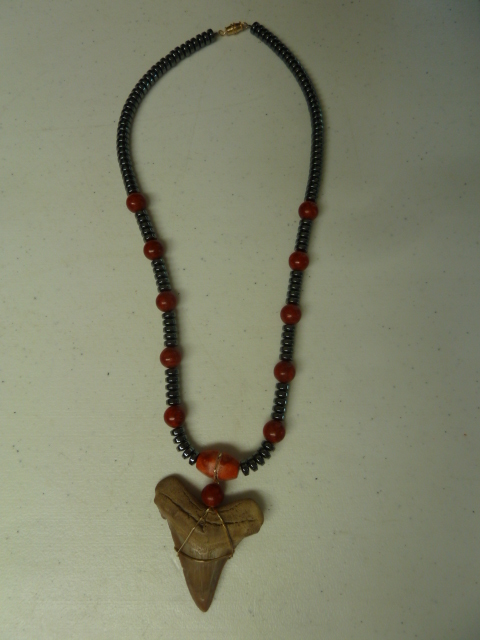 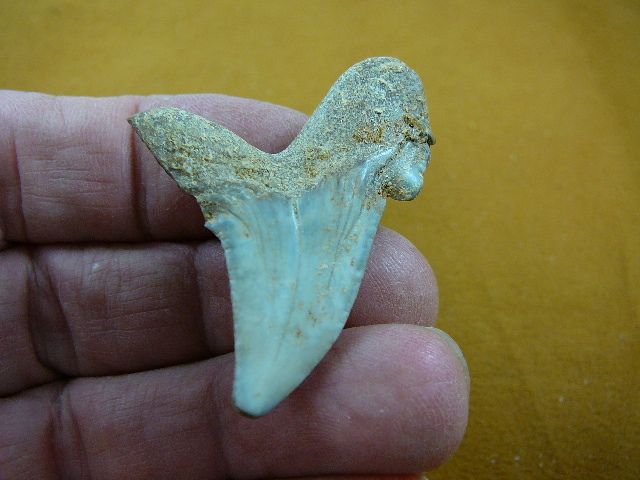 Sizes may be from small 7/8 to largest 1-7/8"
Sizes may be from small 1" to largest 1-3/4"
The above is a baby great white that Glenn used to have in his Myrtle Beach shop. 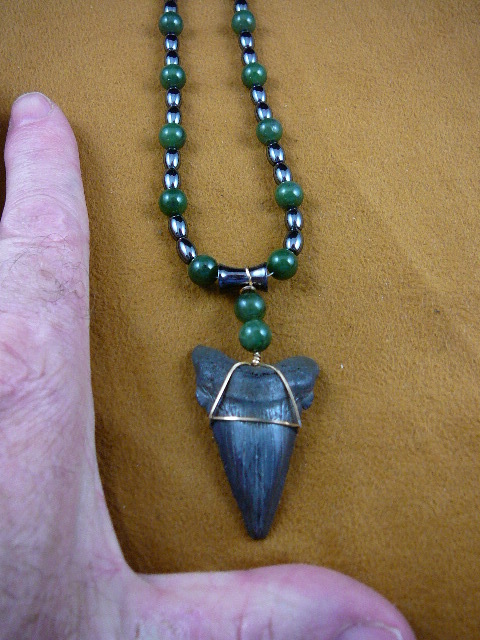 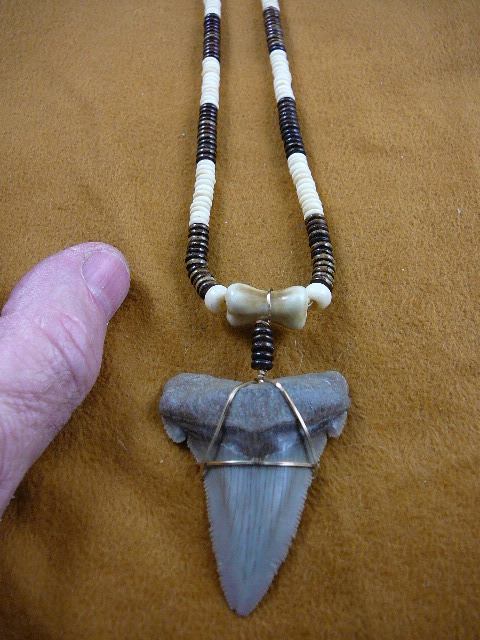 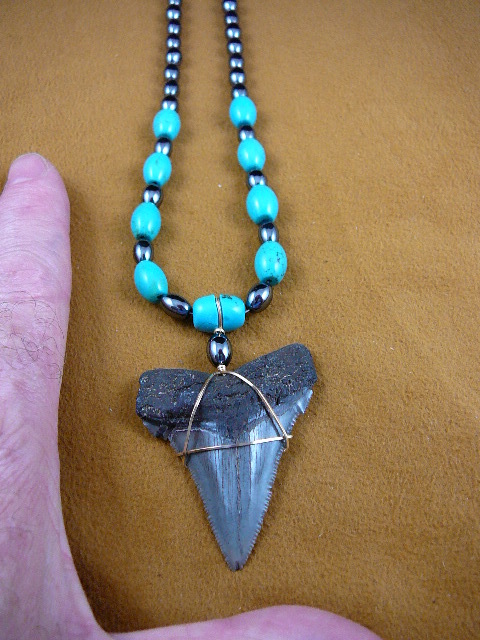 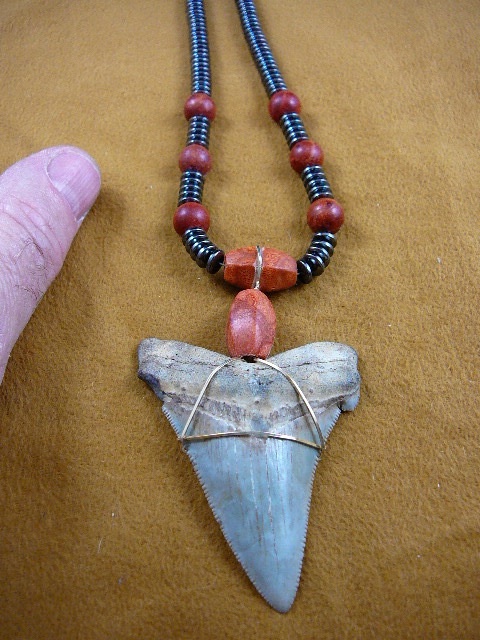 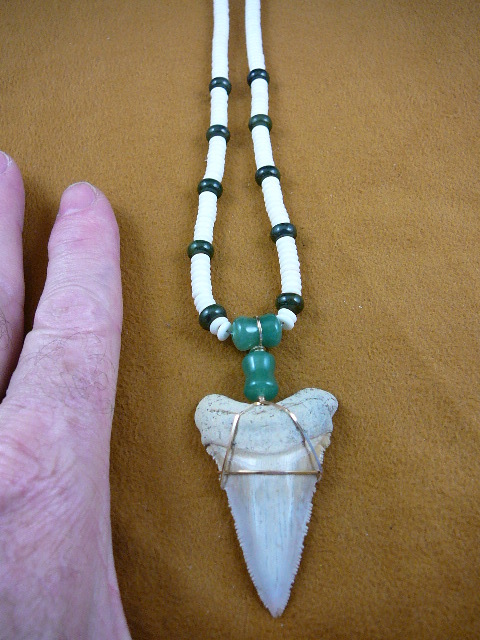 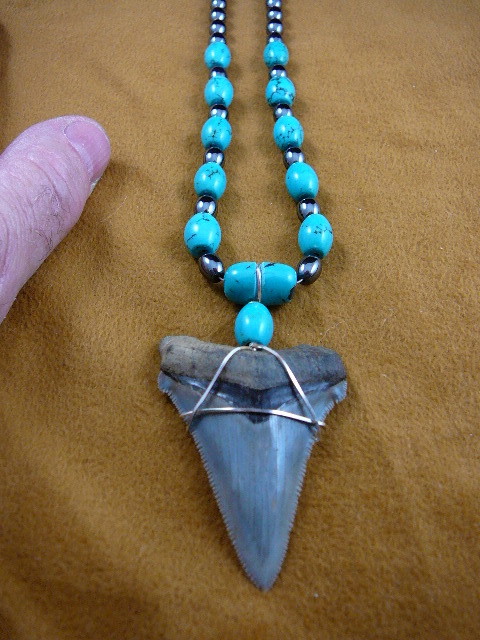 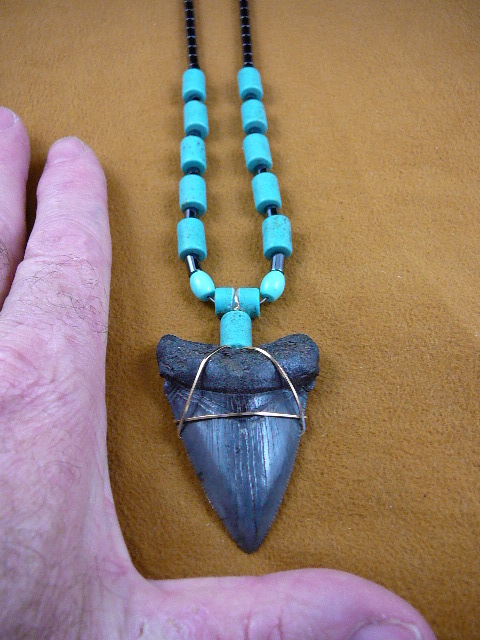 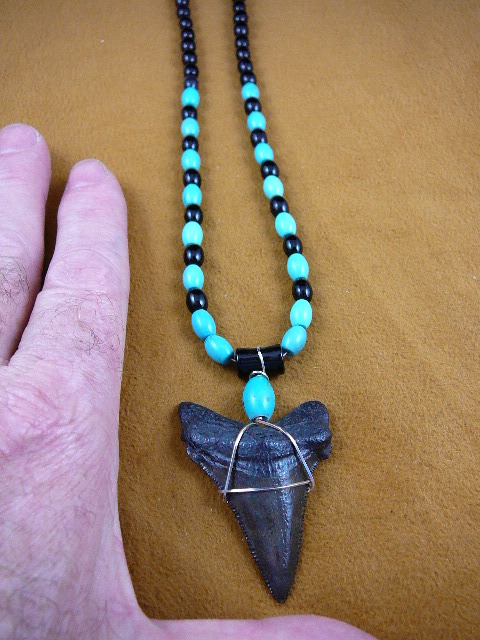 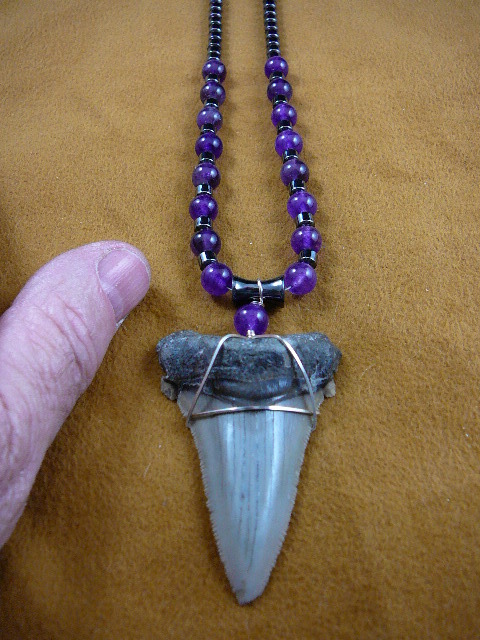 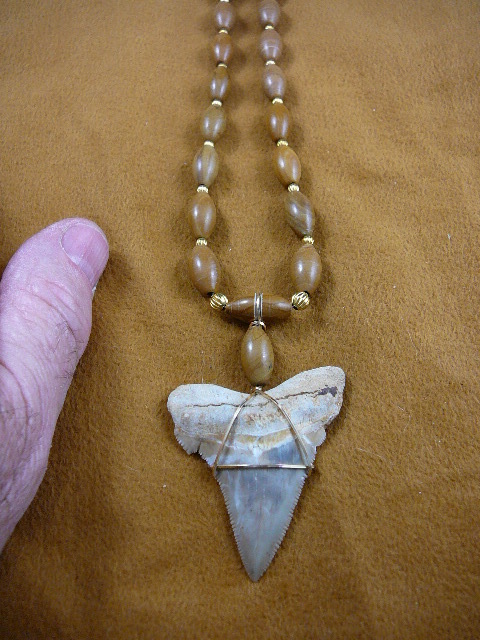 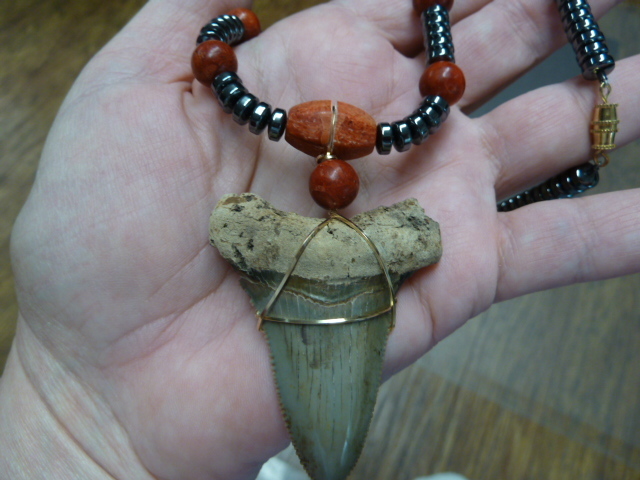 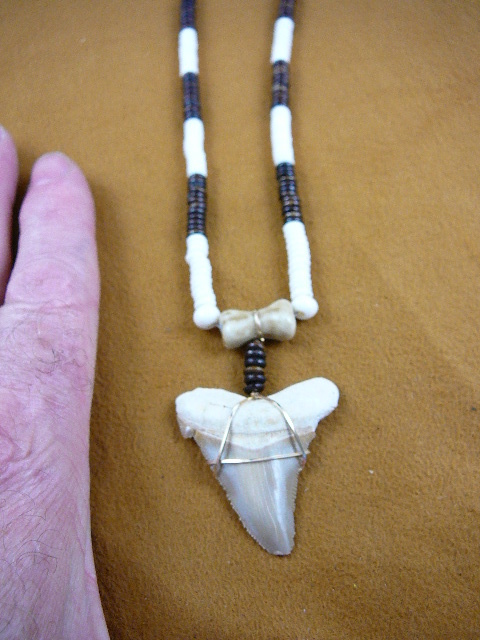 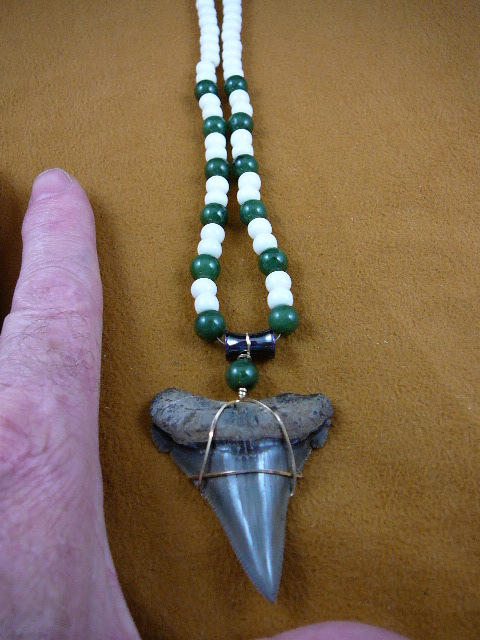 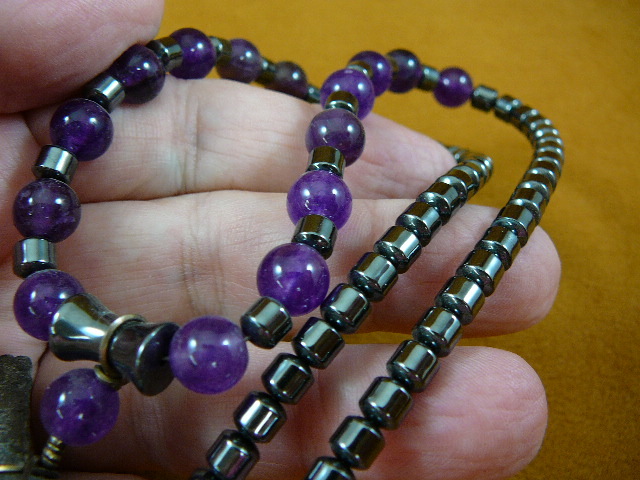 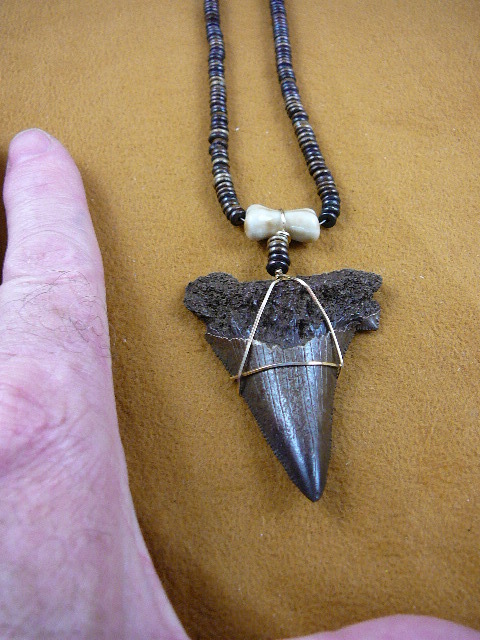 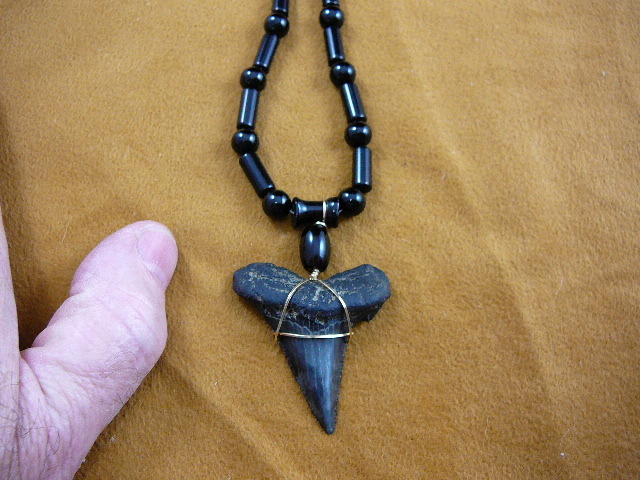 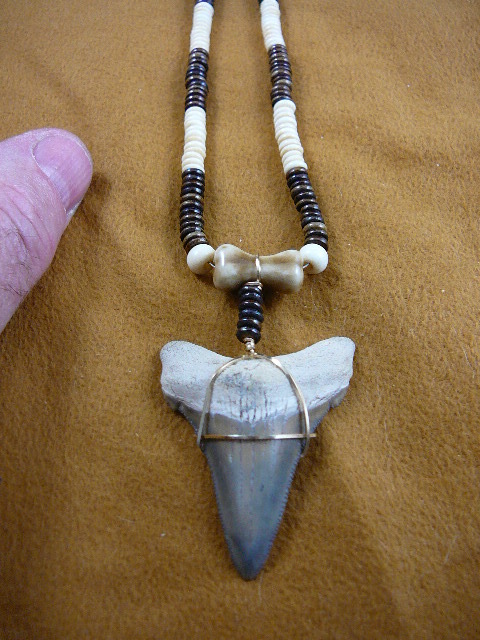 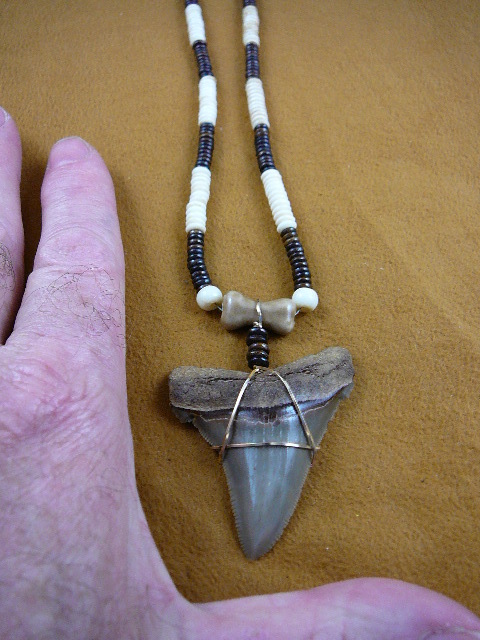 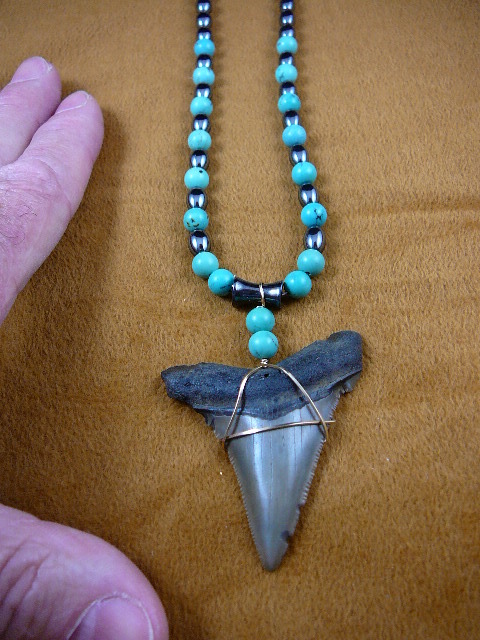 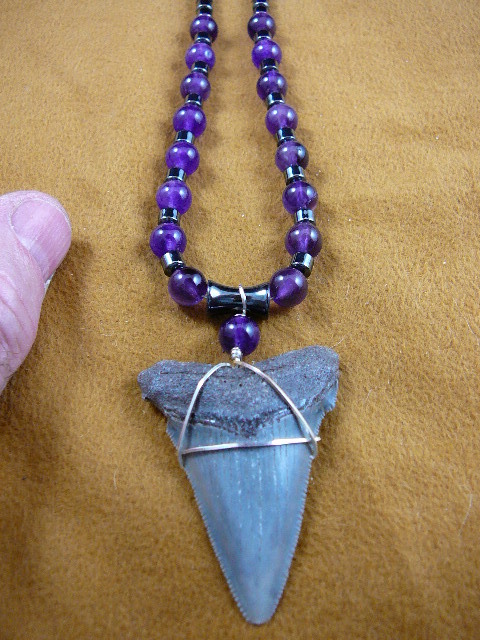 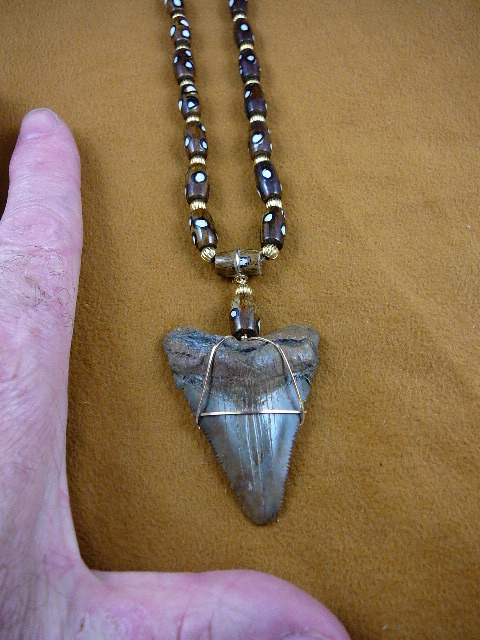 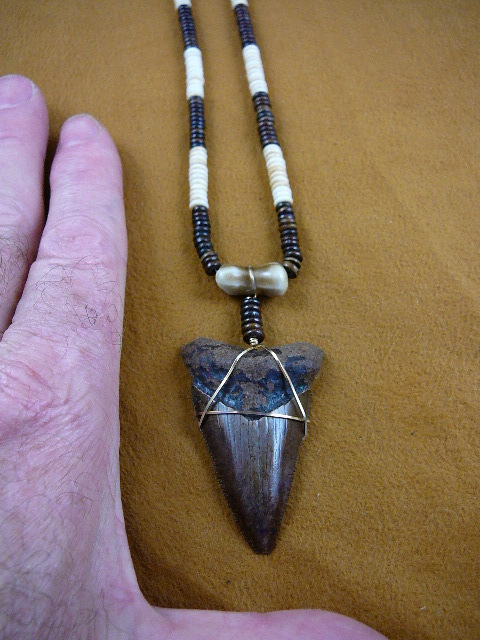 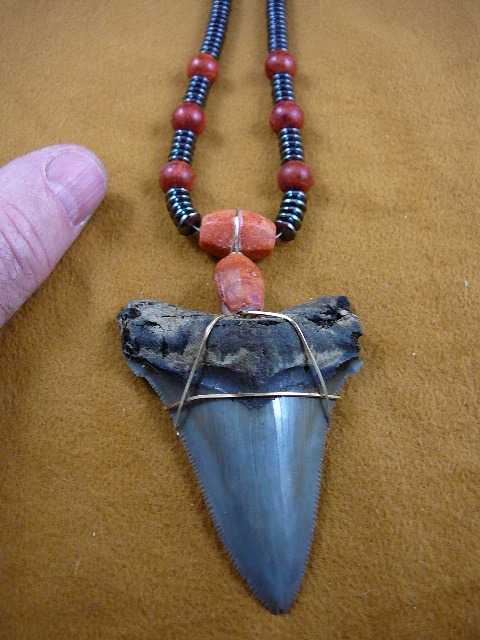 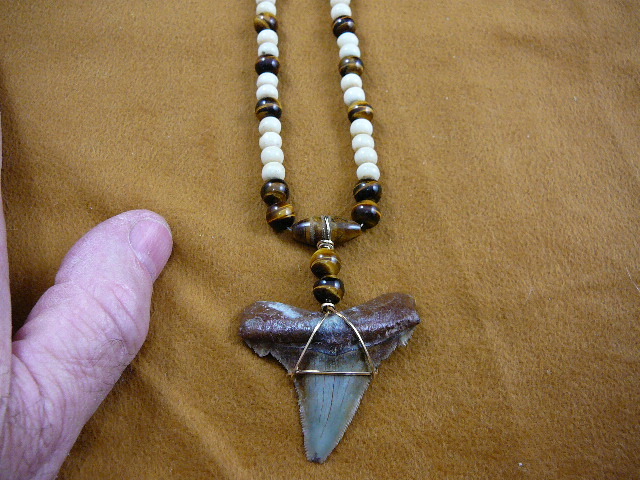 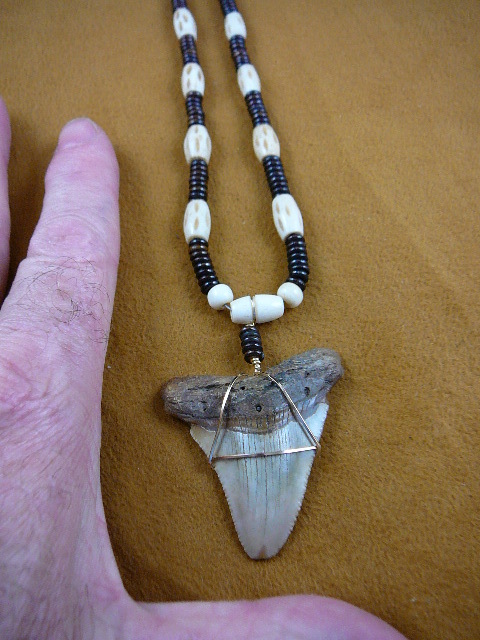 He purchased it from the fisherman who caught it, had dumped his load of fish to get it back to land in time to be measured before it shrunk and decomposed (he thought it was a new record for the smallest great white) then found it was a bit off the record. 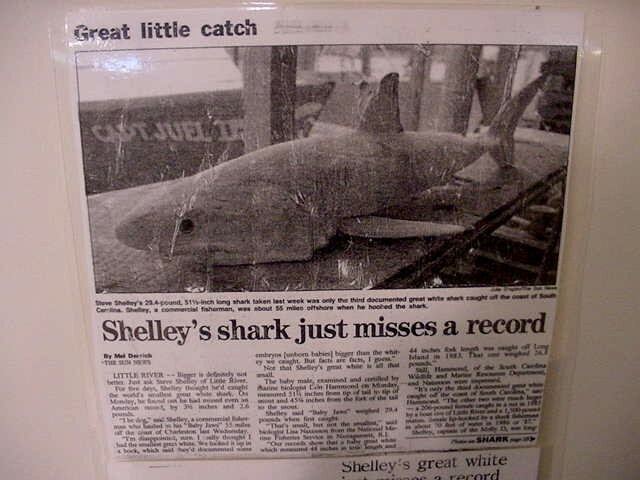 Glenn had it preserved in denatured alcohol (that's another whole story where the FBI questioned his purchase of that much denatured alcohol), on display now at the South Carolina University down the road from us. 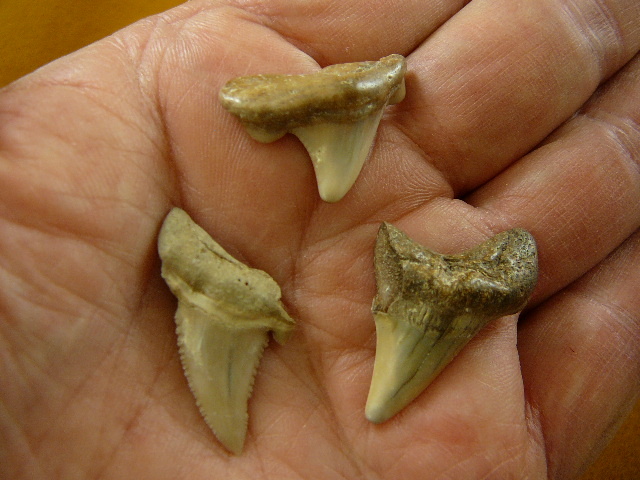 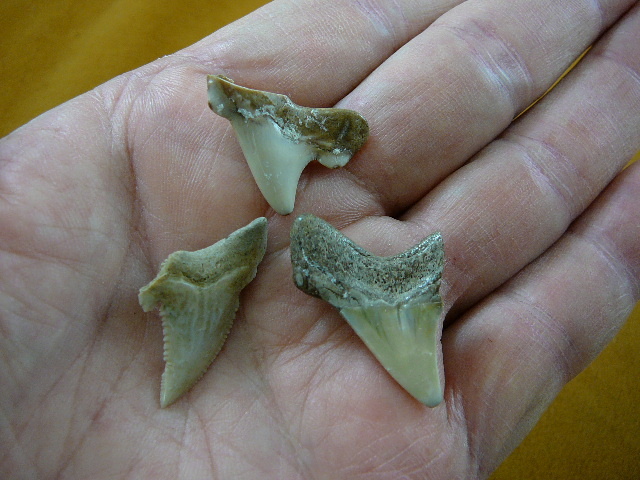 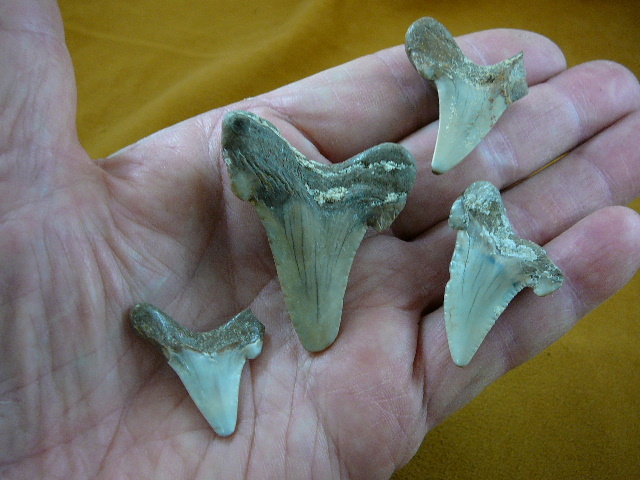 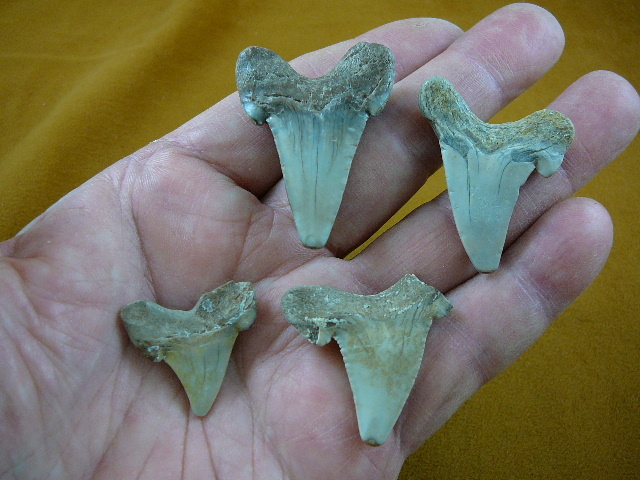 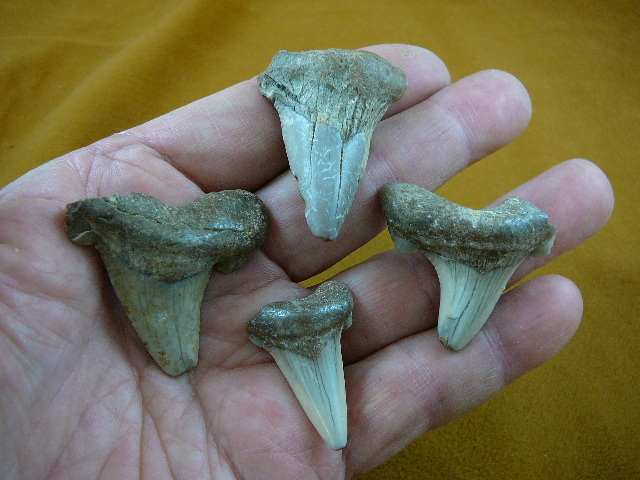 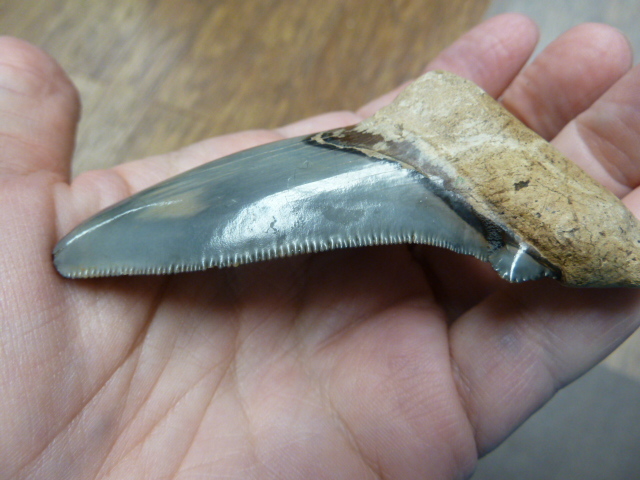 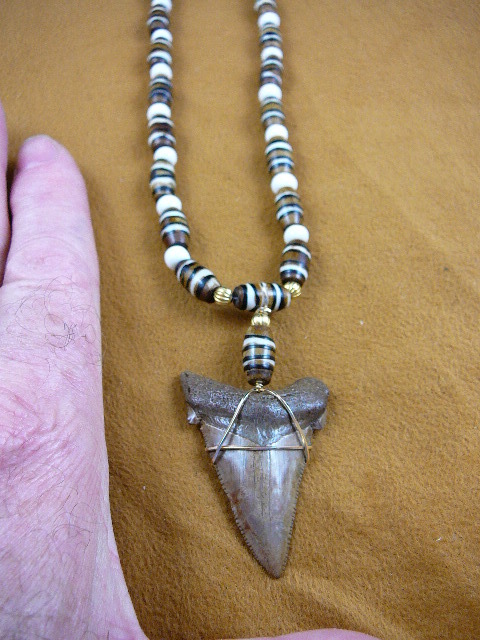 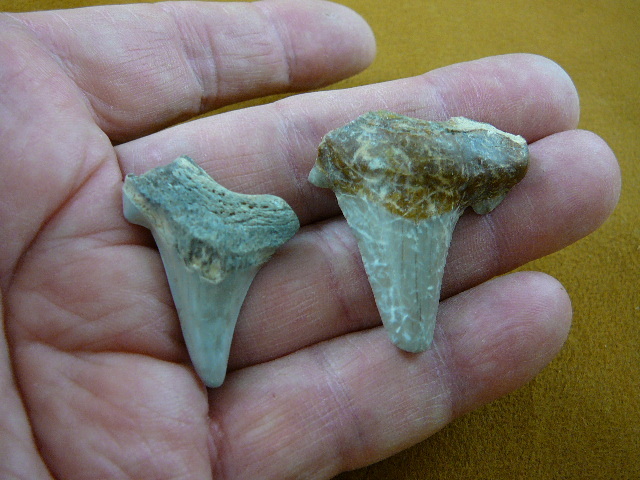 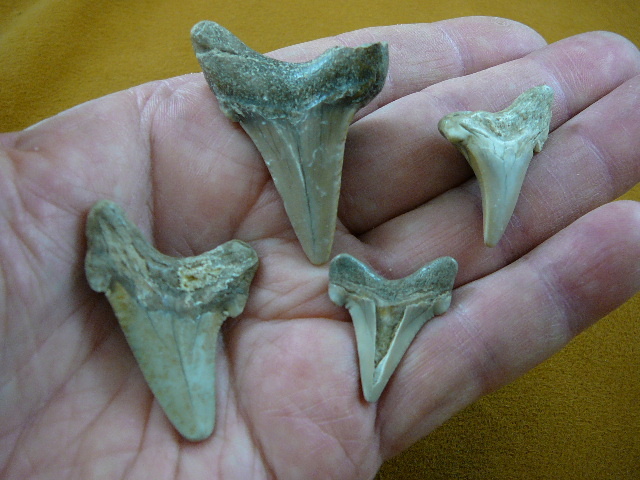 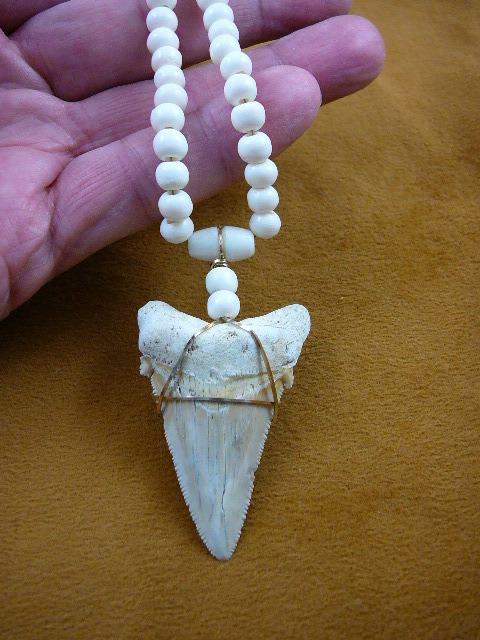 RARE PYGMY WHITE (PALEOCARCHARODON ORIENTALIS) shark teeth, awesome specimens we are proud to share.